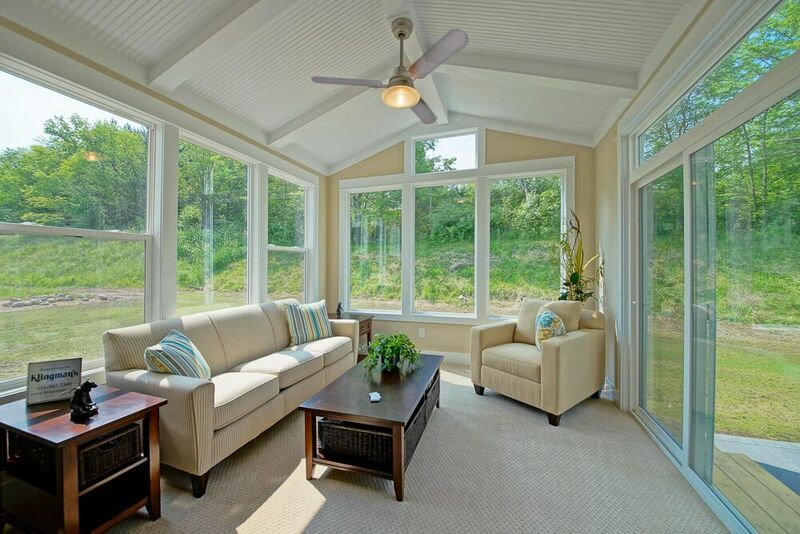 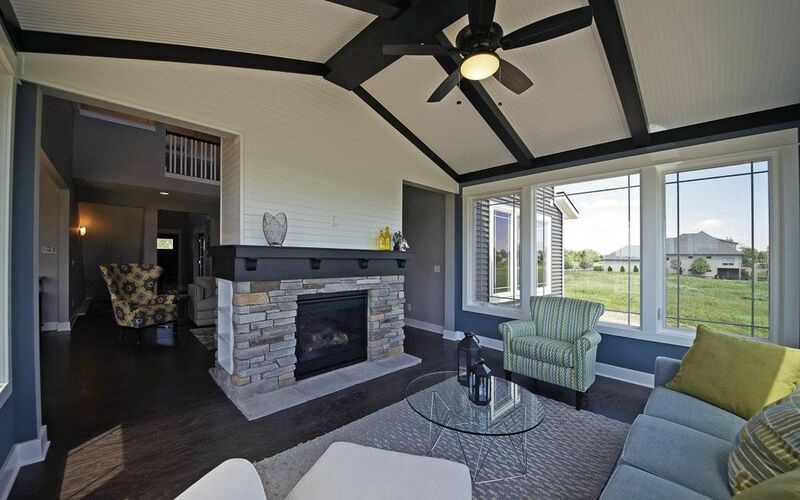 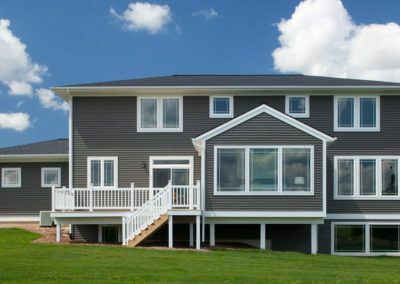 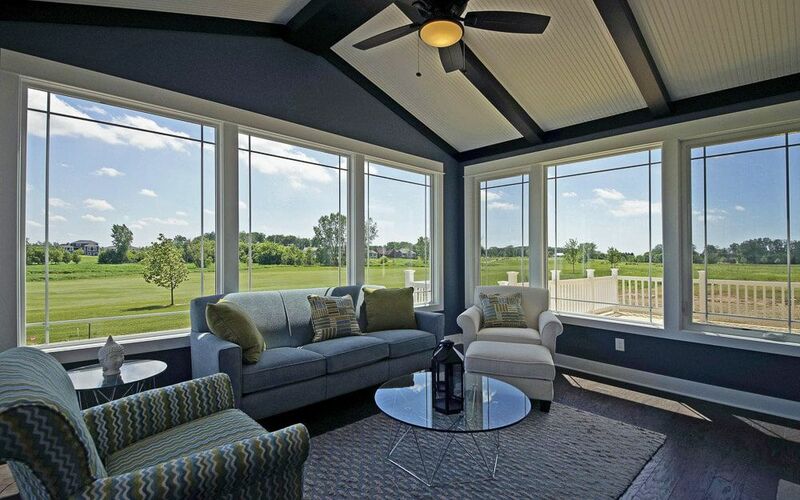 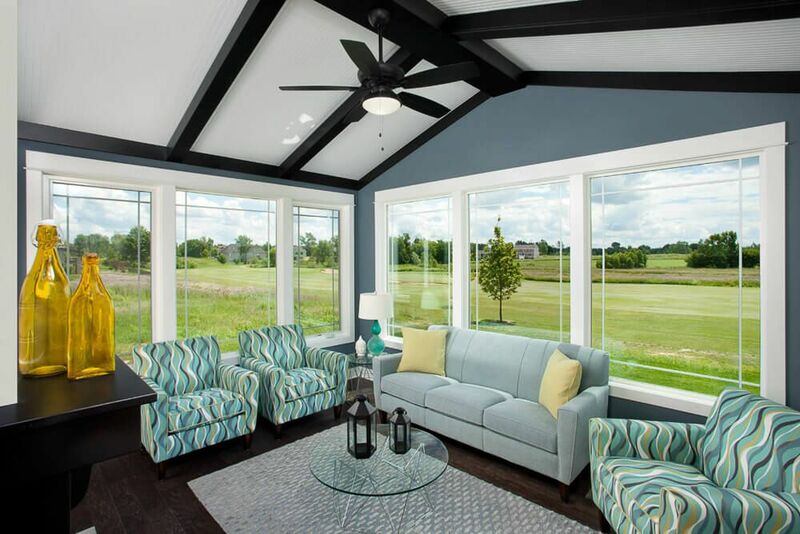 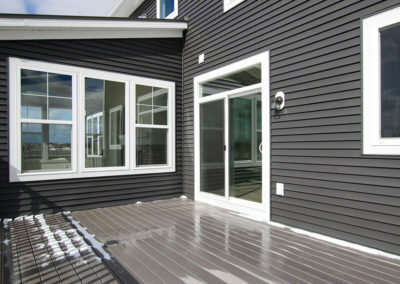 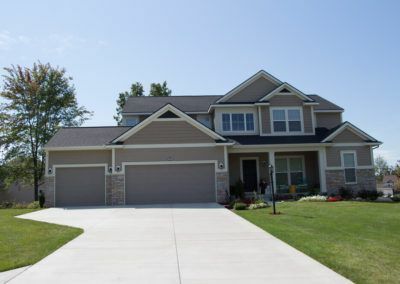 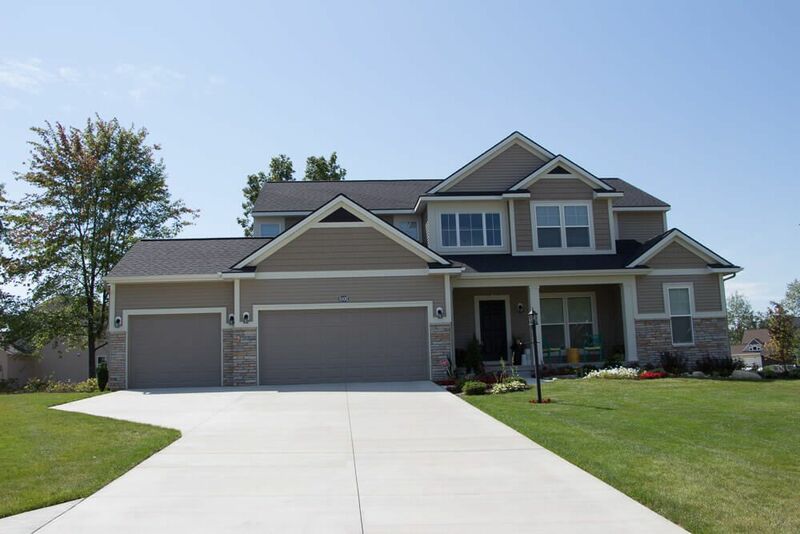 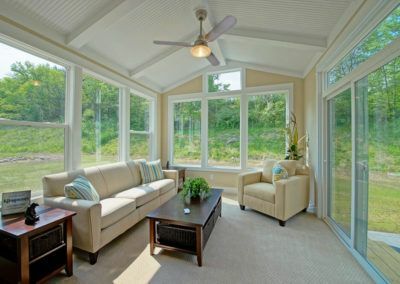 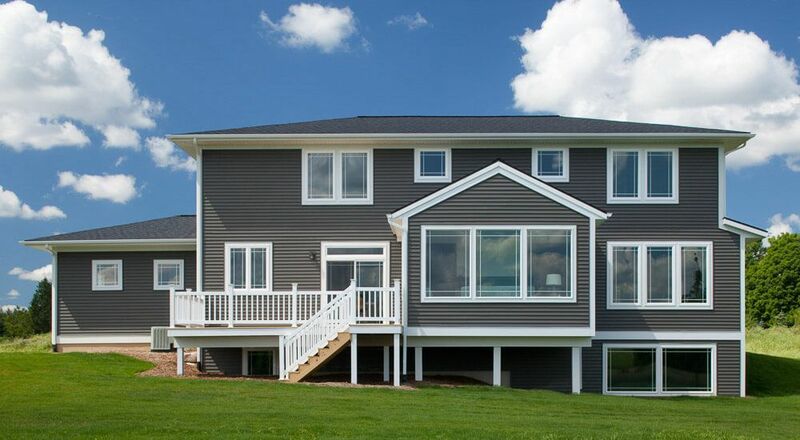 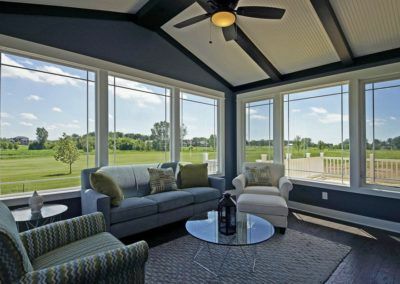 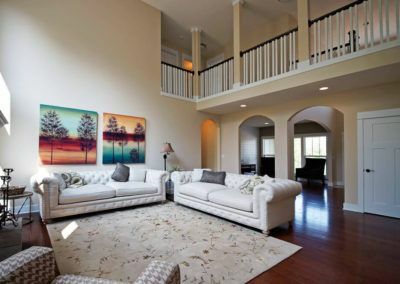 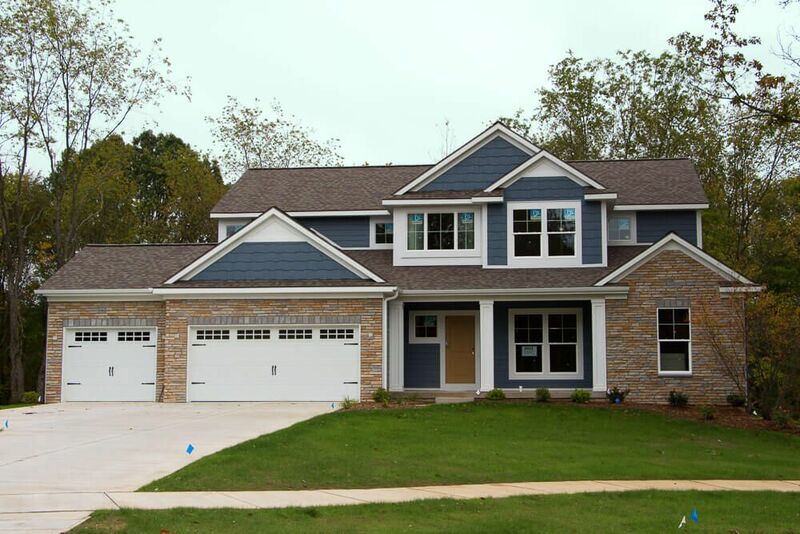 With one of the widest arrays options in any home plan, the Sebastian is a generous and attractive home design. 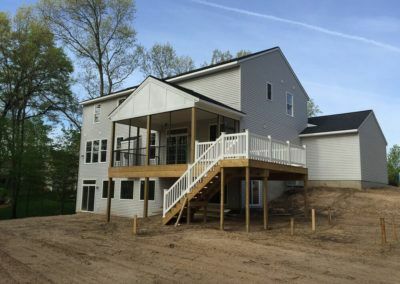 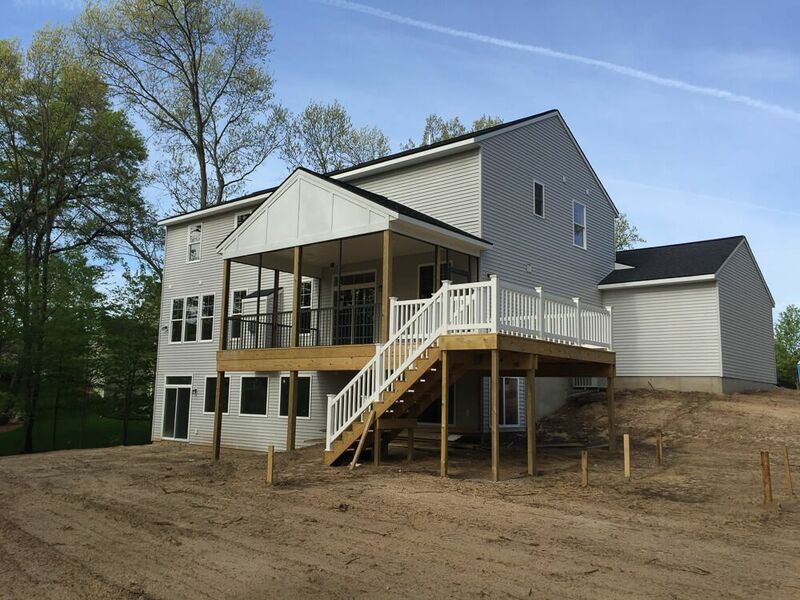 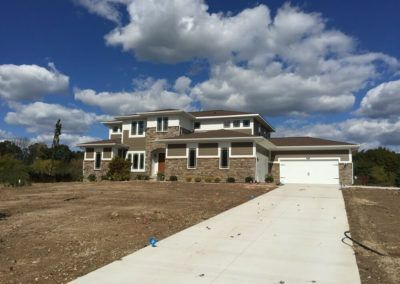 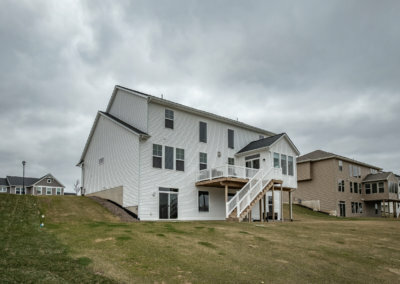 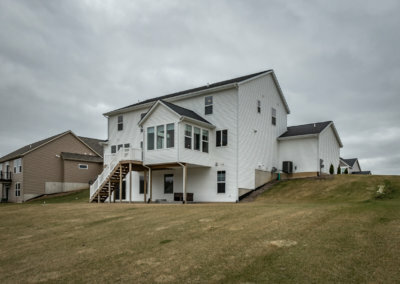 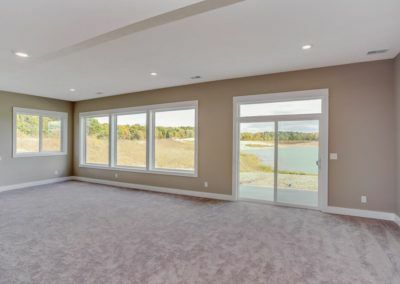 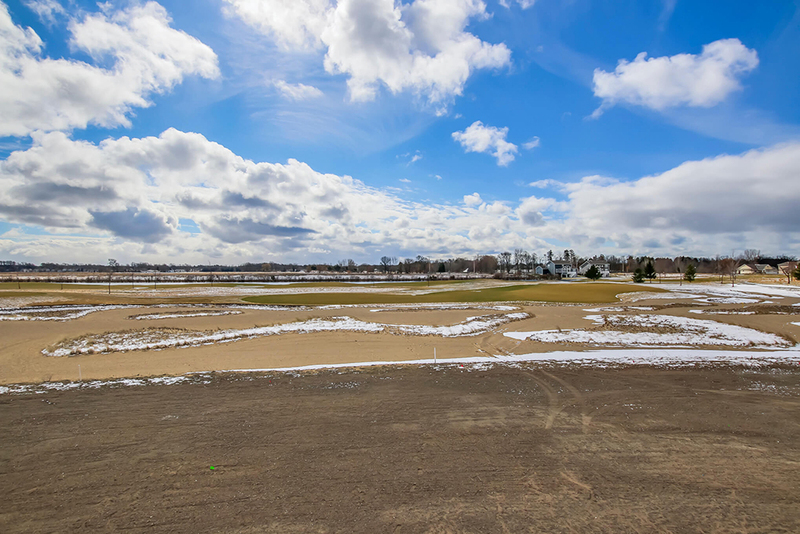 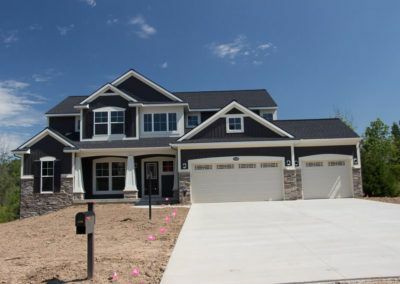 With 2681 square feet, the plan includes five bedrooms and three and half baths. 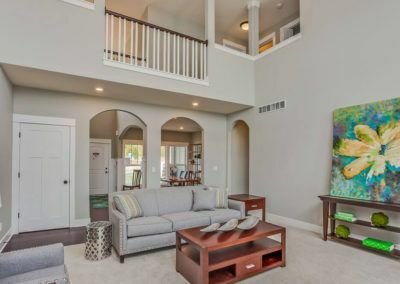 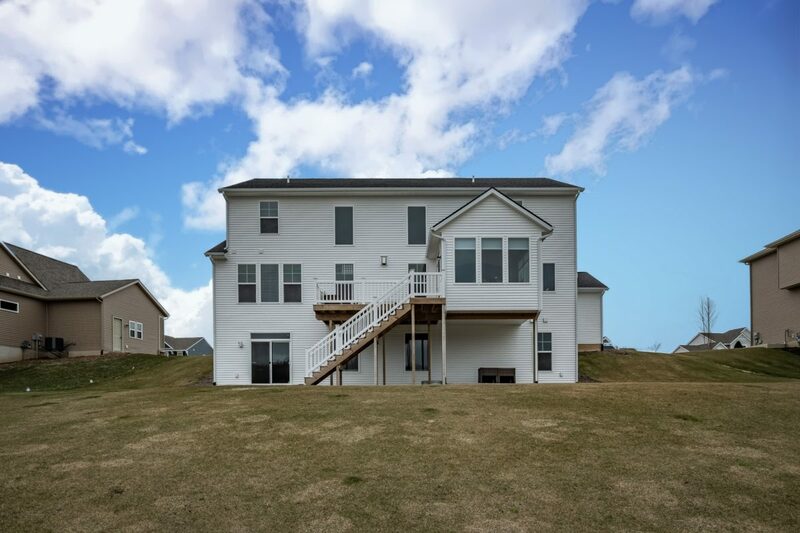 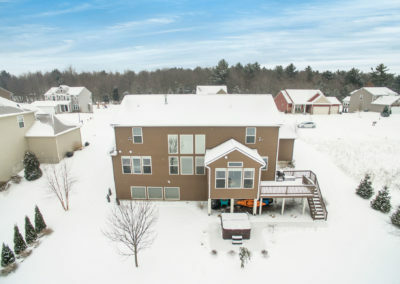 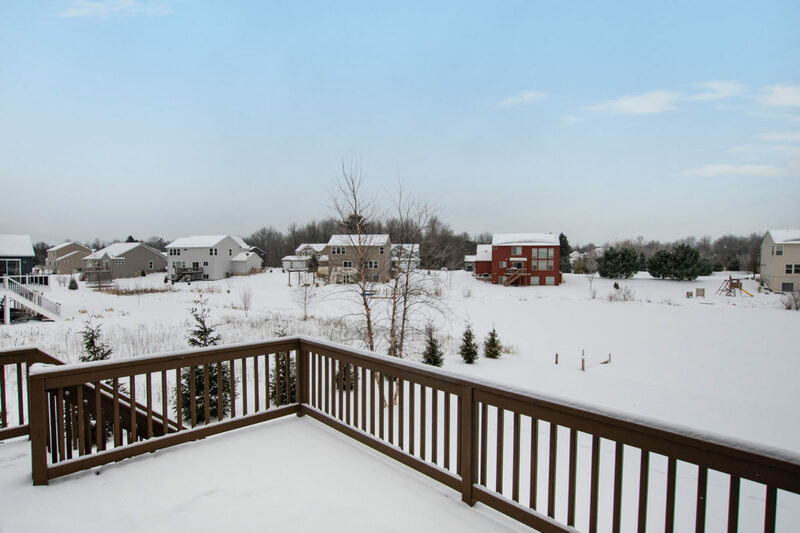 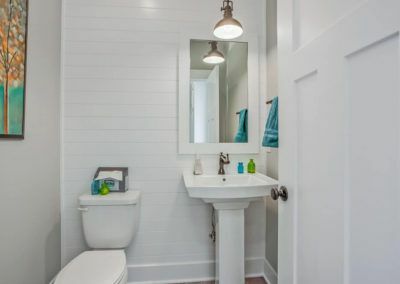 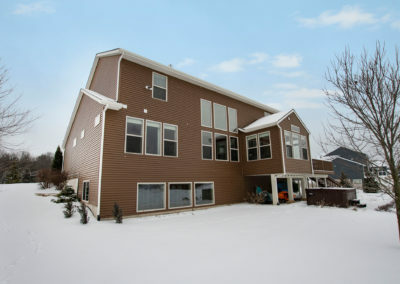 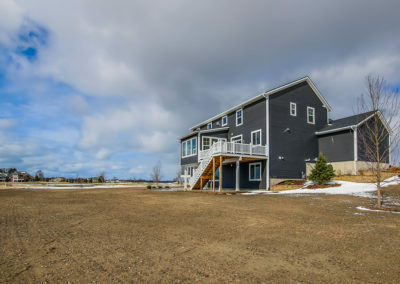 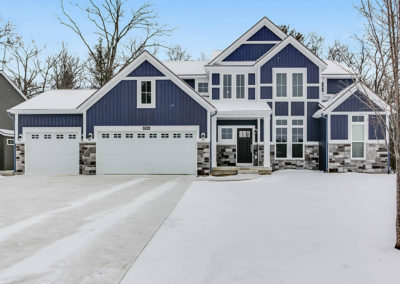 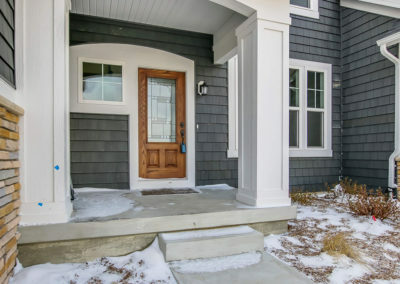 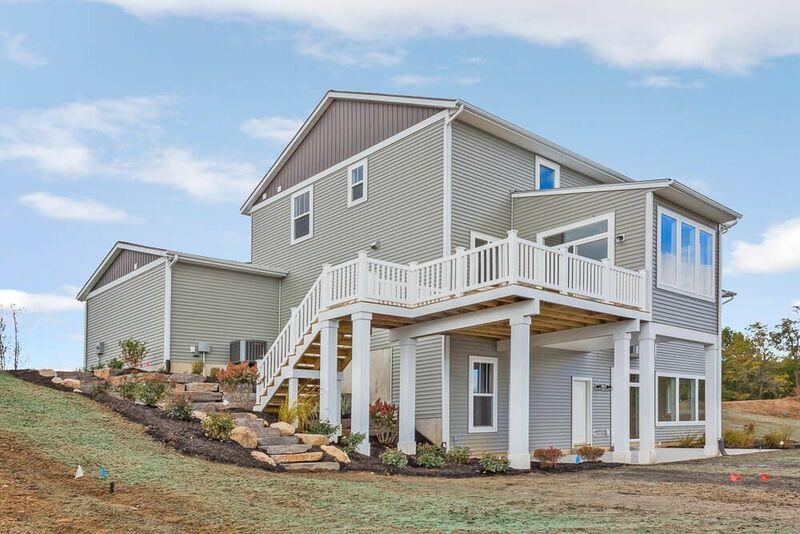 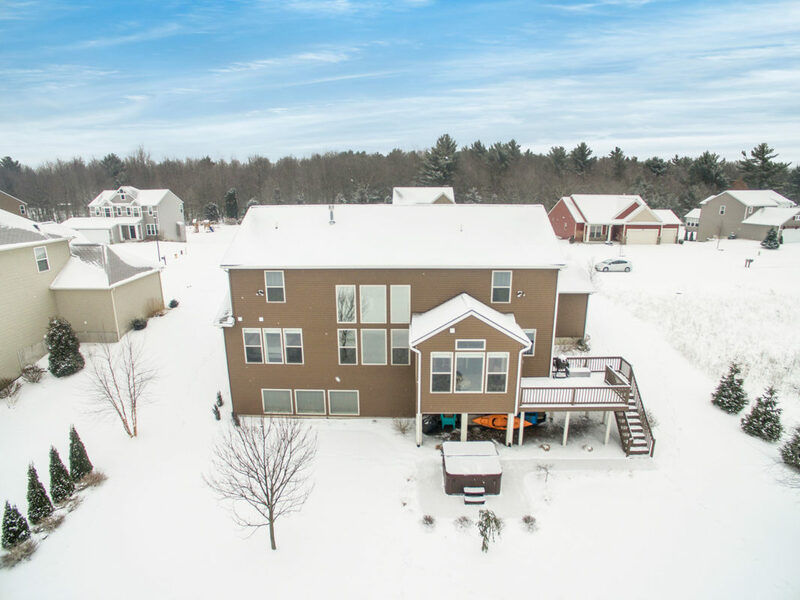 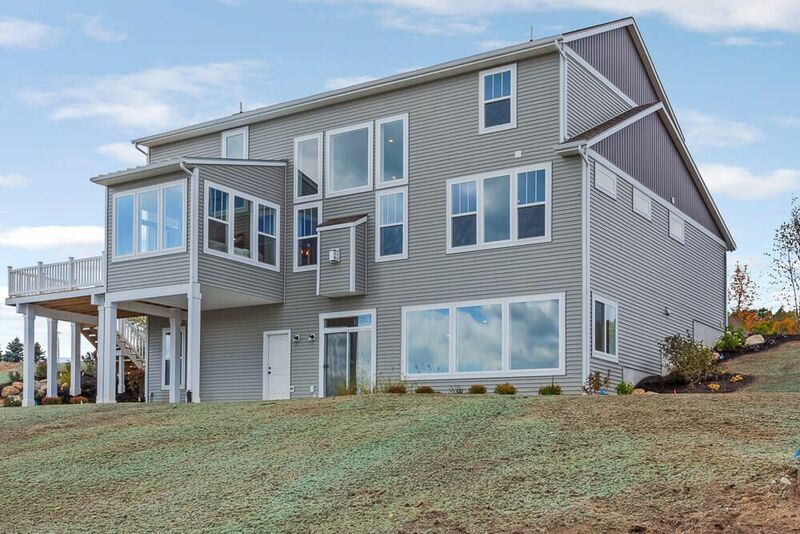 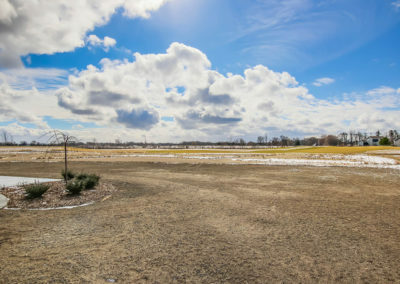 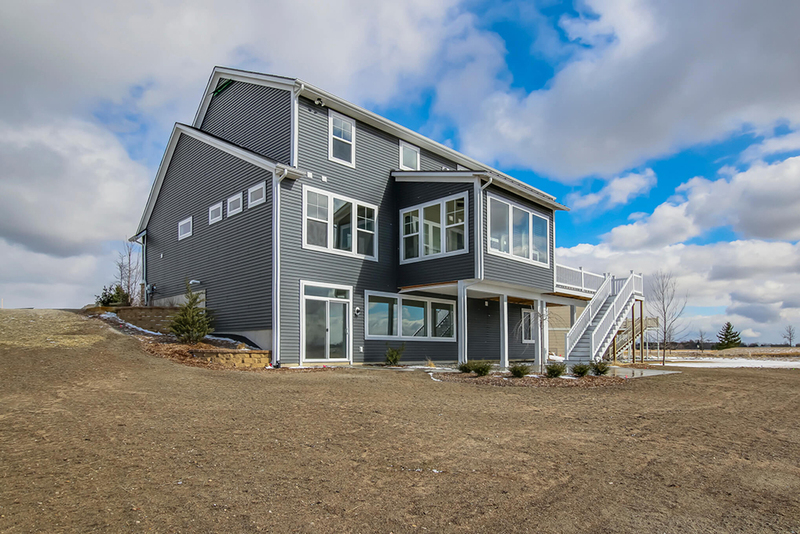 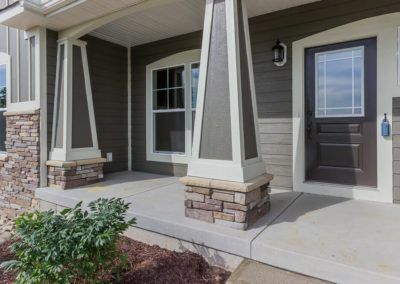 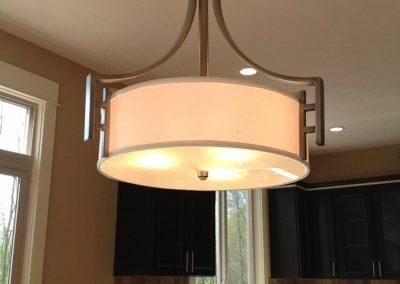 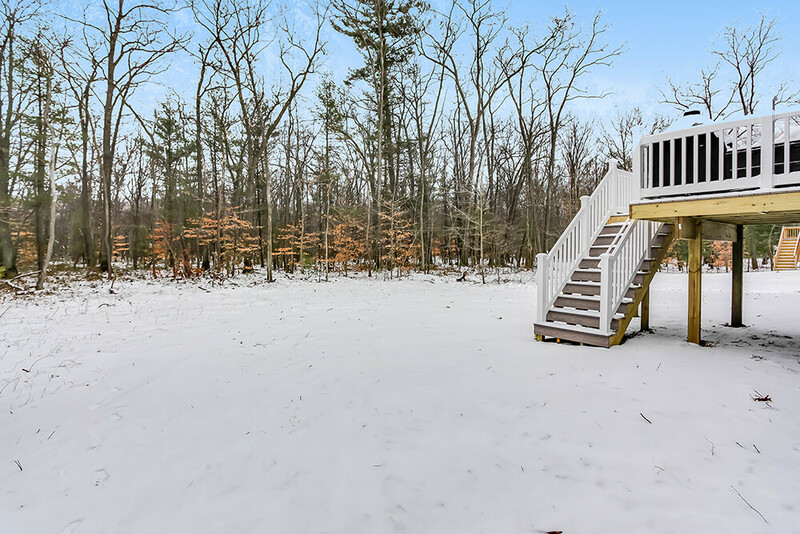 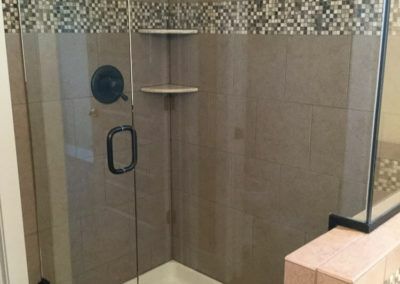 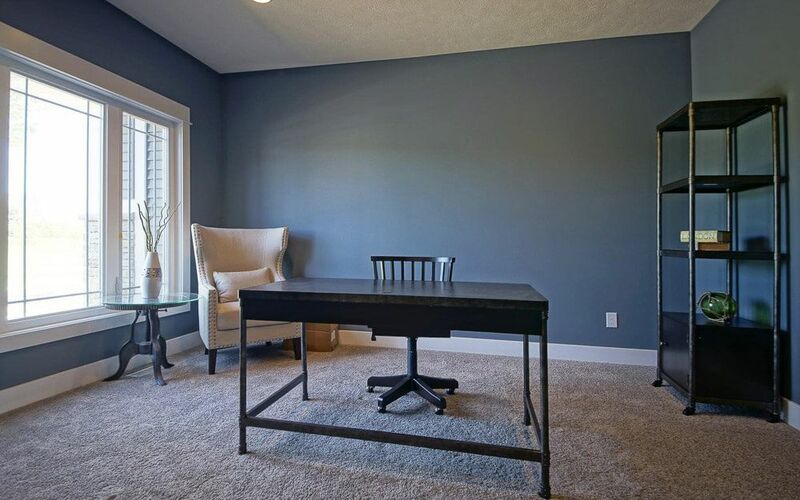 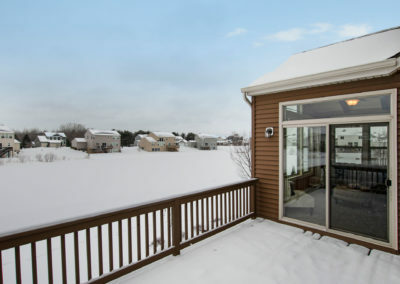 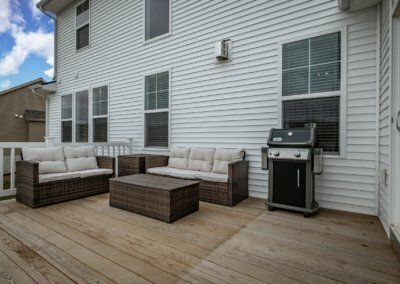 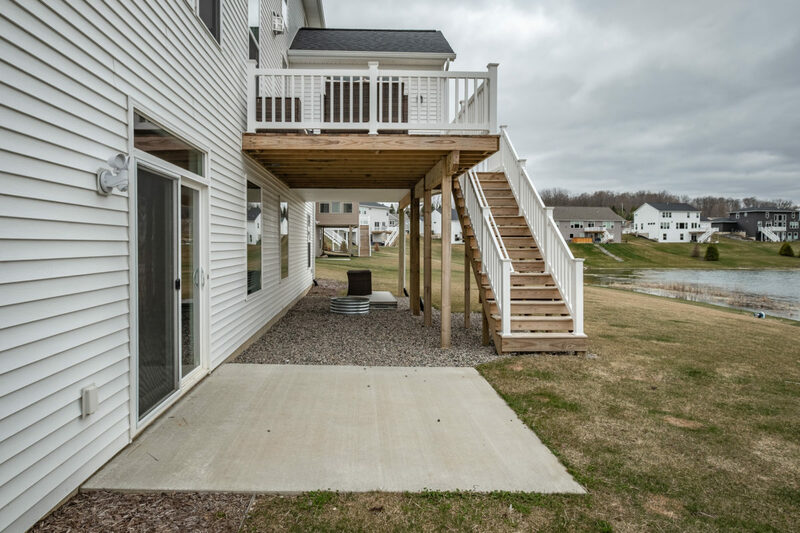 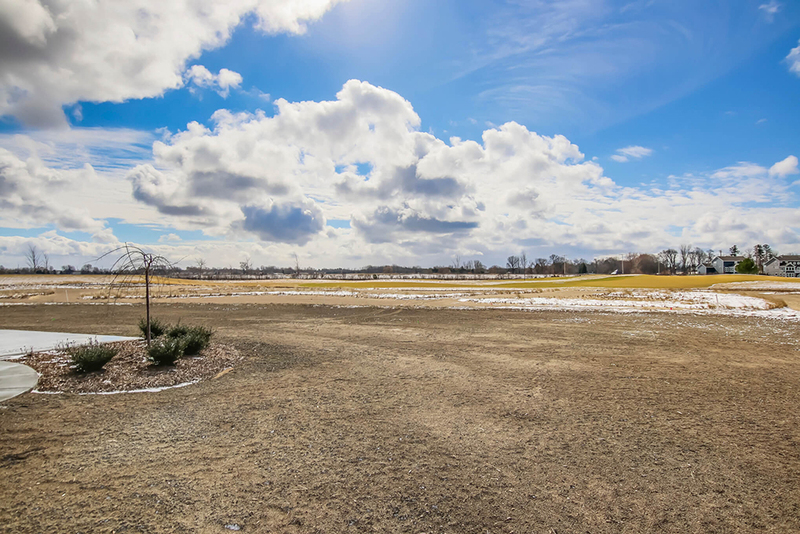 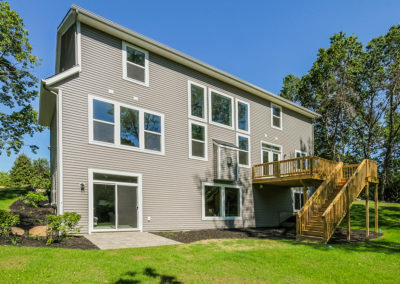 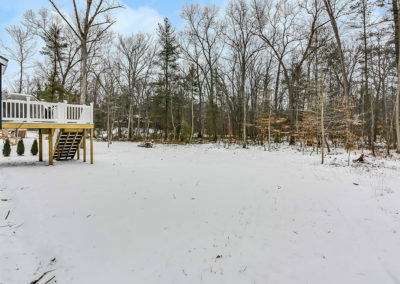 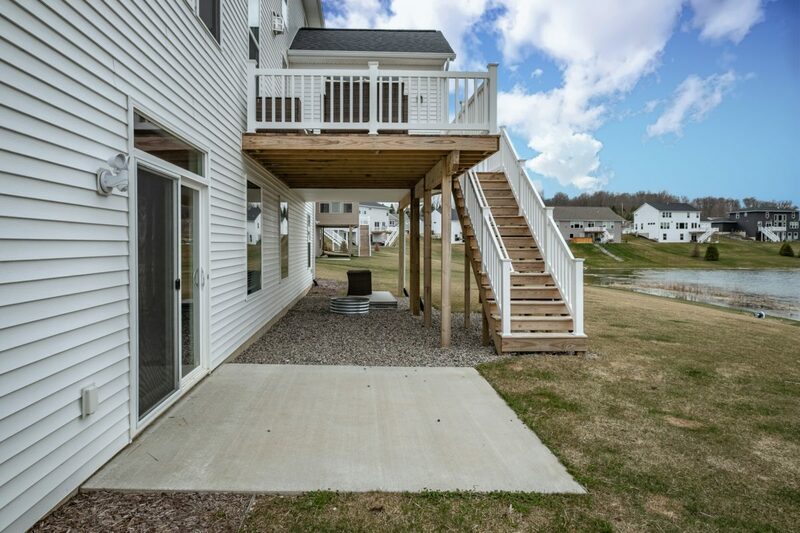 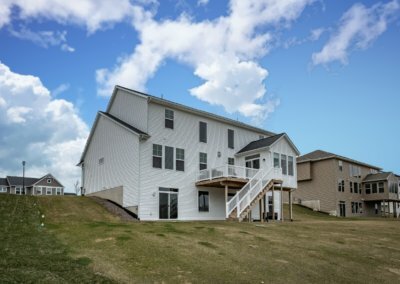 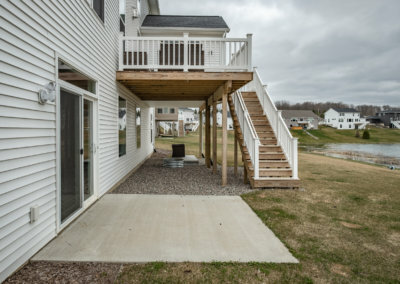 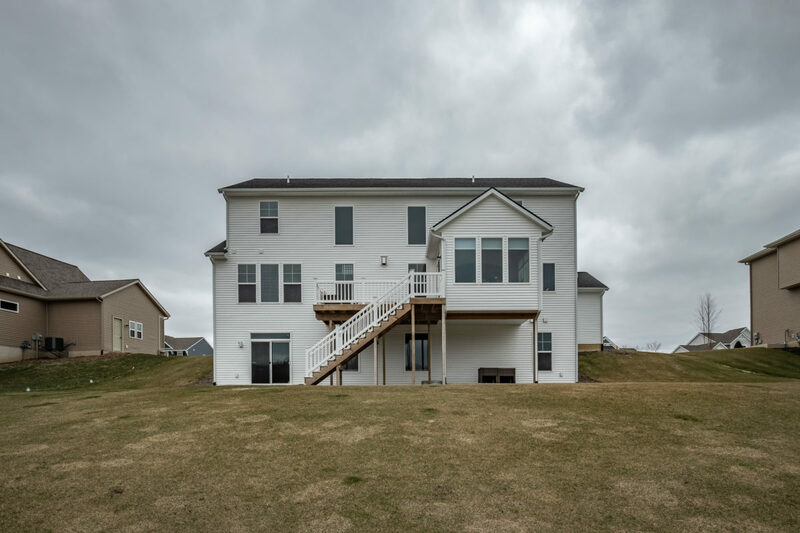 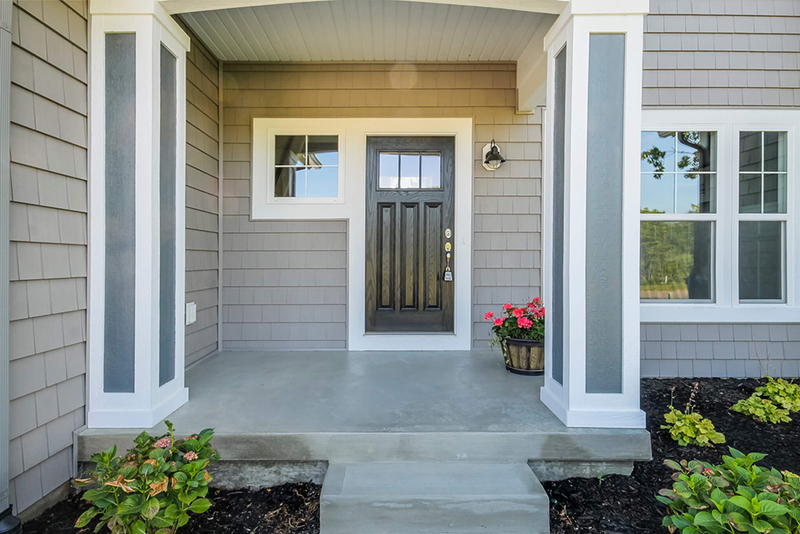 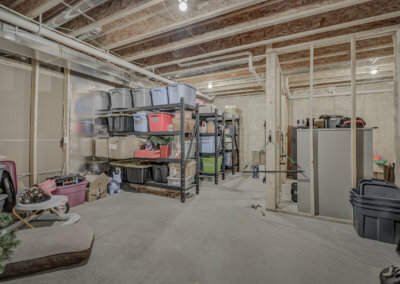 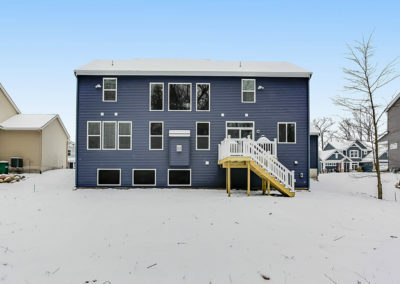 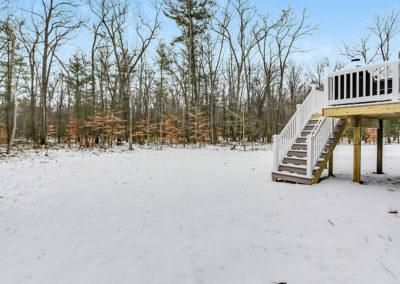 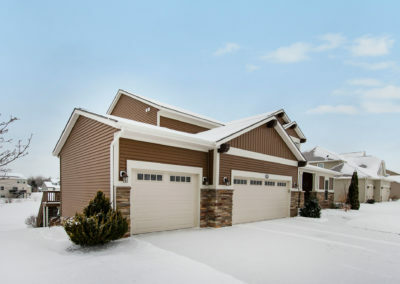 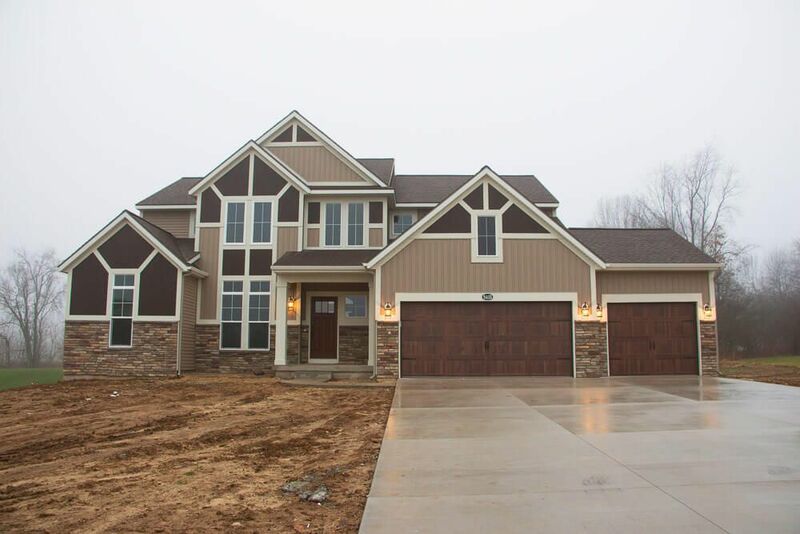 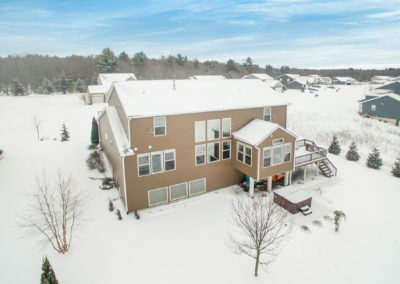 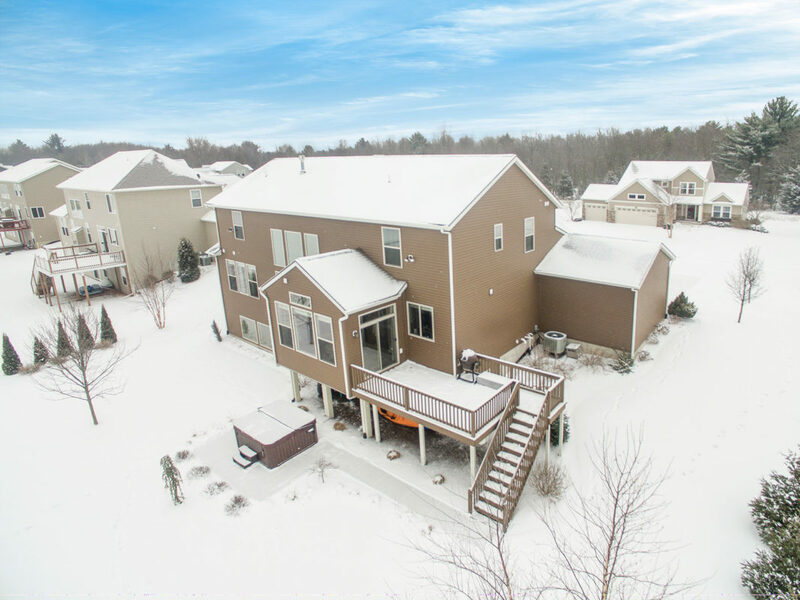 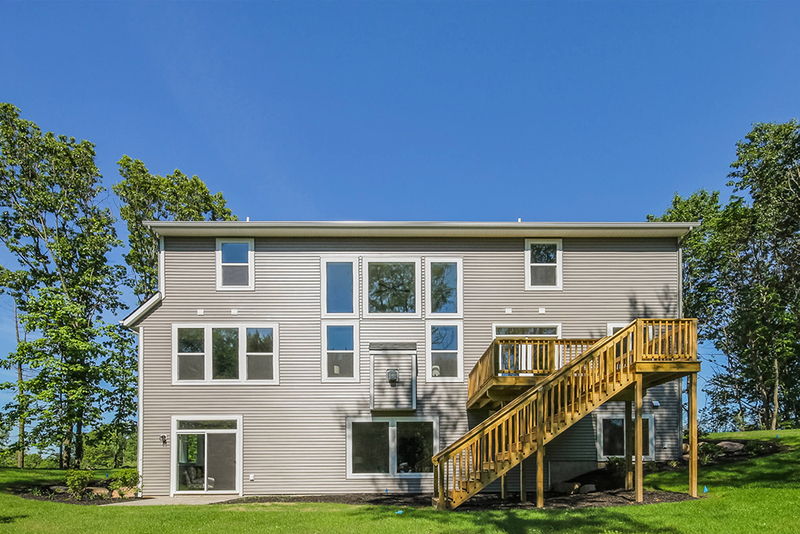 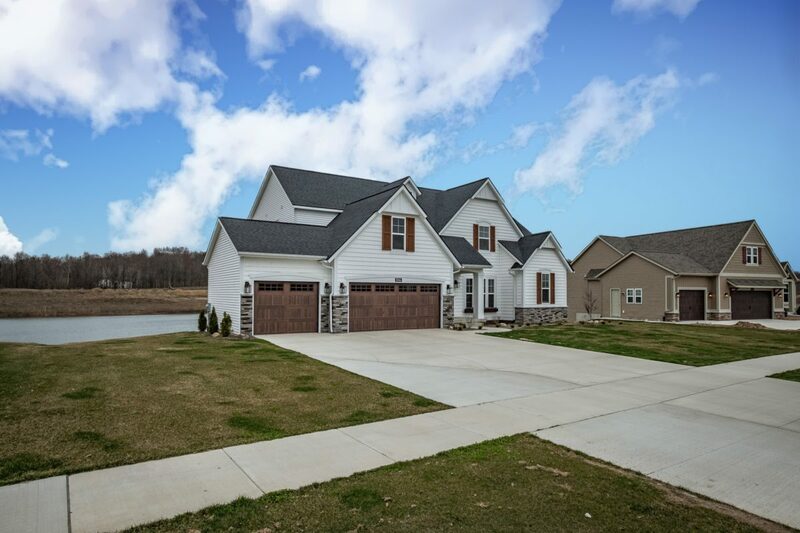 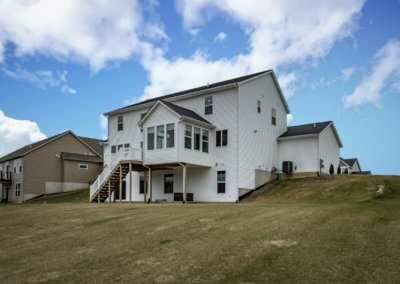 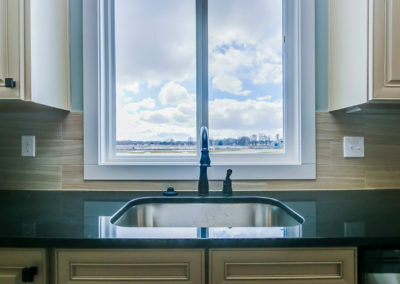 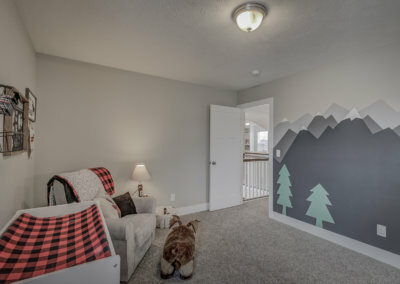 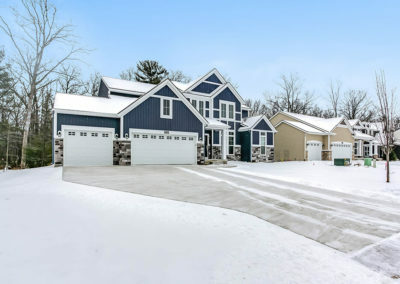 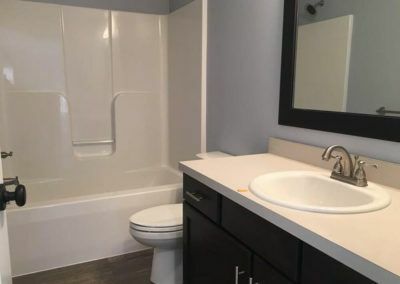 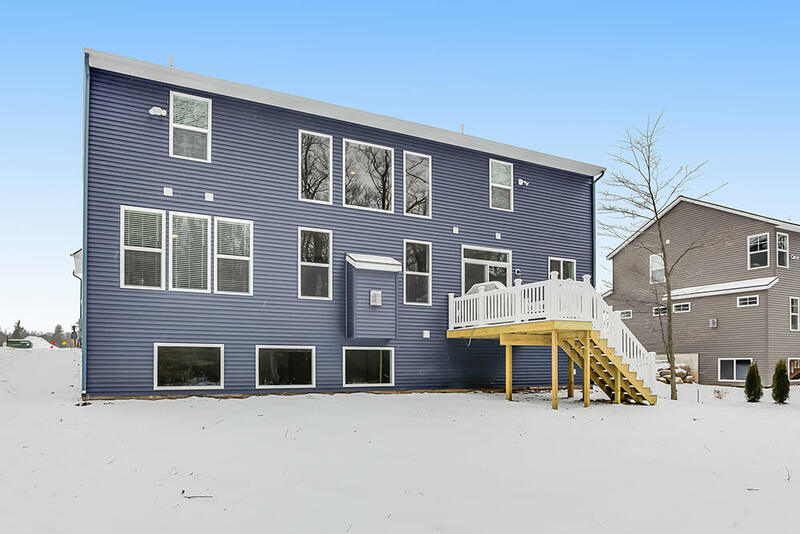 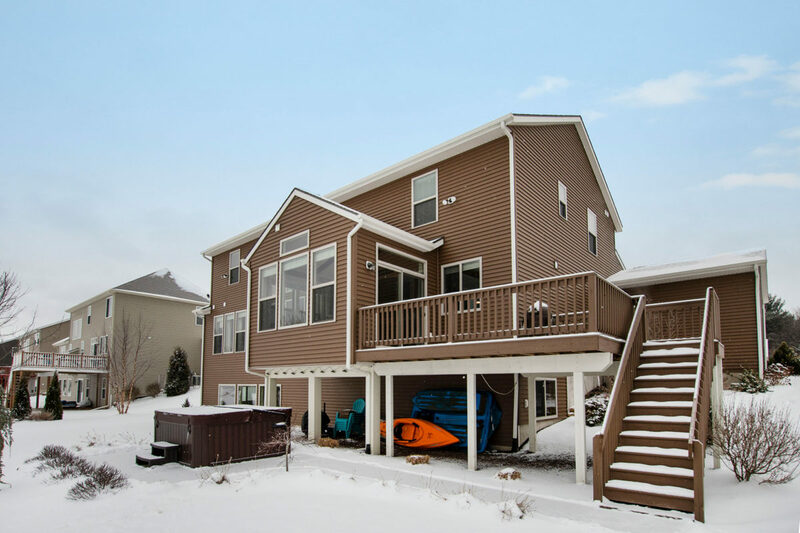 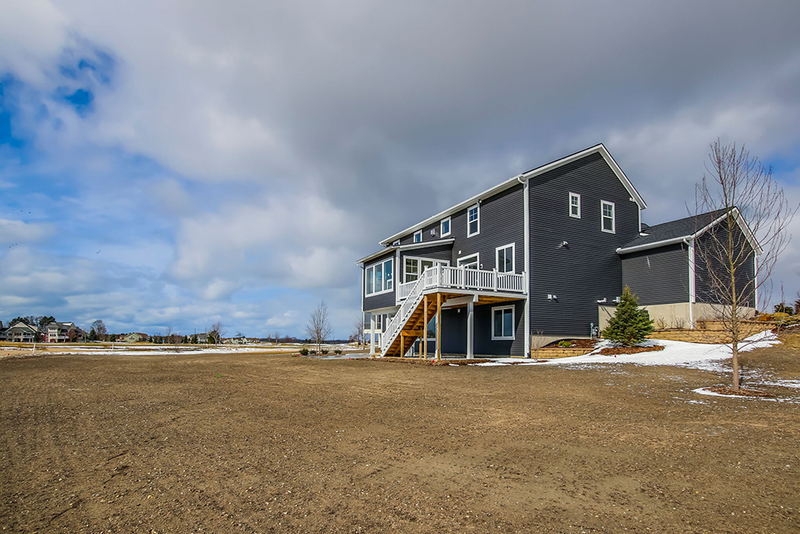 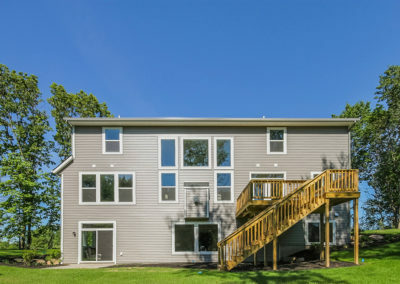 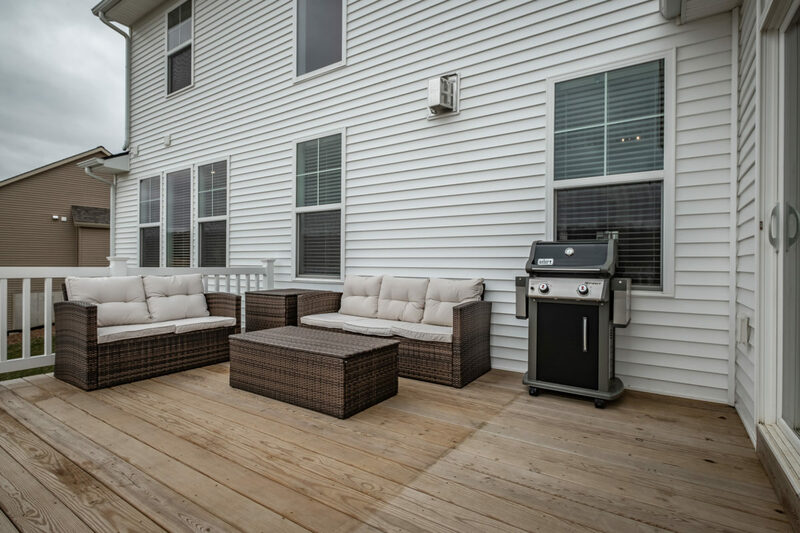 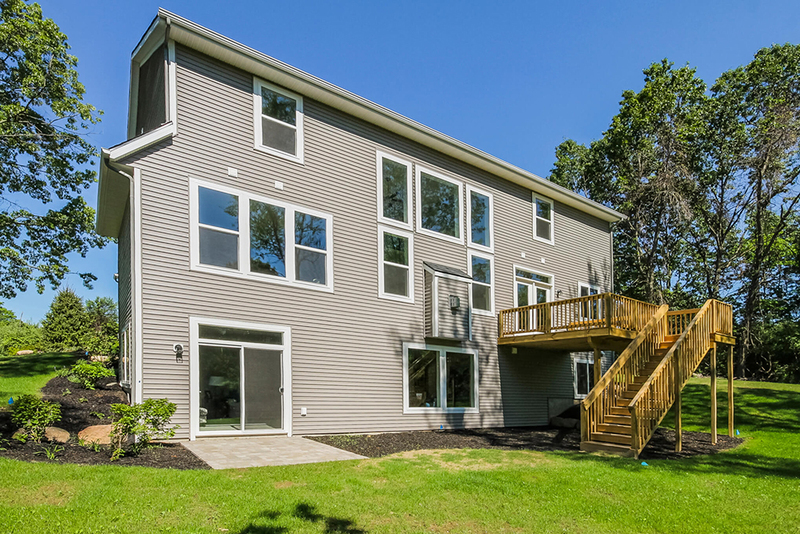 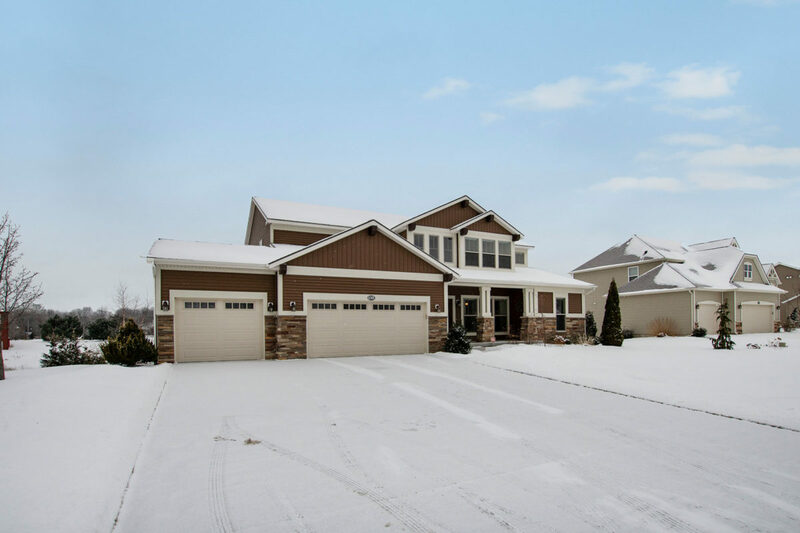 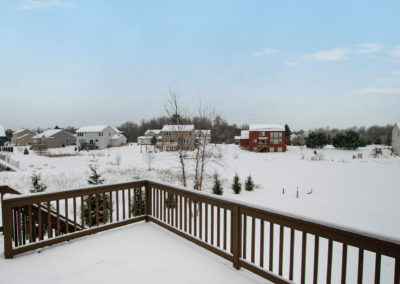 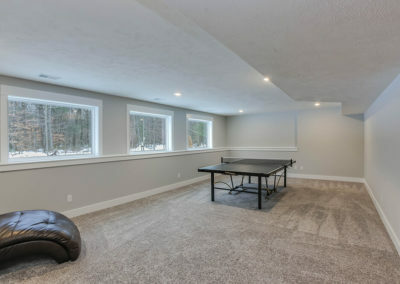 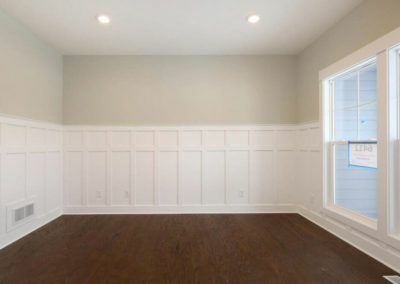 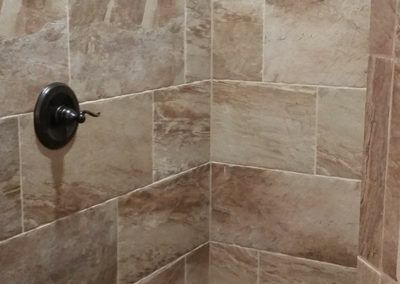 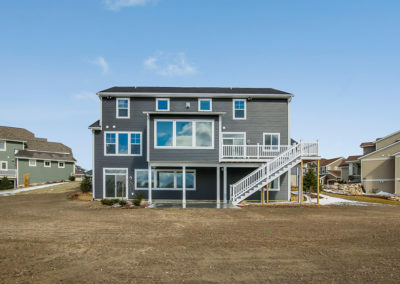 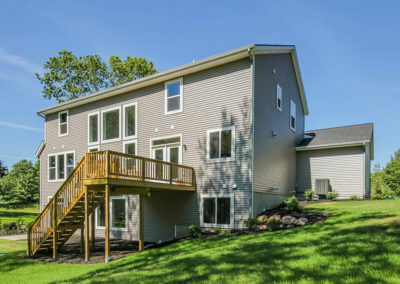 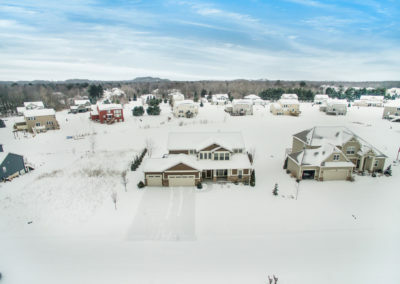 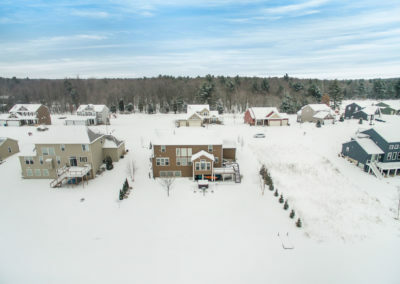 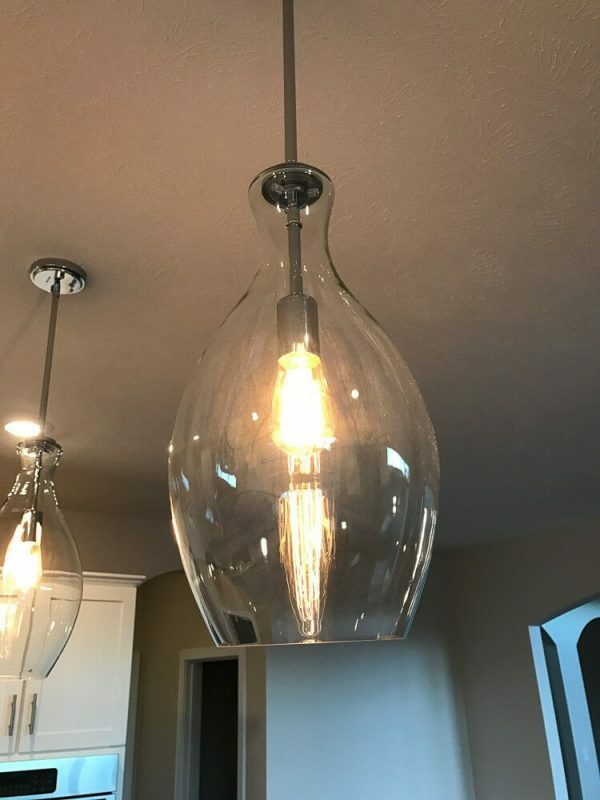 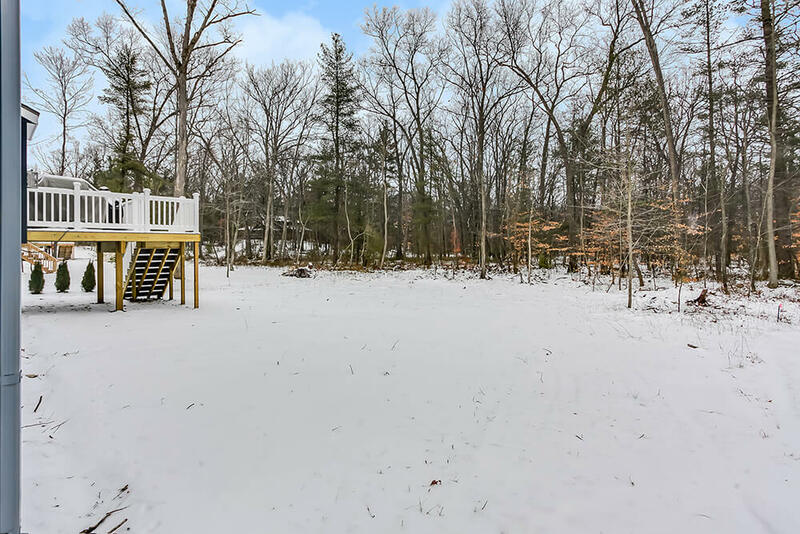 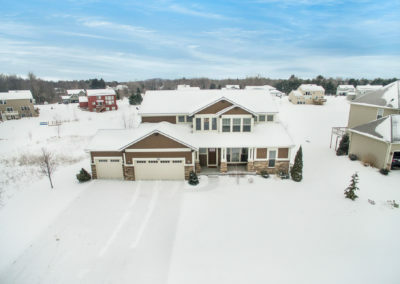 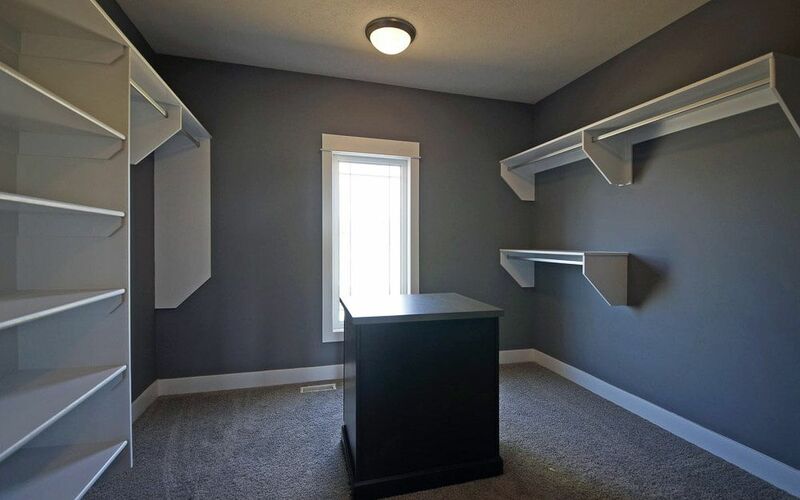 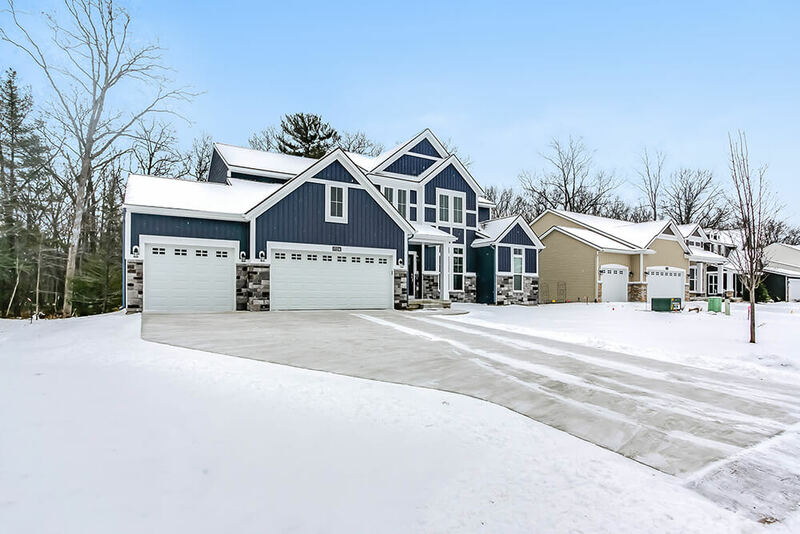 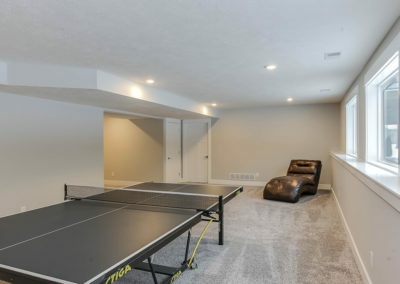 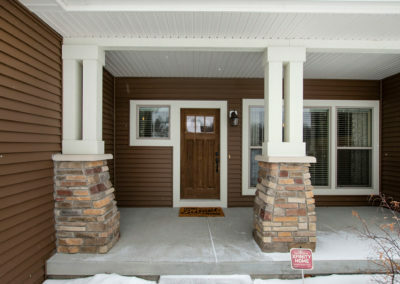 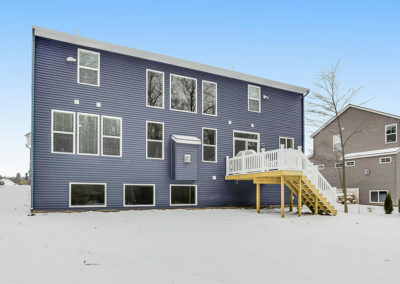 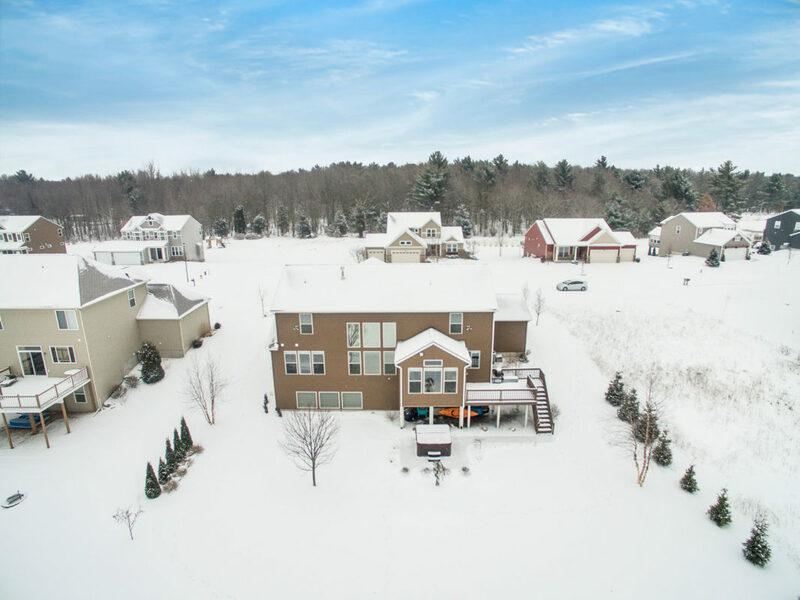 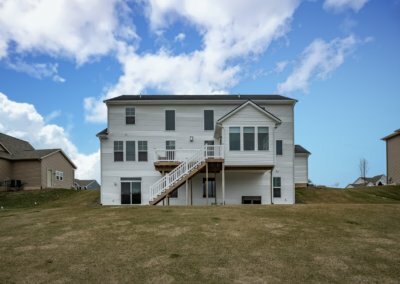 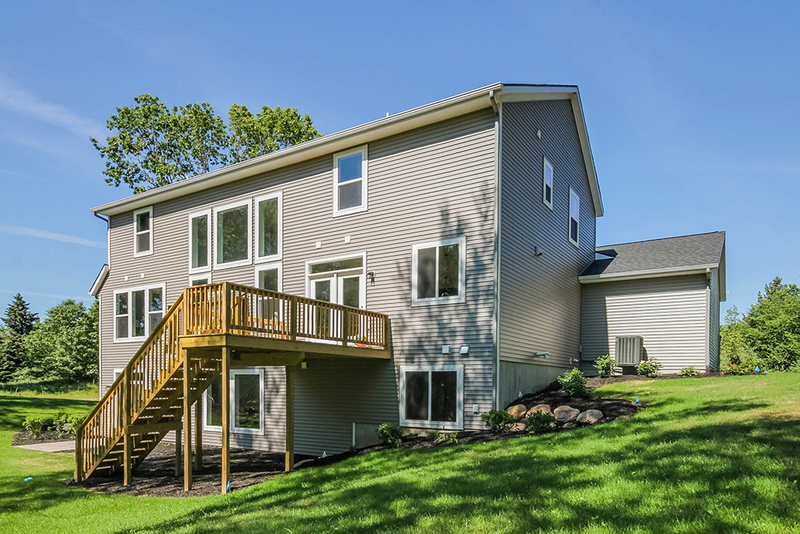 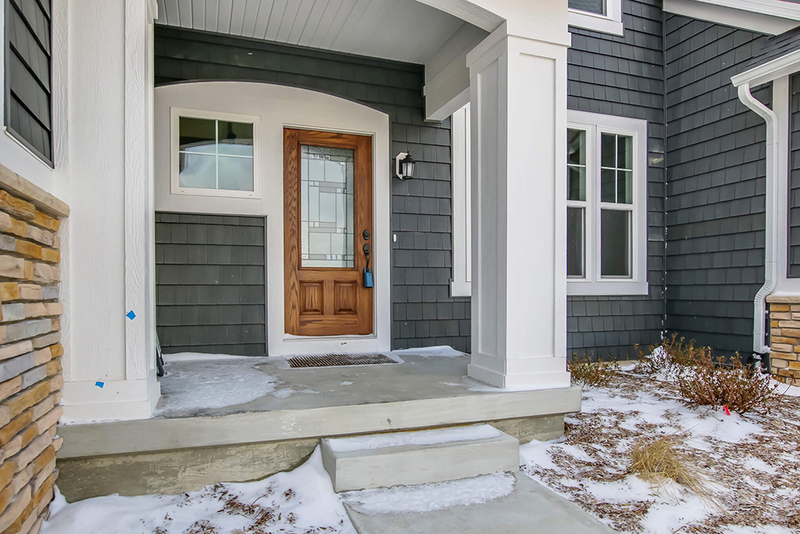 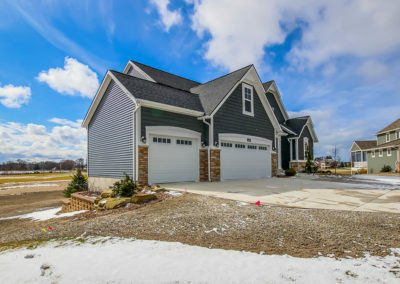 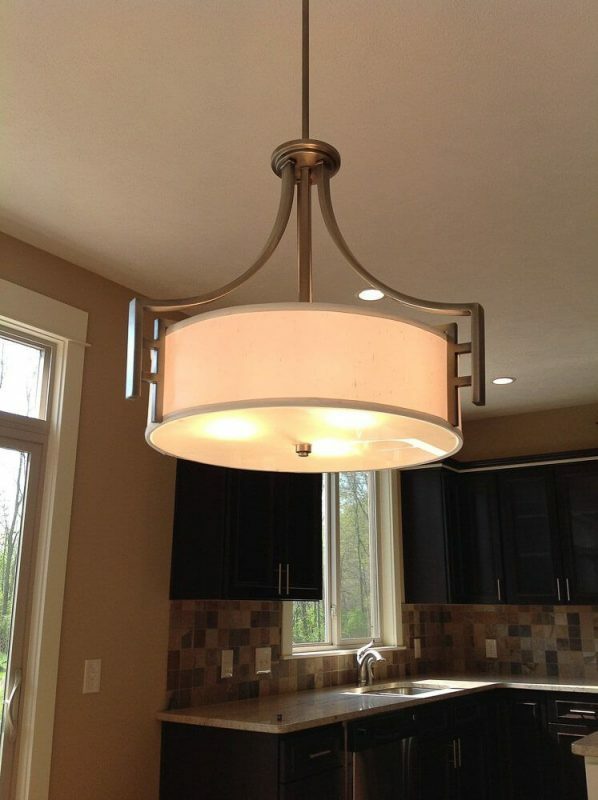 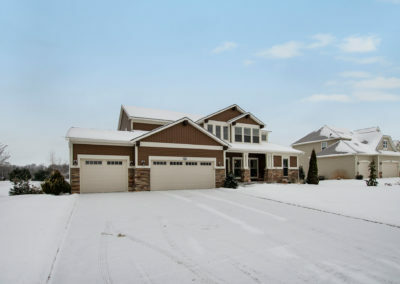 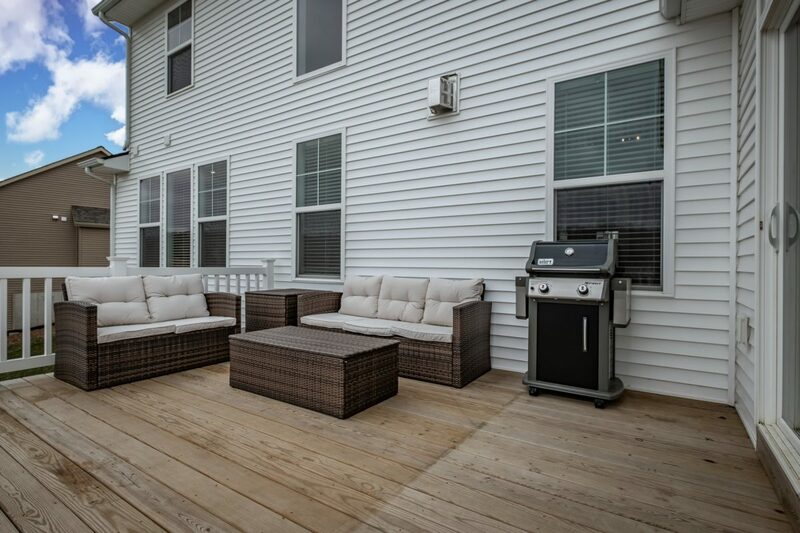 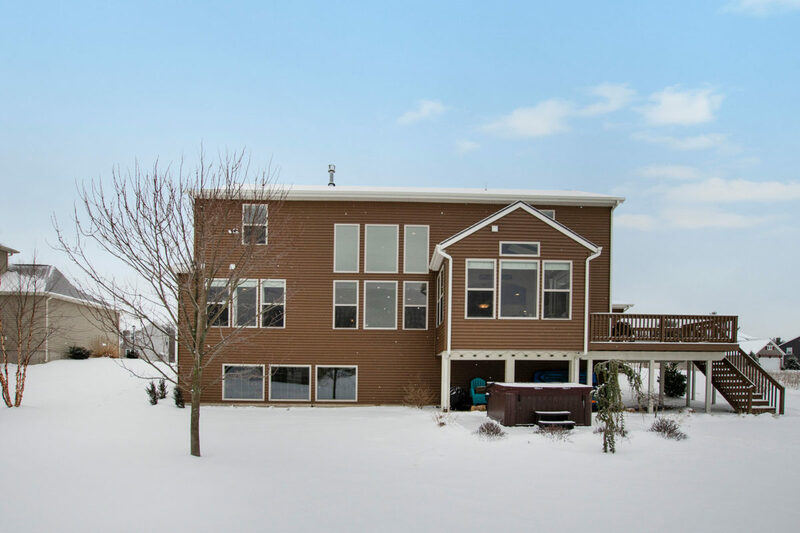 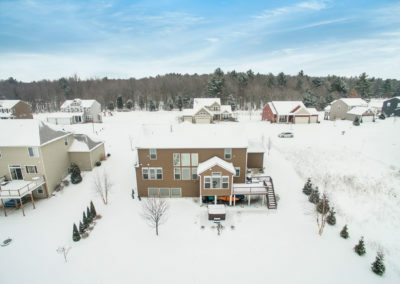 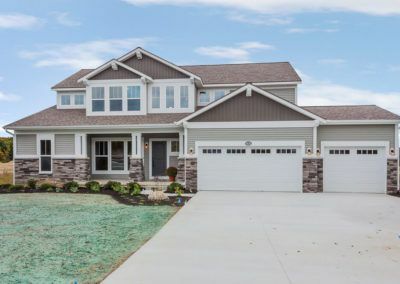 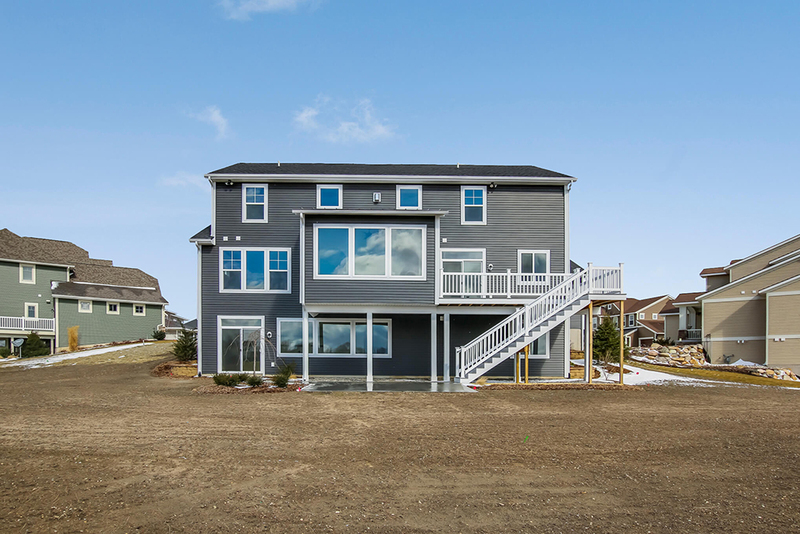 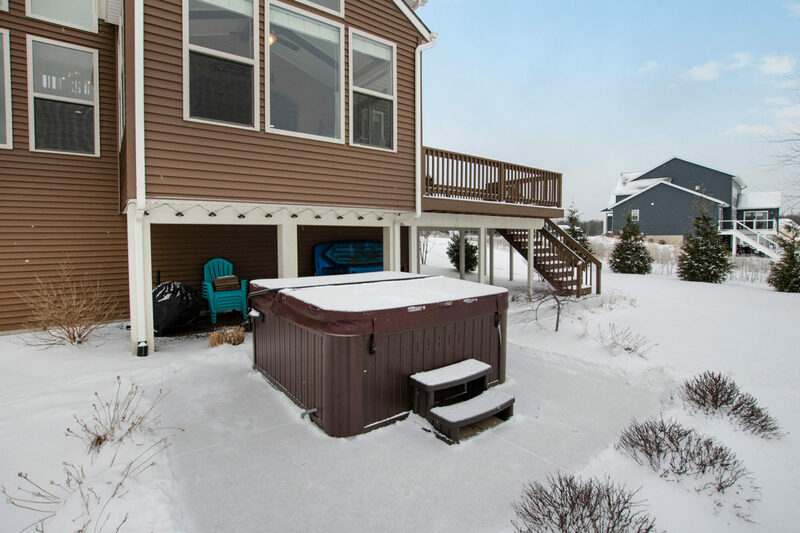 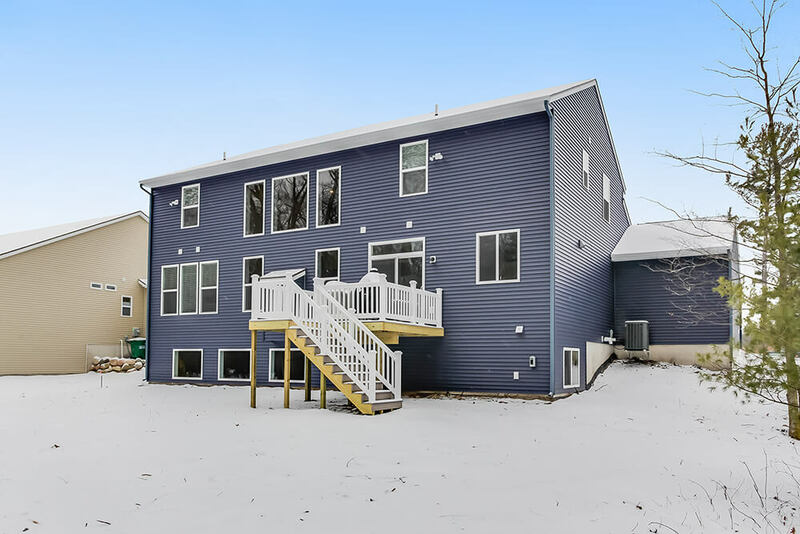 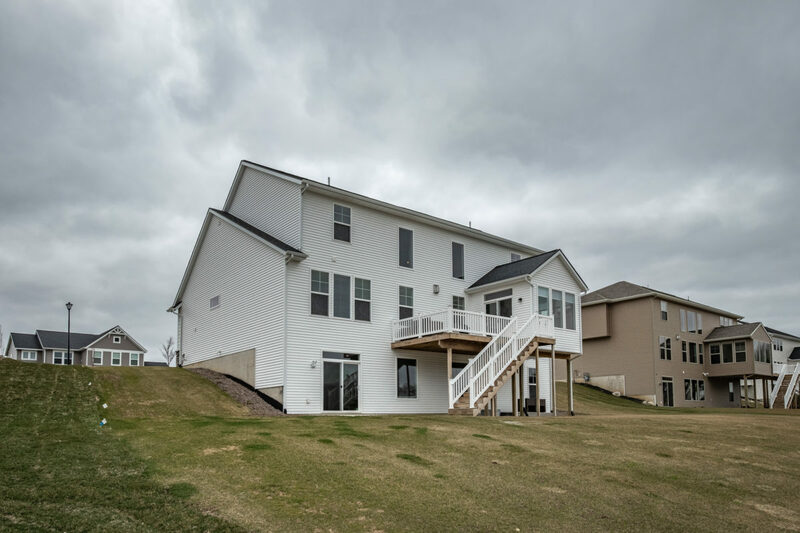 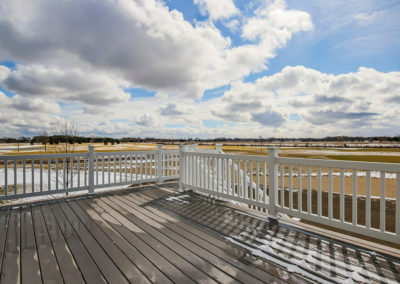 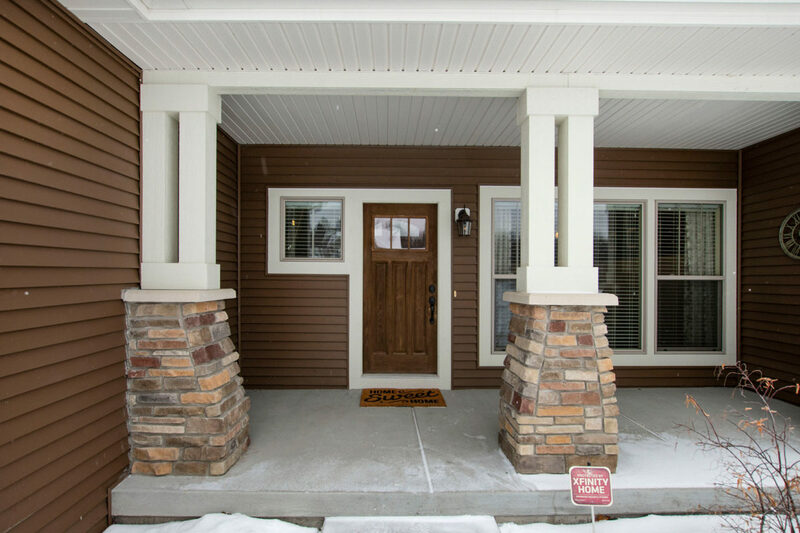 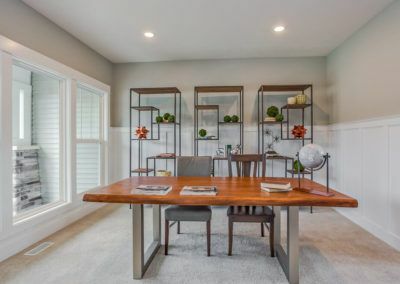 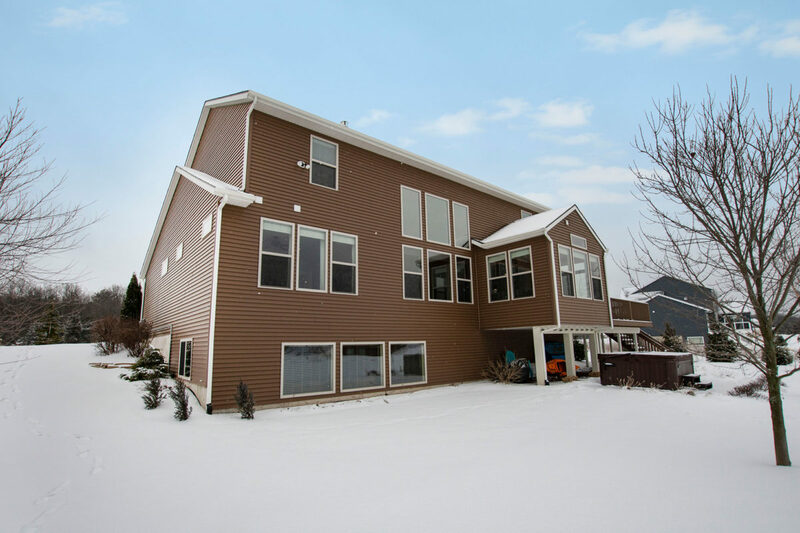 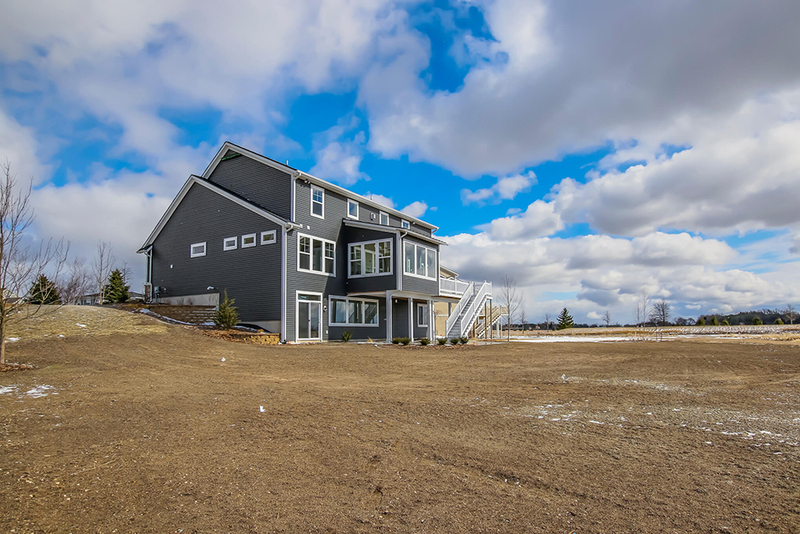 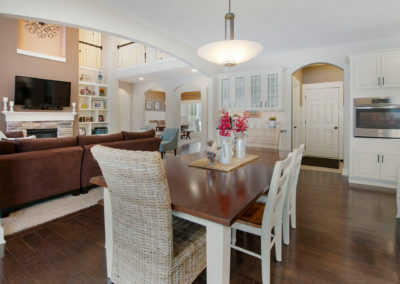 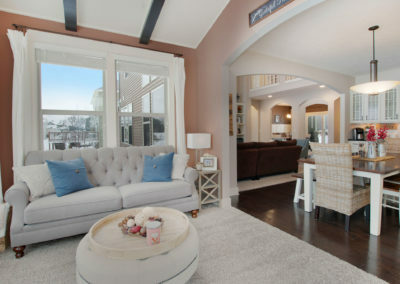 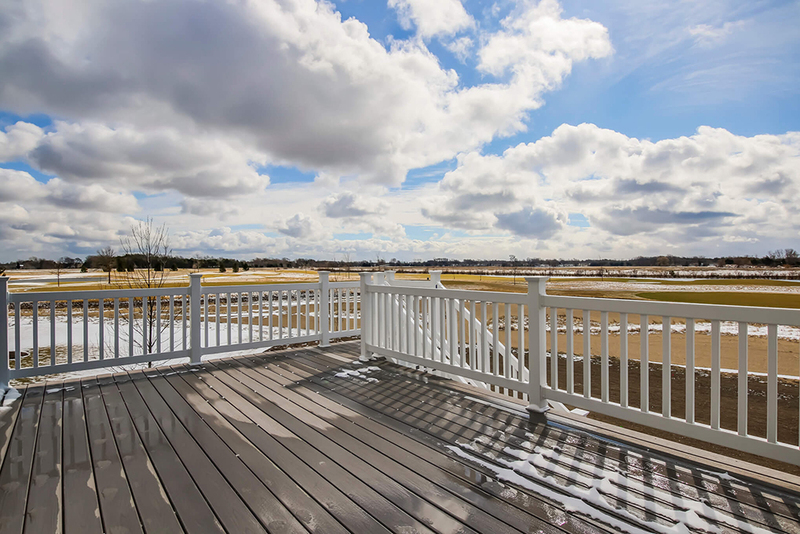 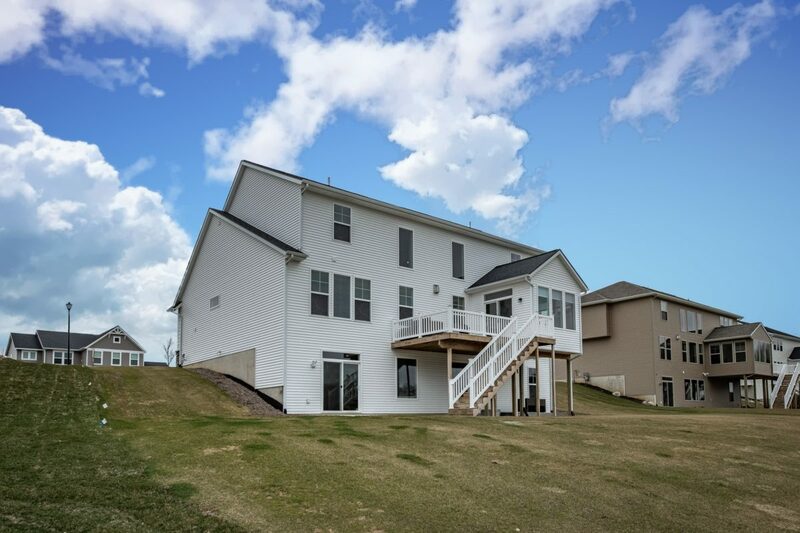 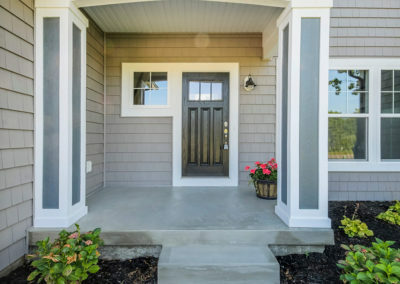 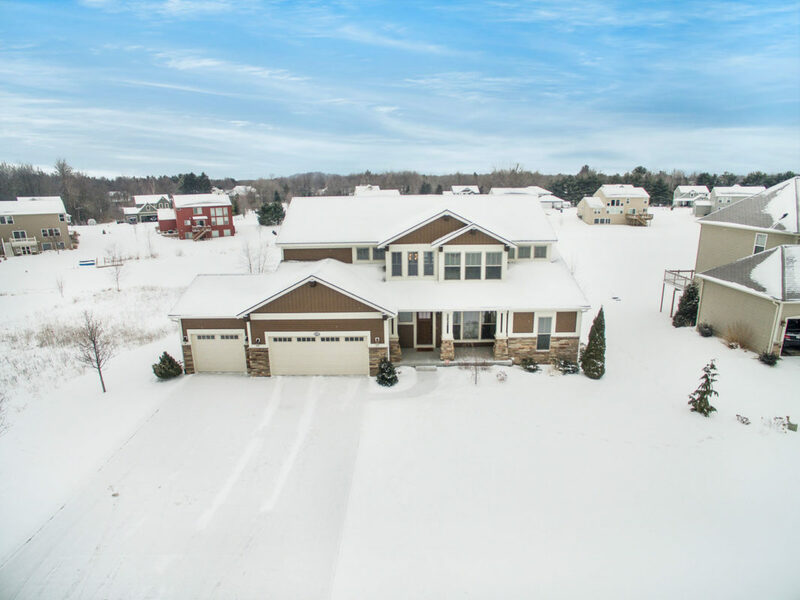 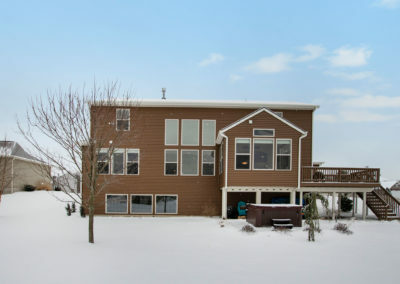 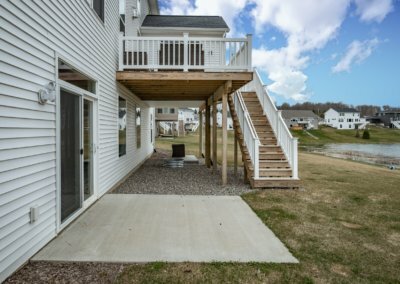 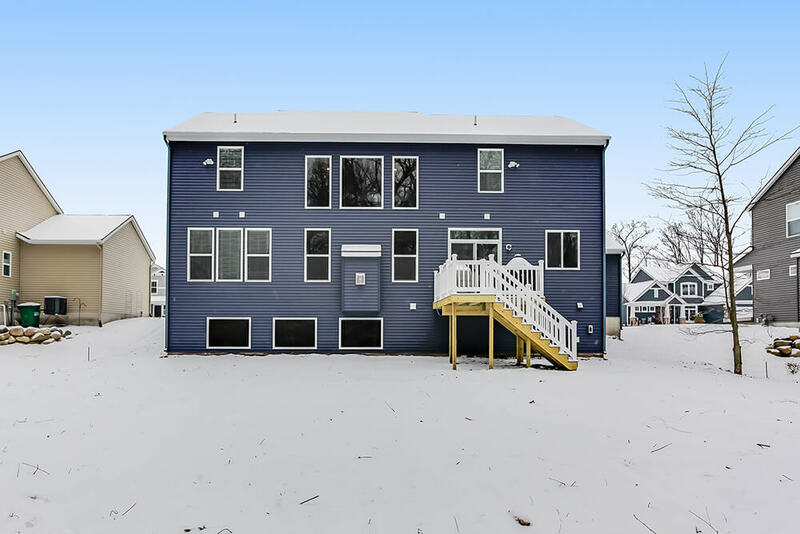 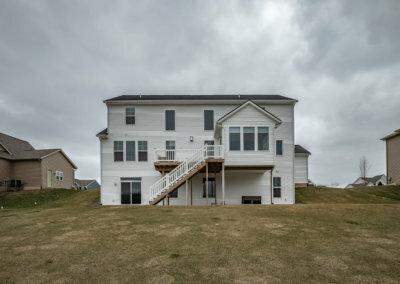 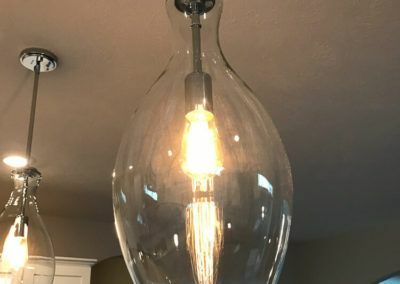 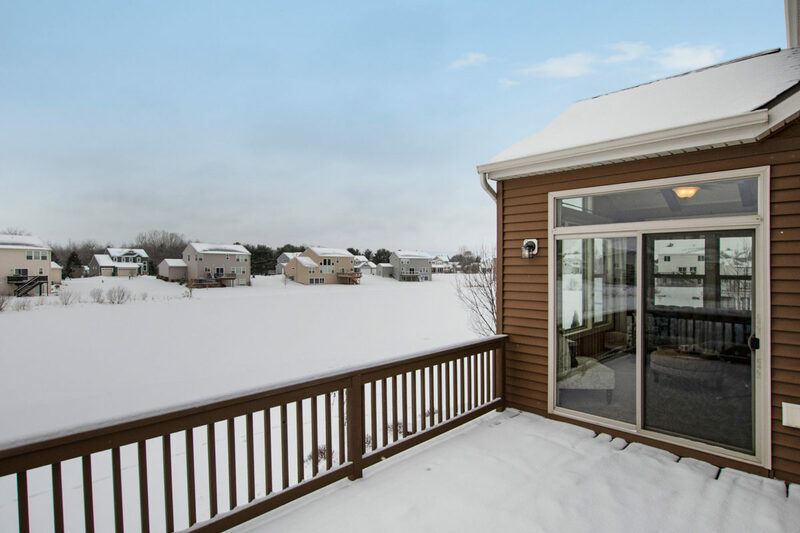 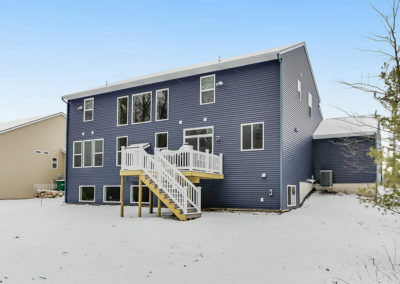 Sure to please, this home offers something for everyone. 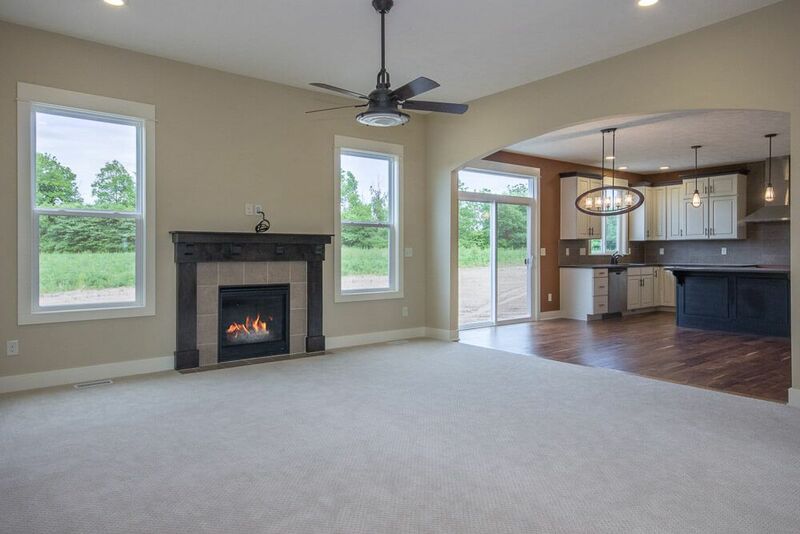 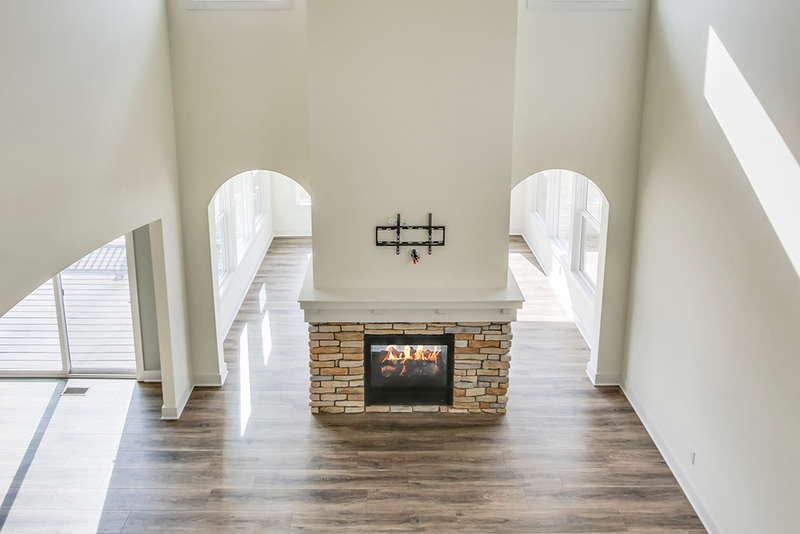 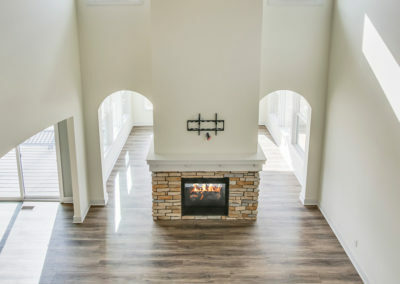 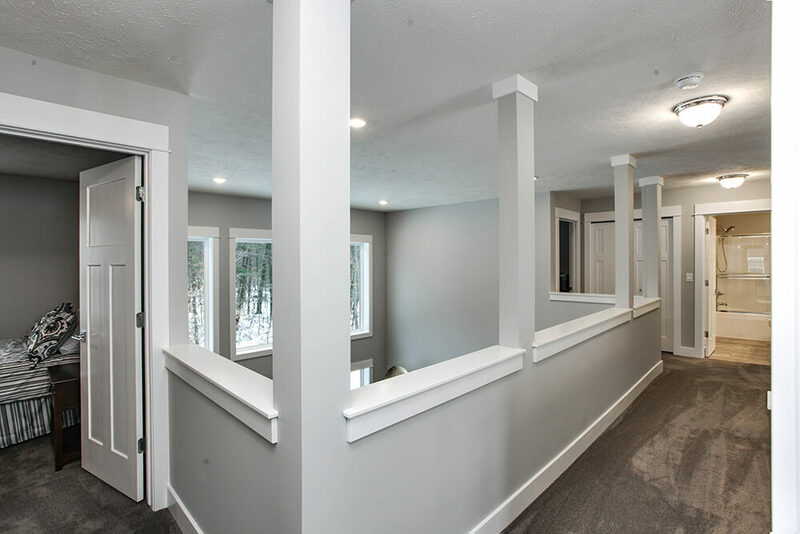 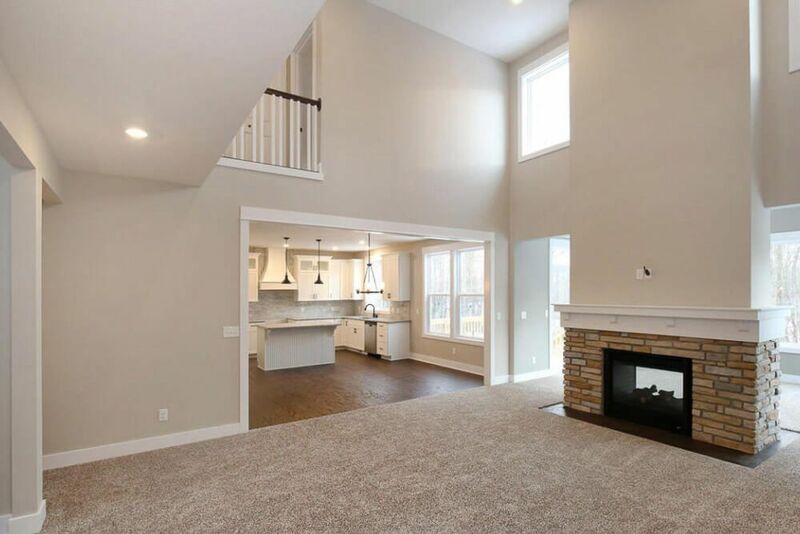 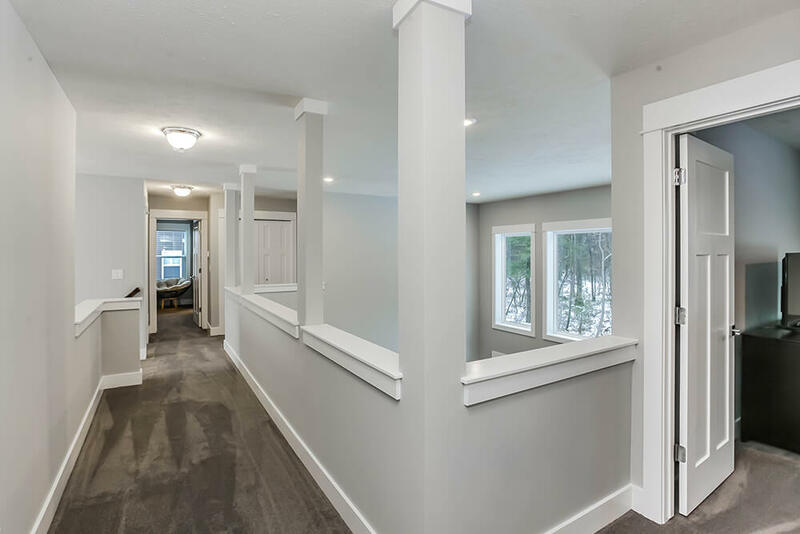 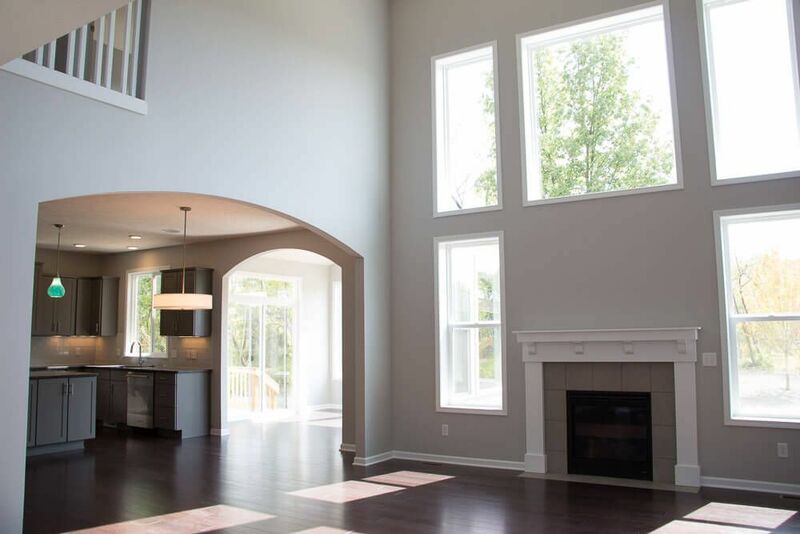 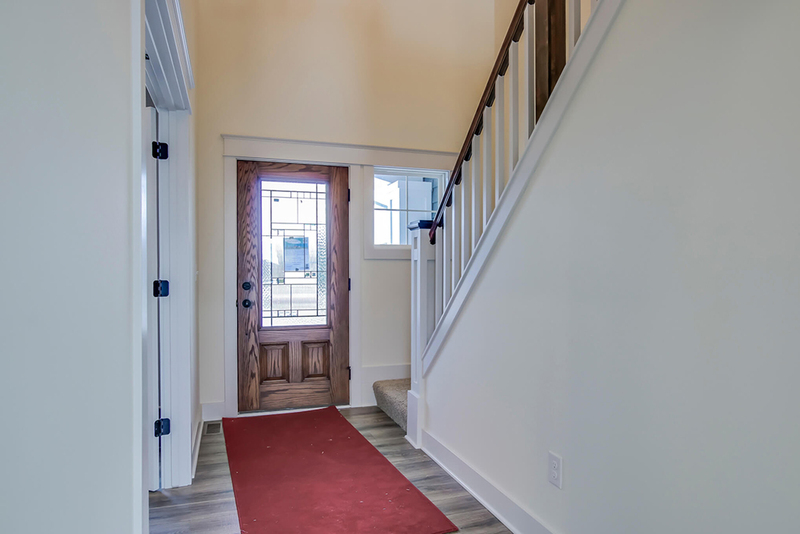 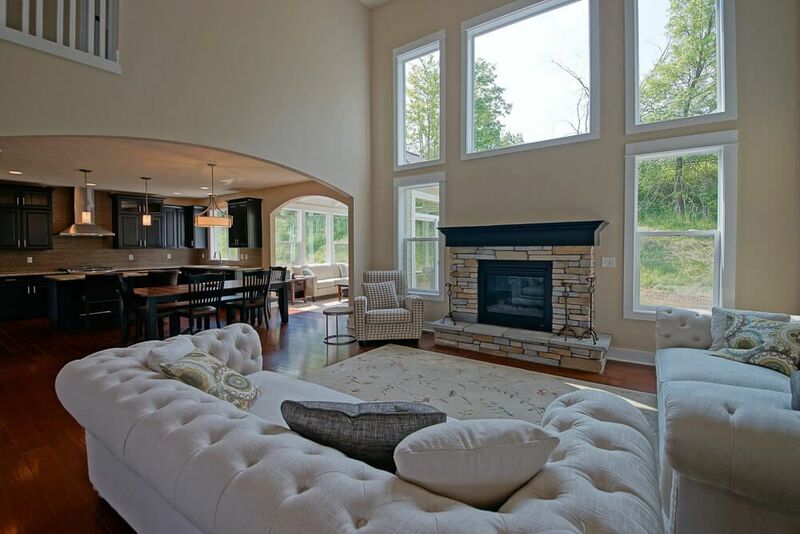 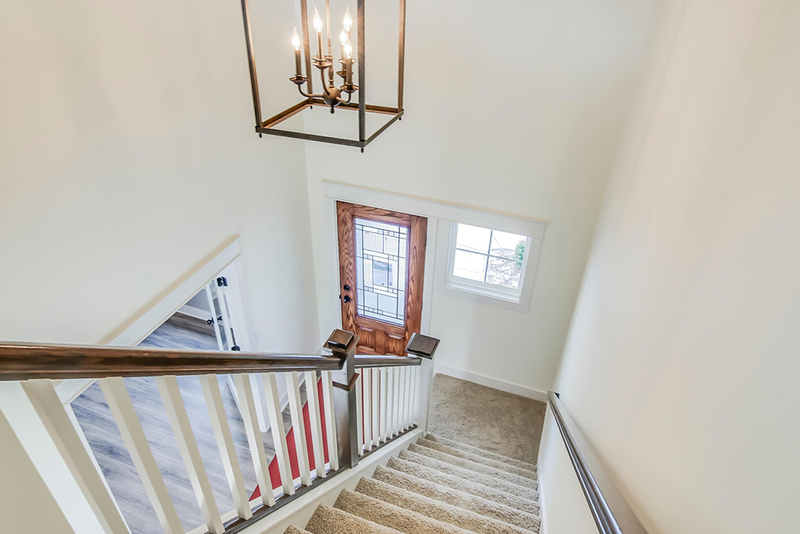 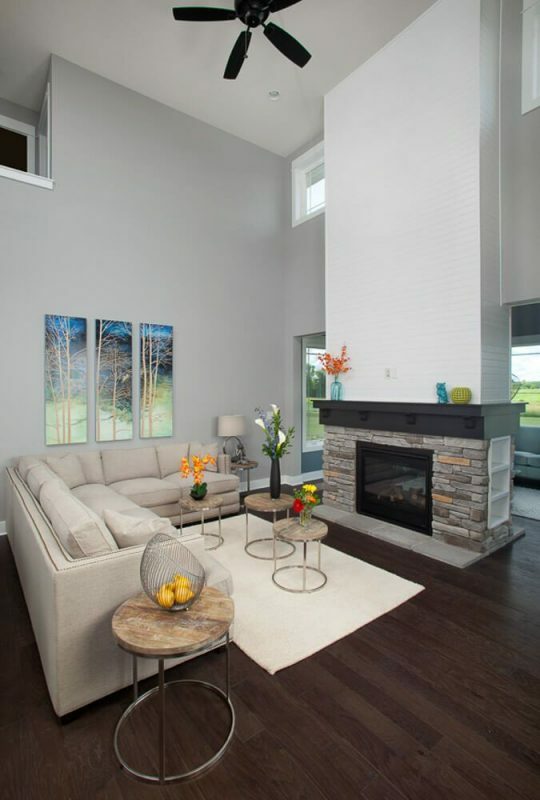 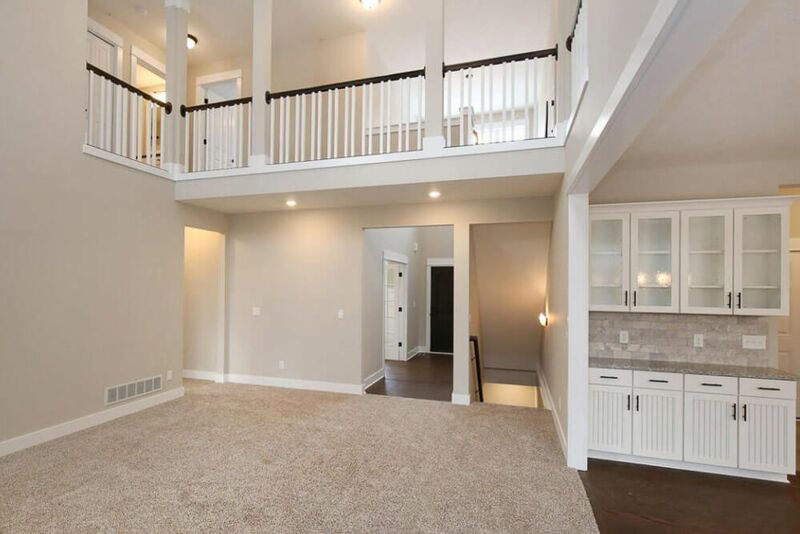 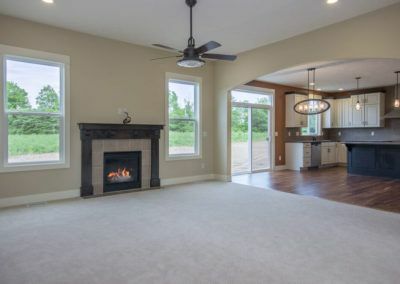 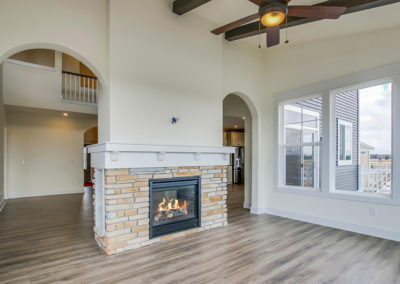 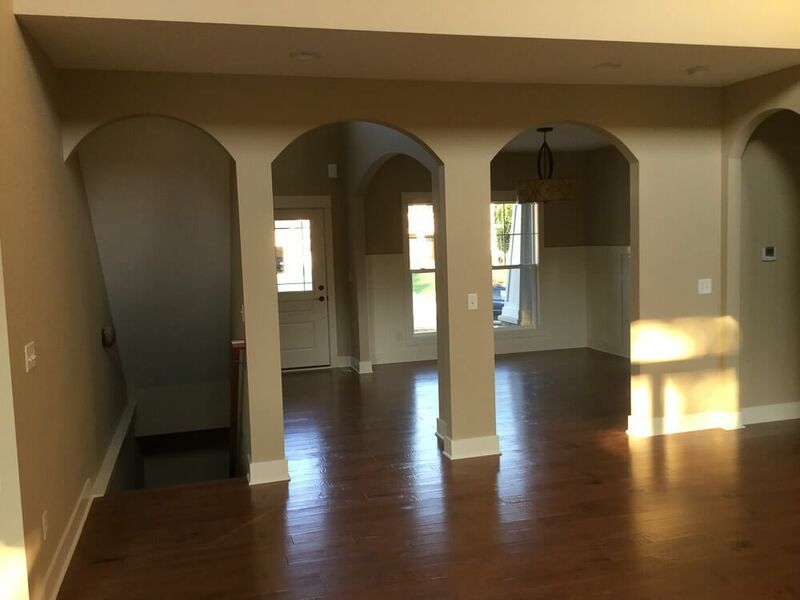 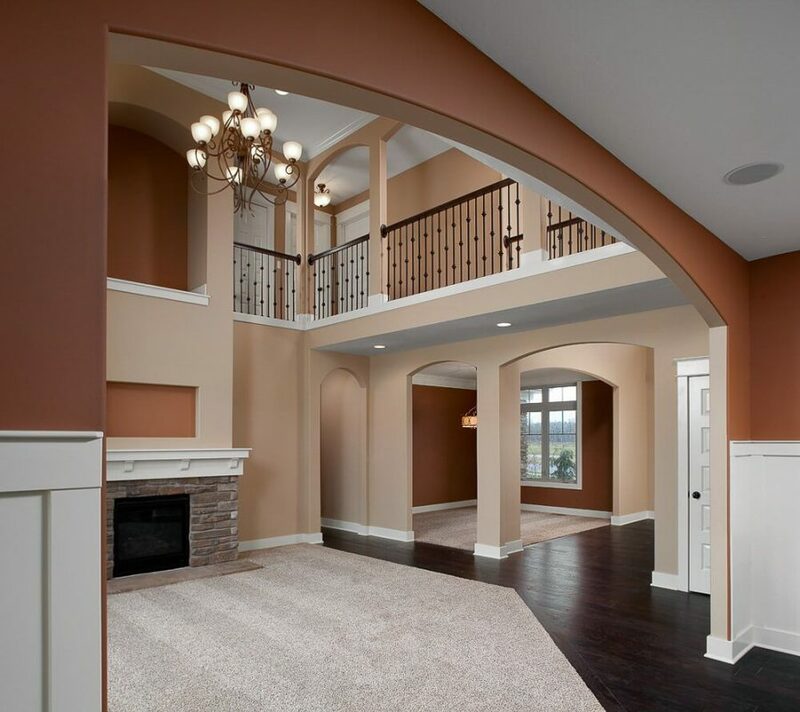 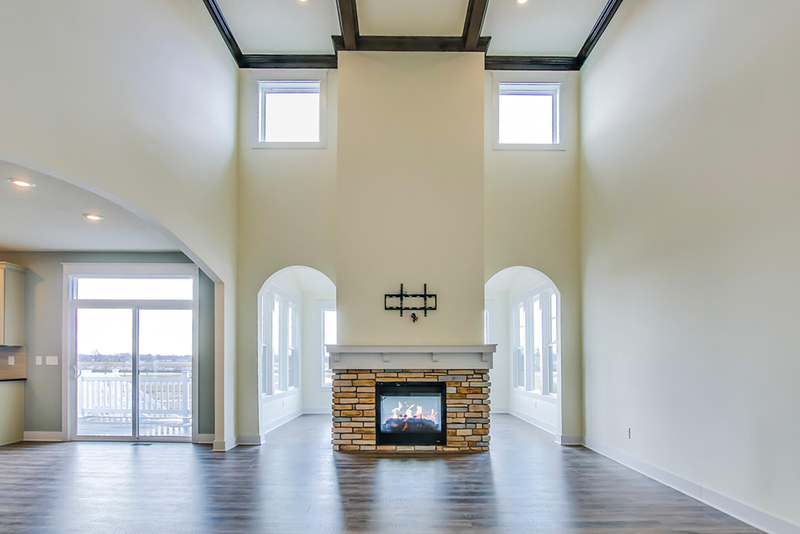 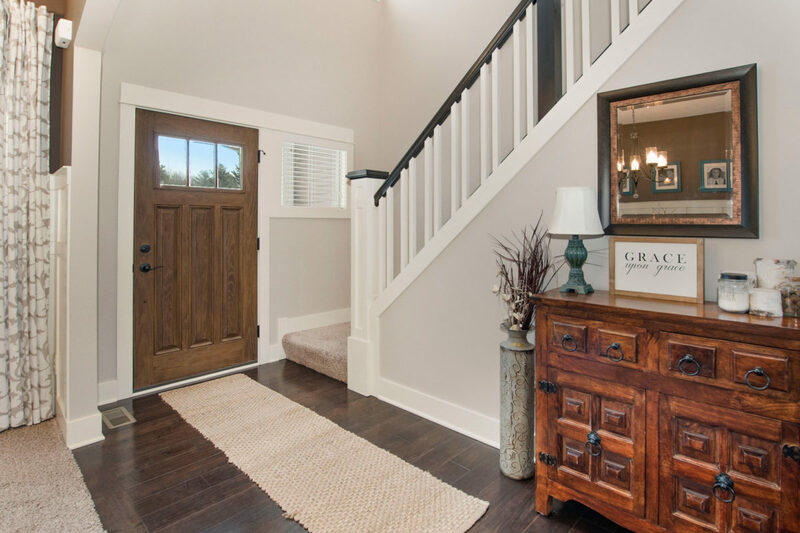 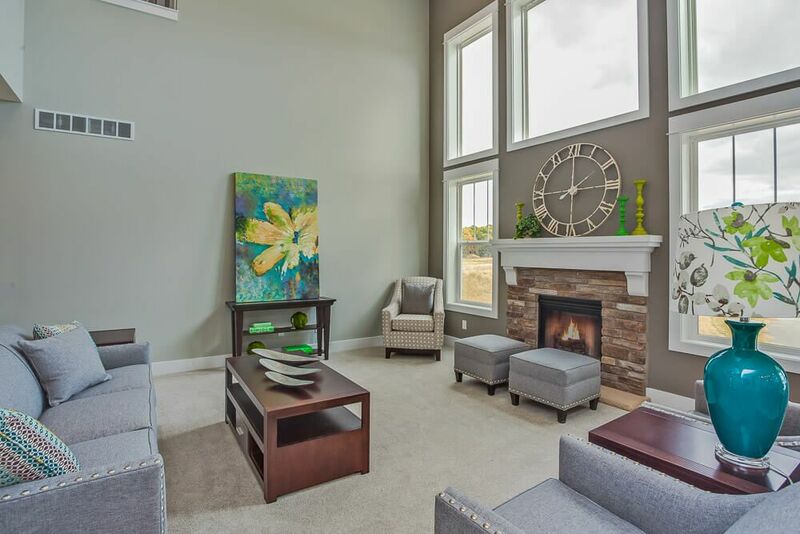 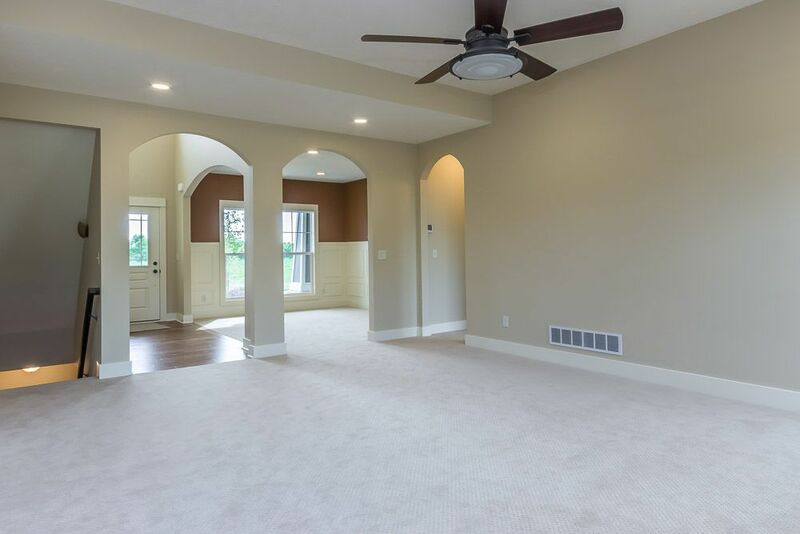 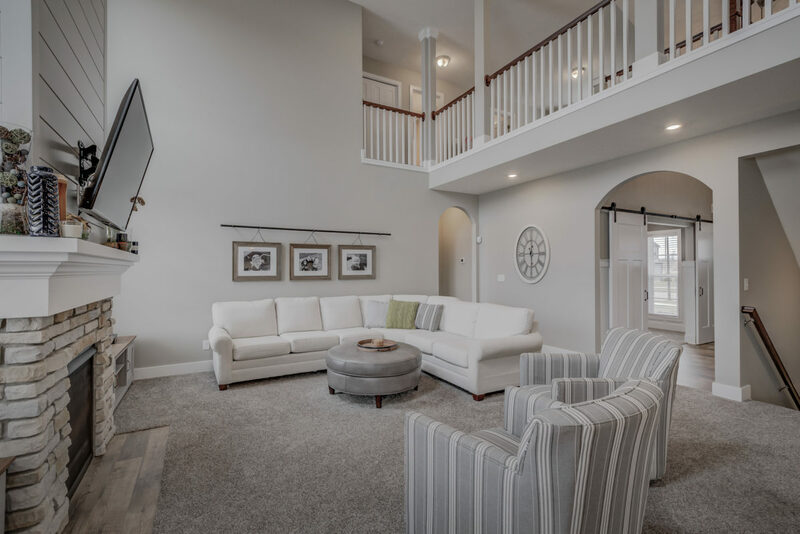 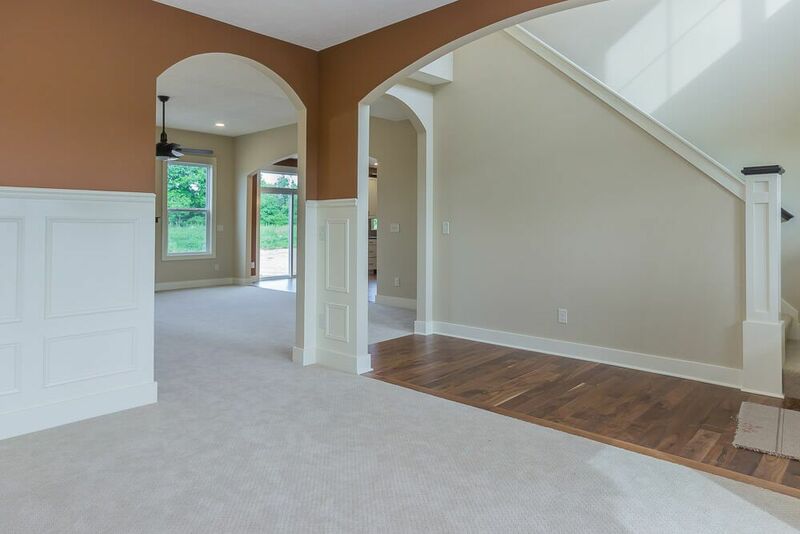 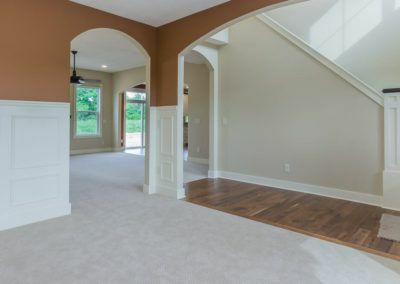 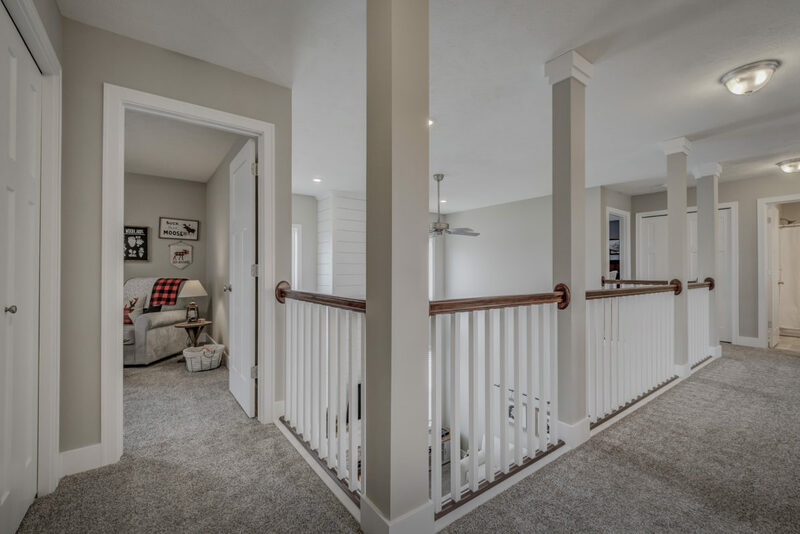 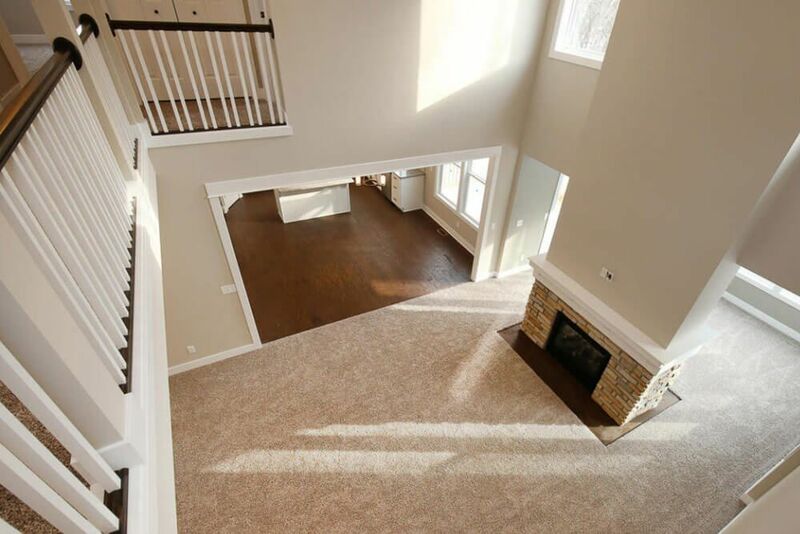 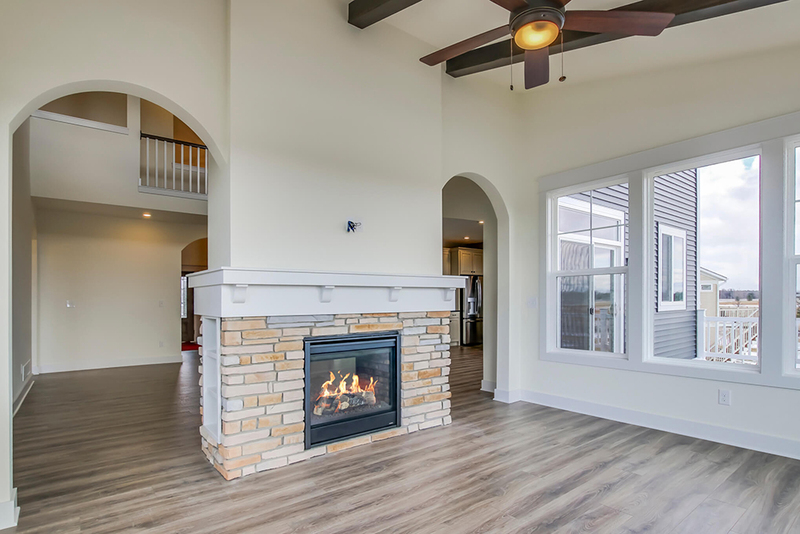 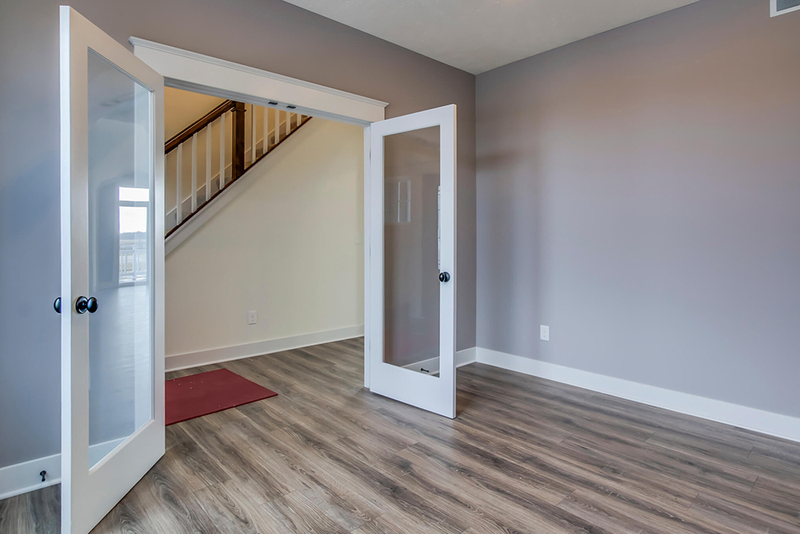 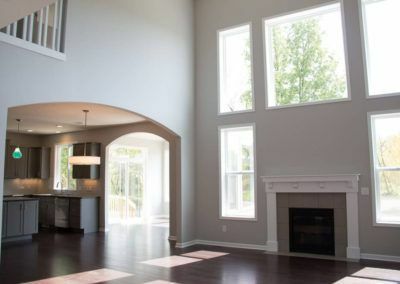 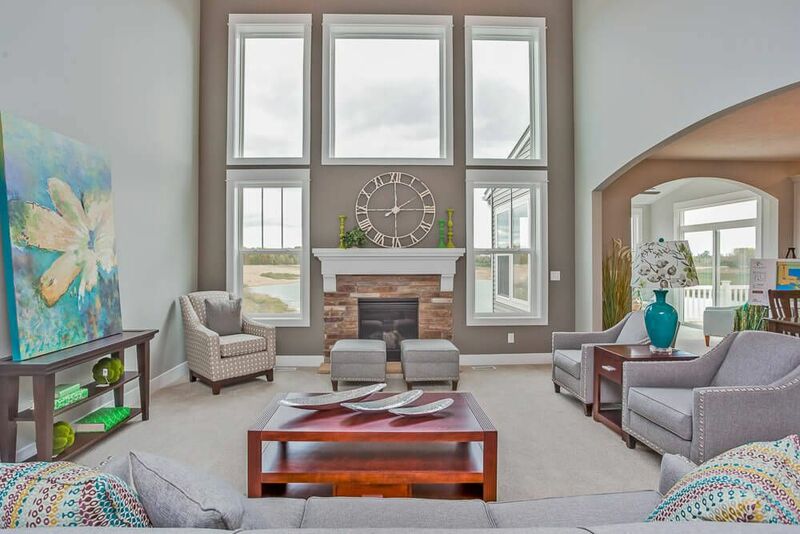 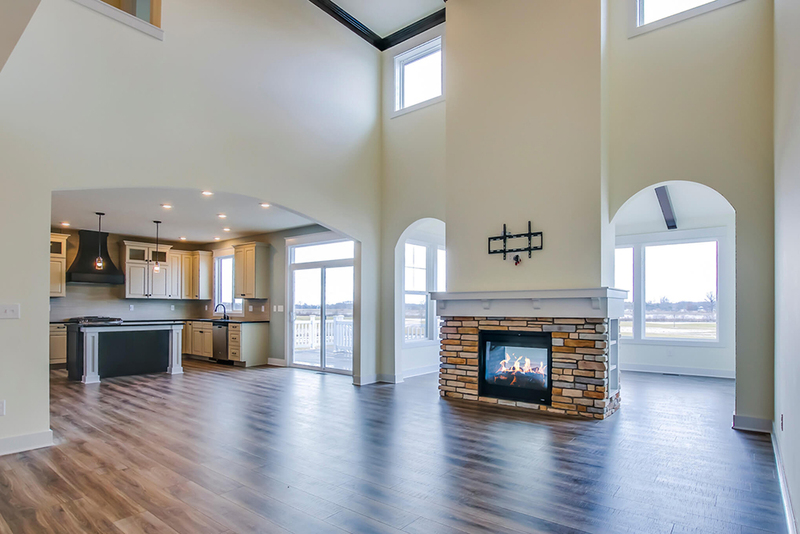 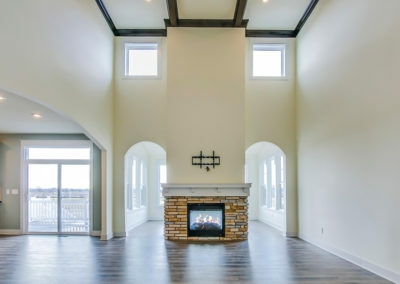 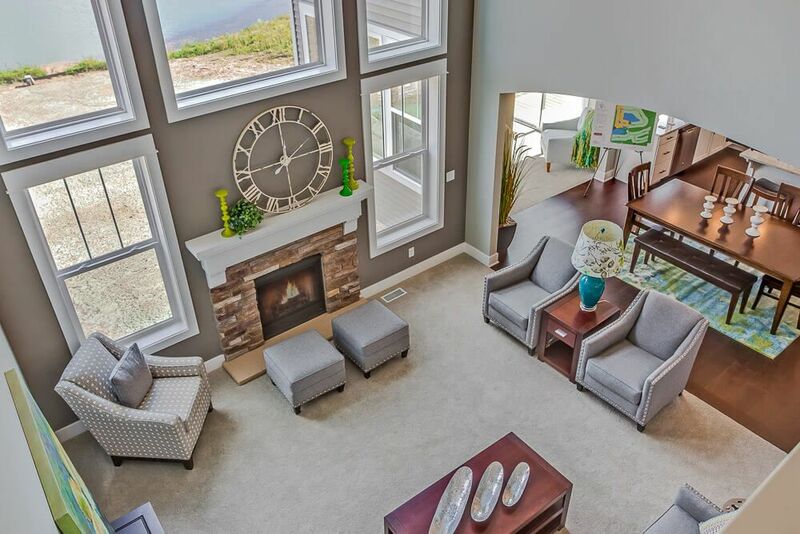 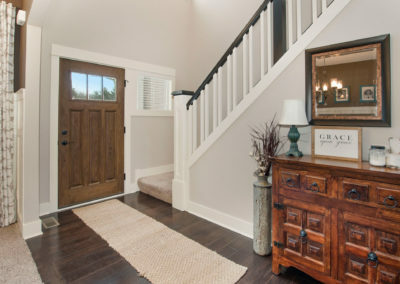 The Sebastian’s foyer entry way is open to the front flex room, and leads into the two story family room with its included gas fireplace. 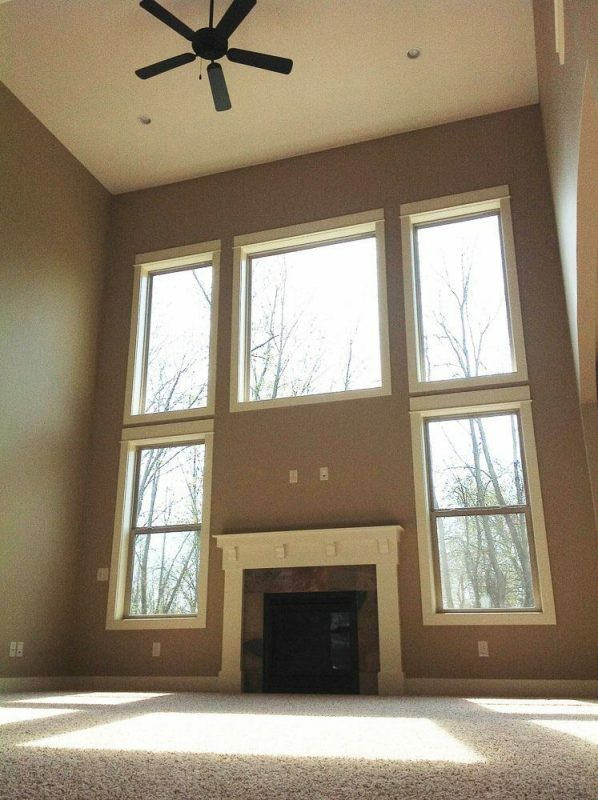 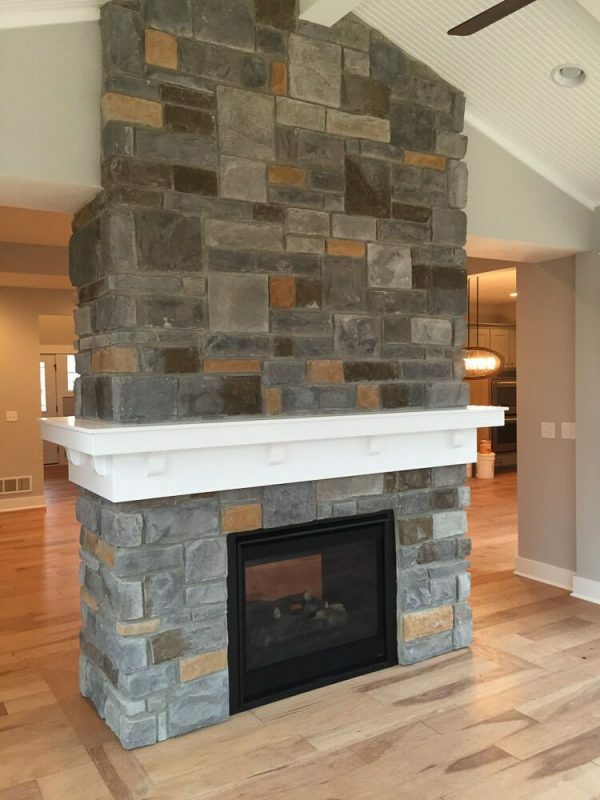 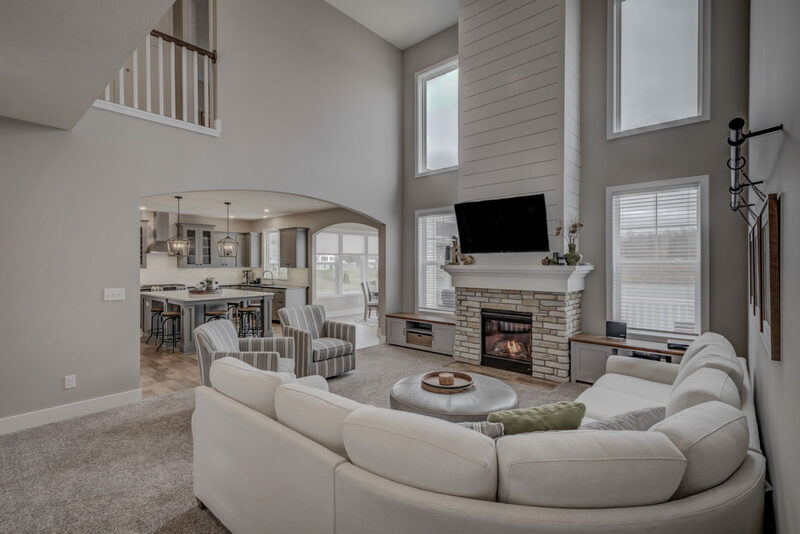 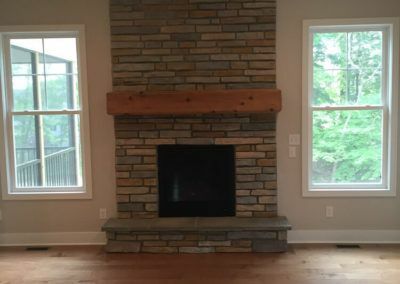 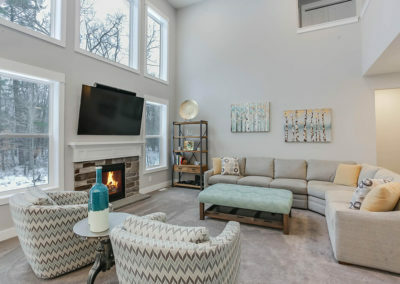 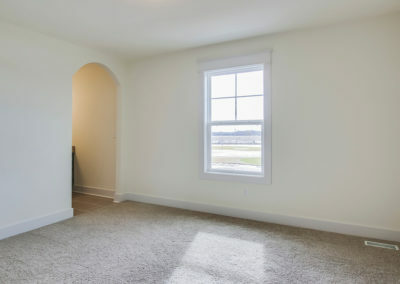 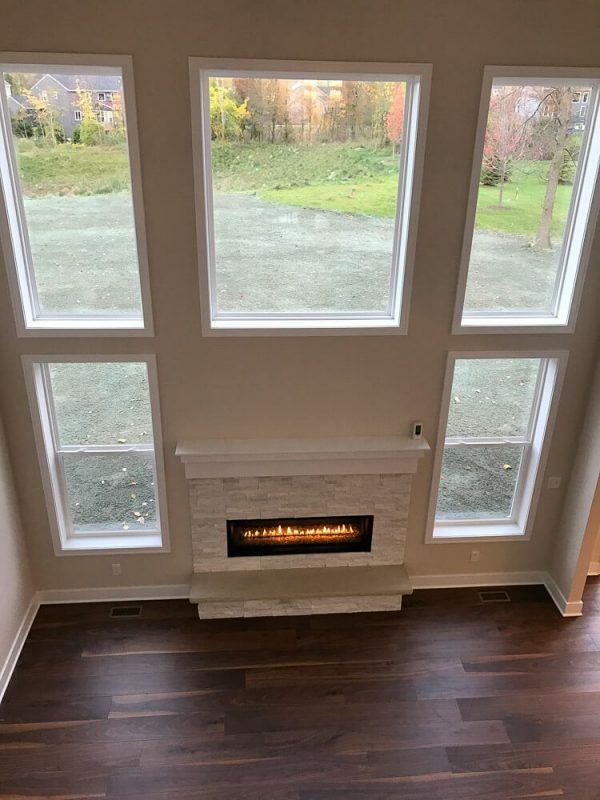 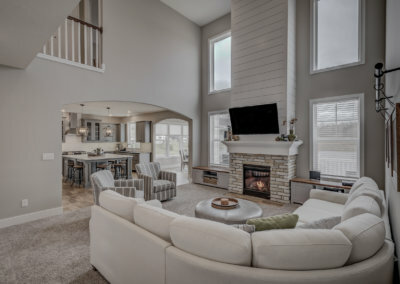 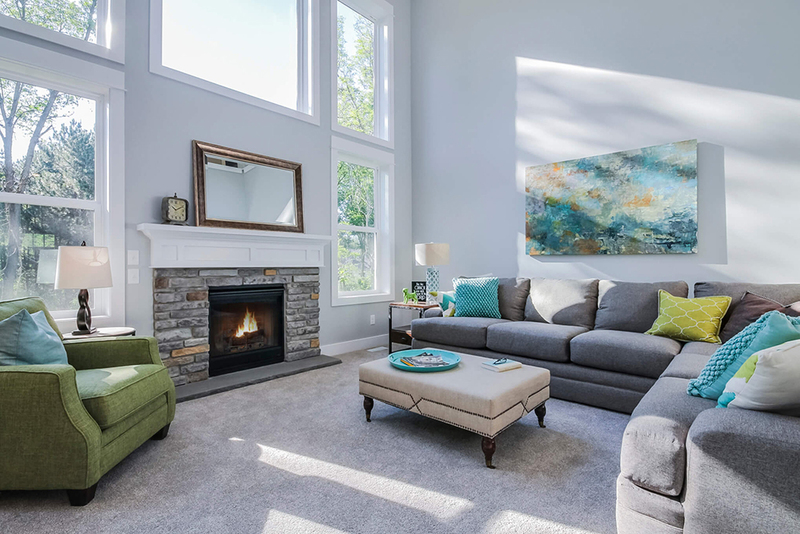 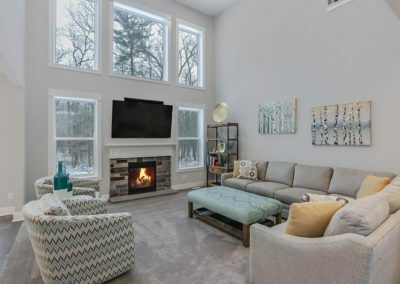 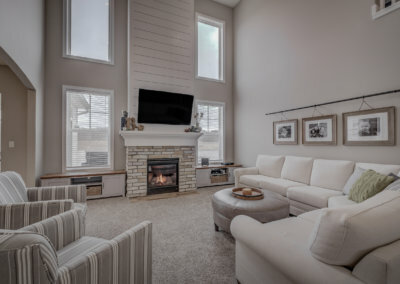 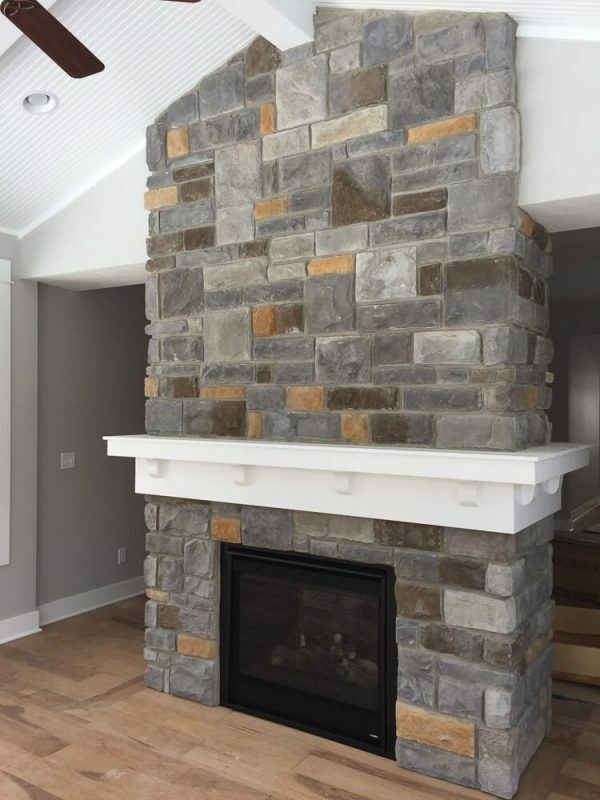 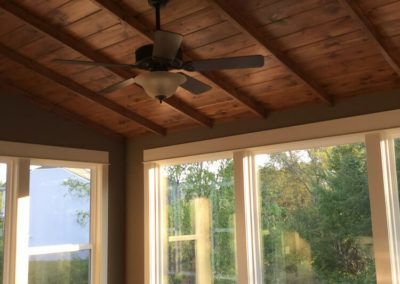 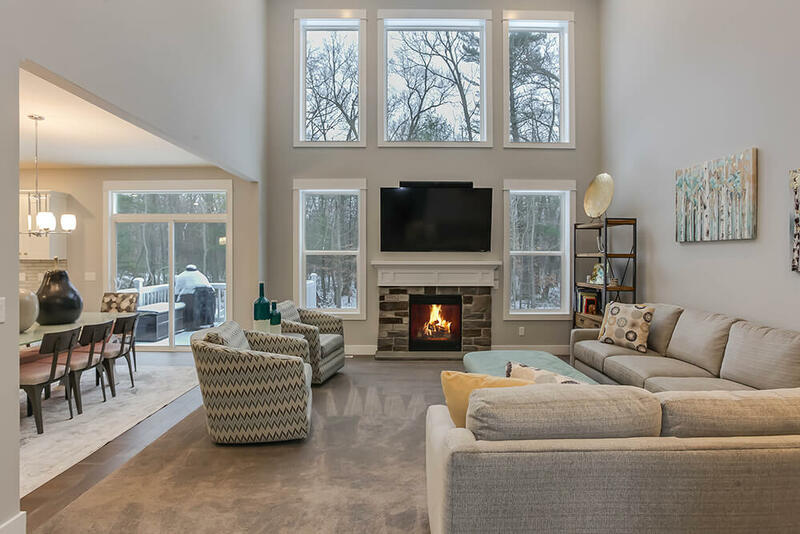 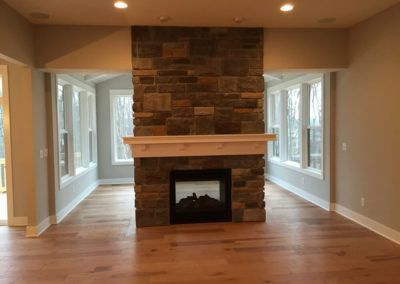 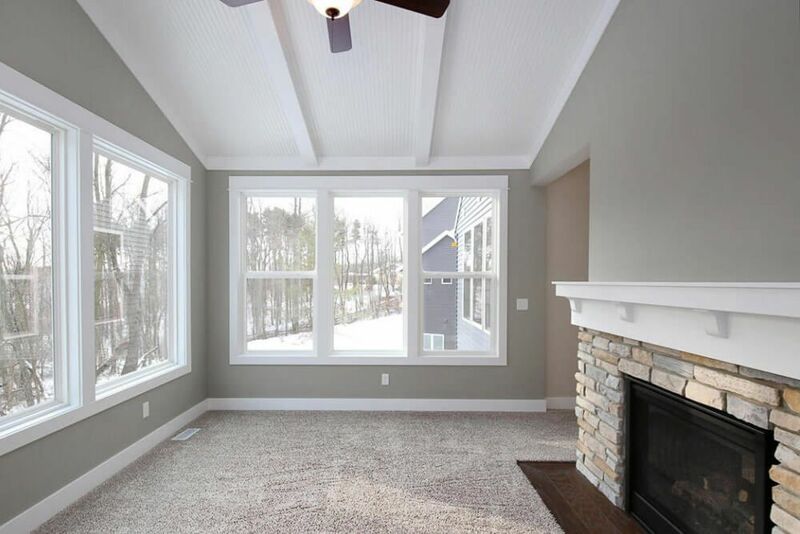 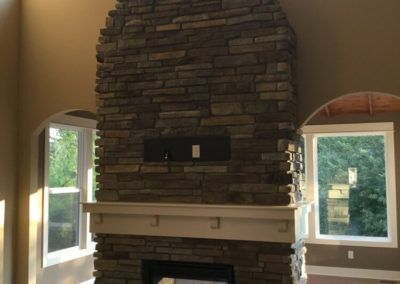 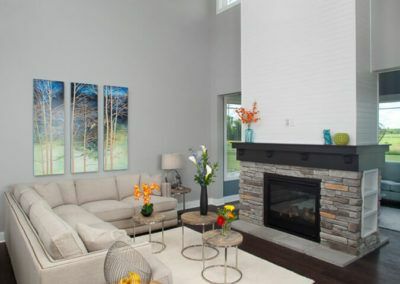 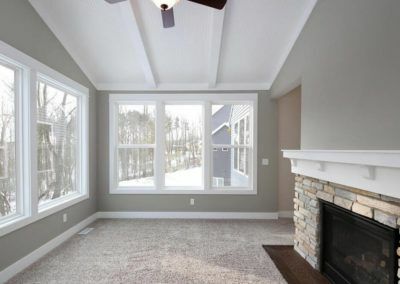 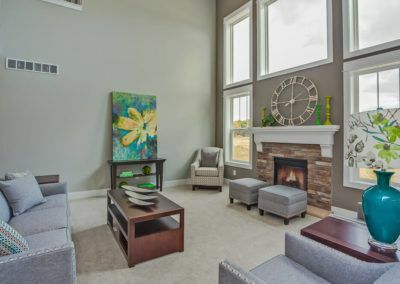 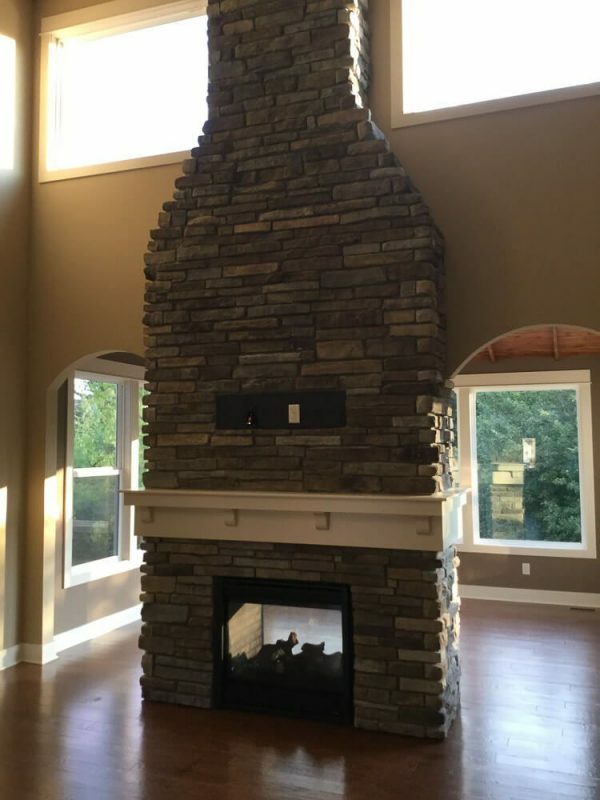 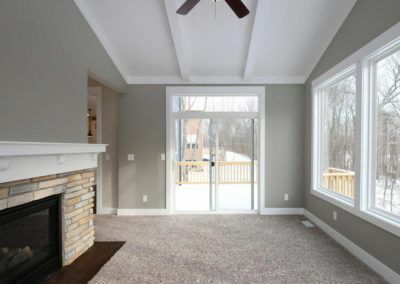 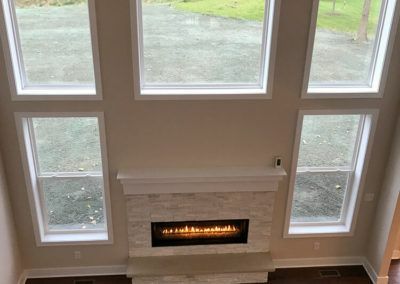 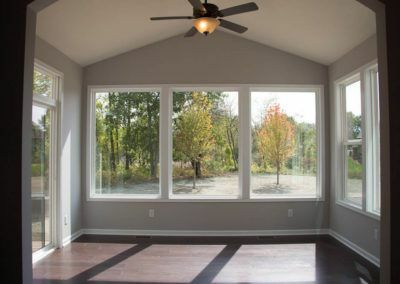 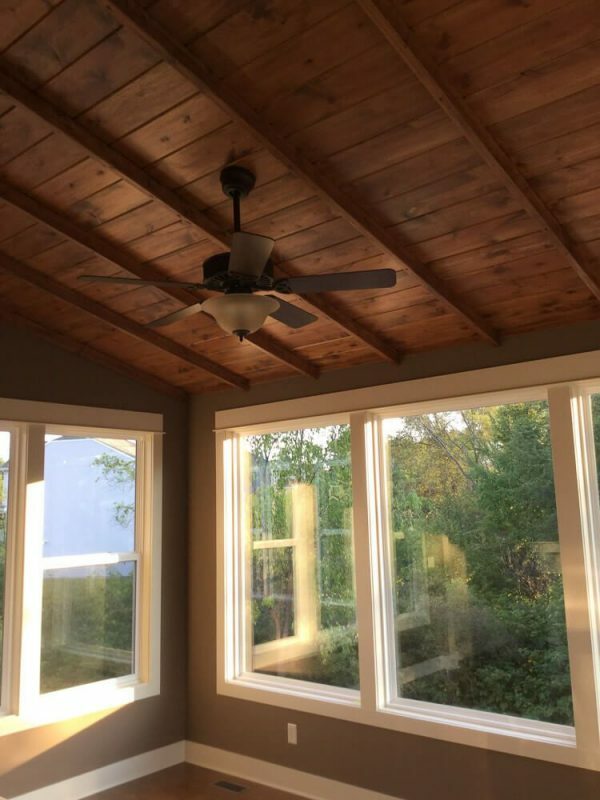 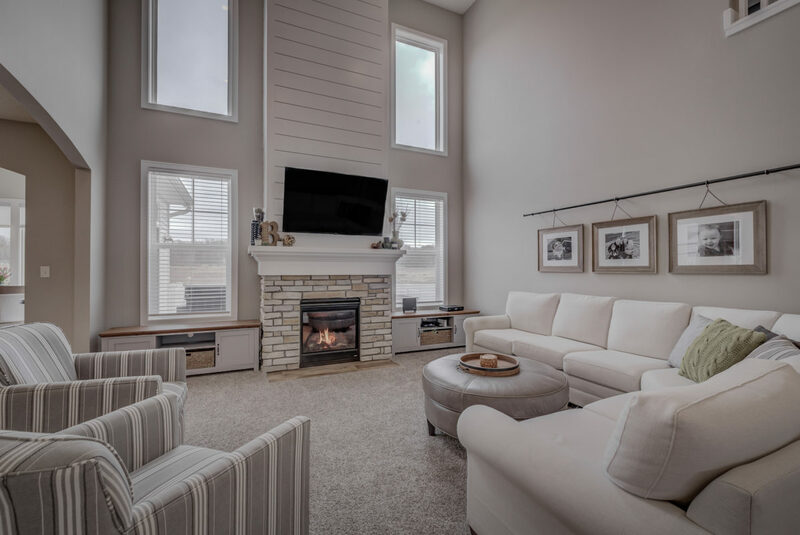 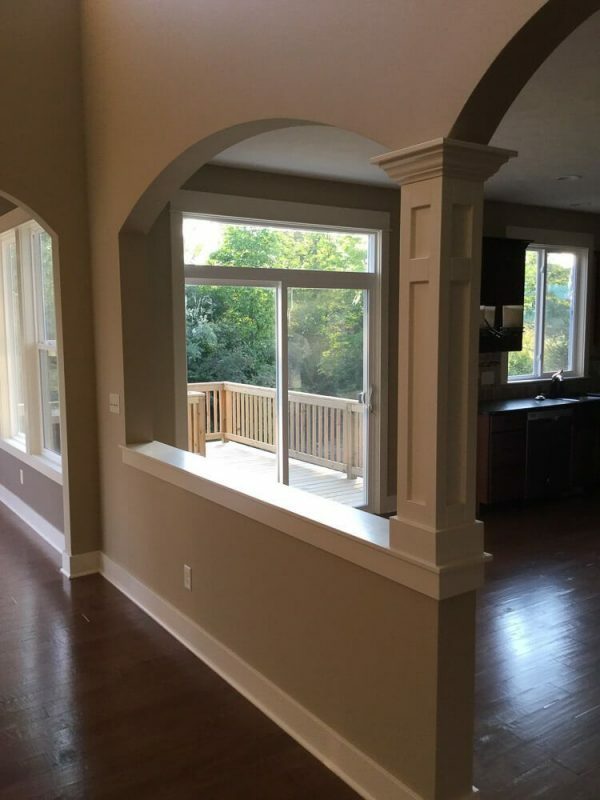 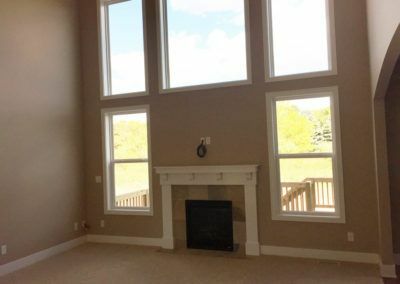 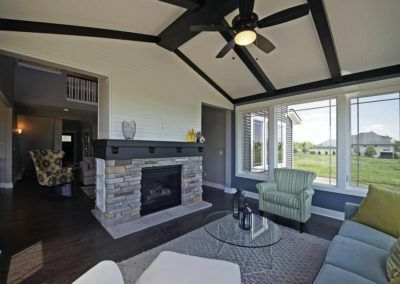 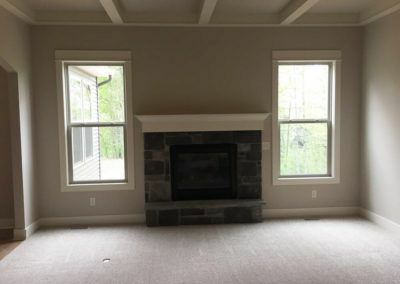 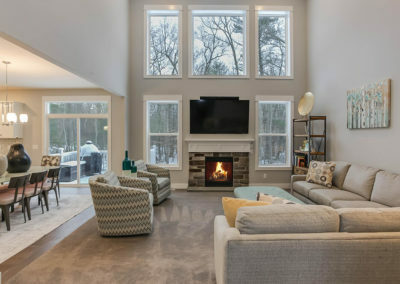 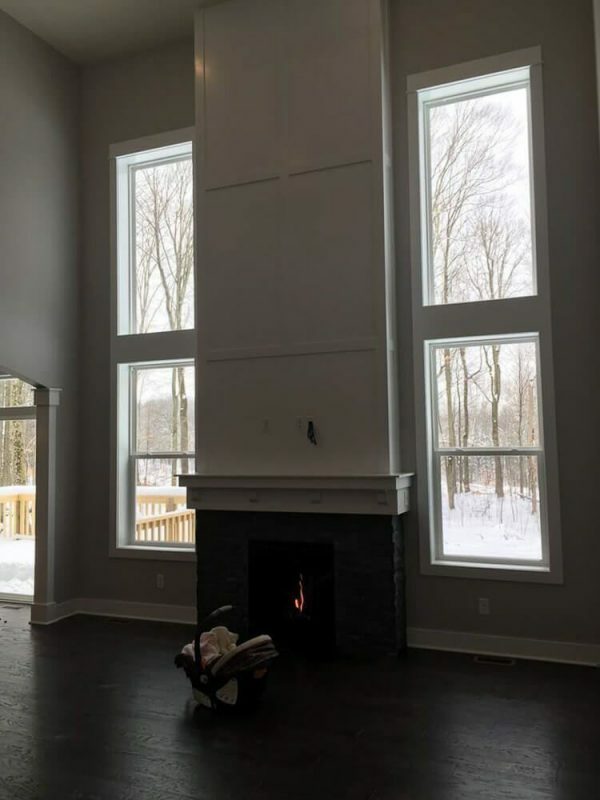 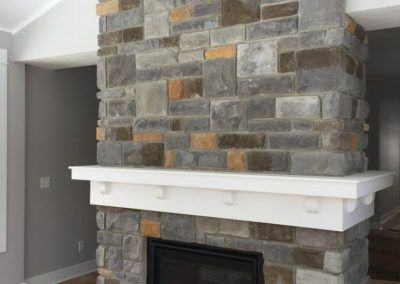 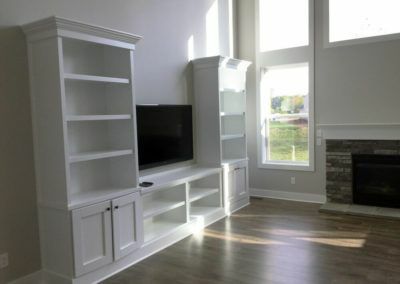 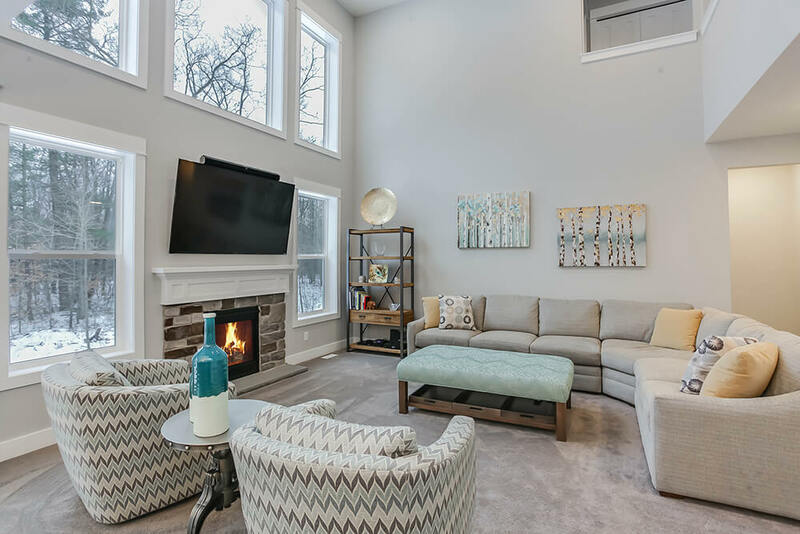 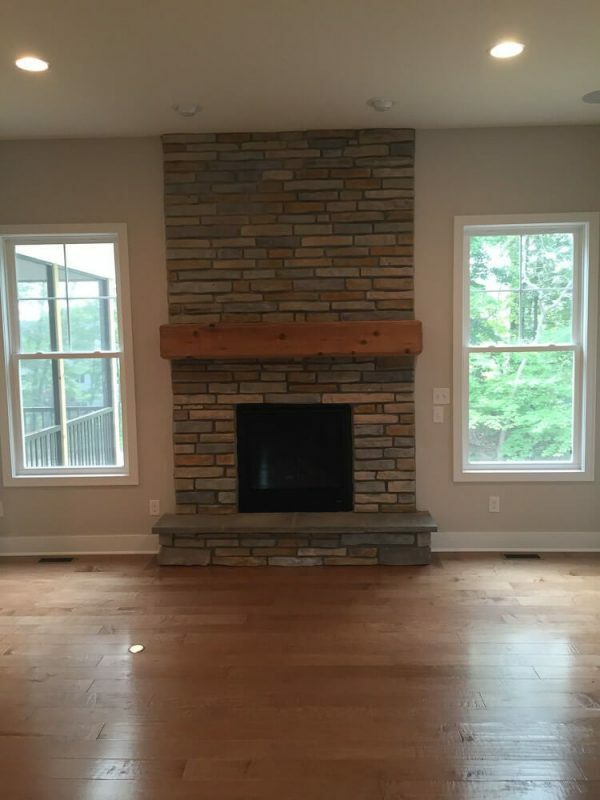 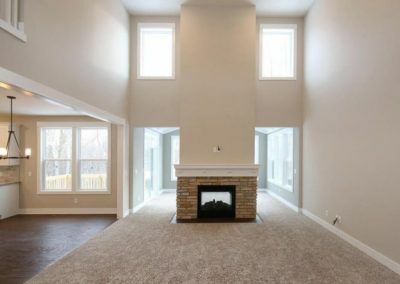 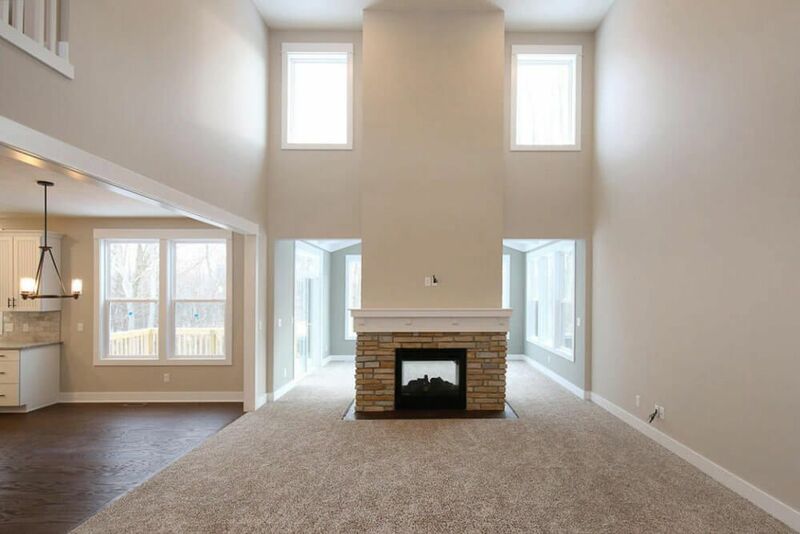 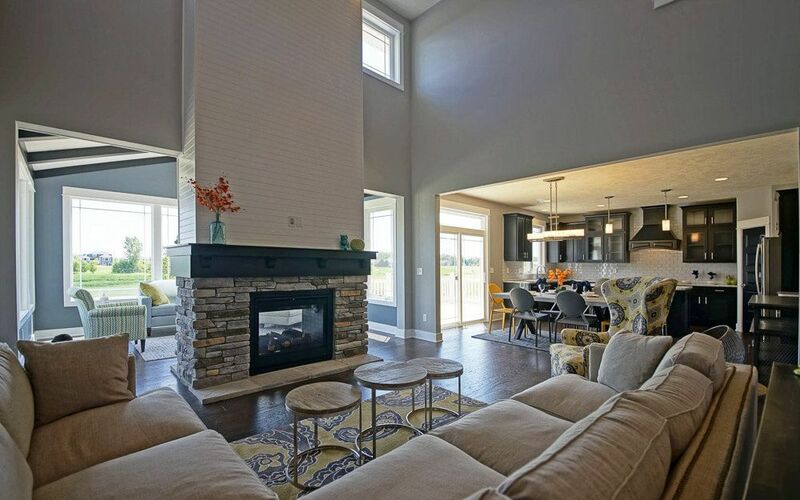 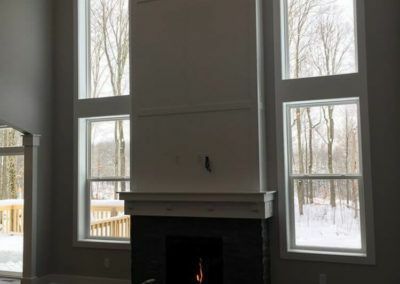 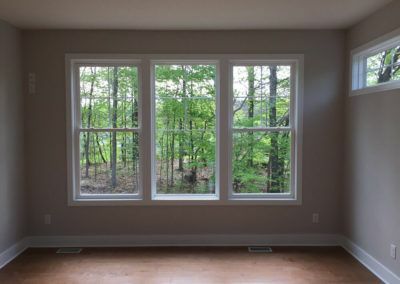 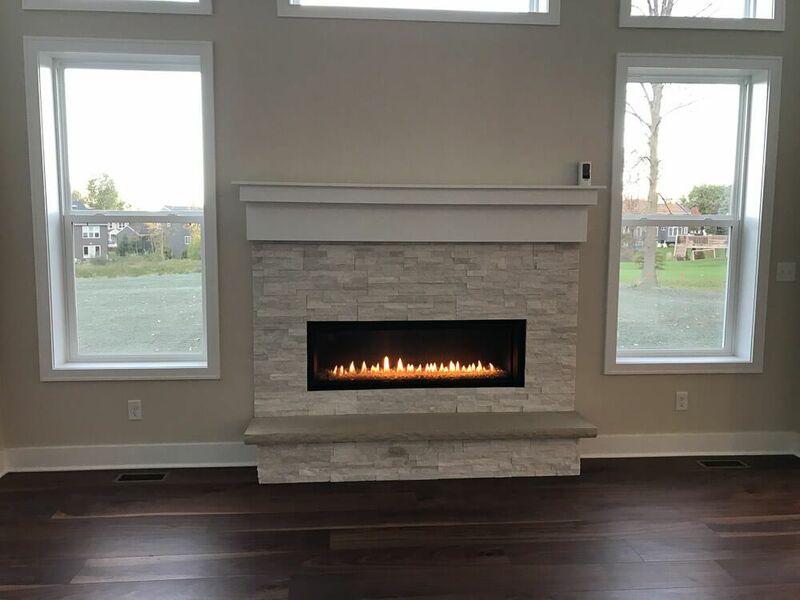 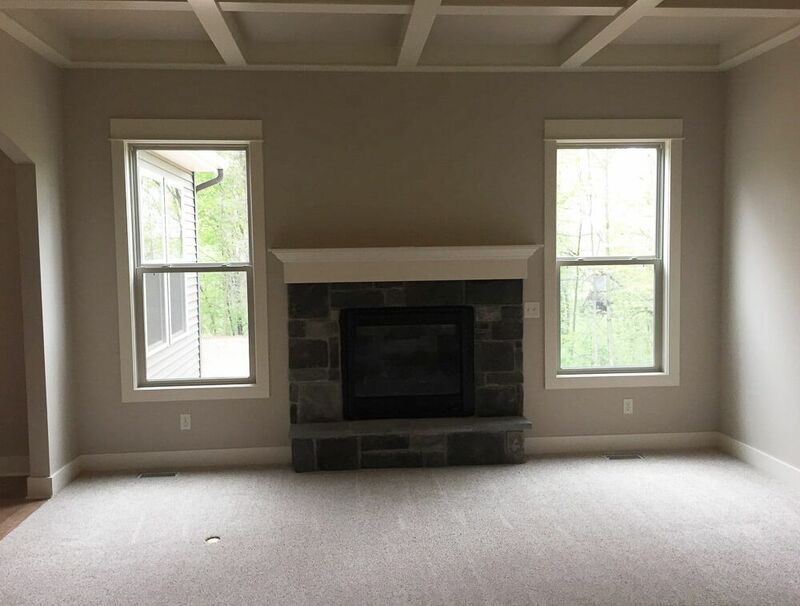 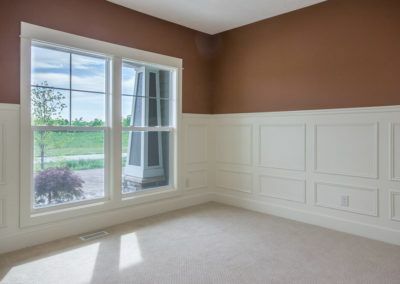 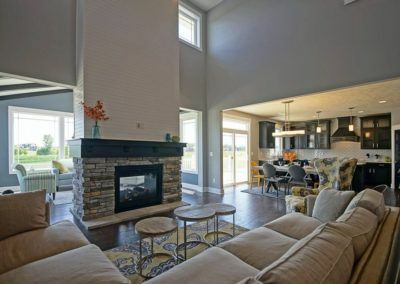 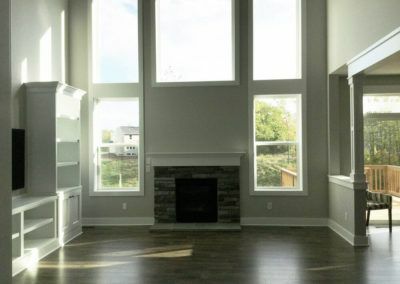 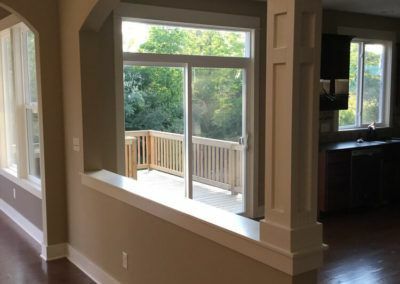 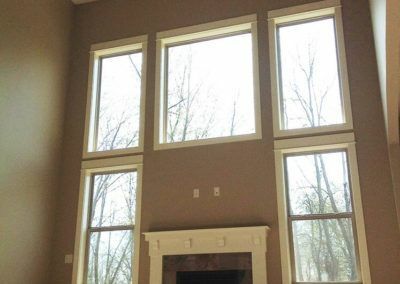 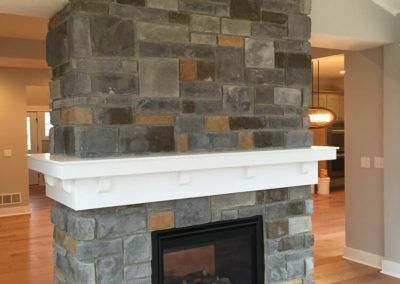 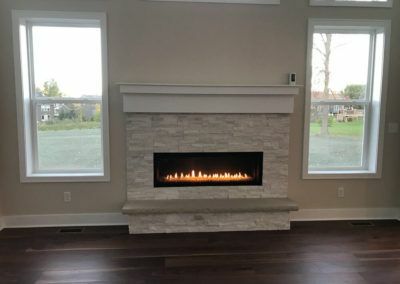 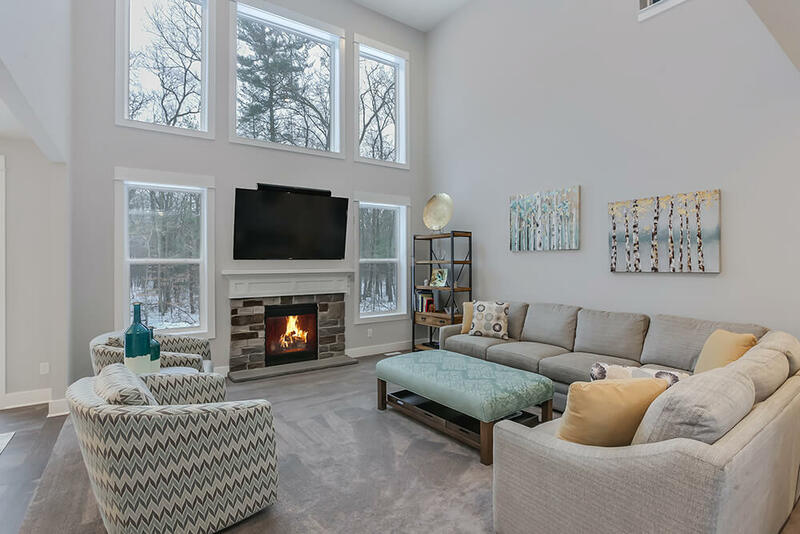 If you prefer, you can replace the included fireplace with another window, and add a two-way fireplace between the living room and dining room. 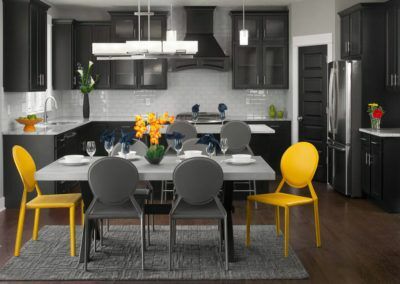 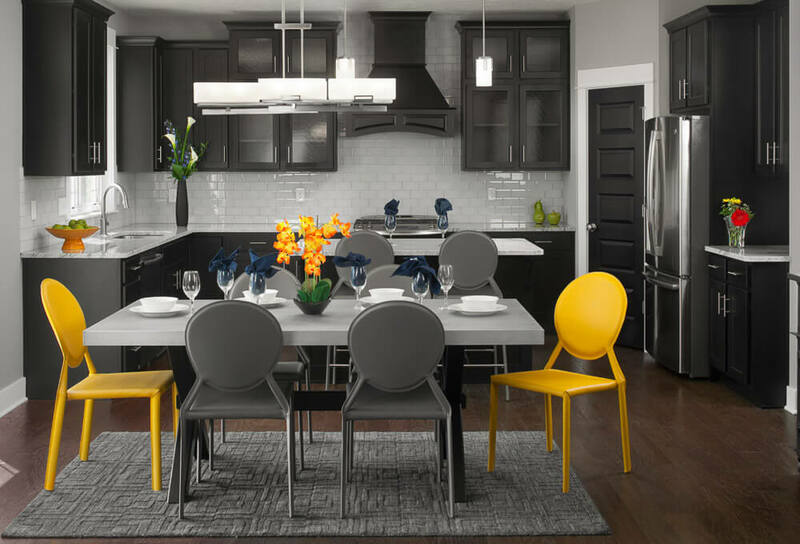 The kitchen and dining area form one open, flowing space. 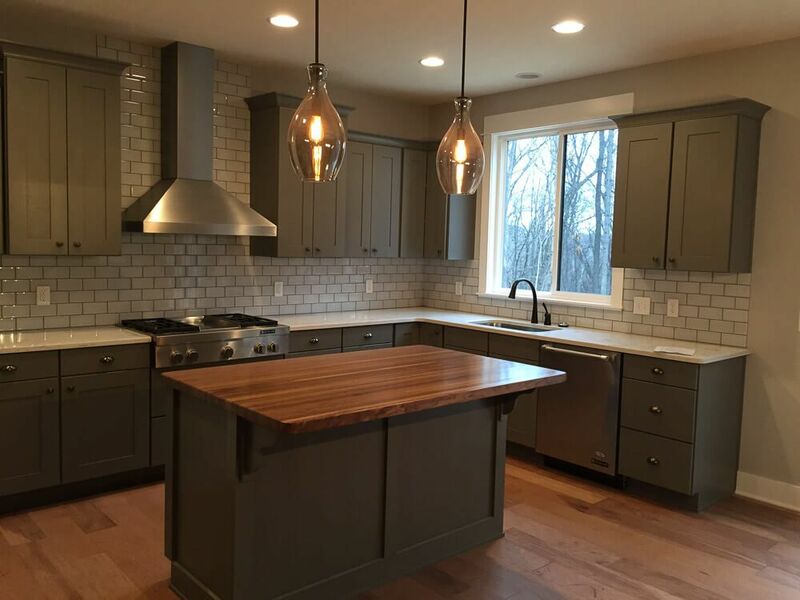 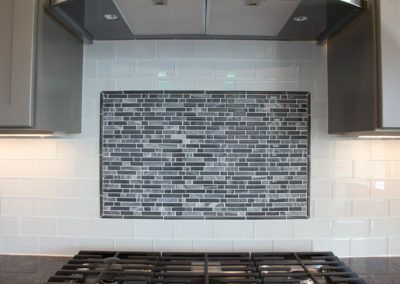 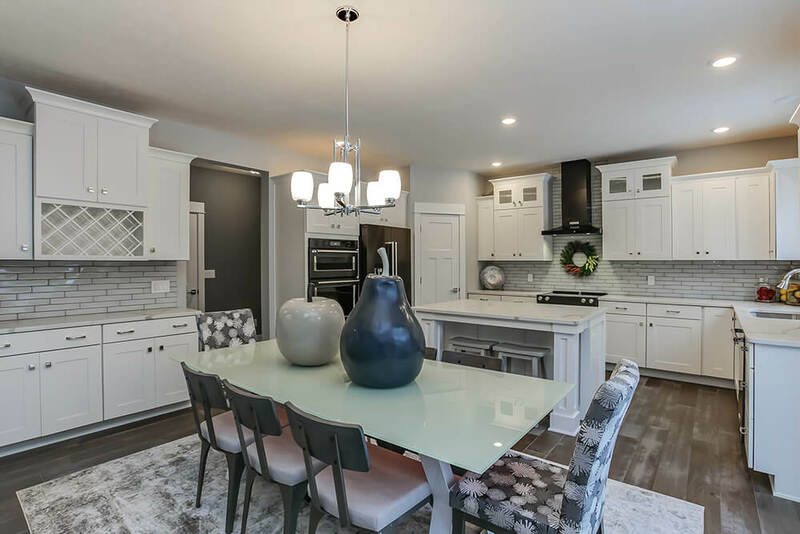 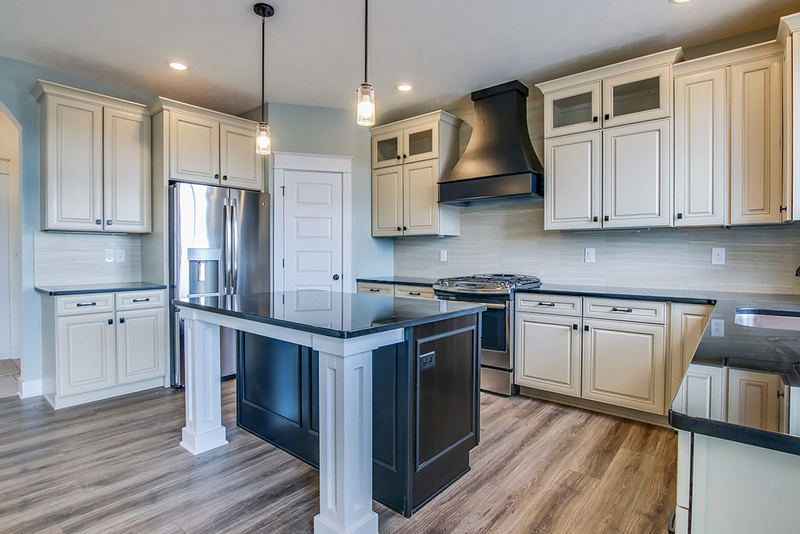 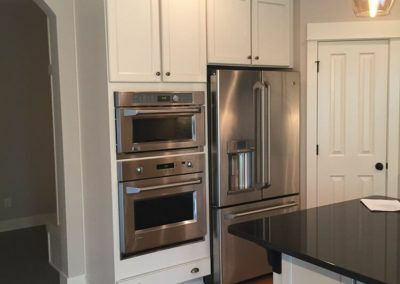 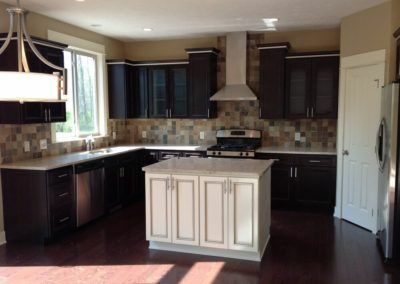 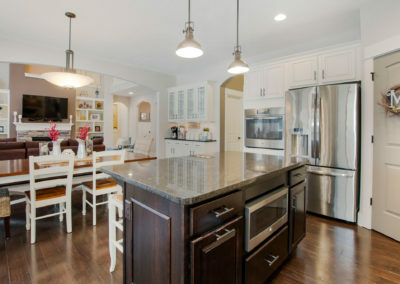 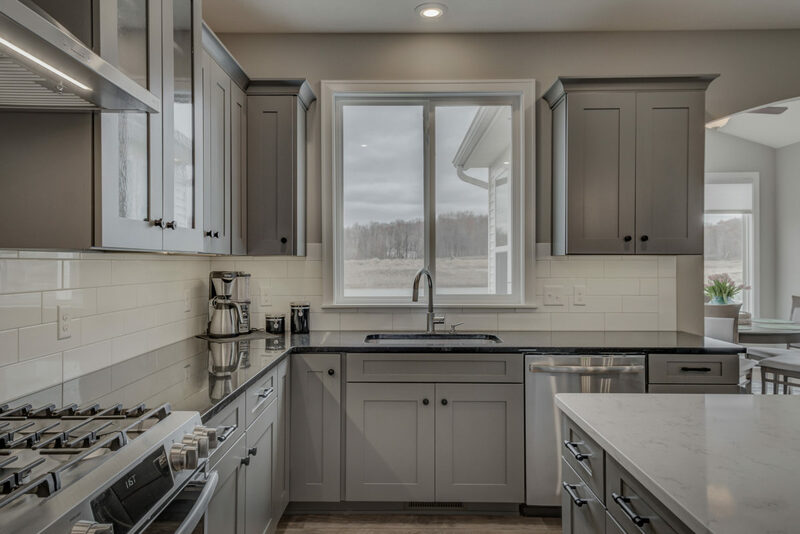 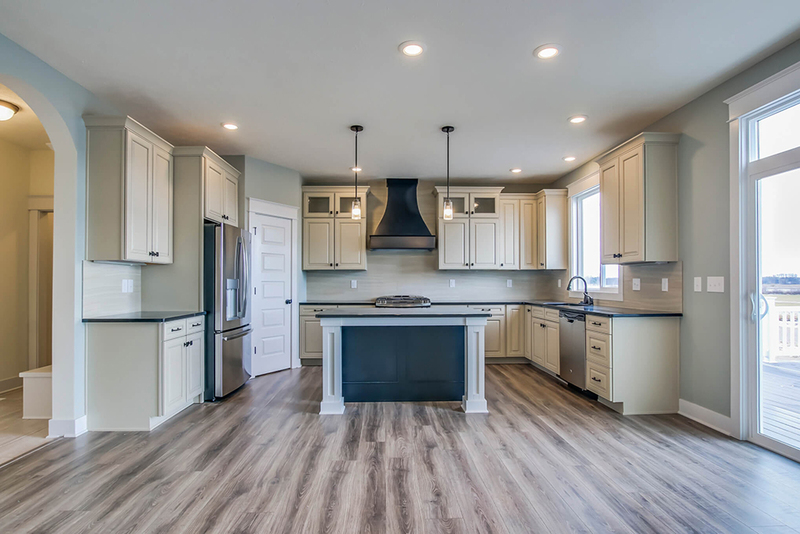 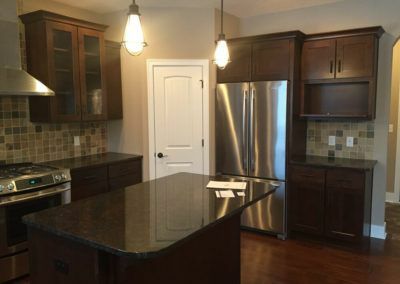 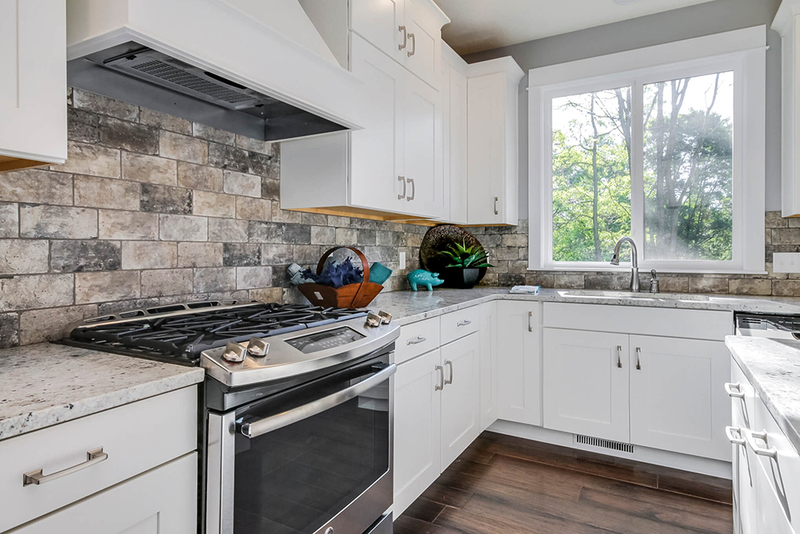 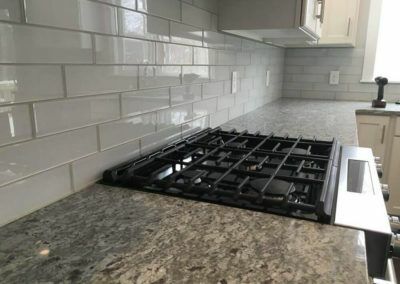 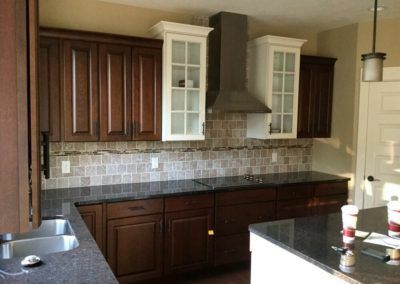 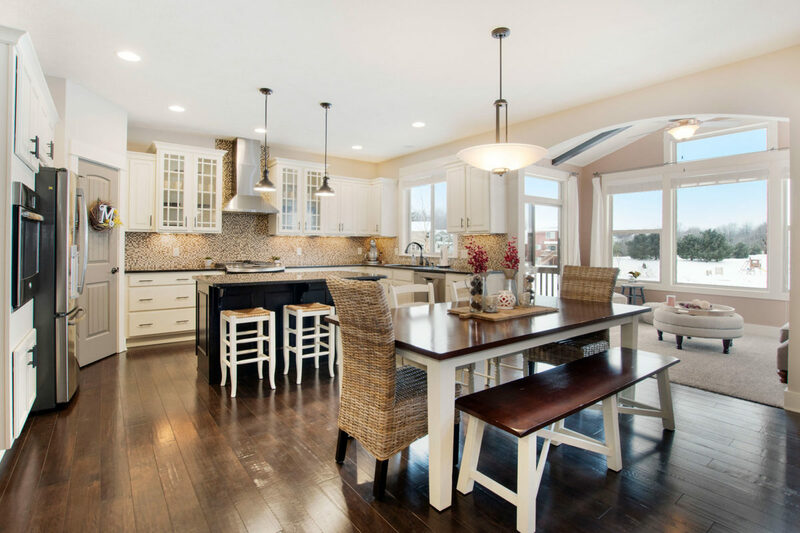 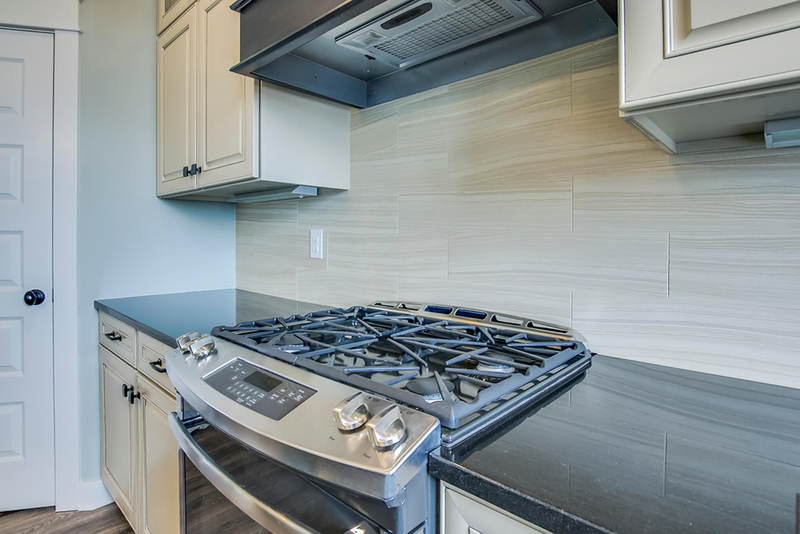 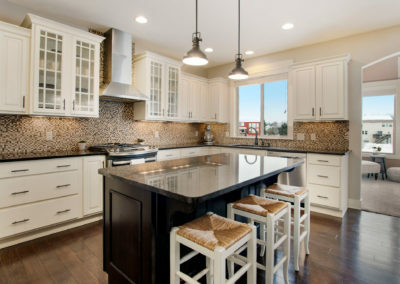 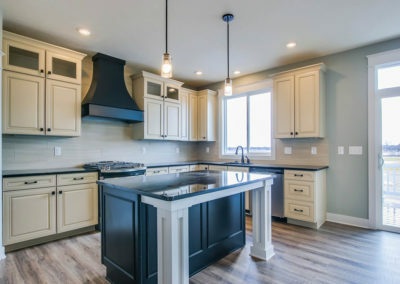 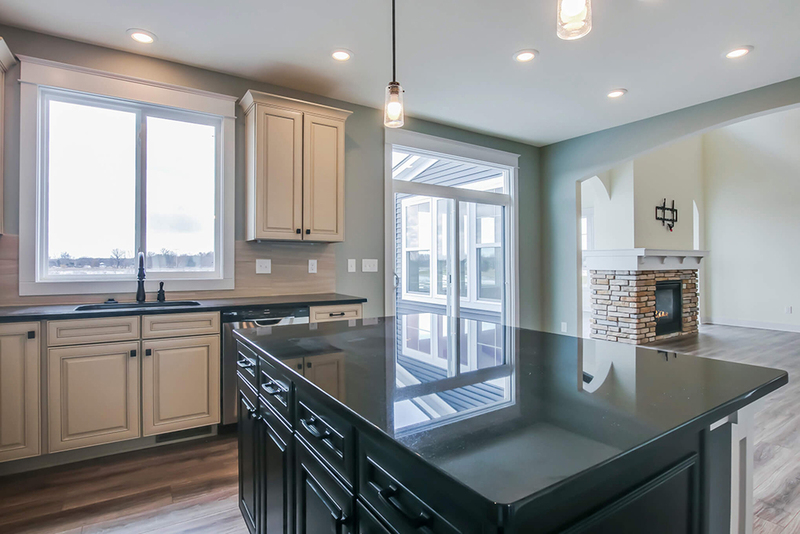 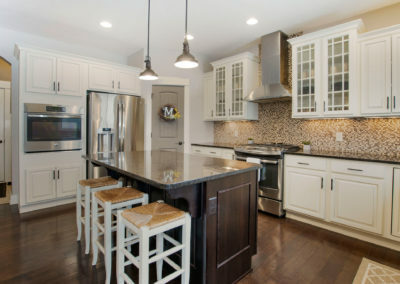 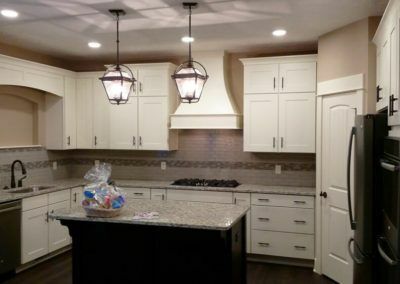 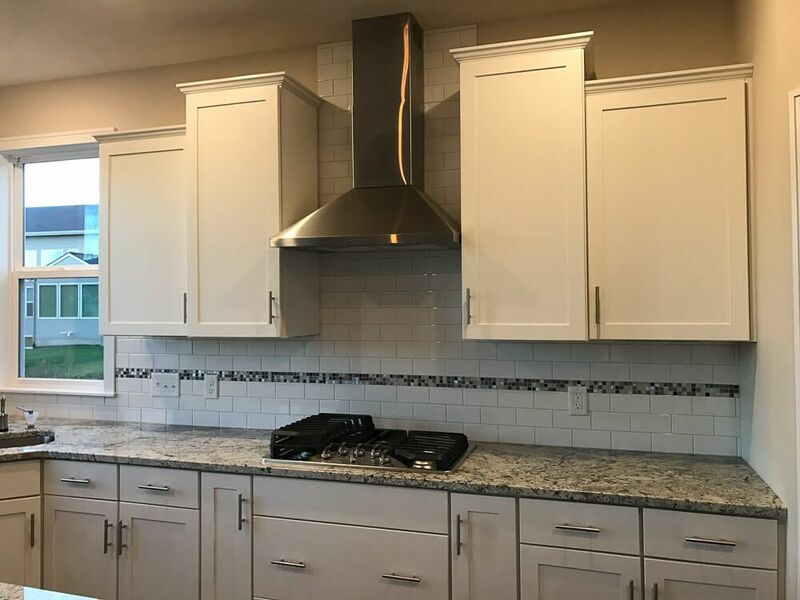 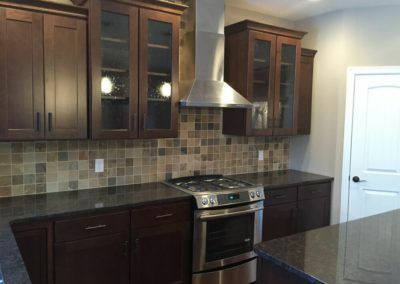 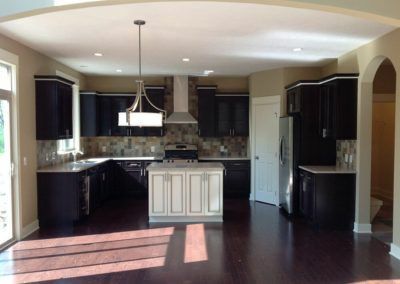 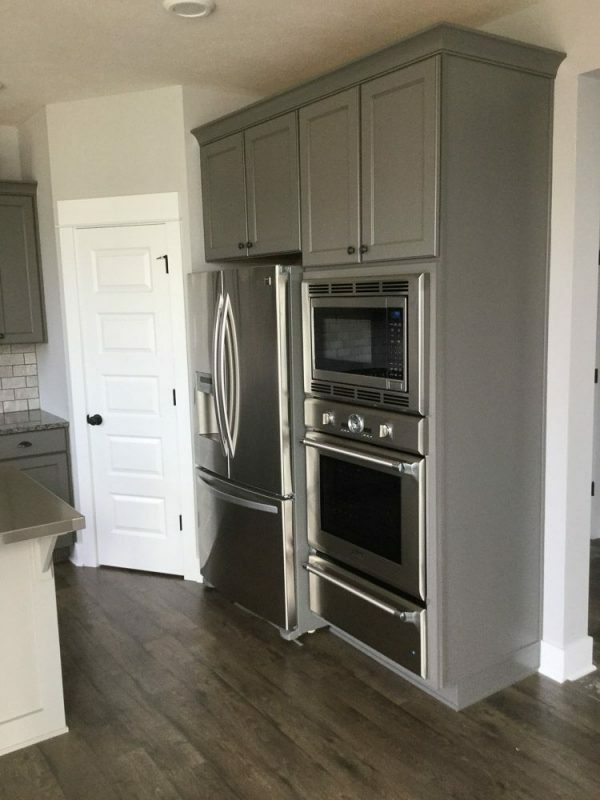 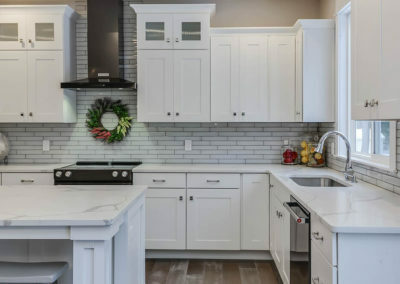 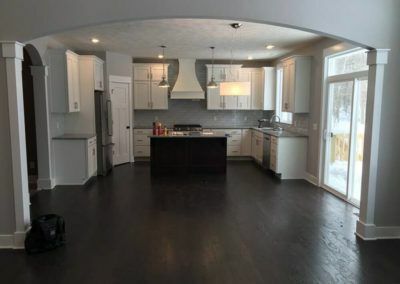 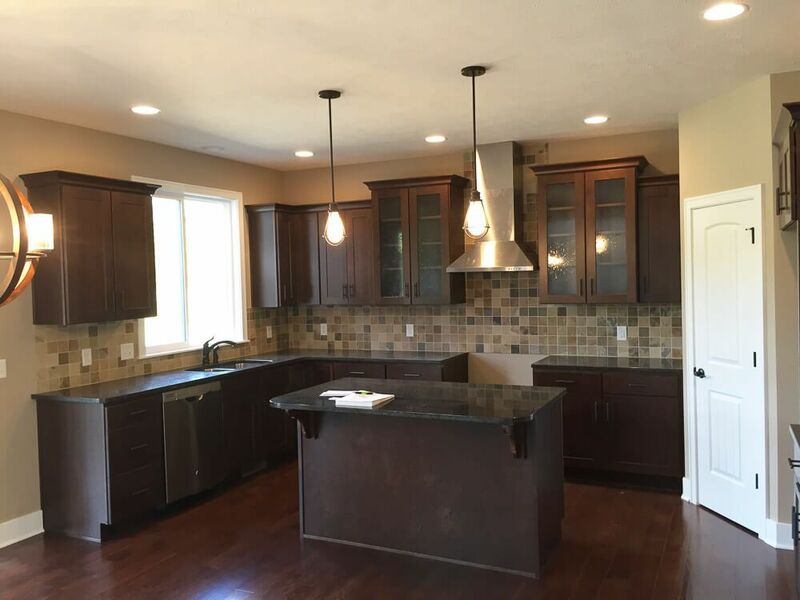 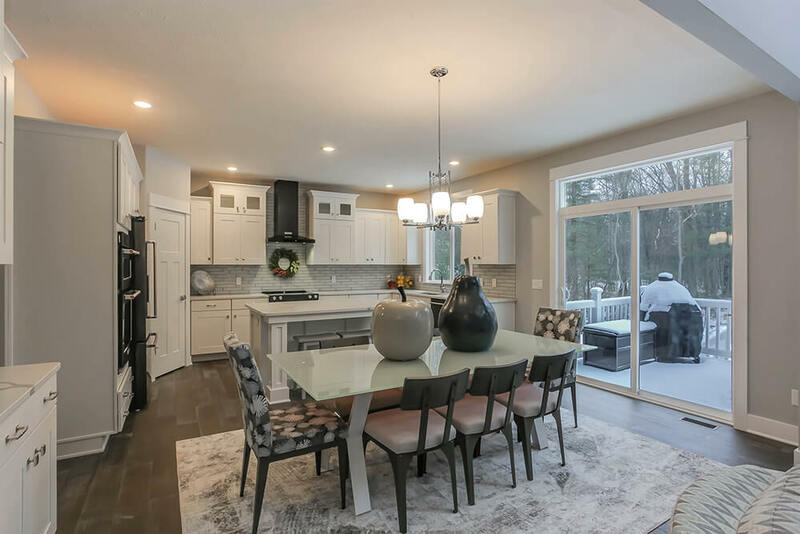 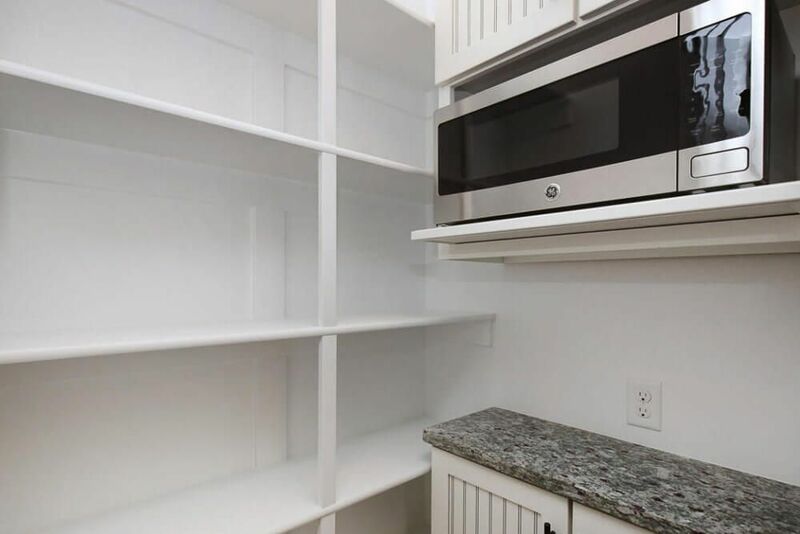 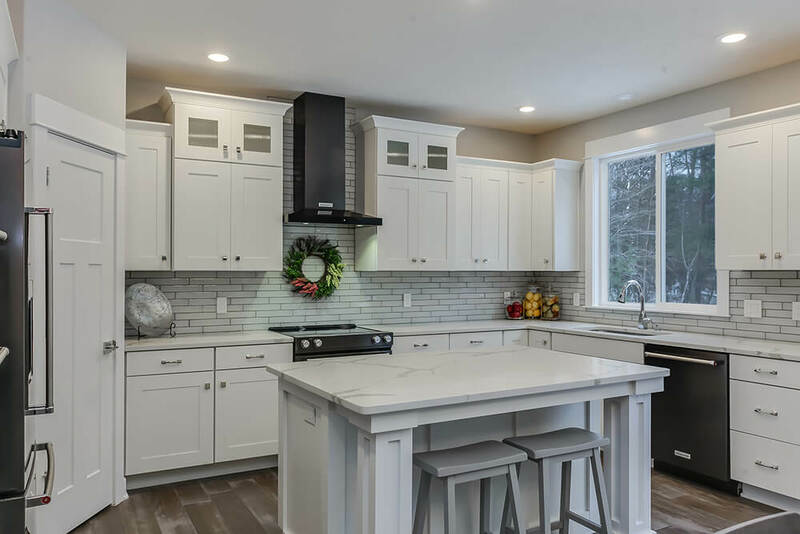 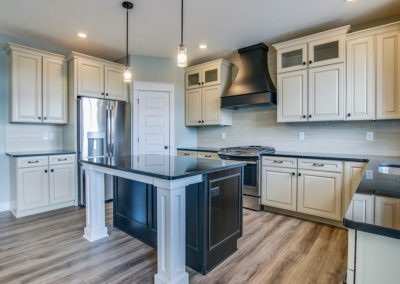 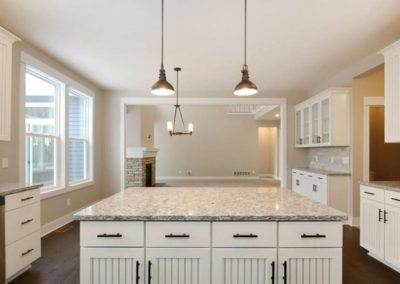 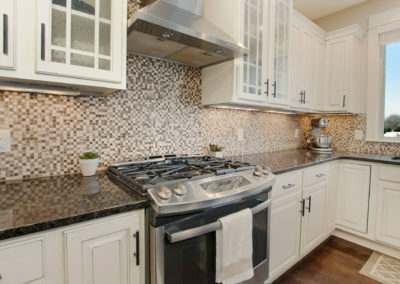 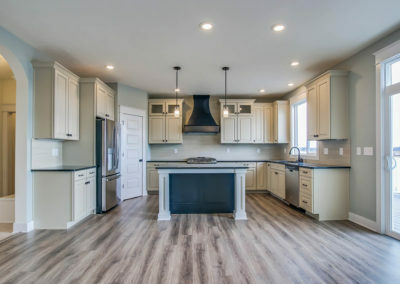 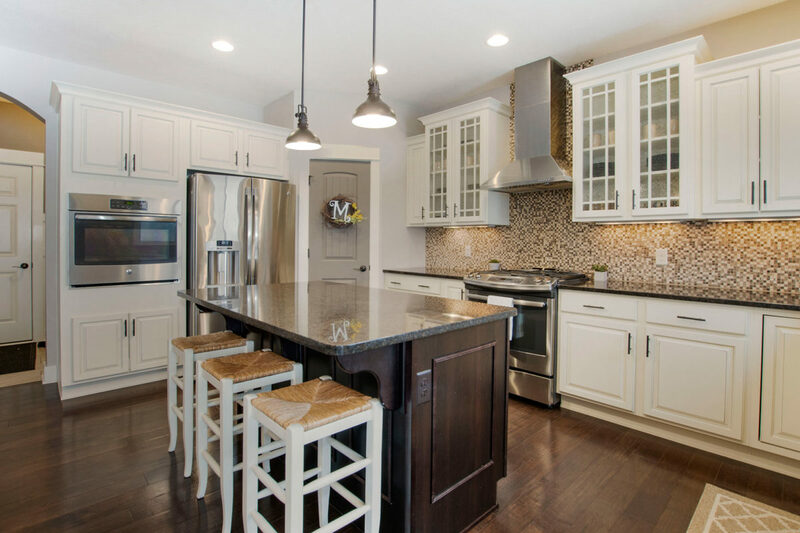 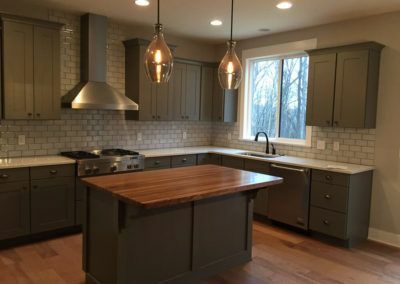 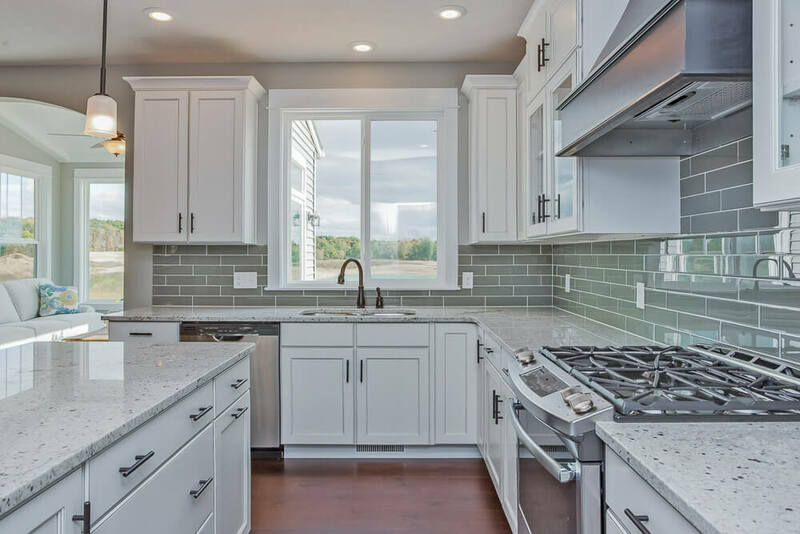 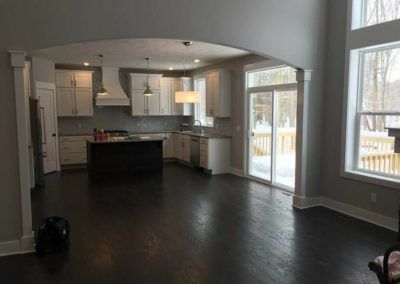 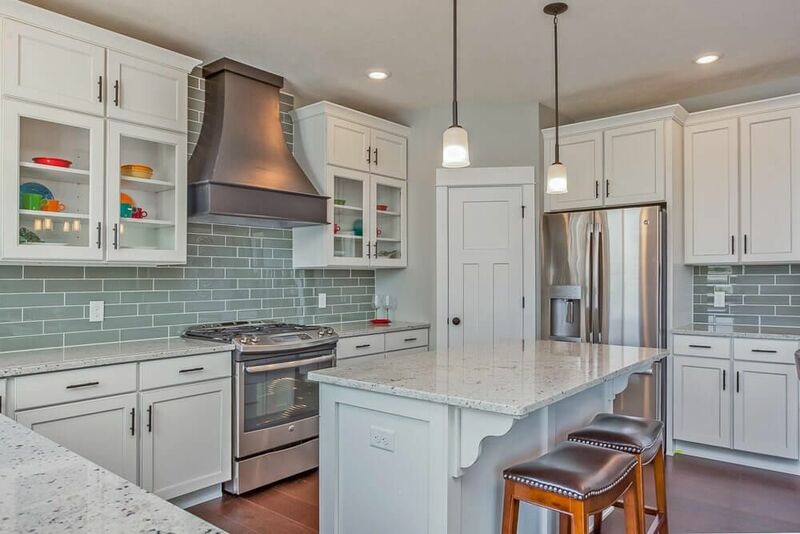 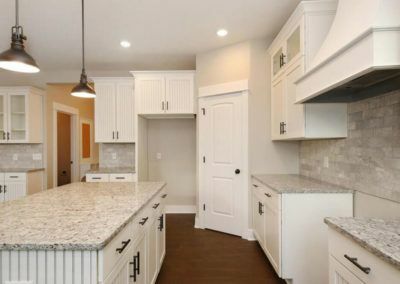 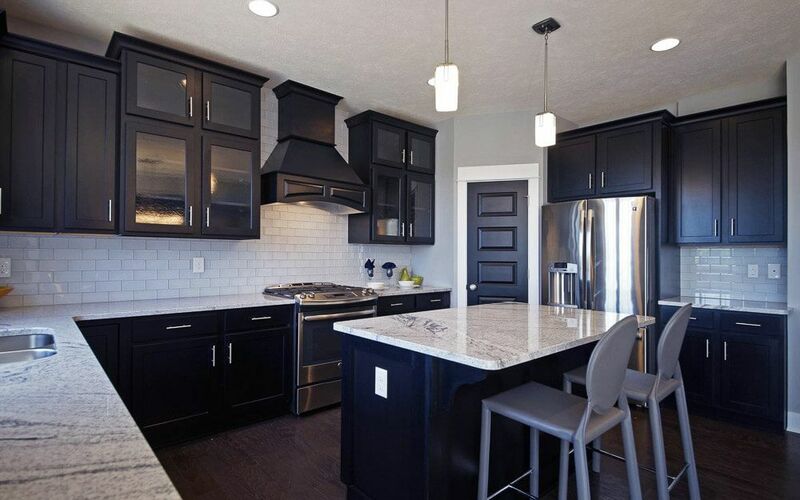 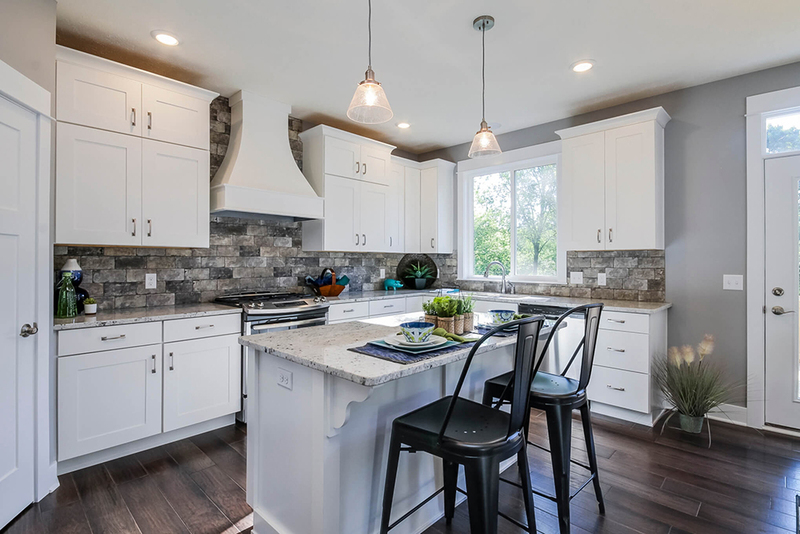 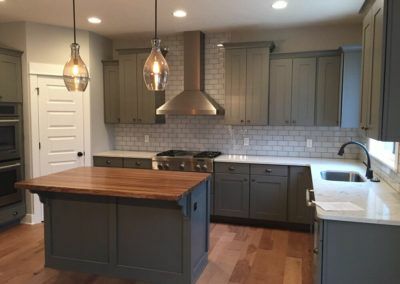 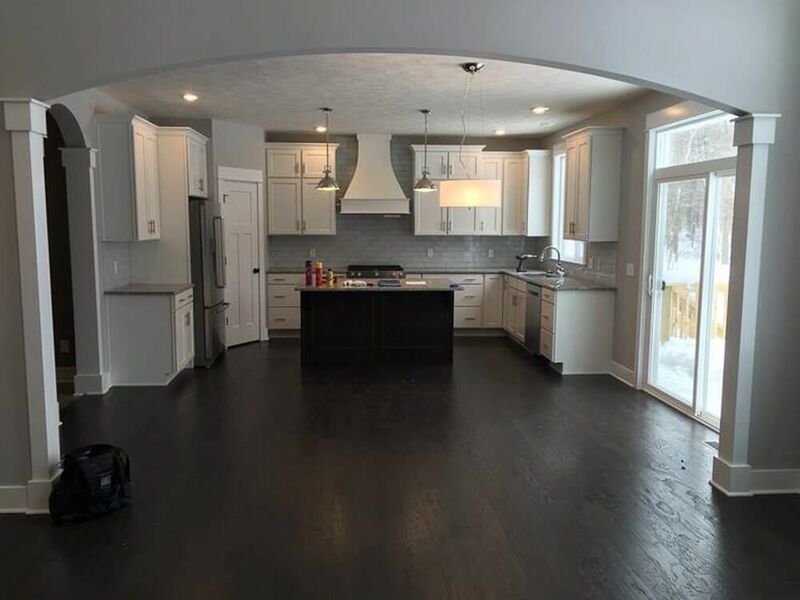 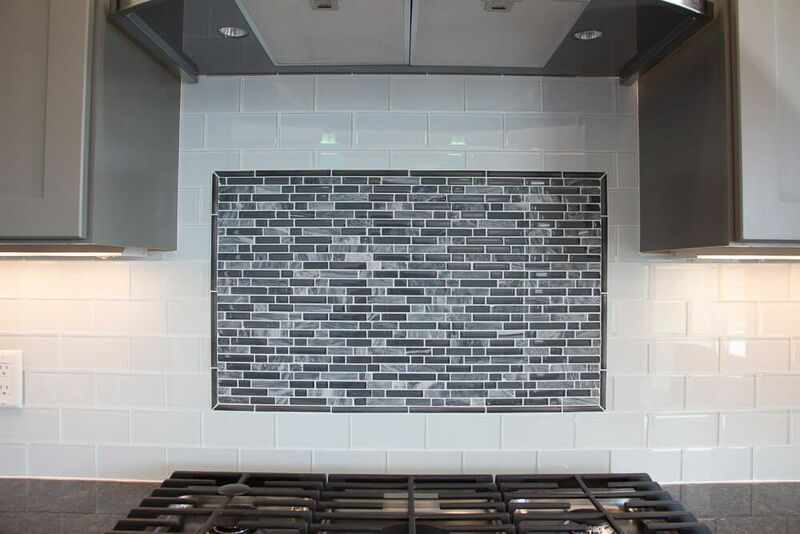 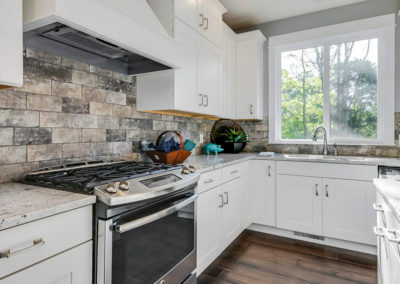 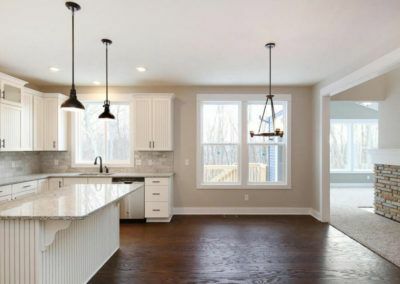 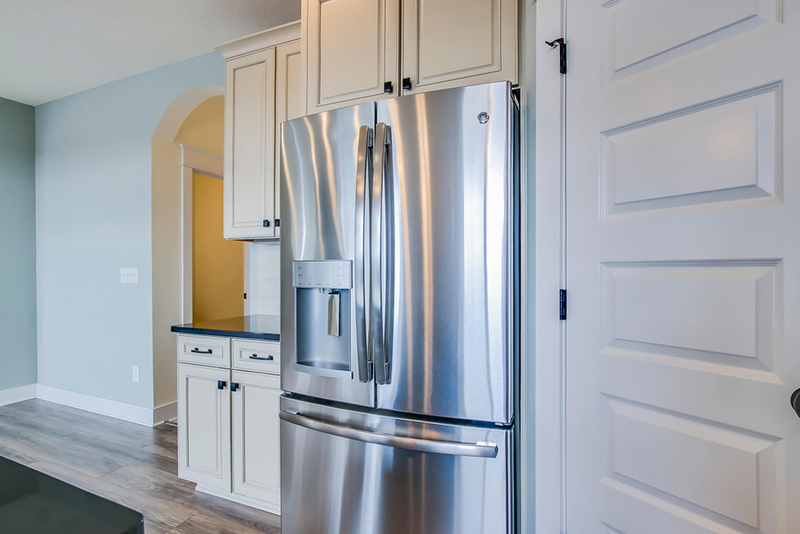 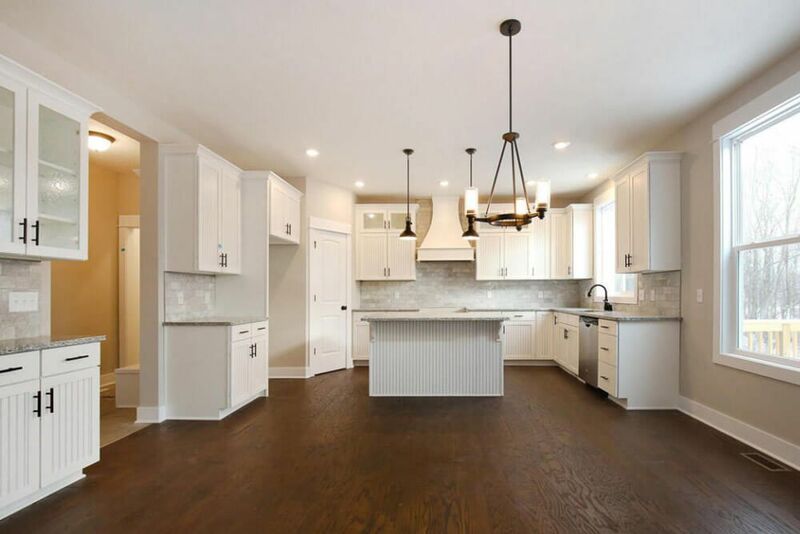 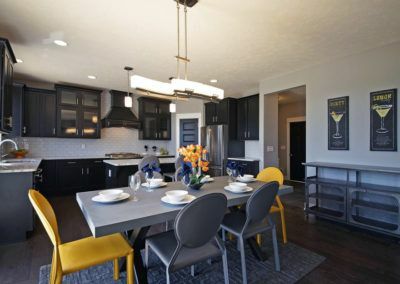 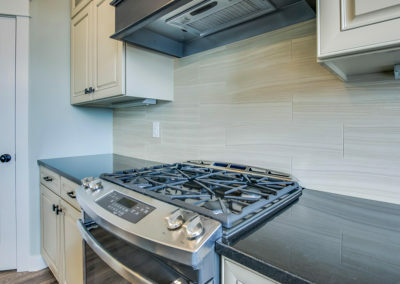 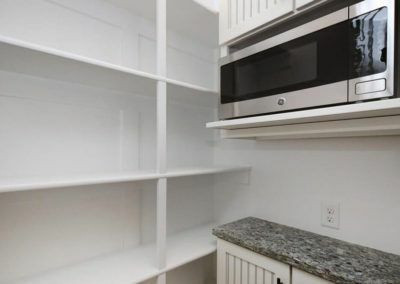 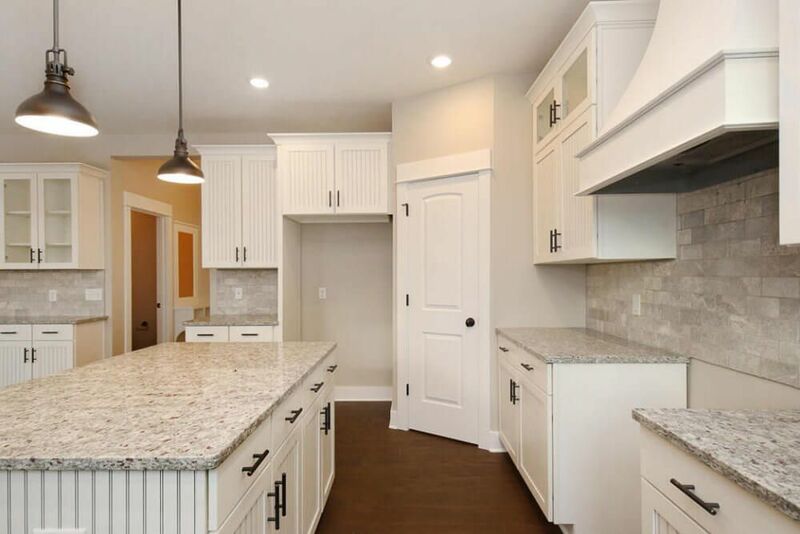 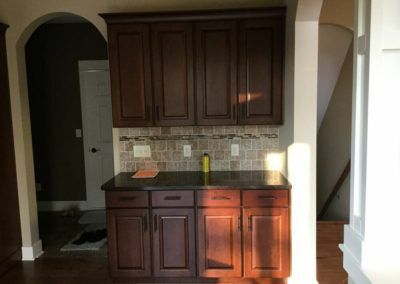 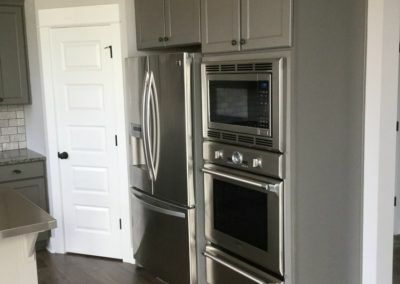 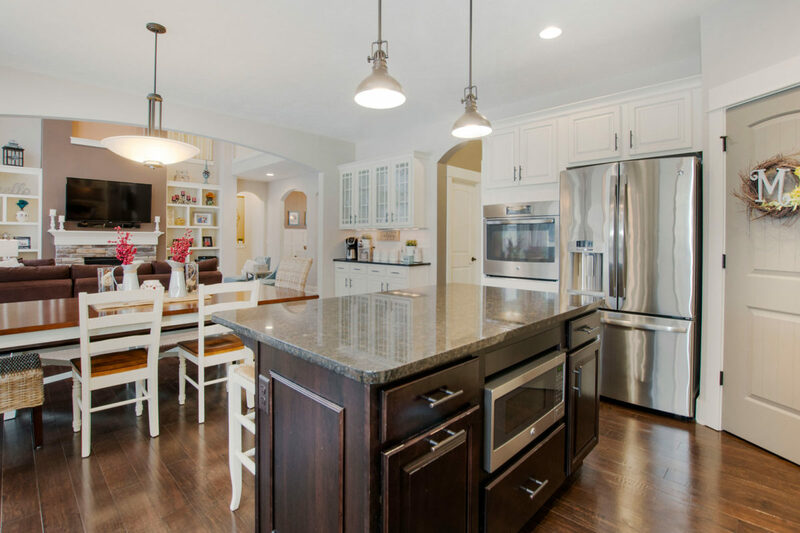 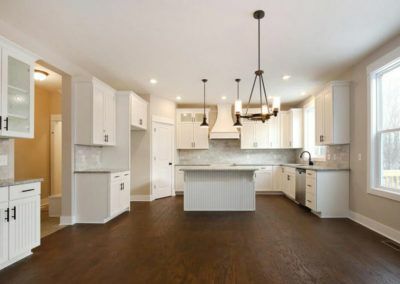 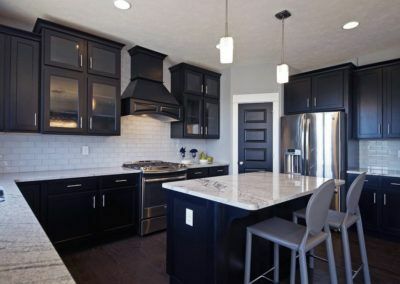 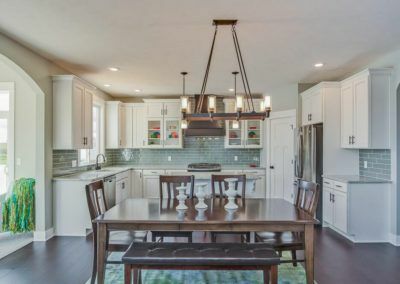 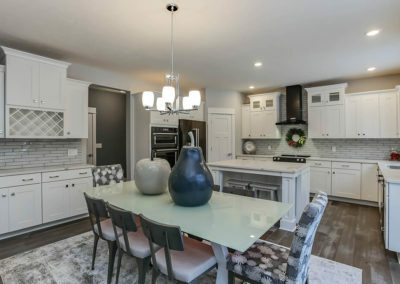 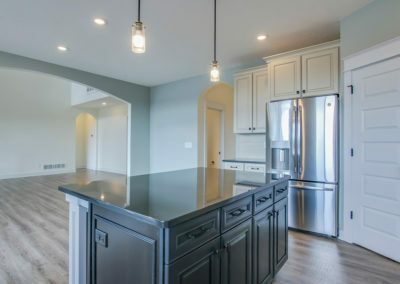 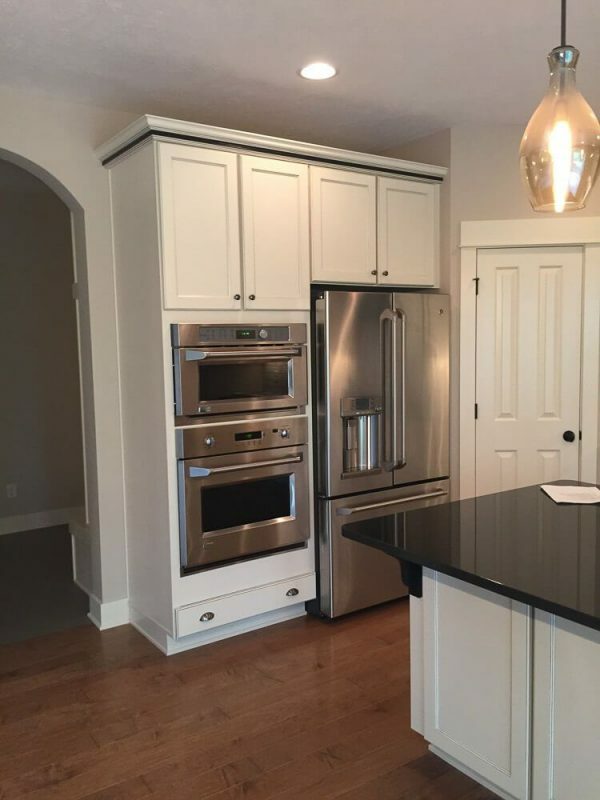 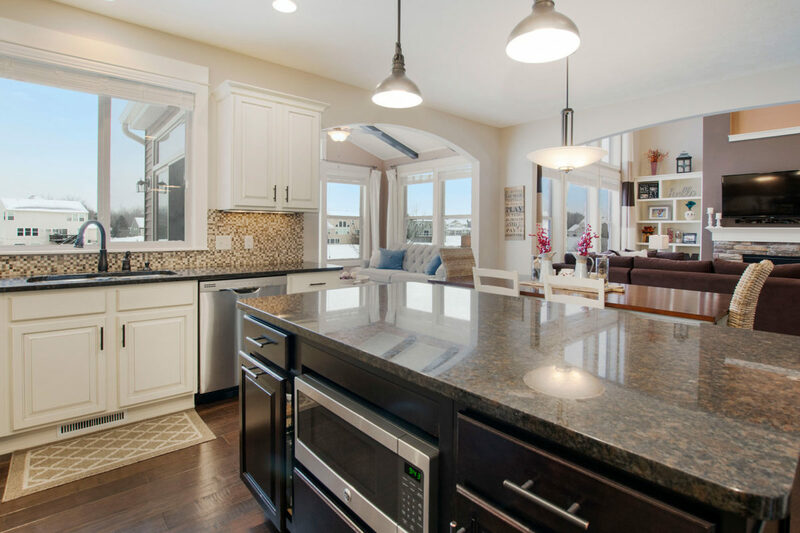 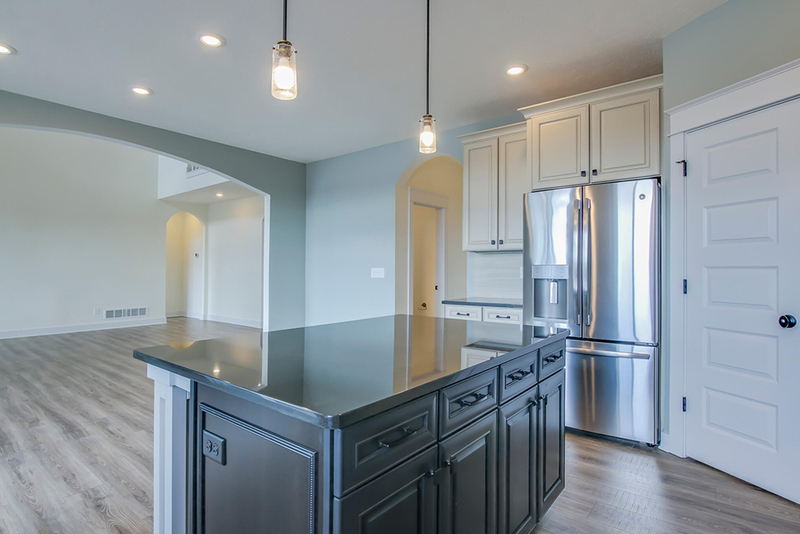 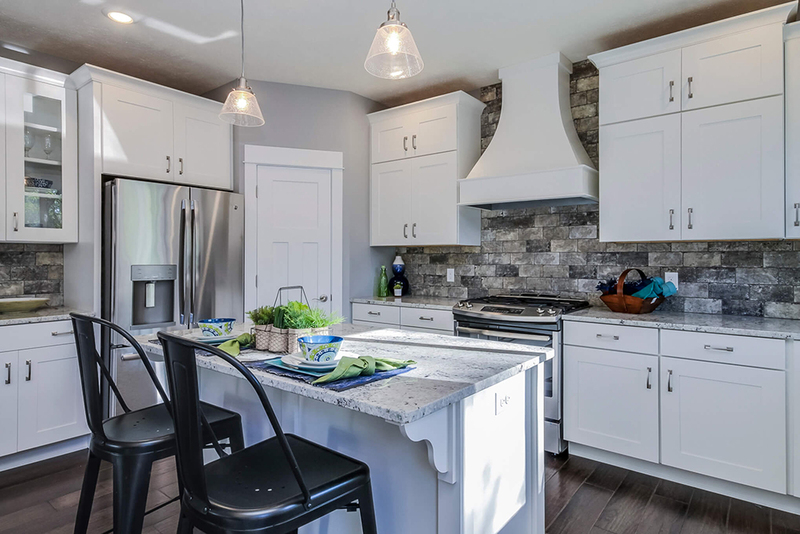 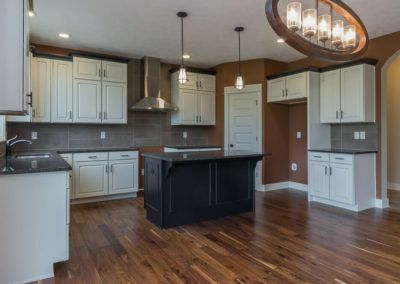 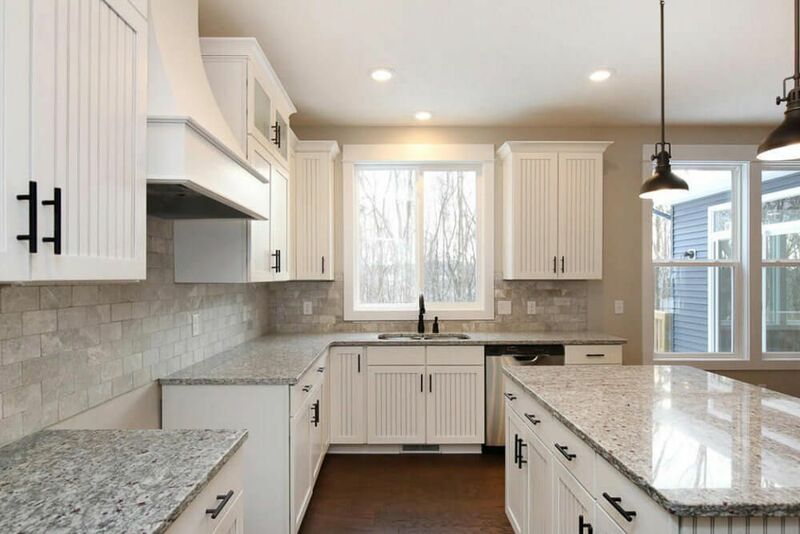 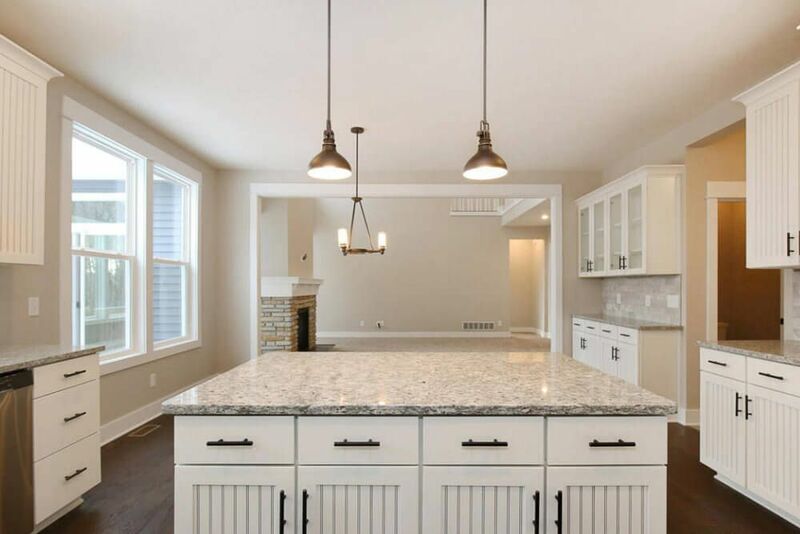 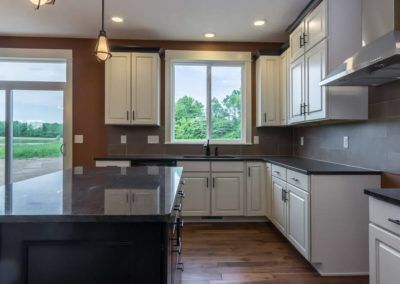 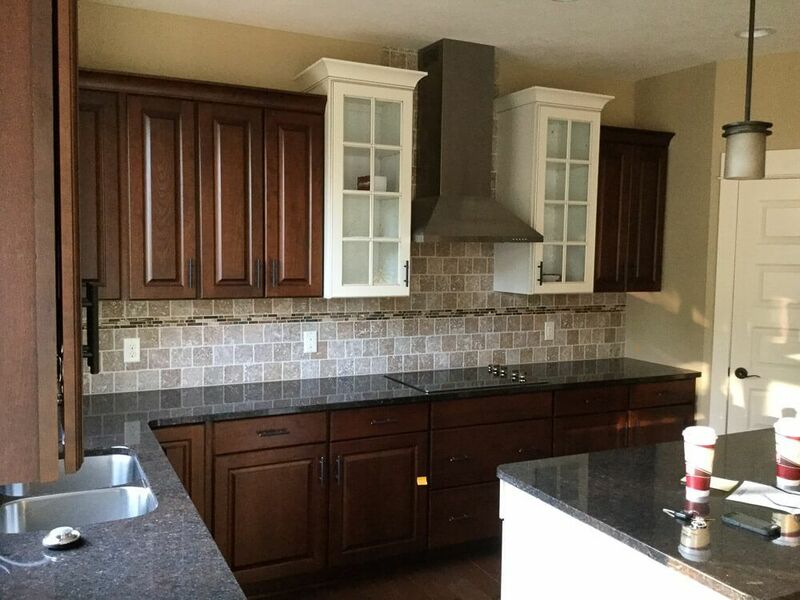 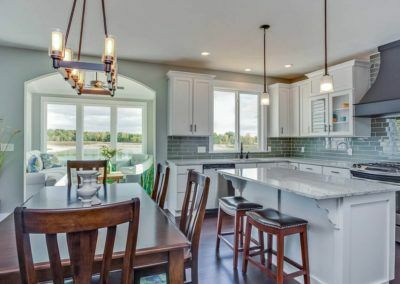 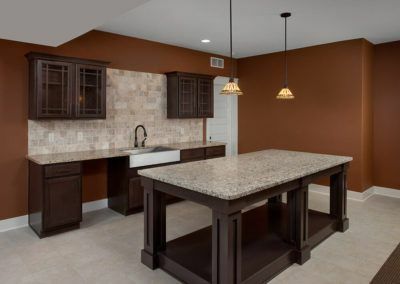 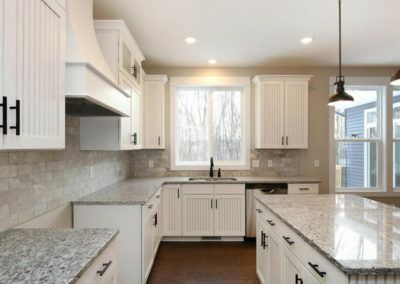 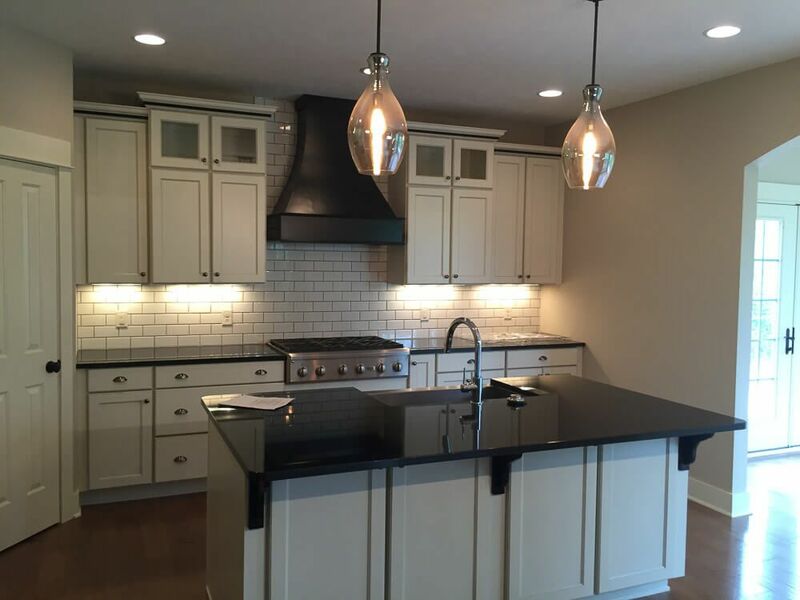 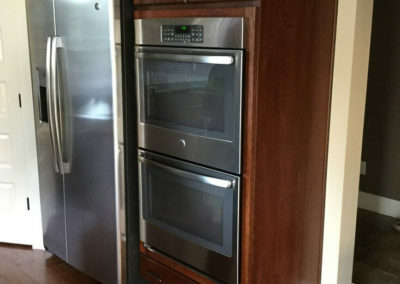 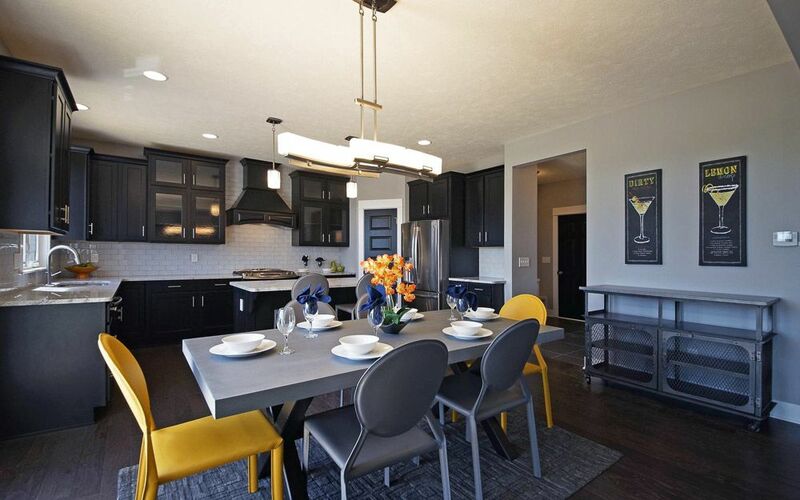 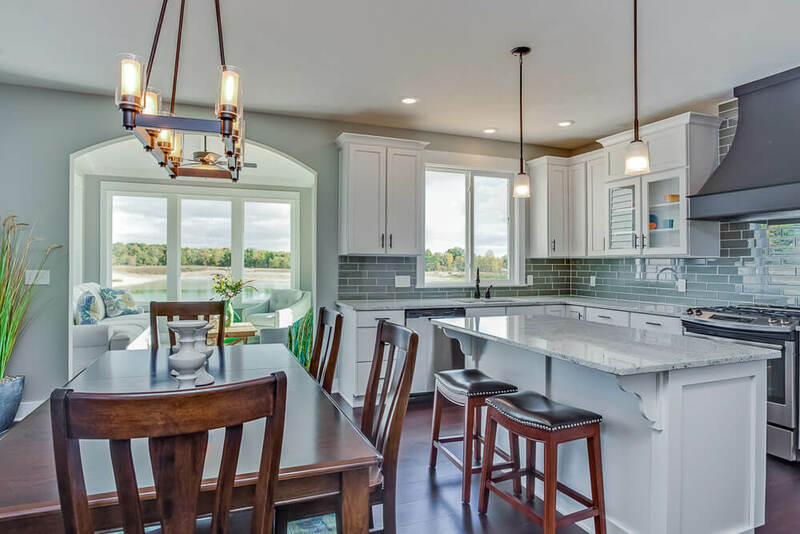 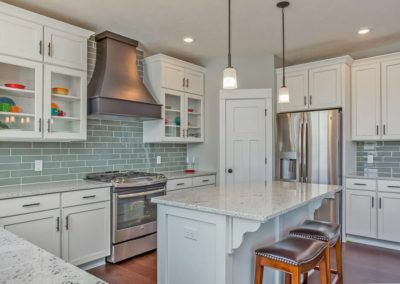 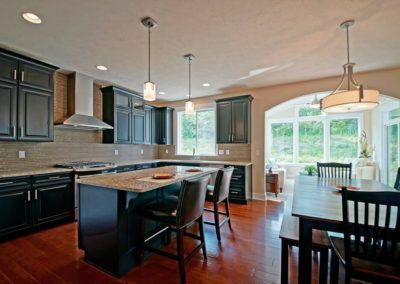 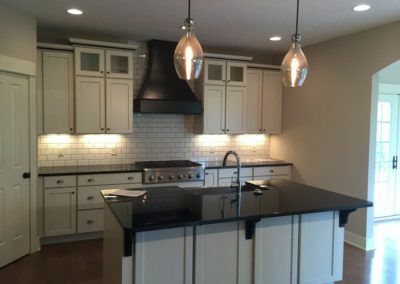 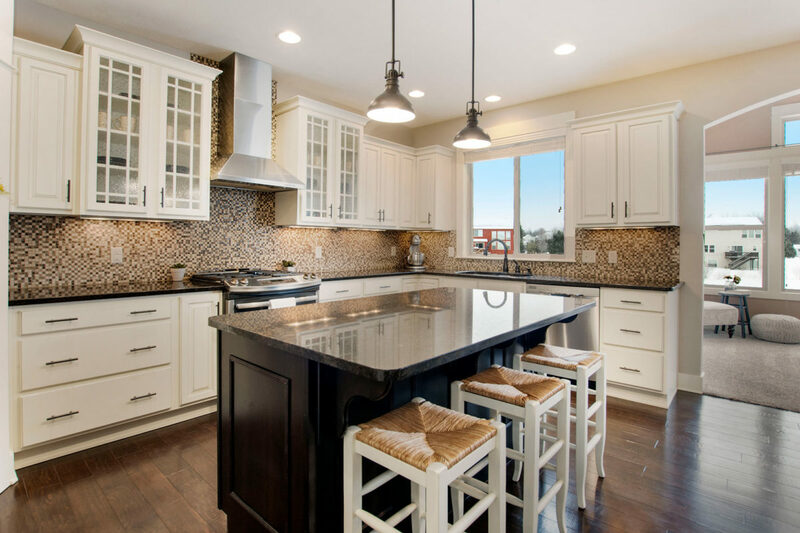 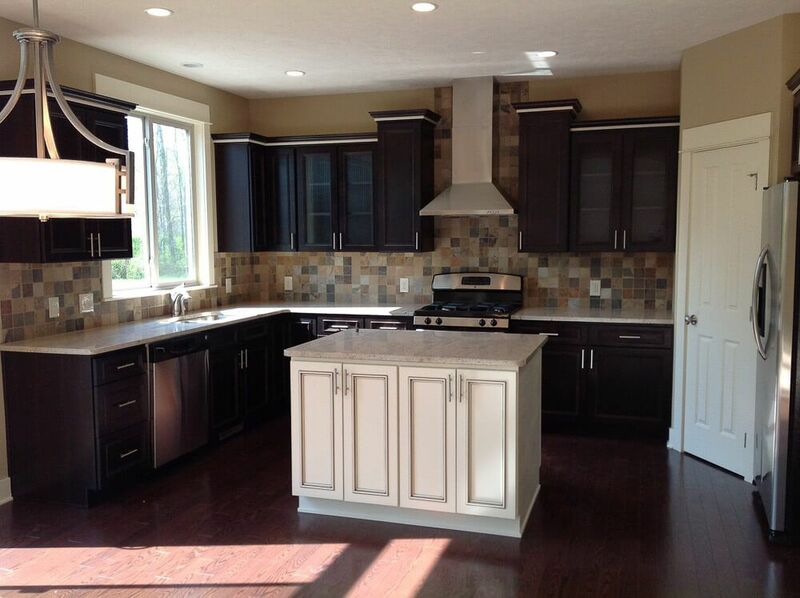 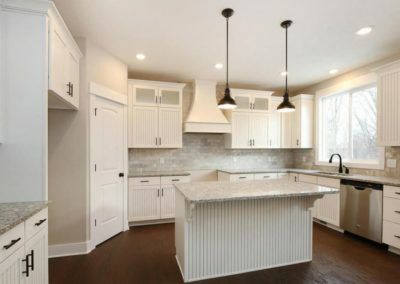 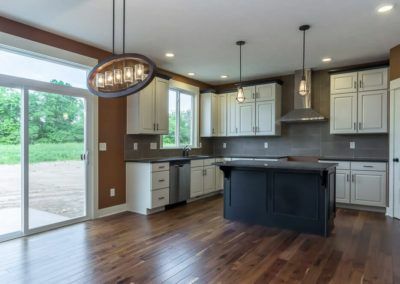 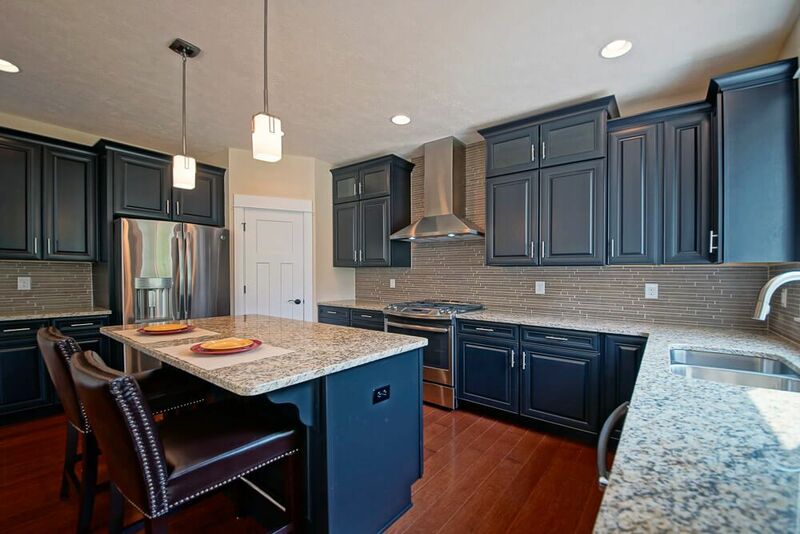 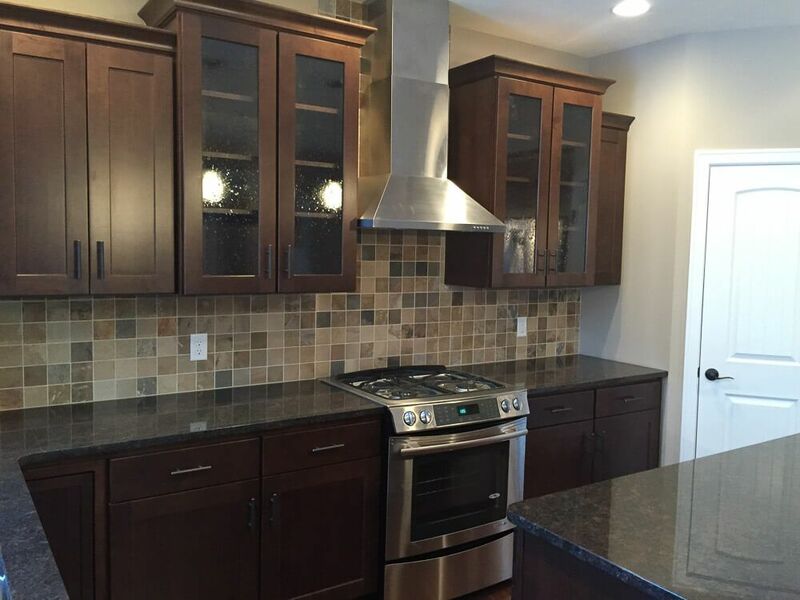 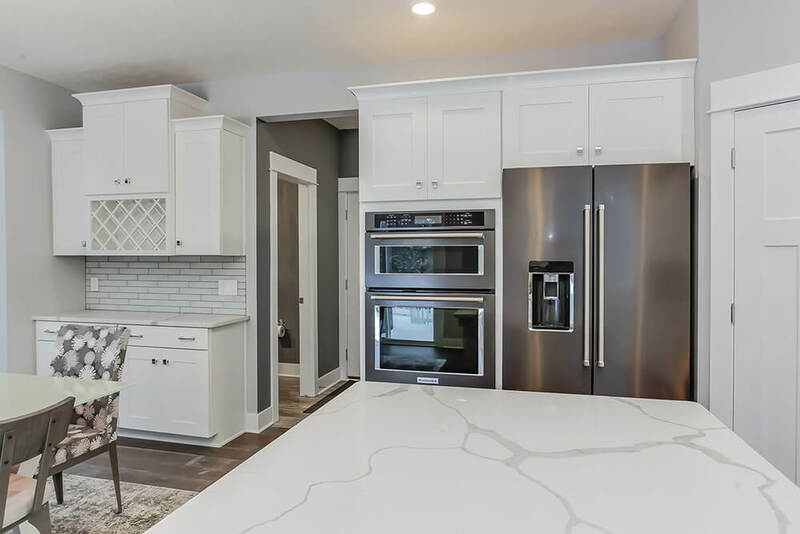 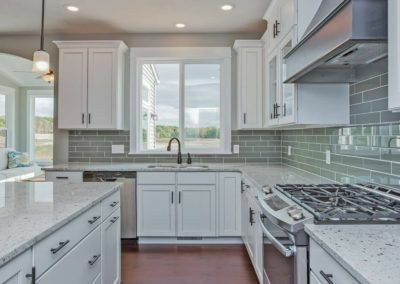 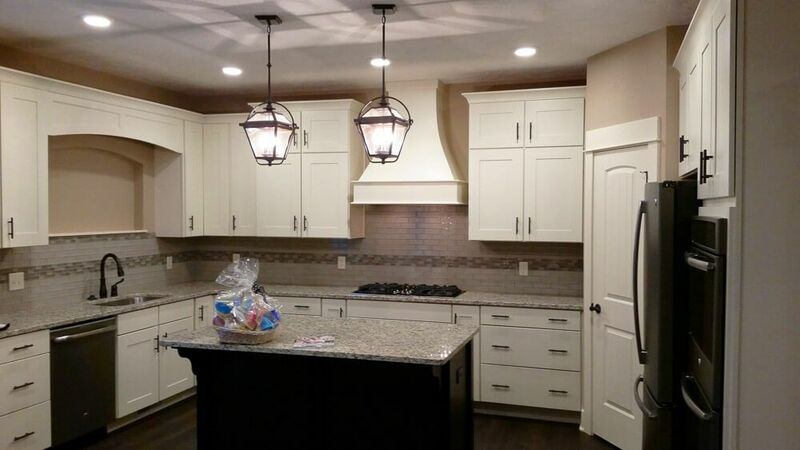 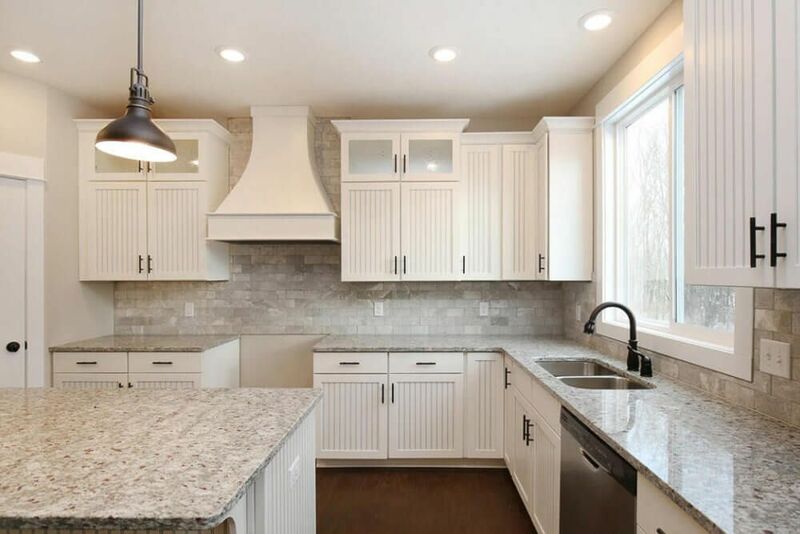 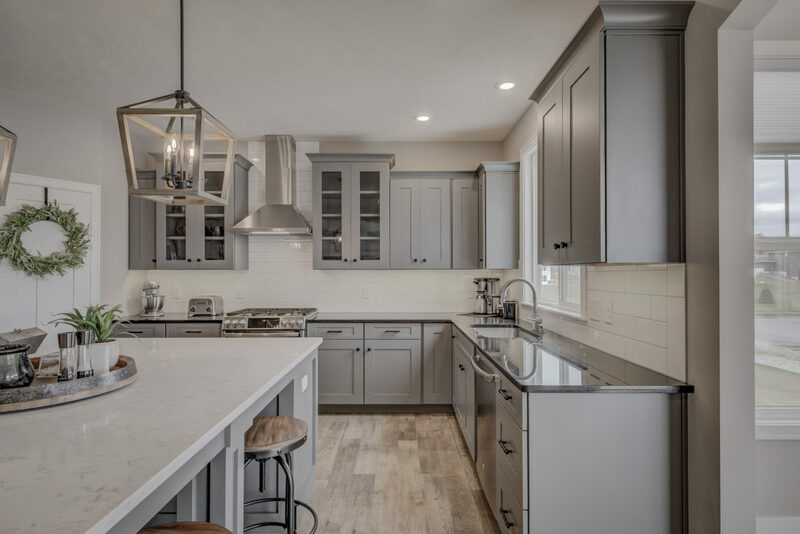 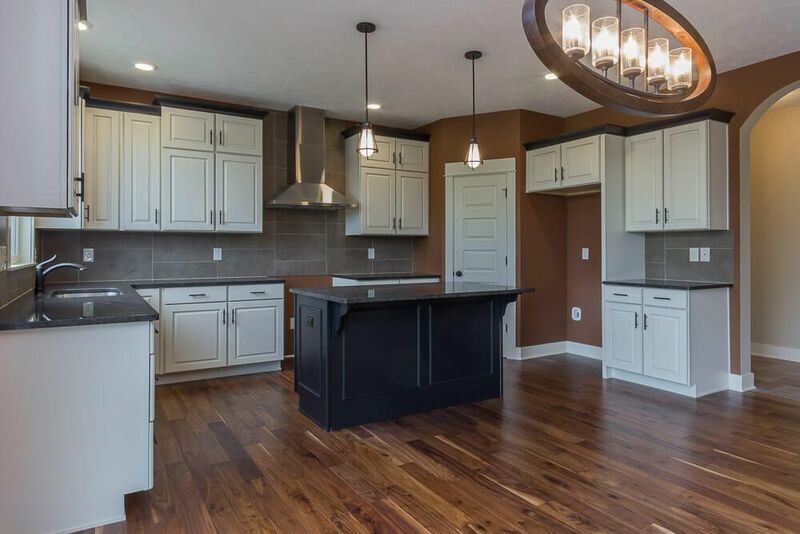 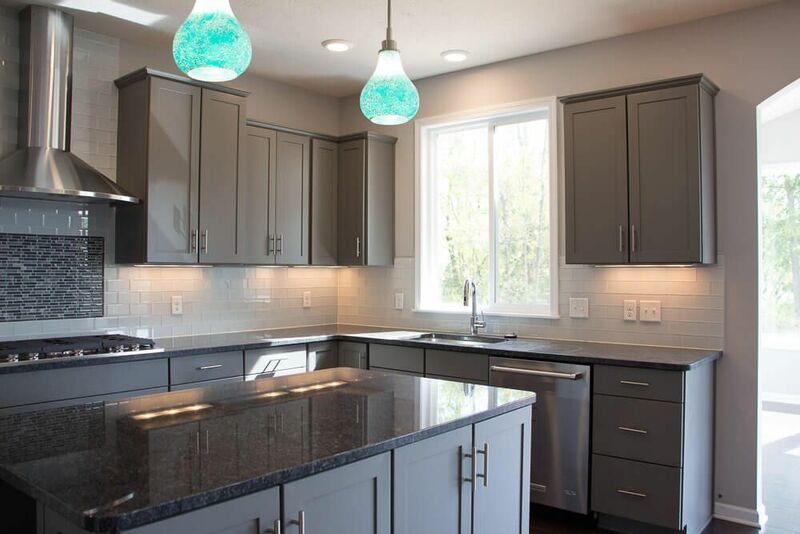 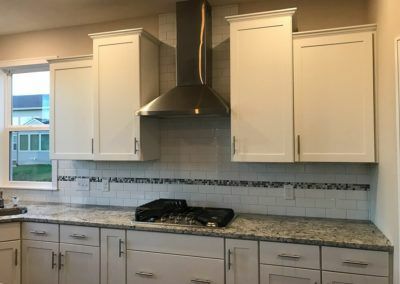 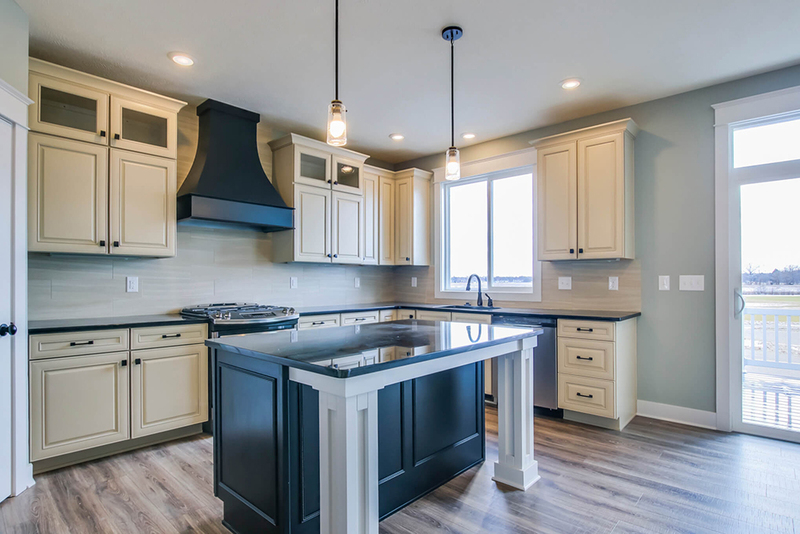 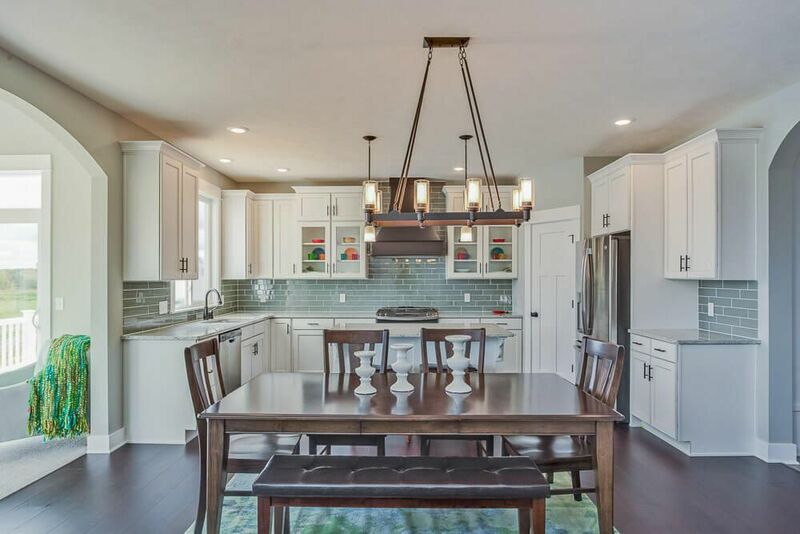 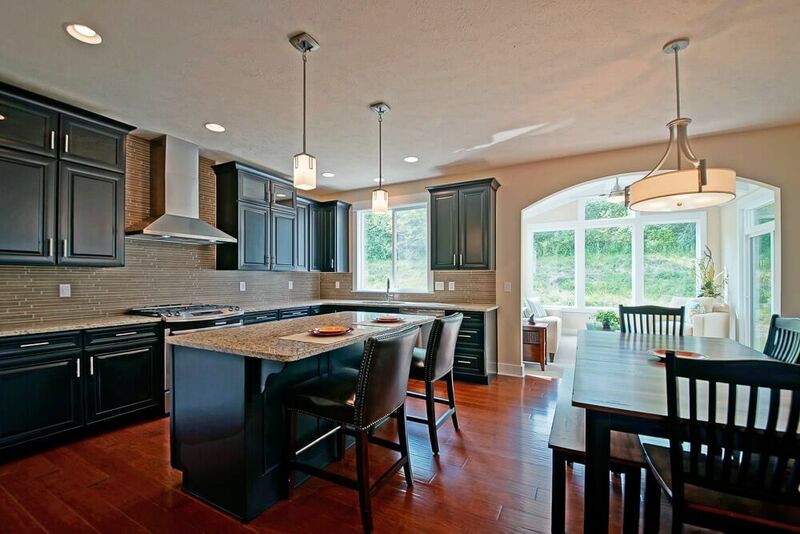 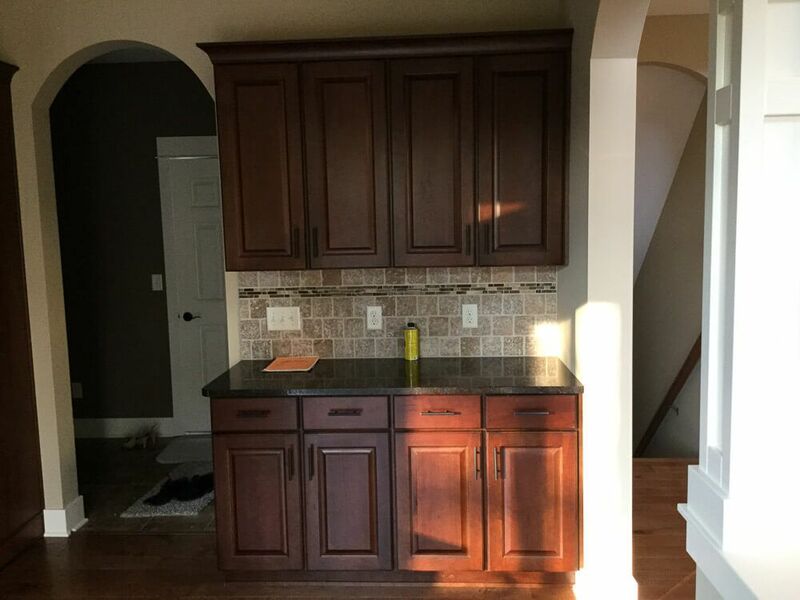 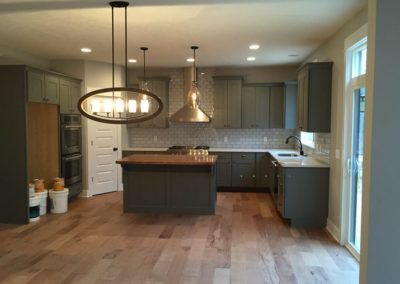 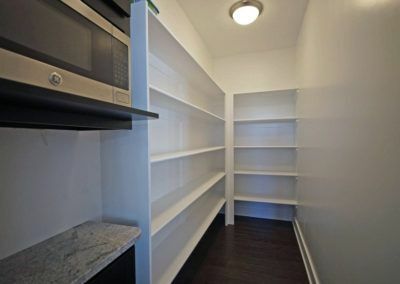 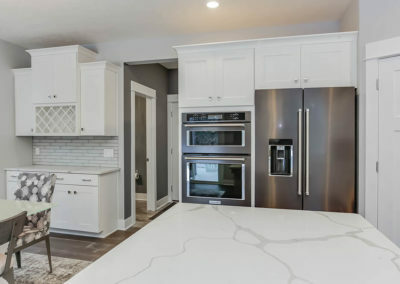 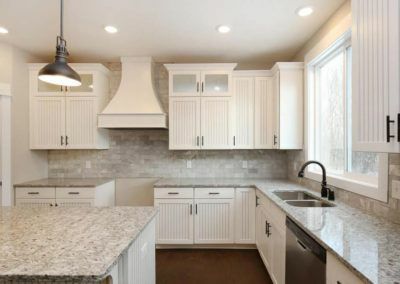 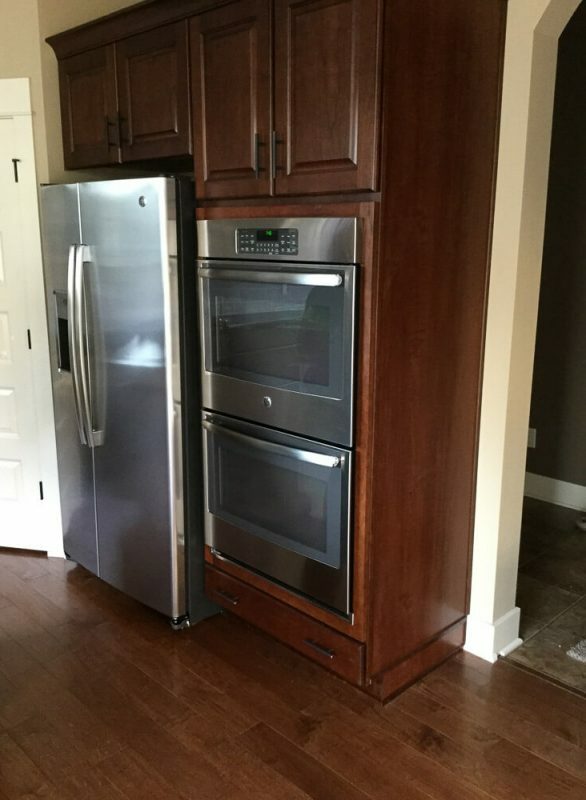 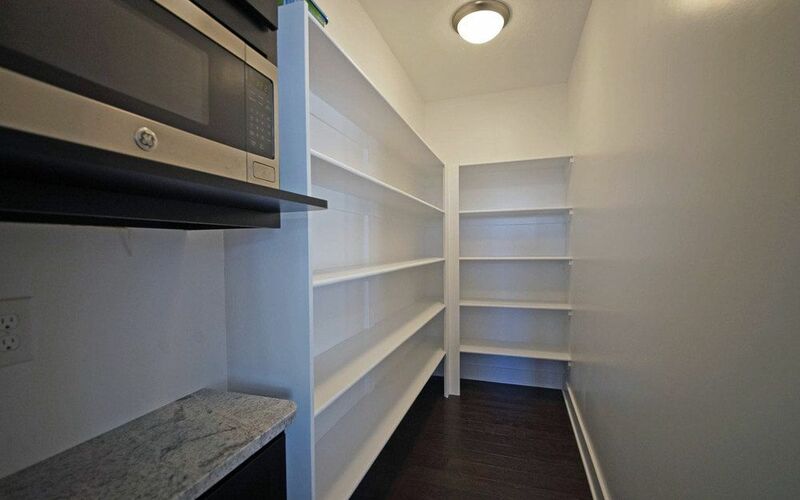 The kitchen offers a large central island, a walk-in pantry, and lots of cabinets and counter space. 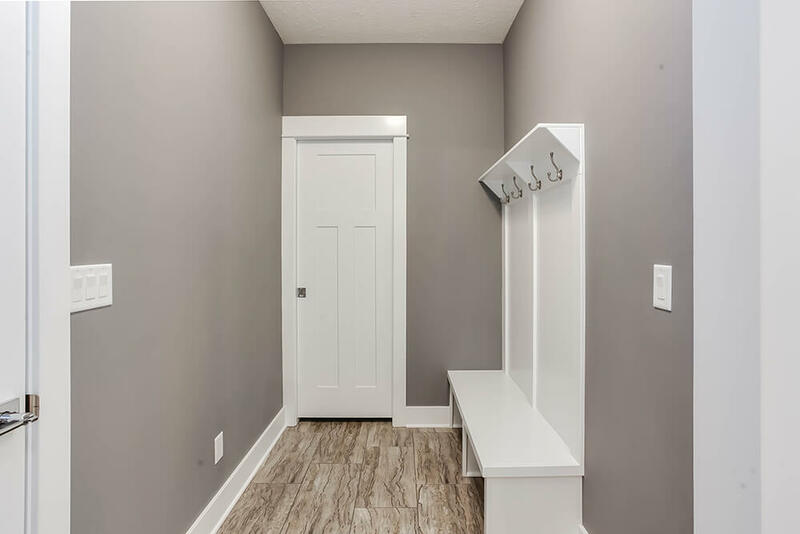 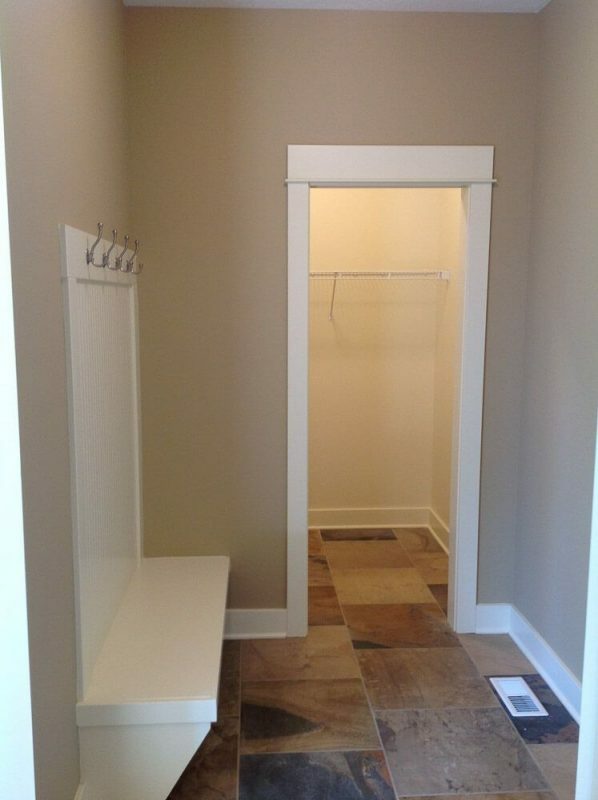 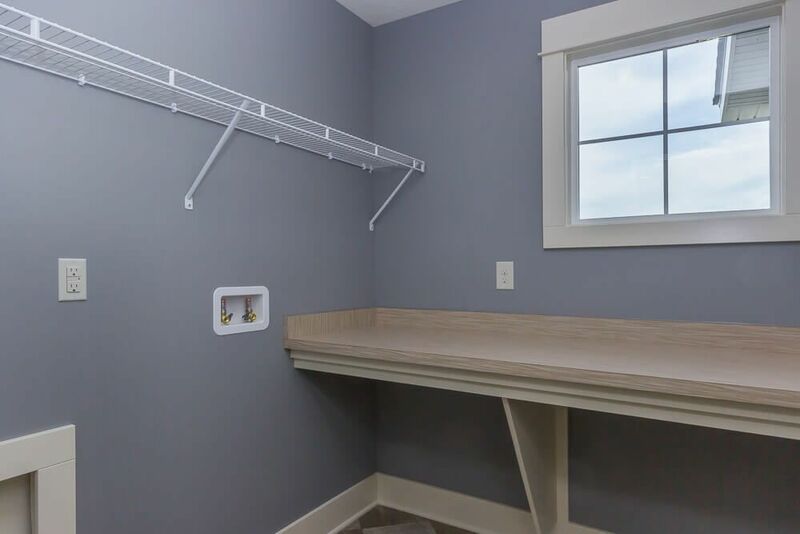 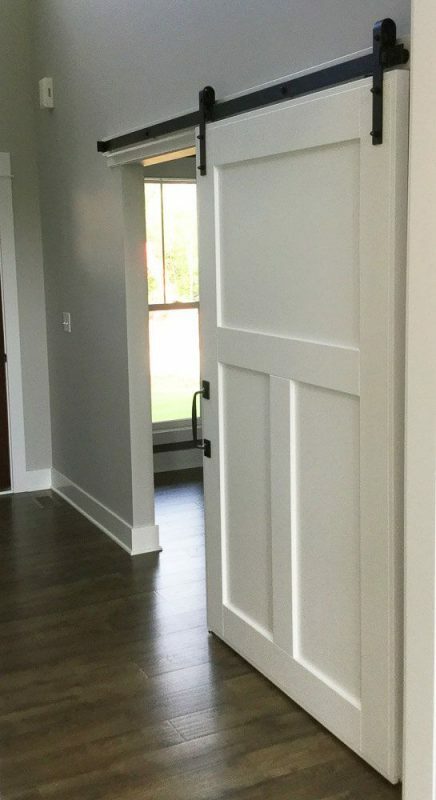 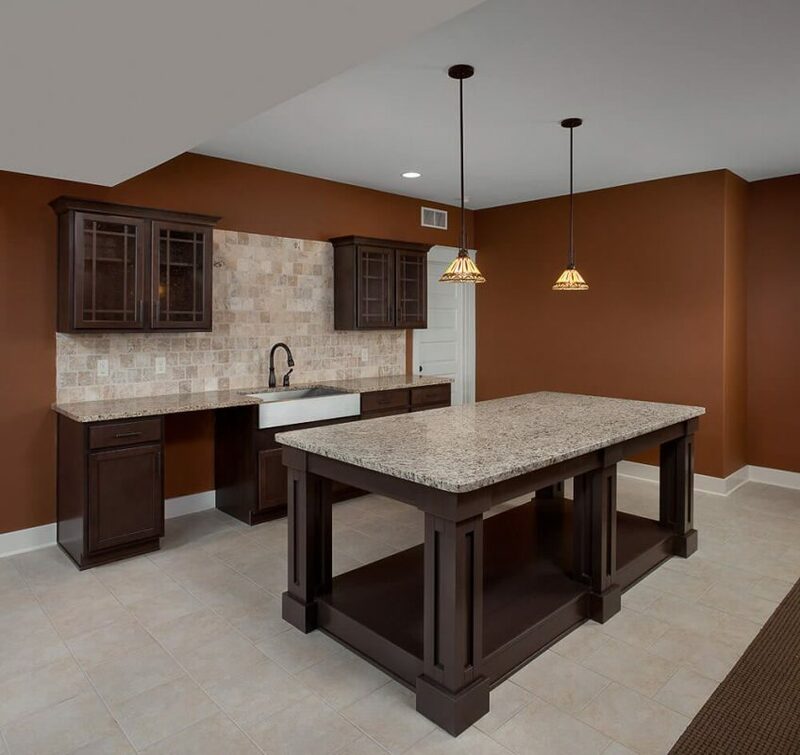 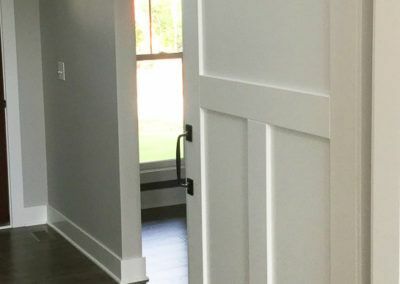 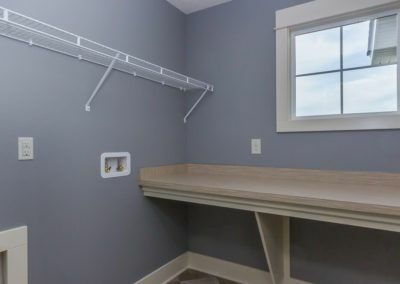 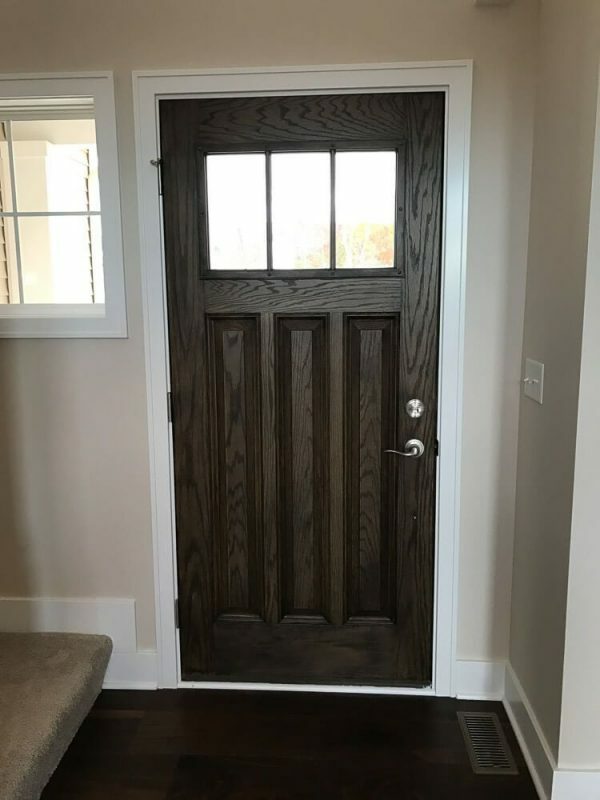 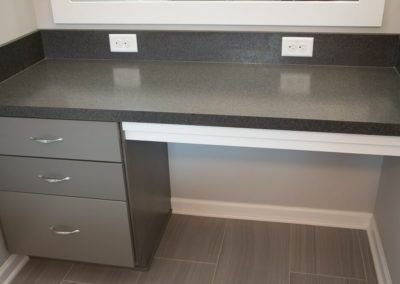 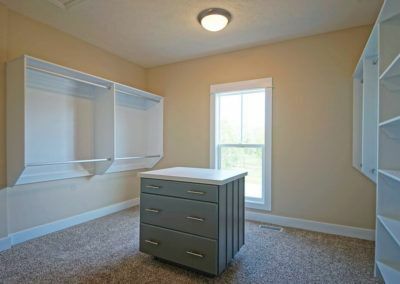 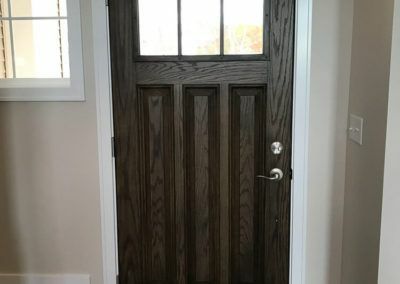 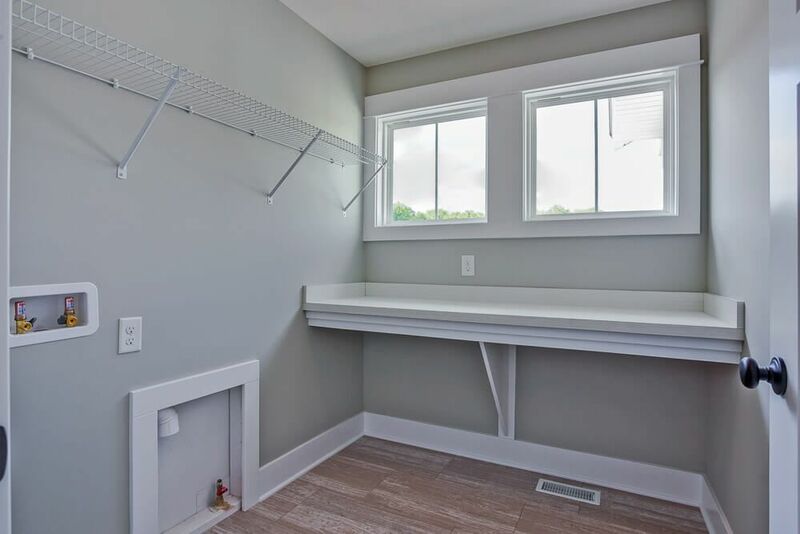 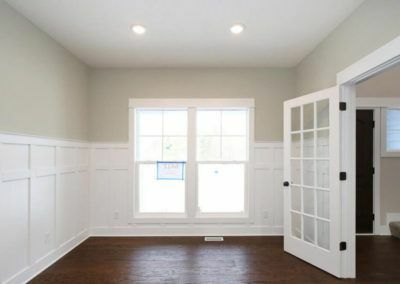 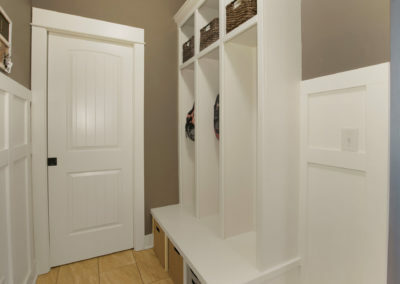 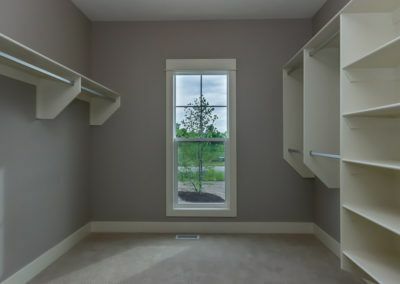 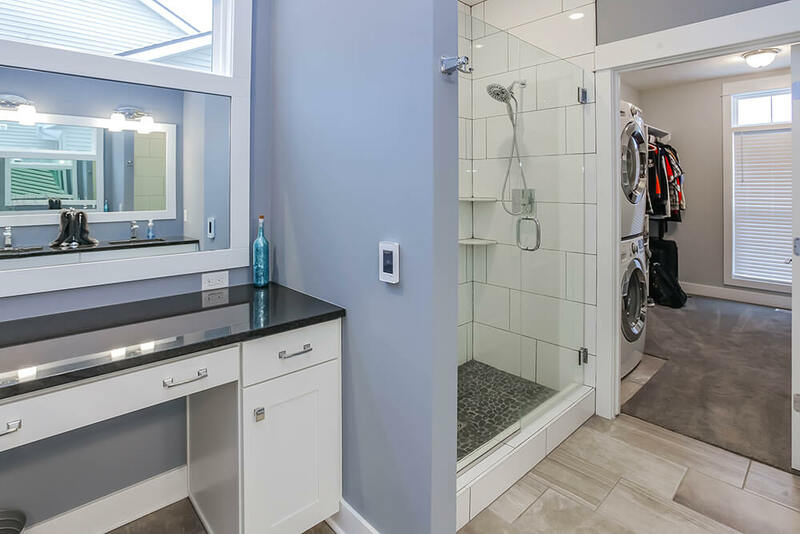 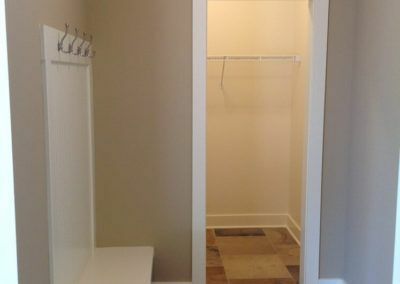 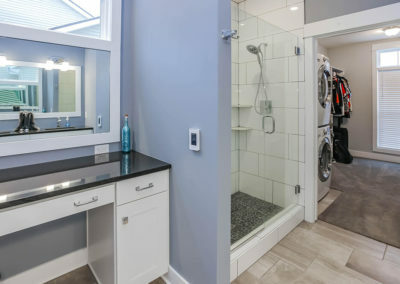 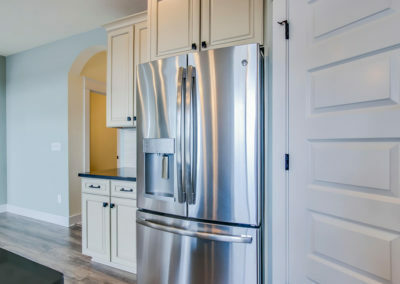 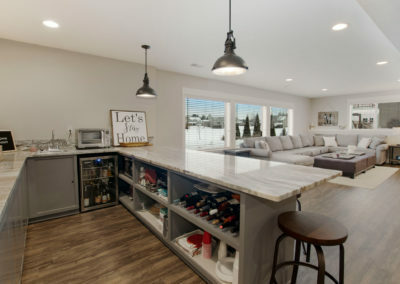 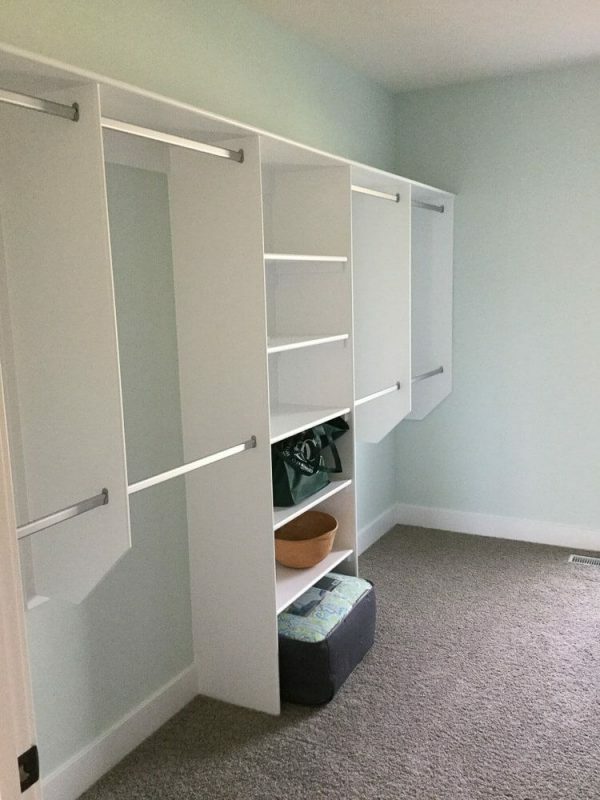 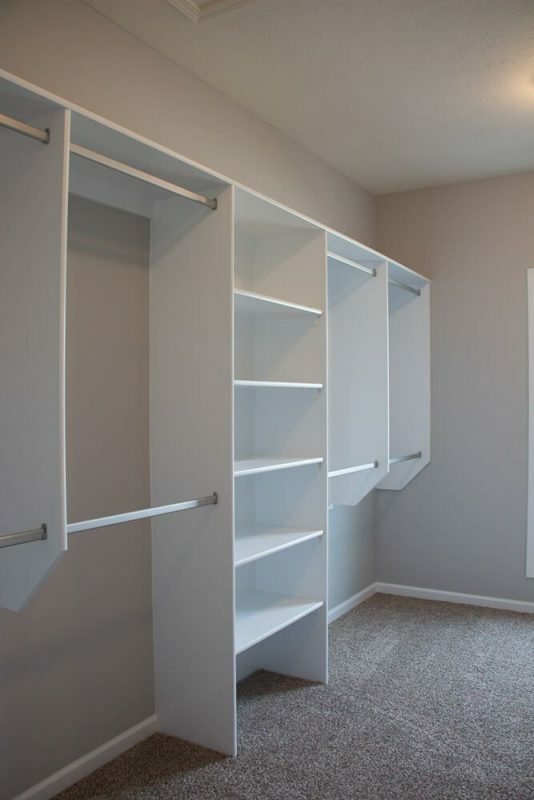 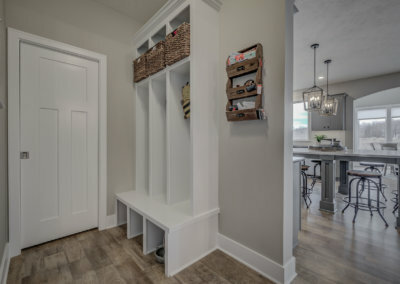 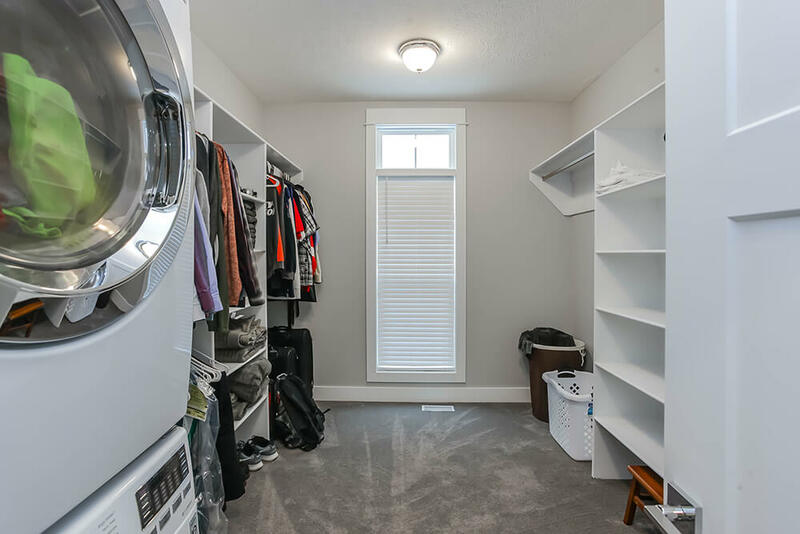 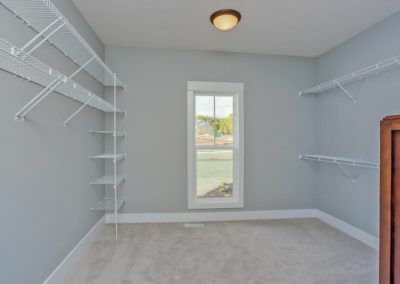 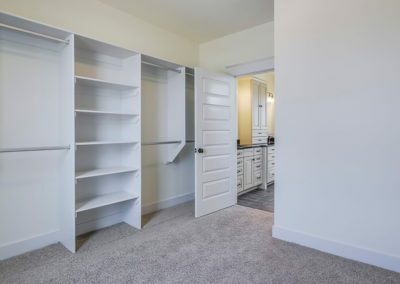 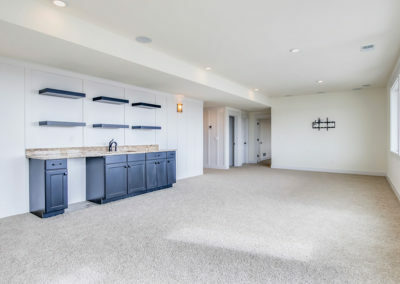 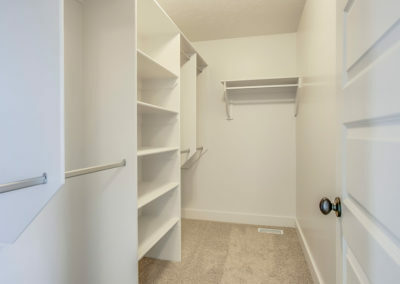 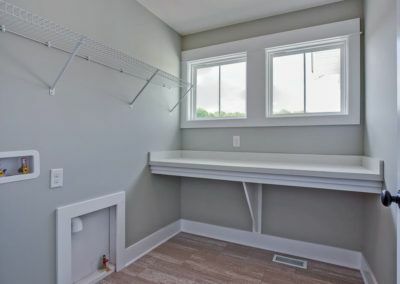 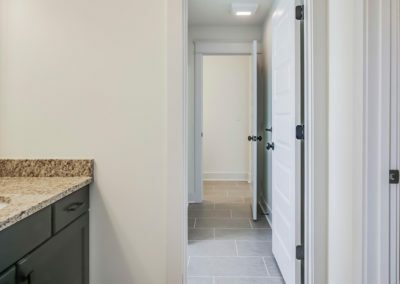 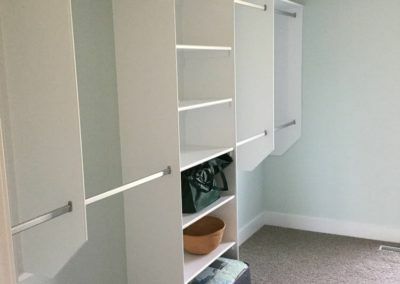 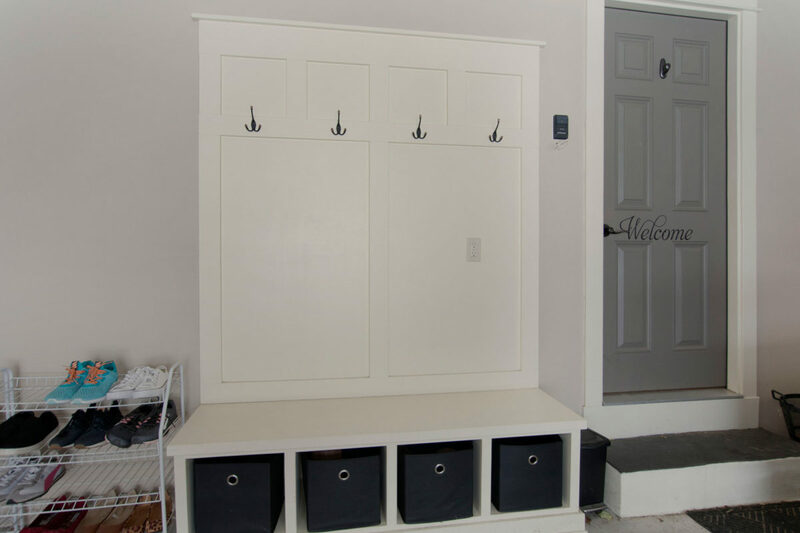 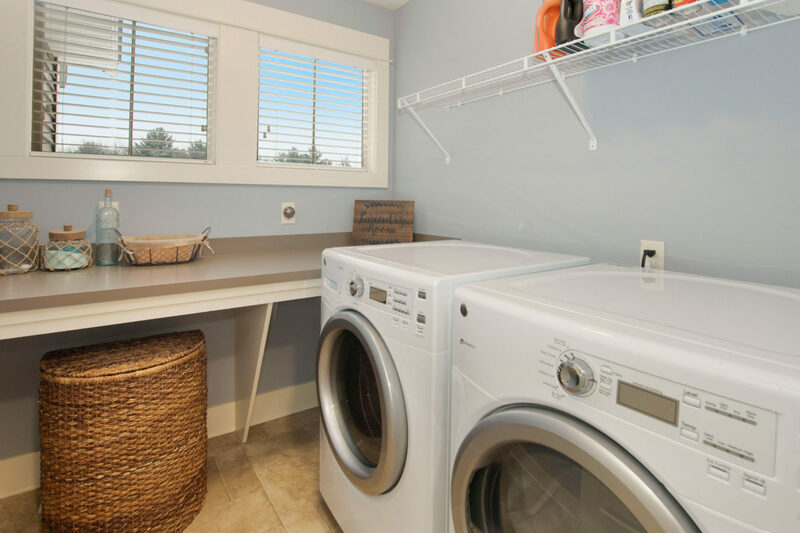 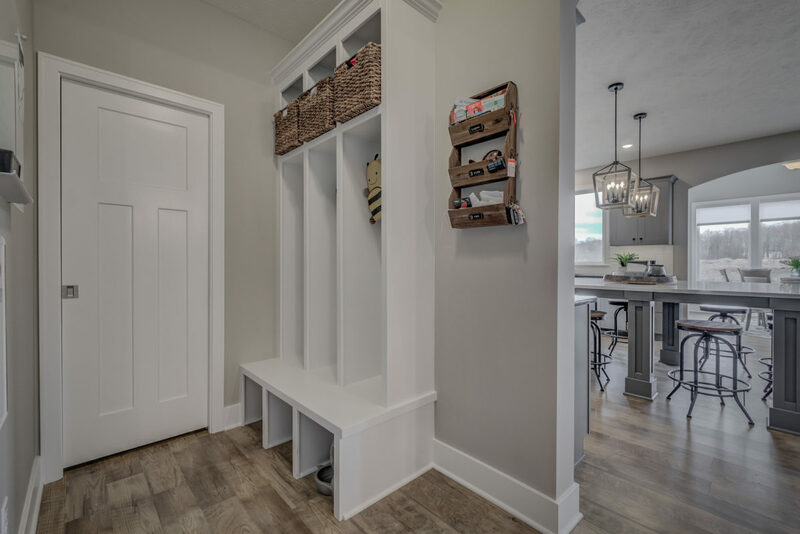 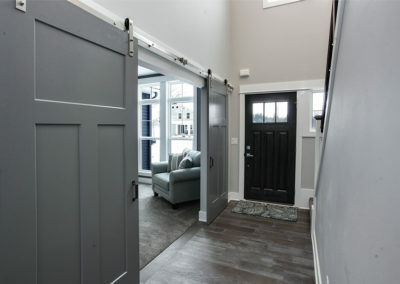 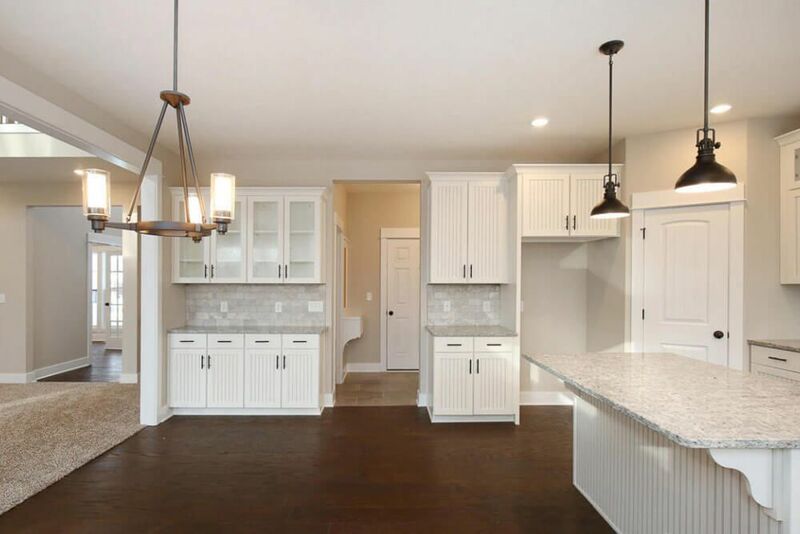 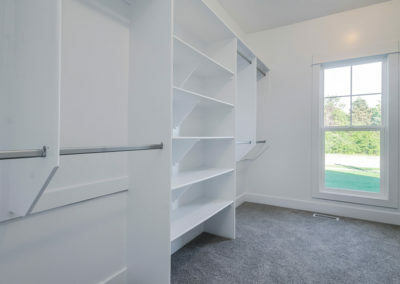 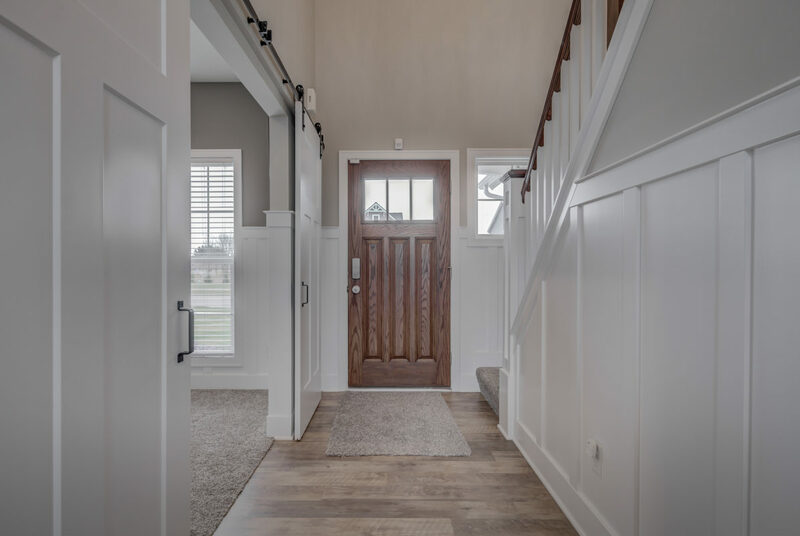 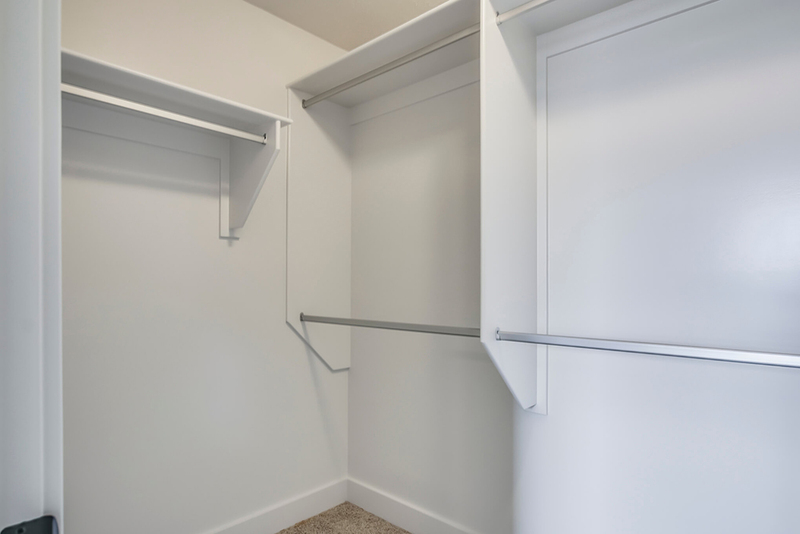 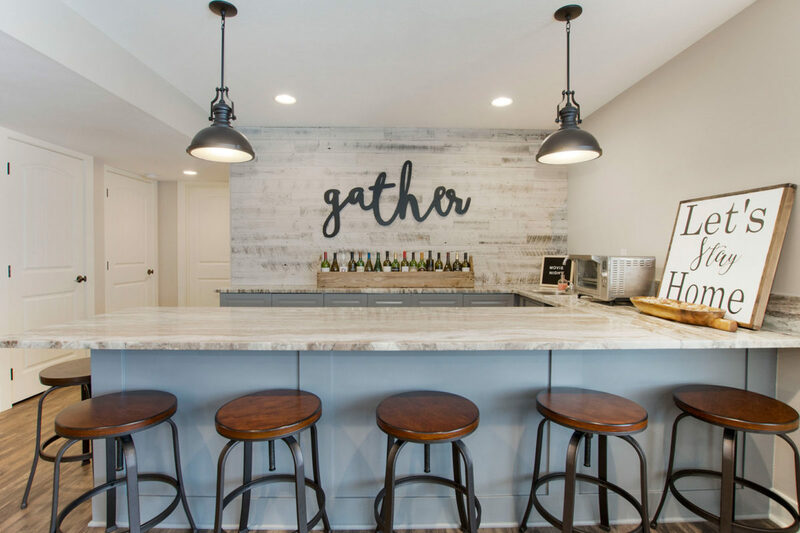 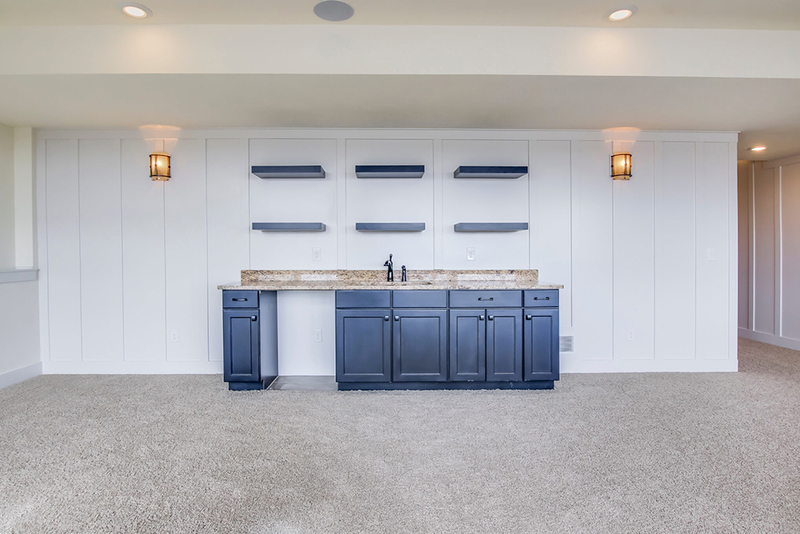 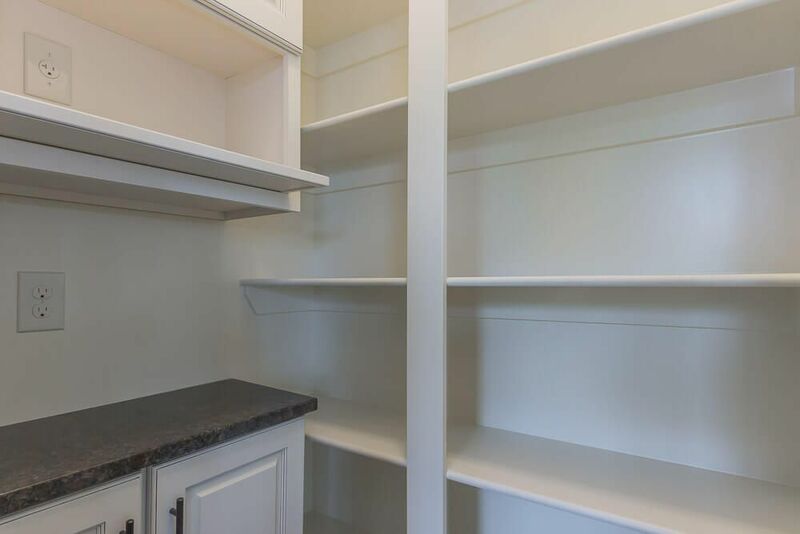 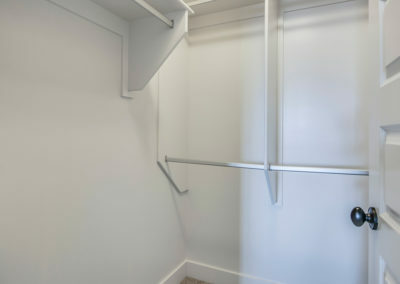 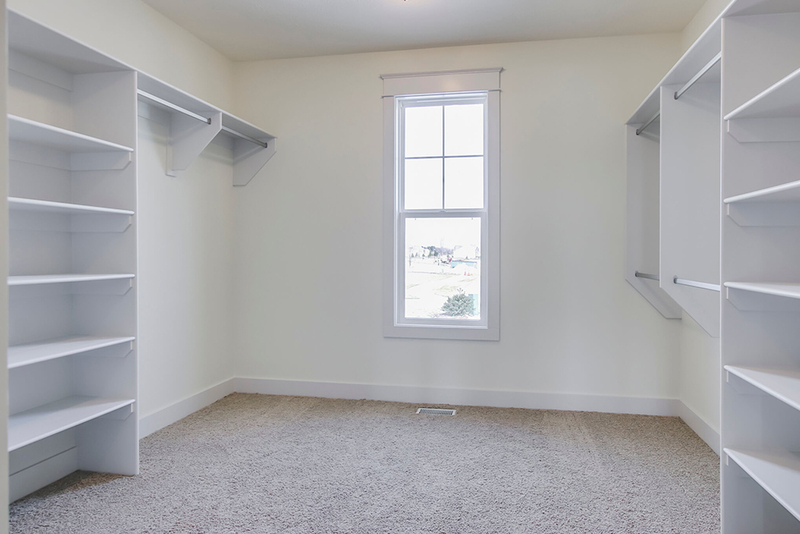 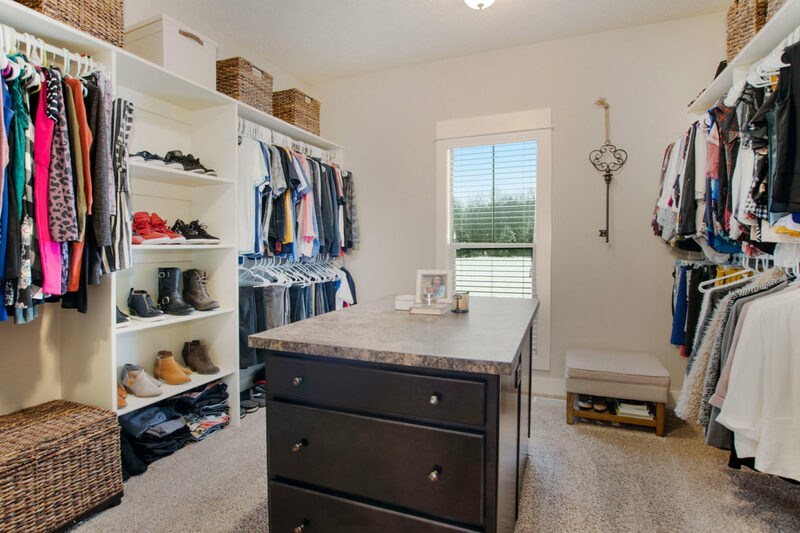 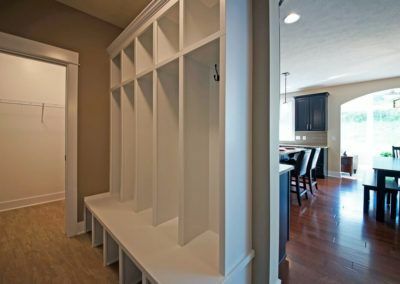 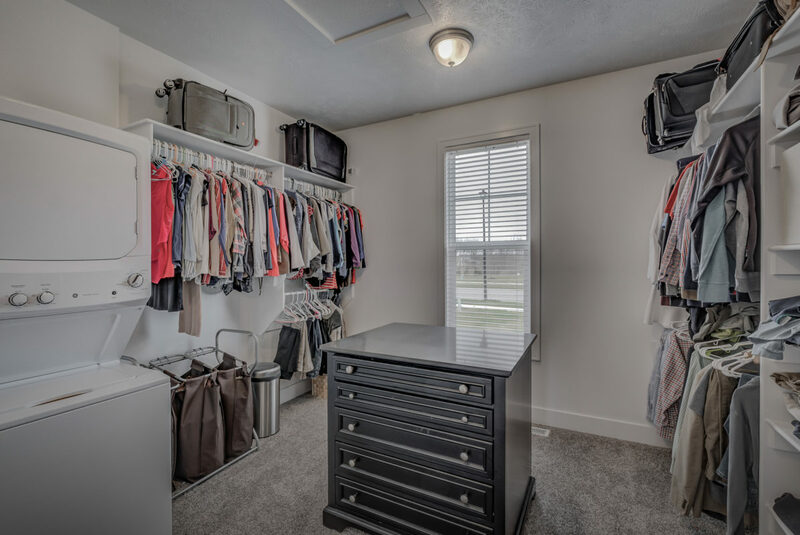 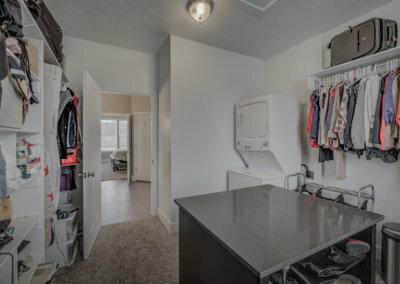 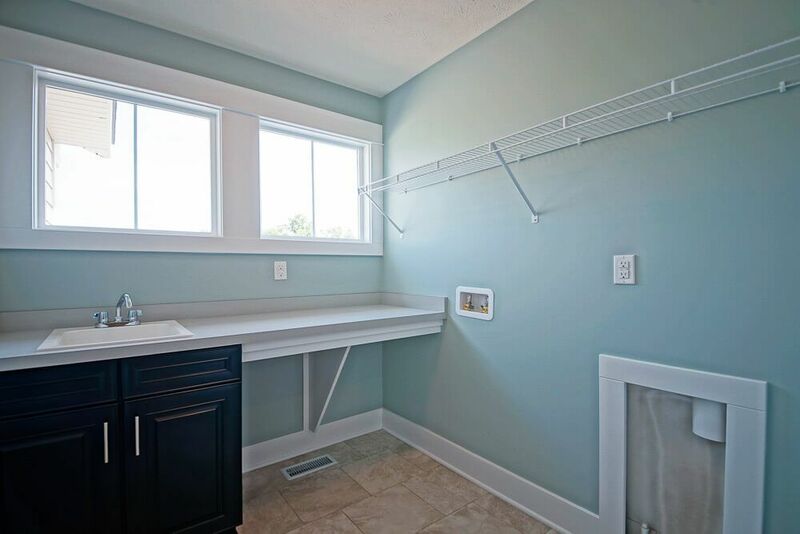 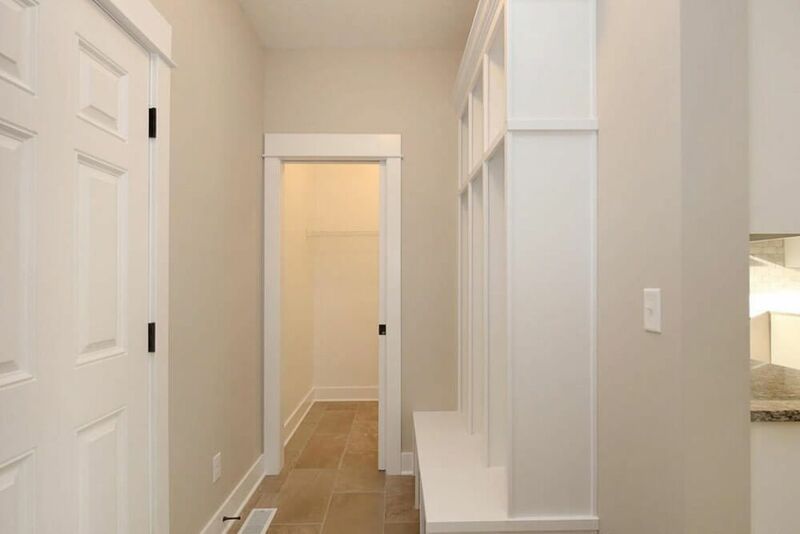 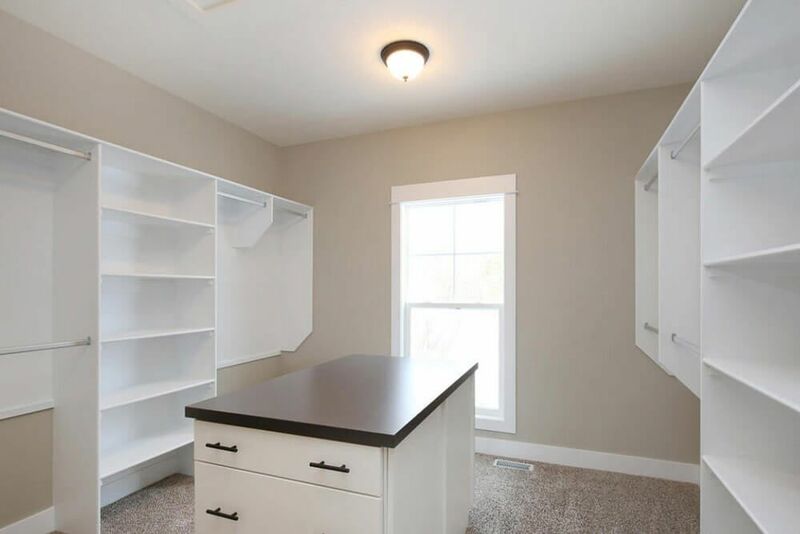 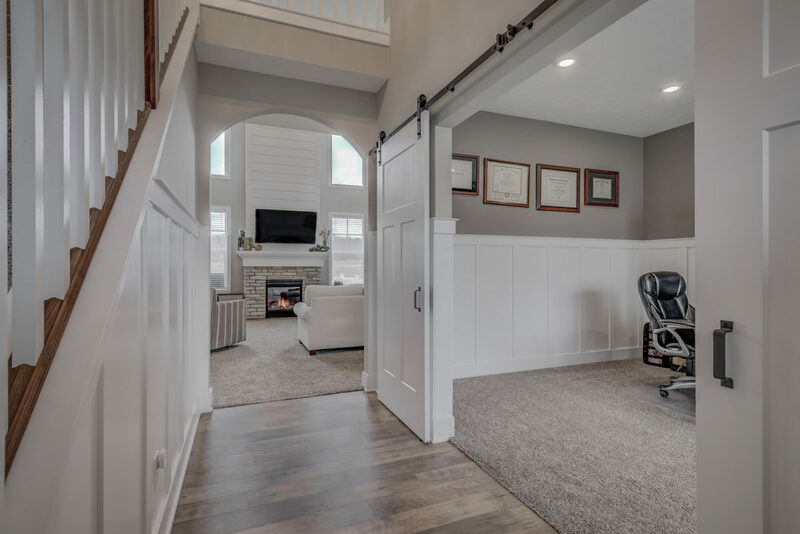 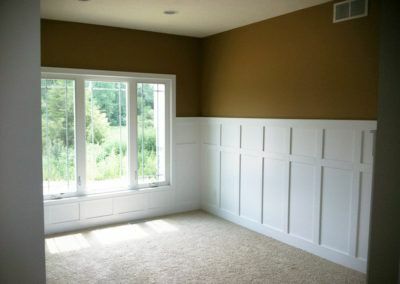 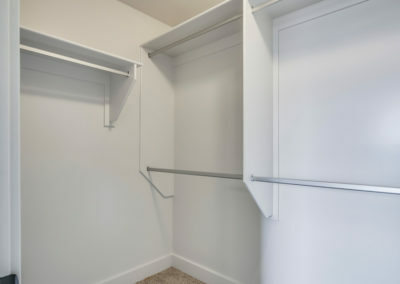 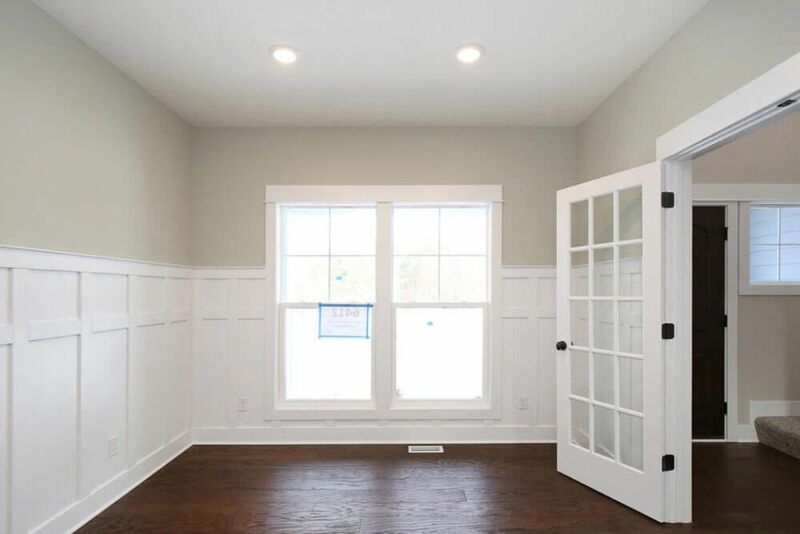 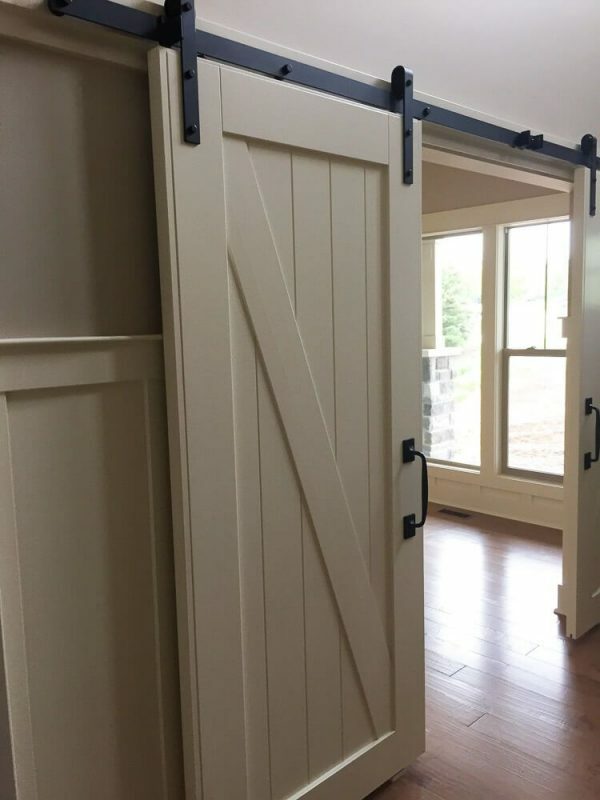 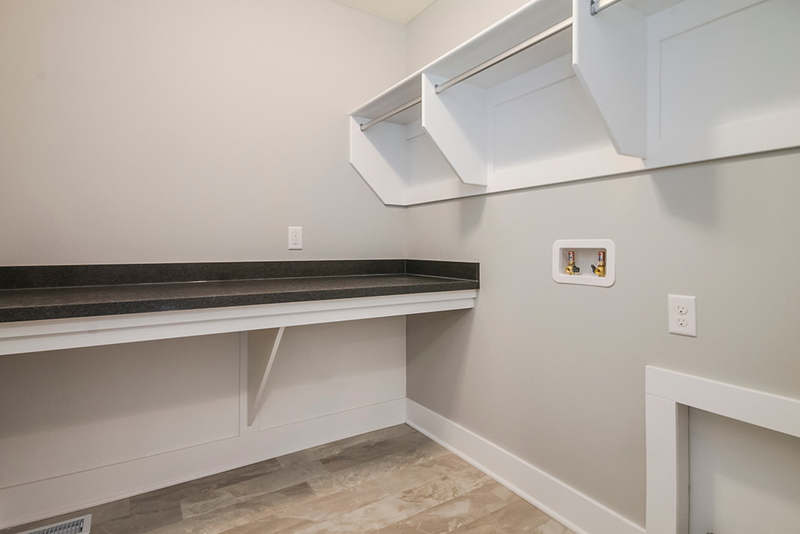 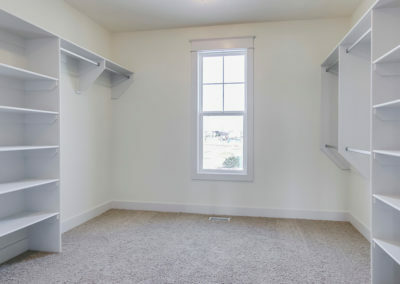 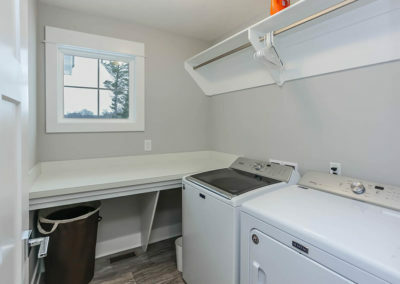 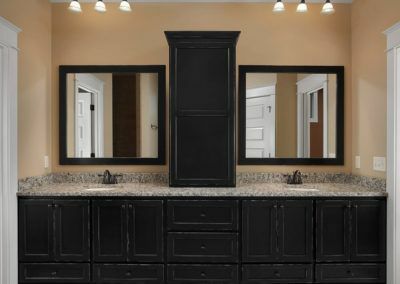 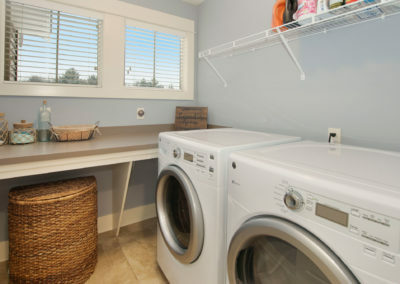 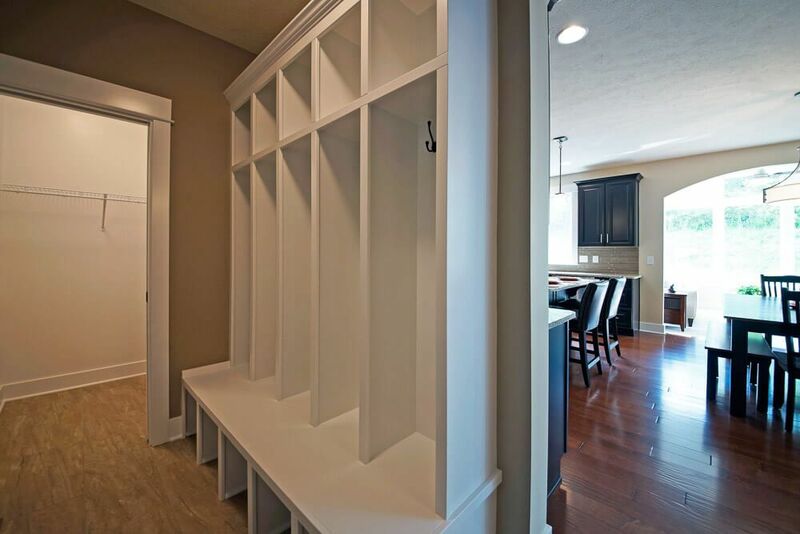 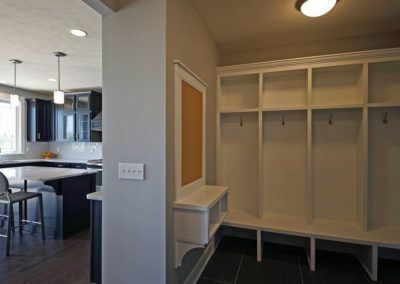 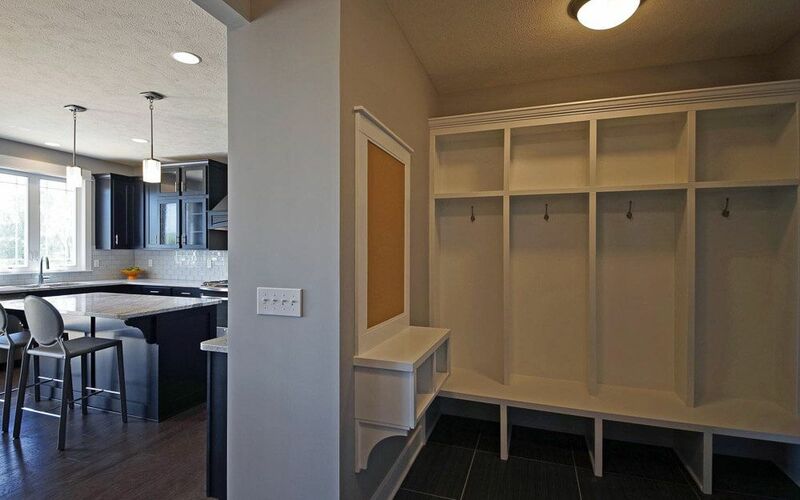 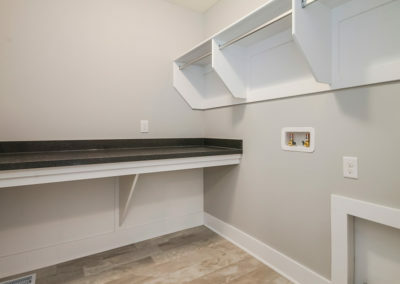 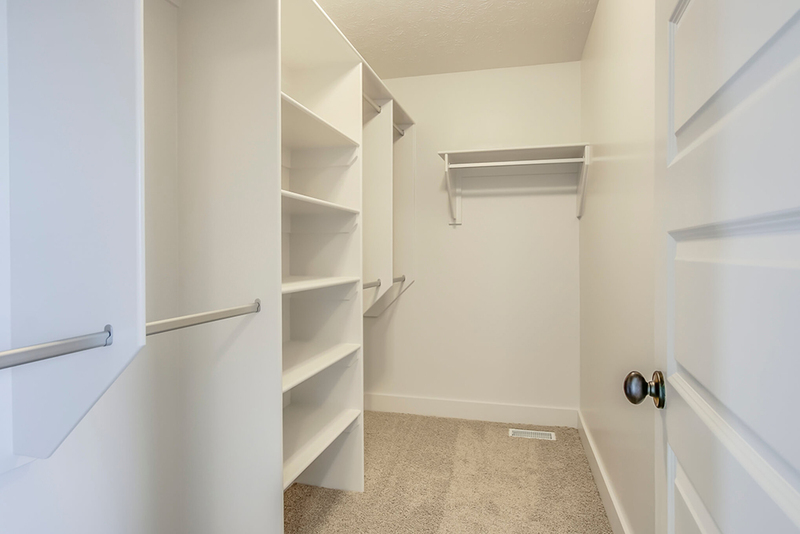 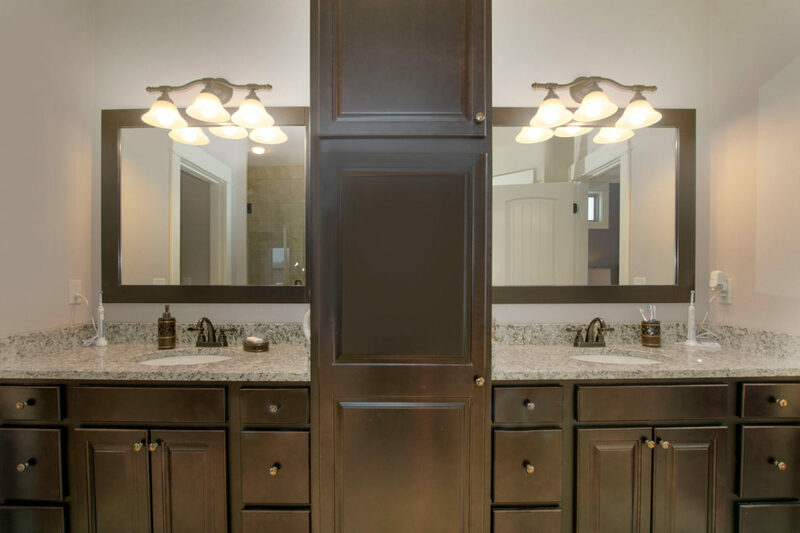 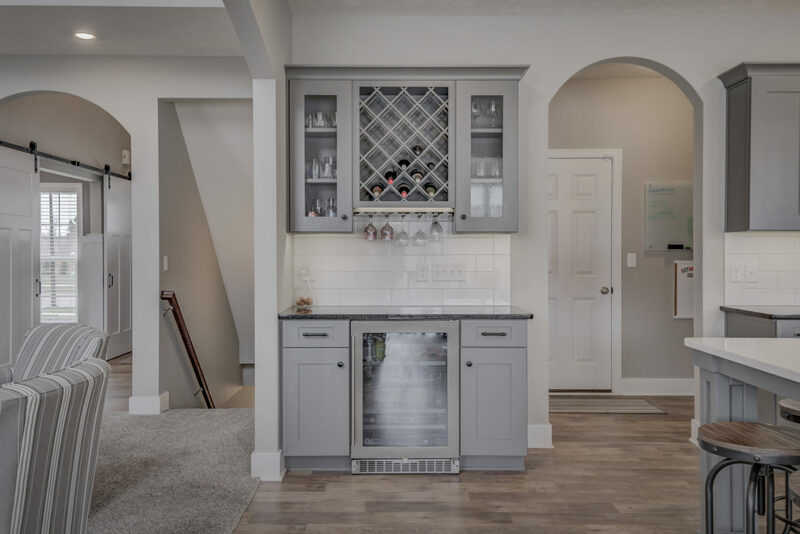 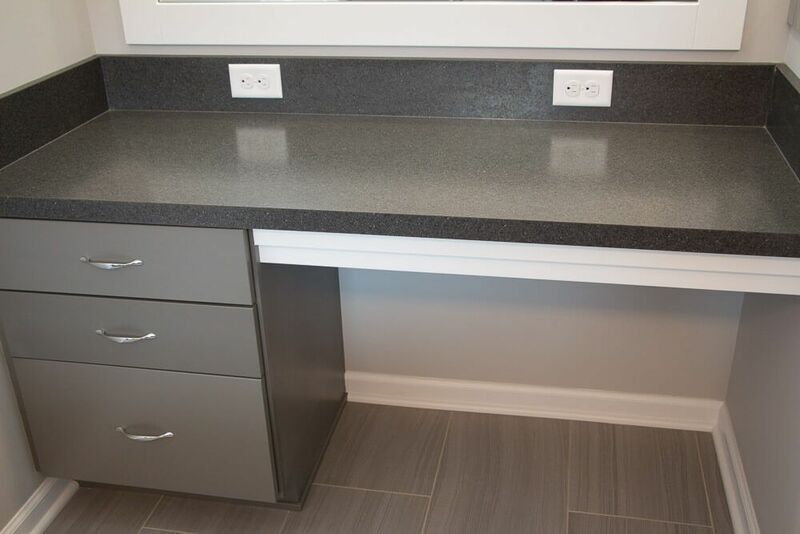 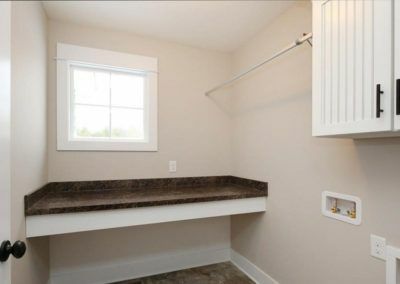 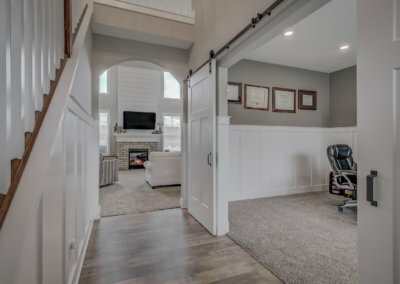 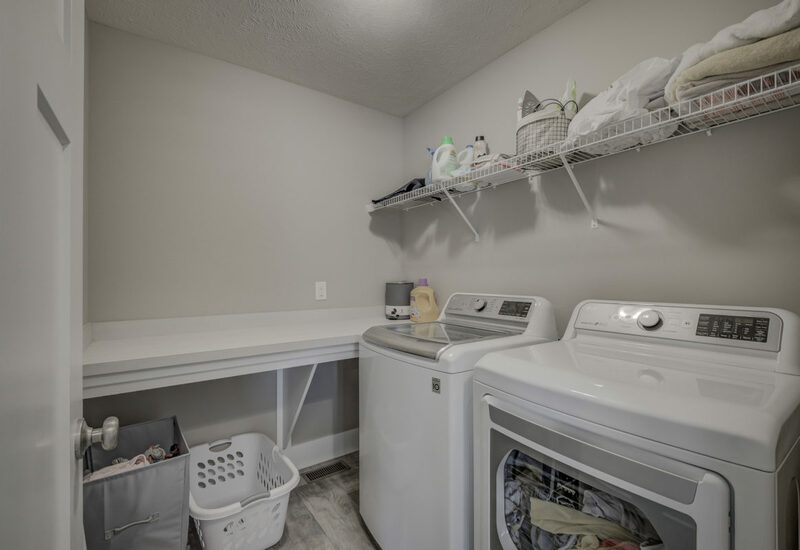 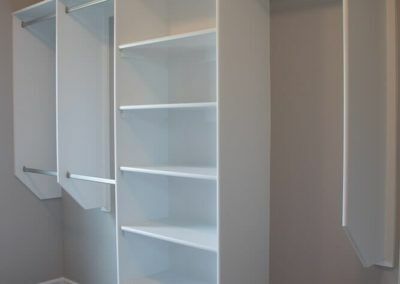 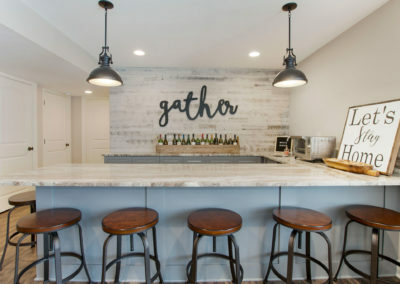 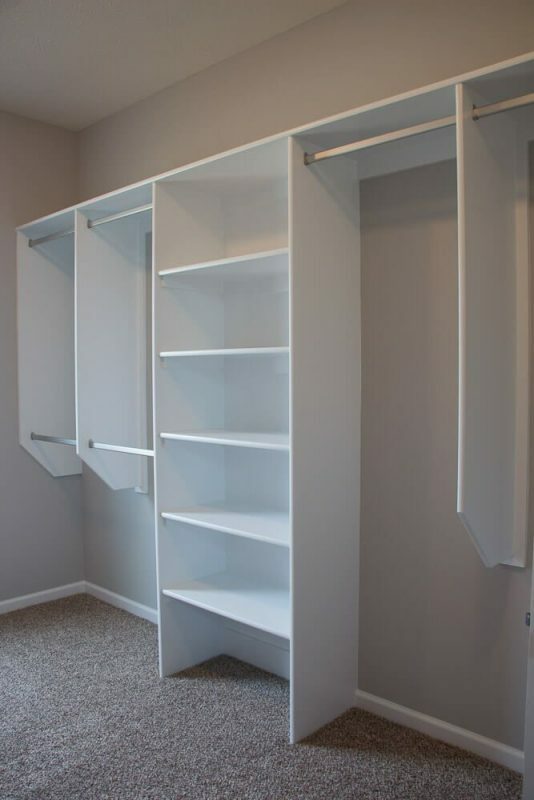 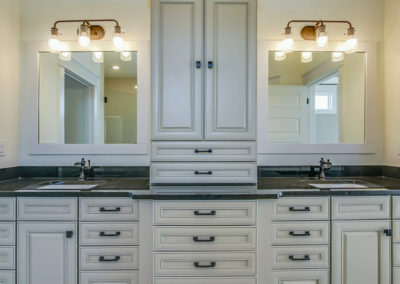 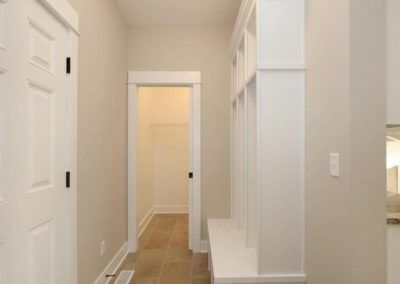 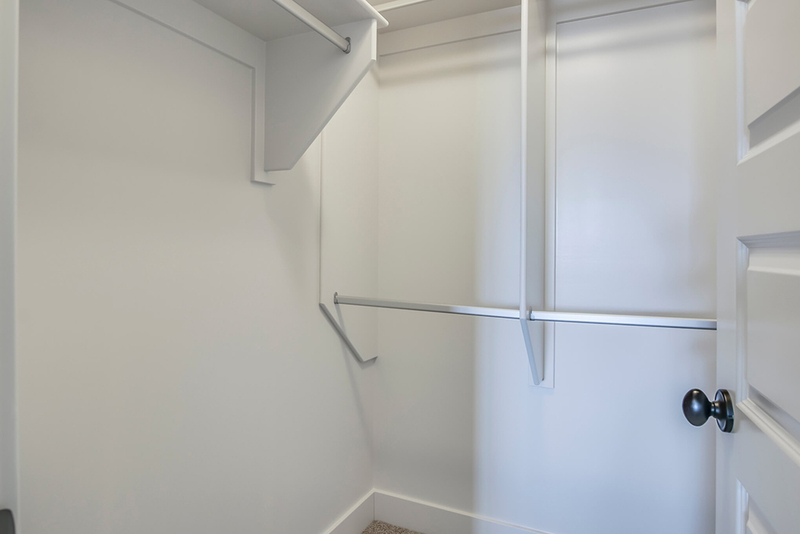 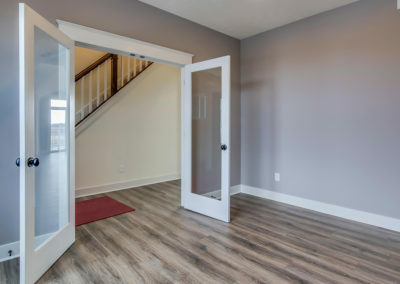 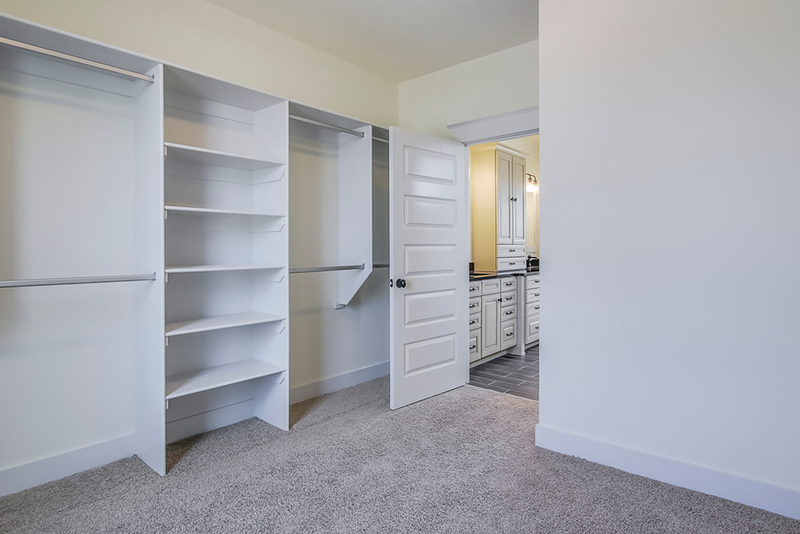 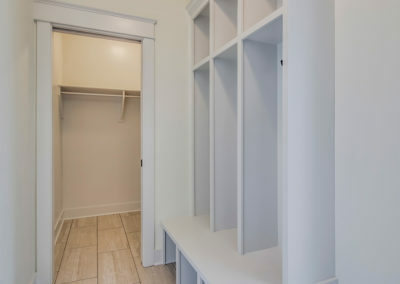 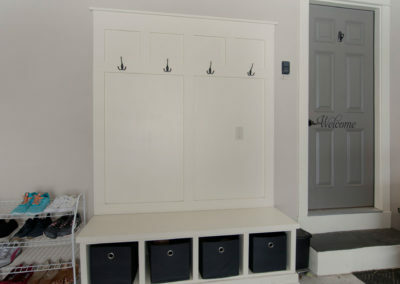 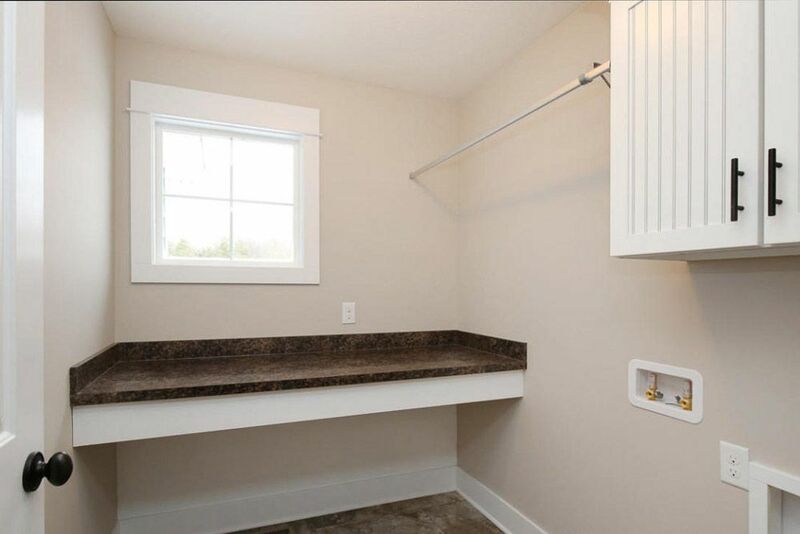 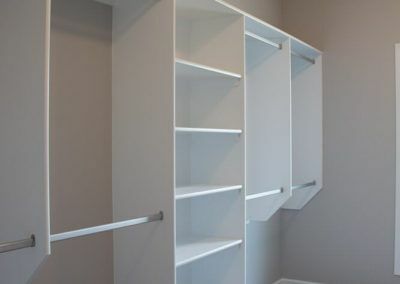 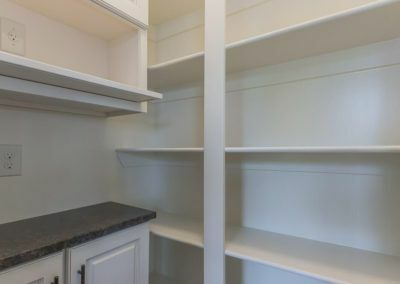 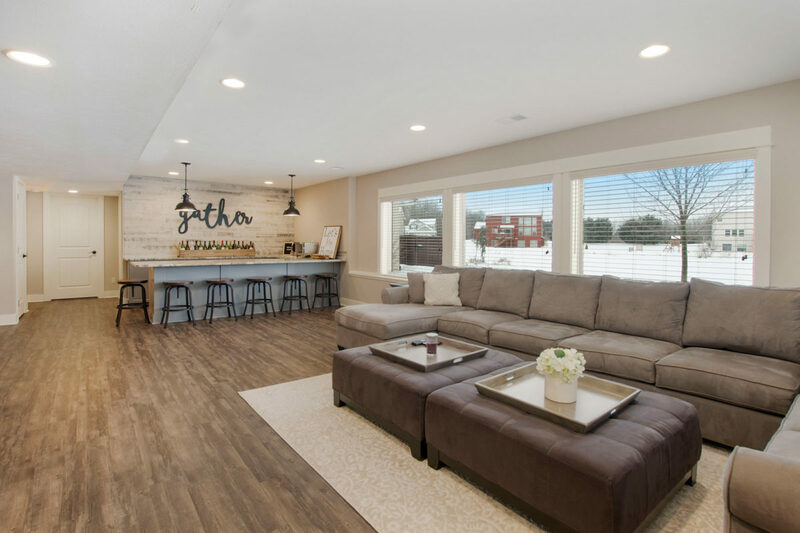 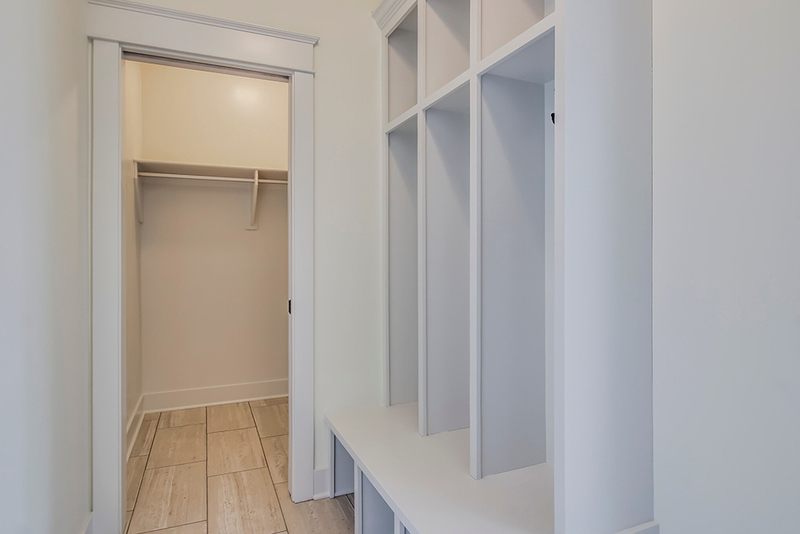 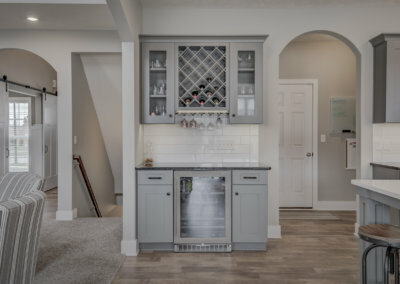 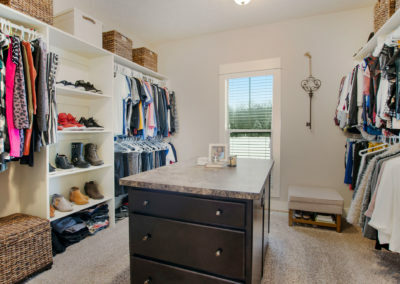 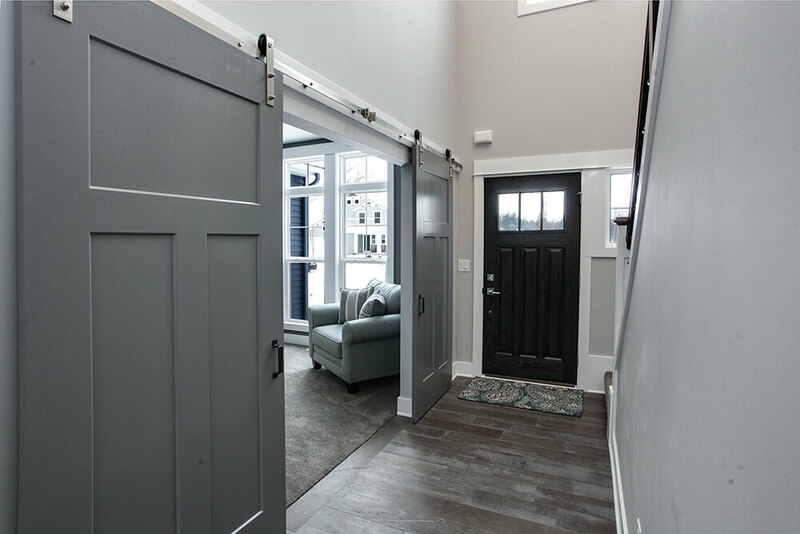 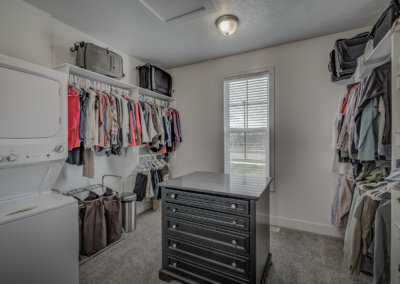 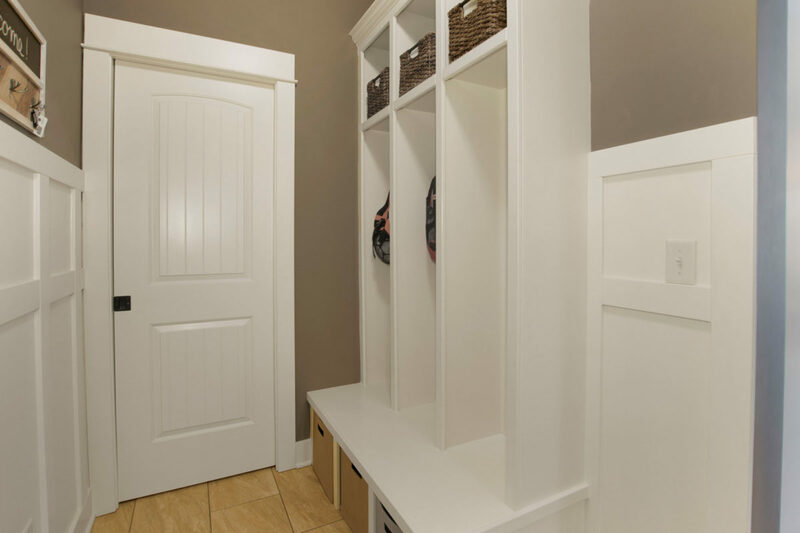 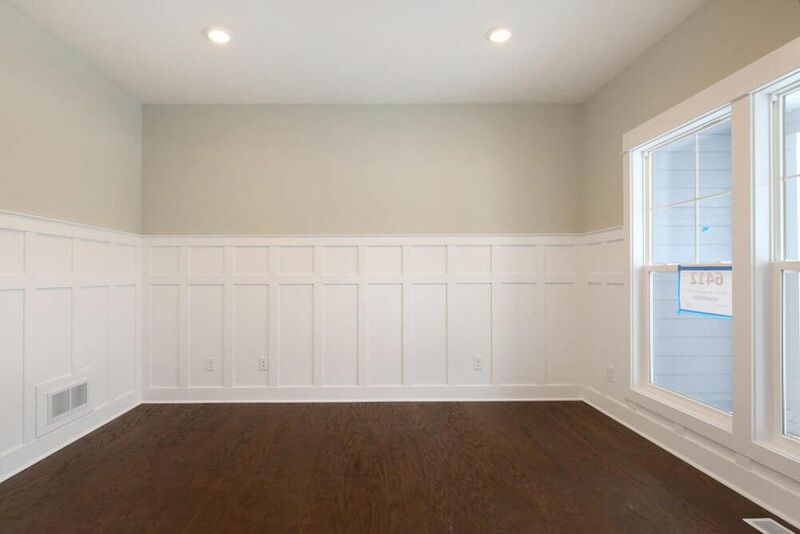 Off the kitchen, the mudroom offers an optional bench or lockers, and leads to the half bath and two or three car garage. 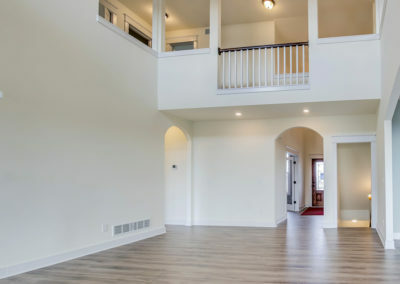 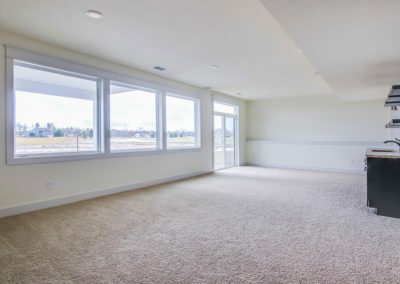 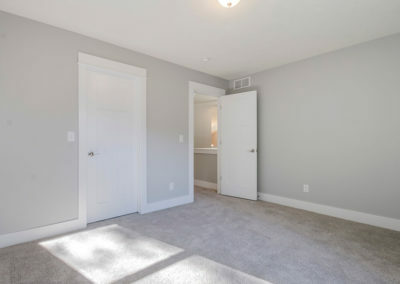 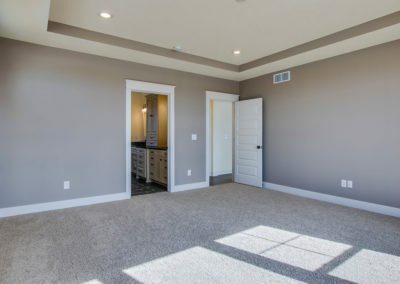 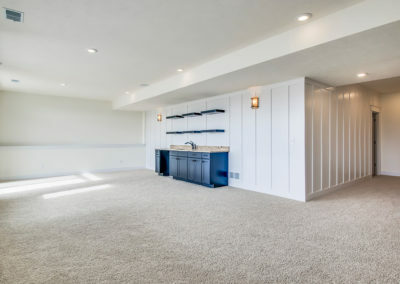 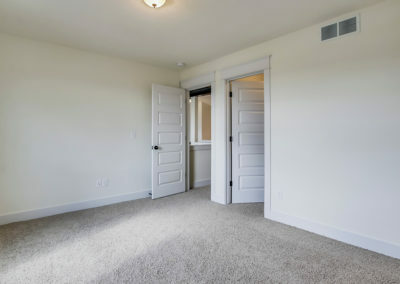 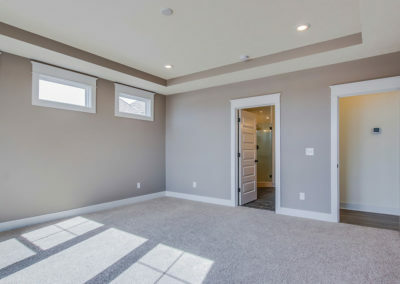 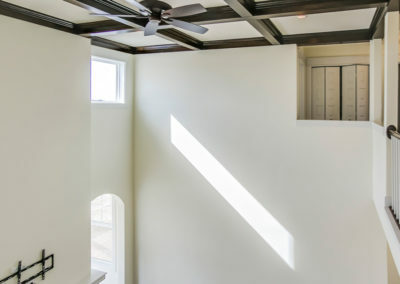 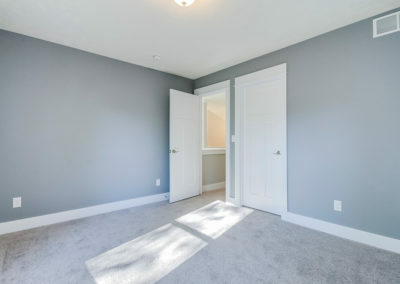 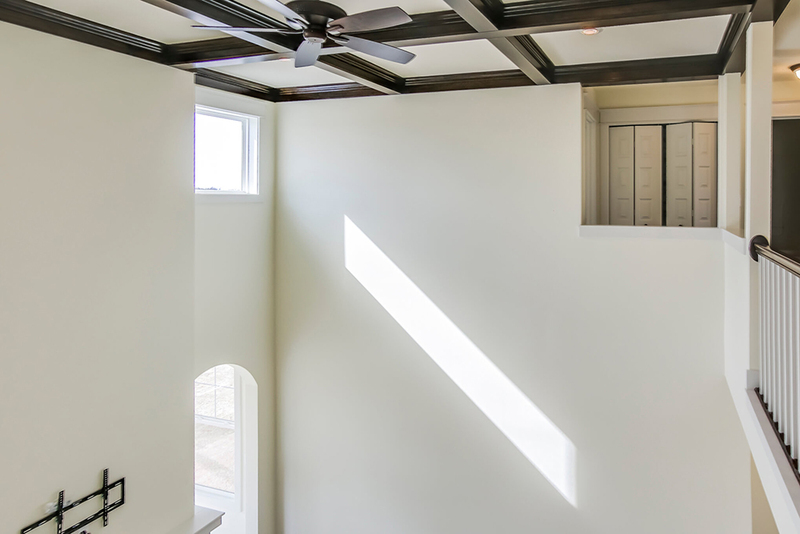 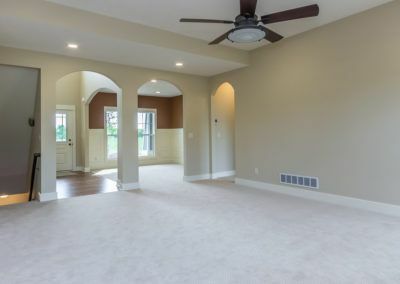 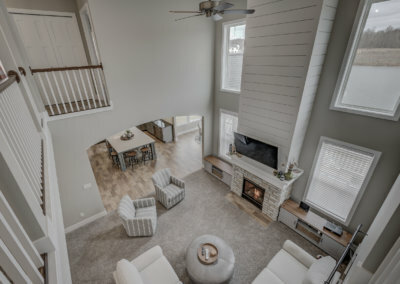 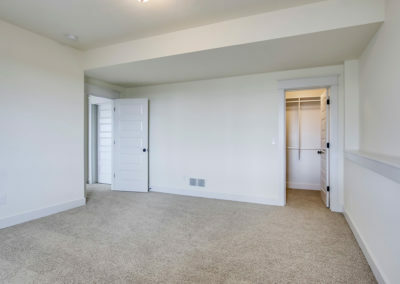 The main level master suite connects to the living area through a short hall. 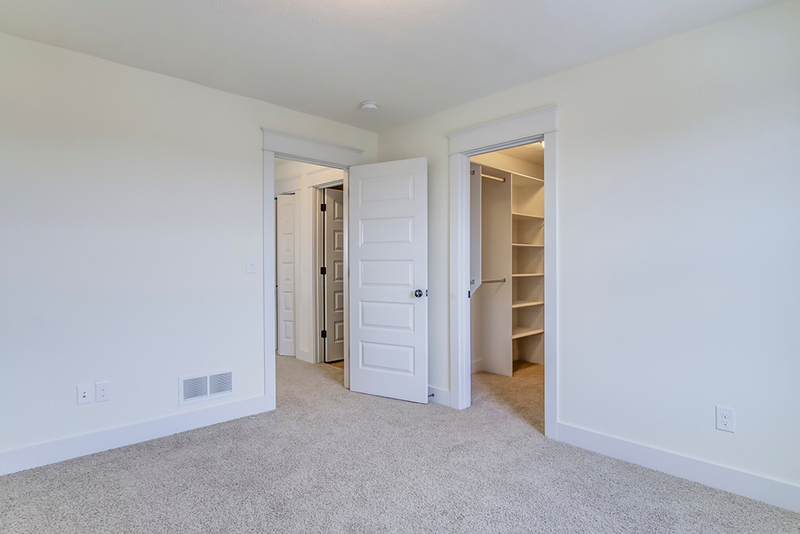 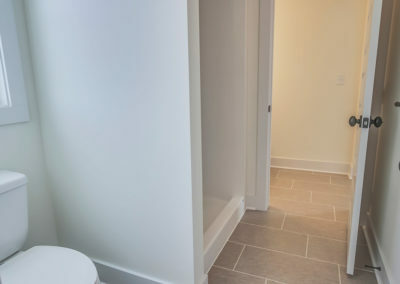 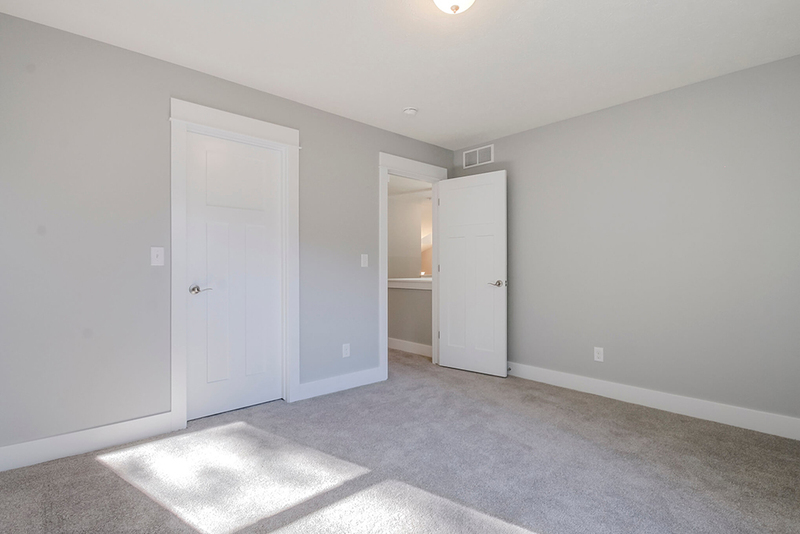 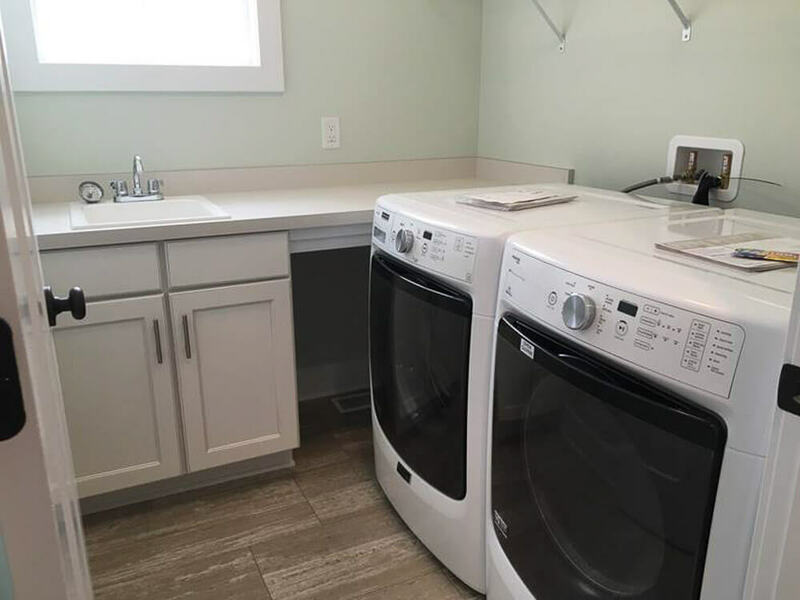 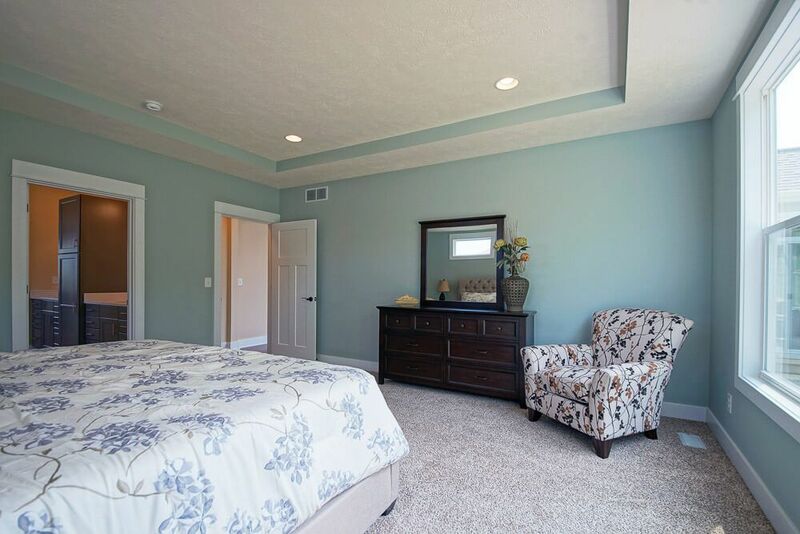 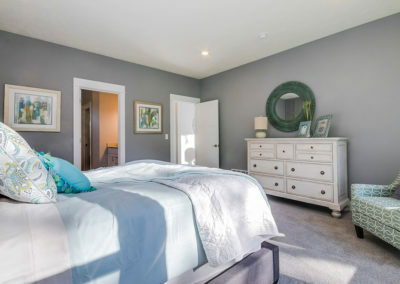 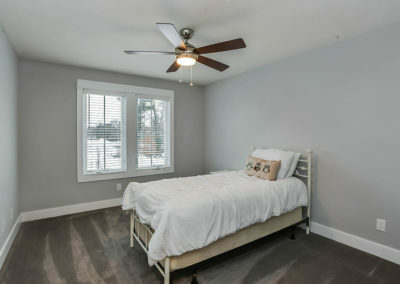 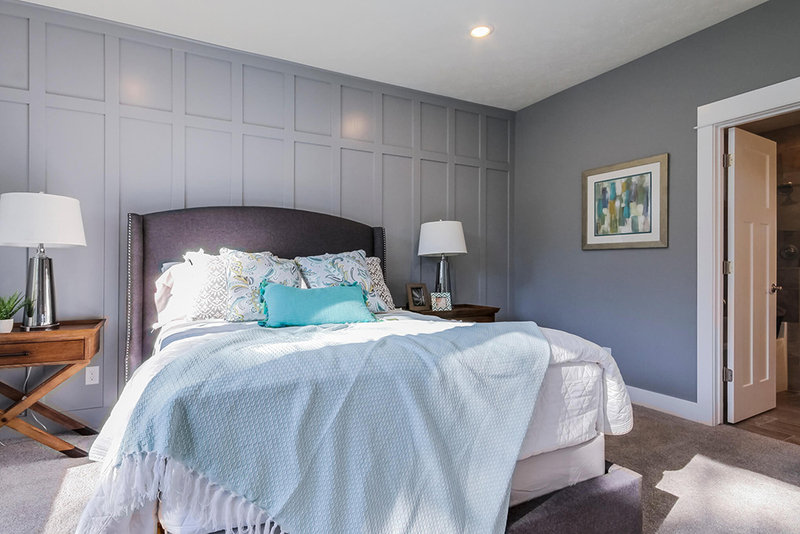 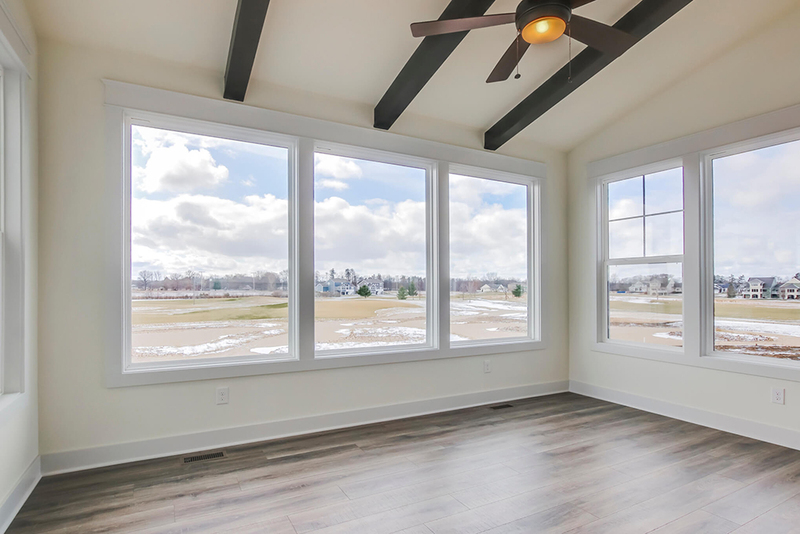 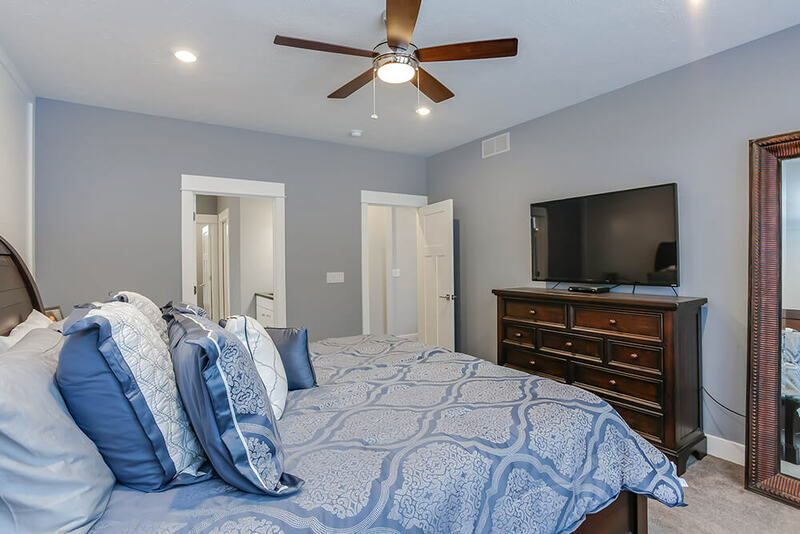 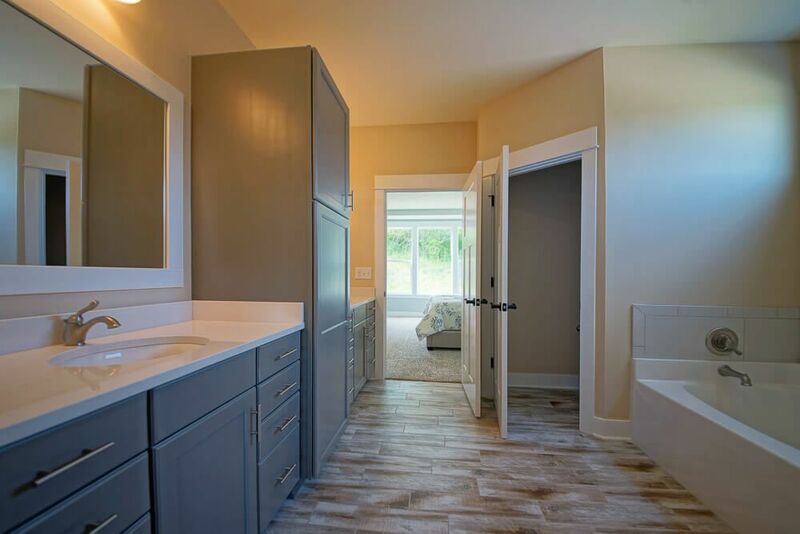 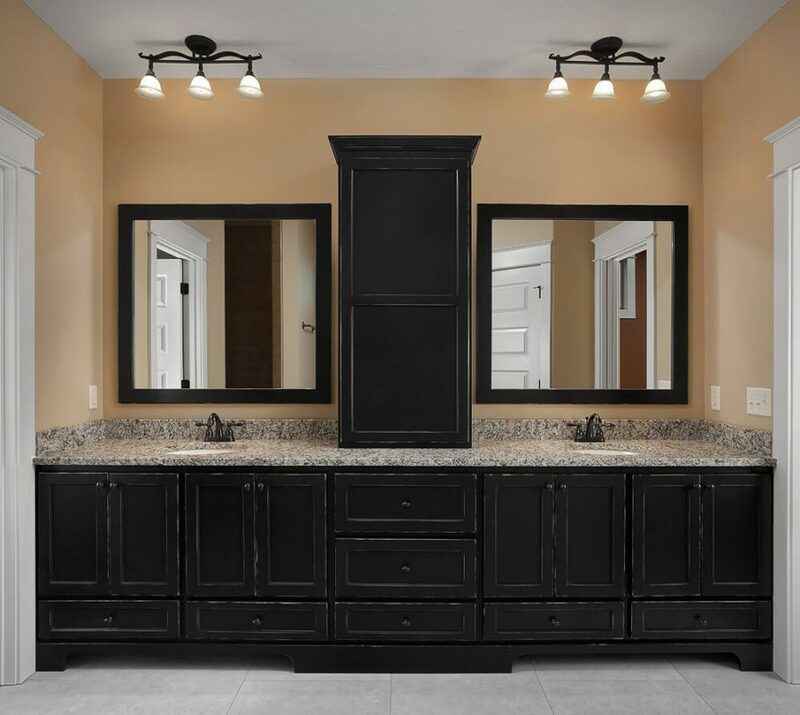 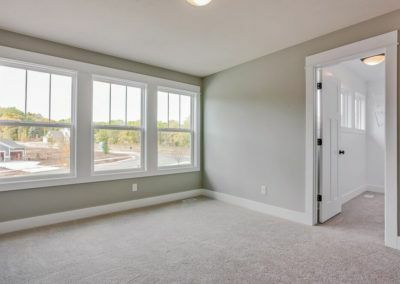 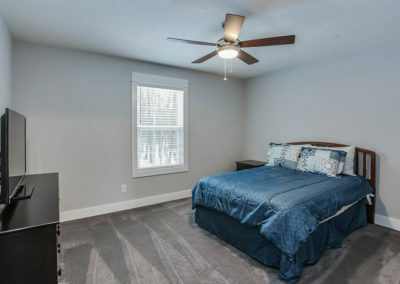 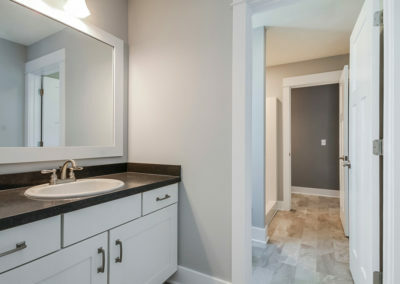 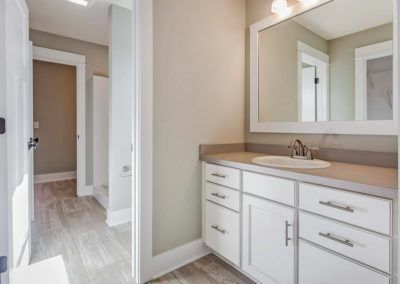 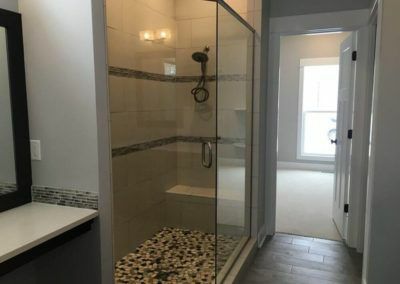 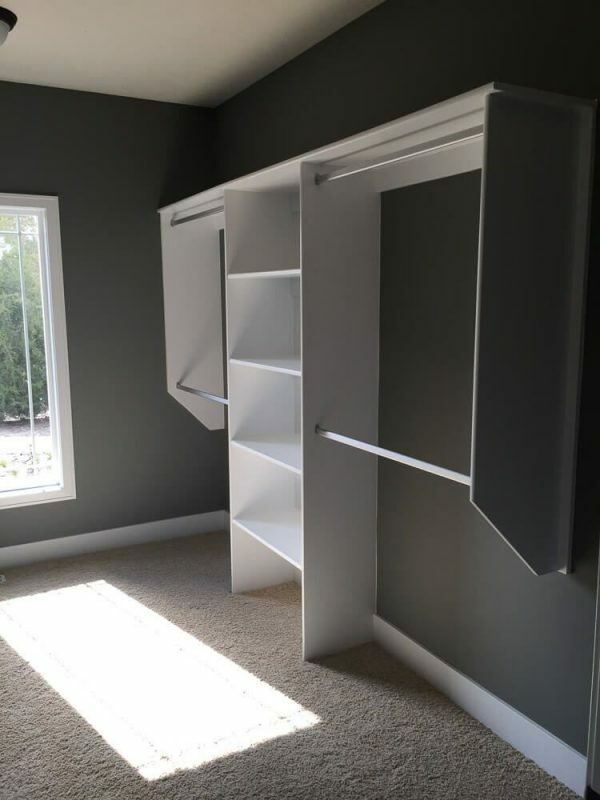 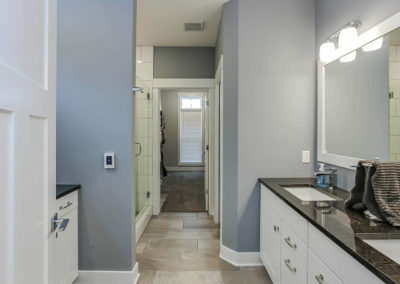 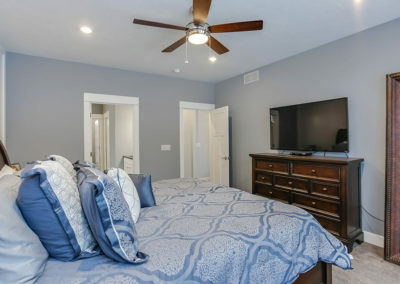 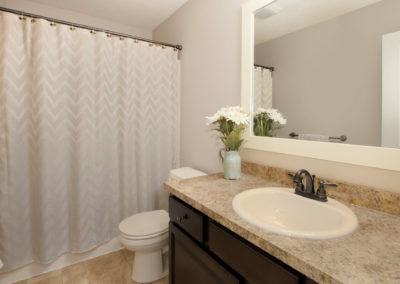 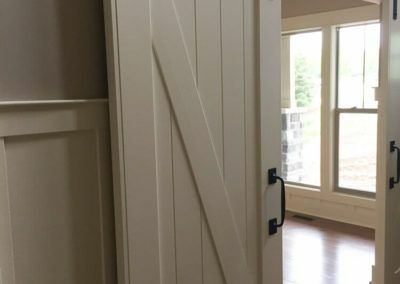 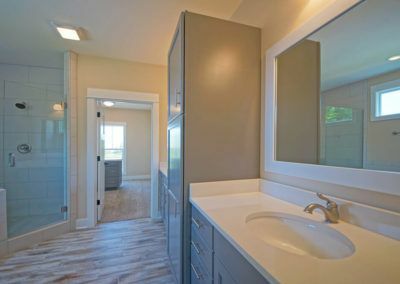 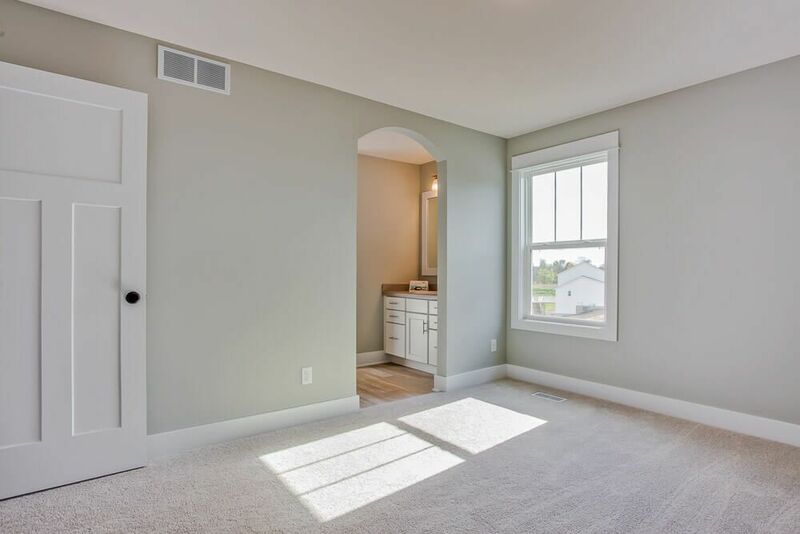 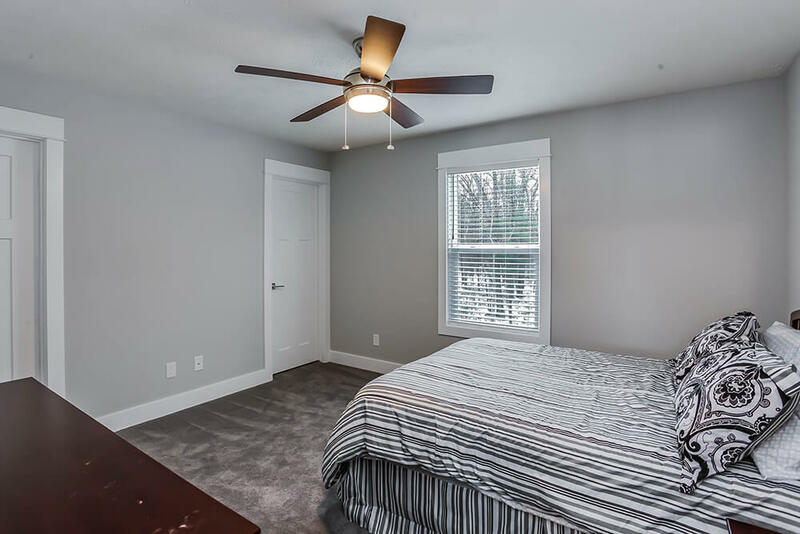 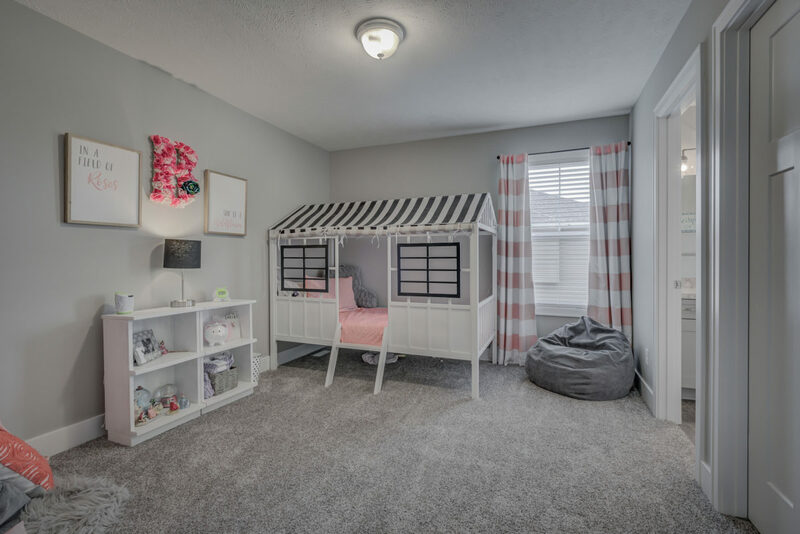 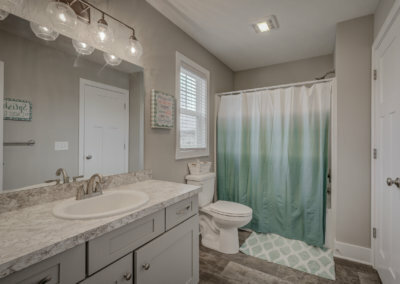 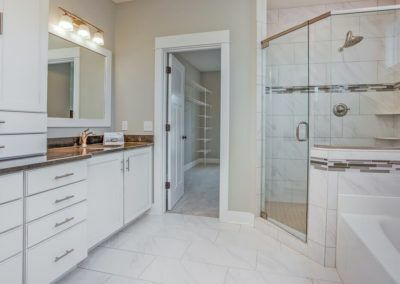 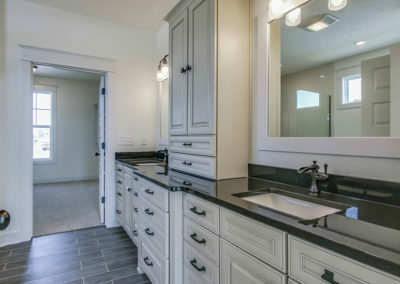 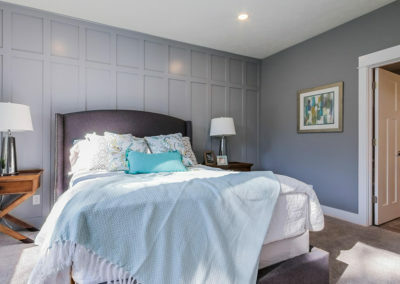 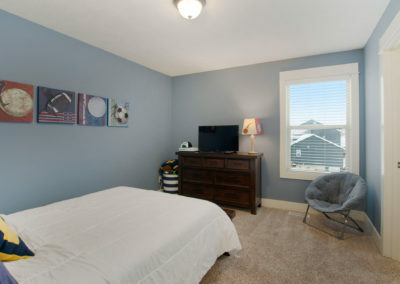 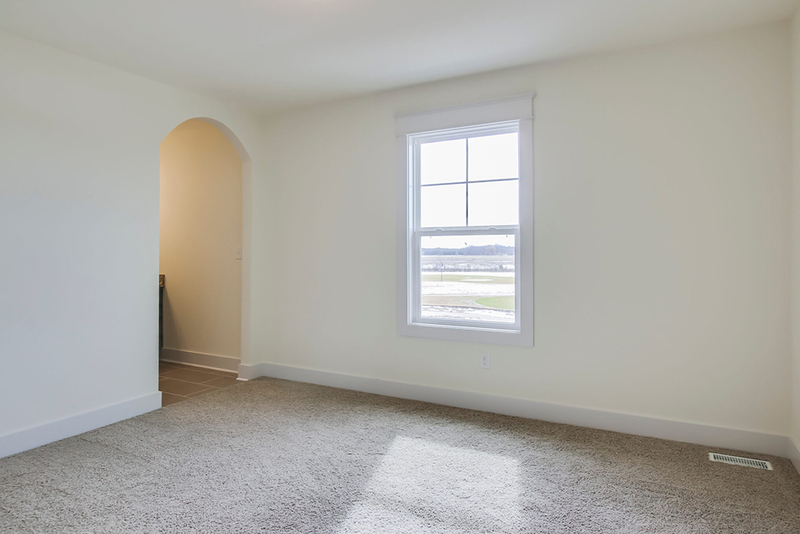 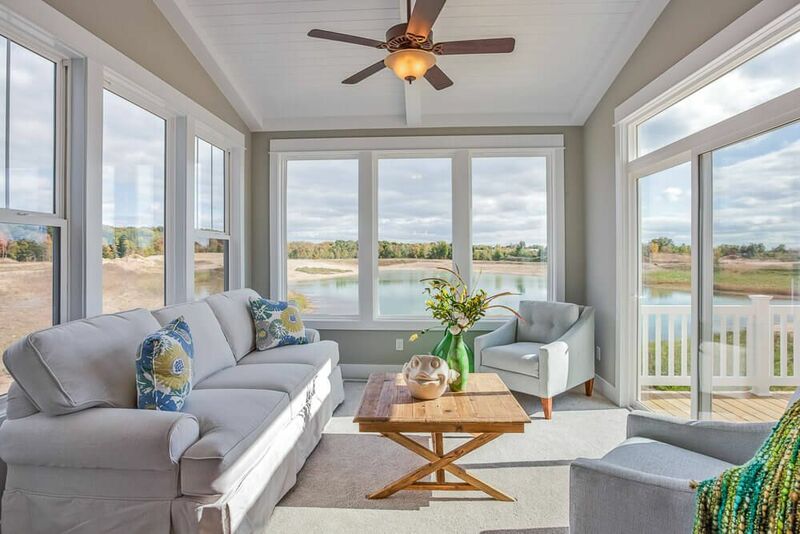 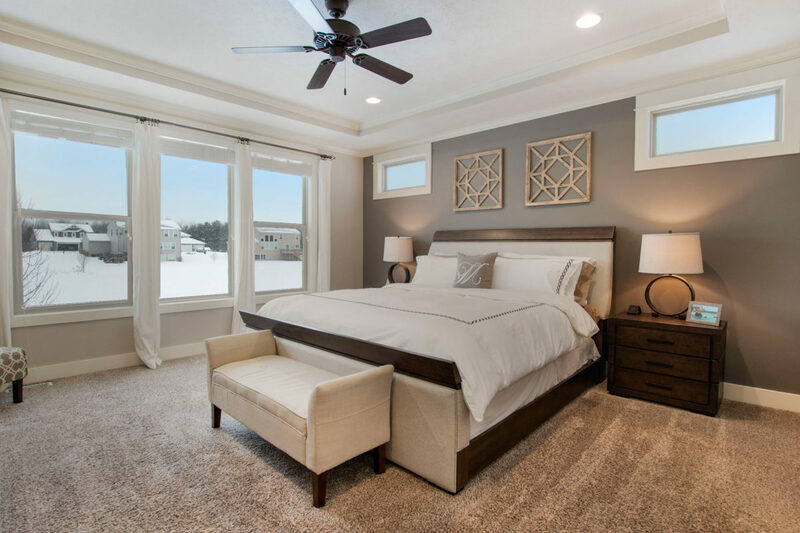 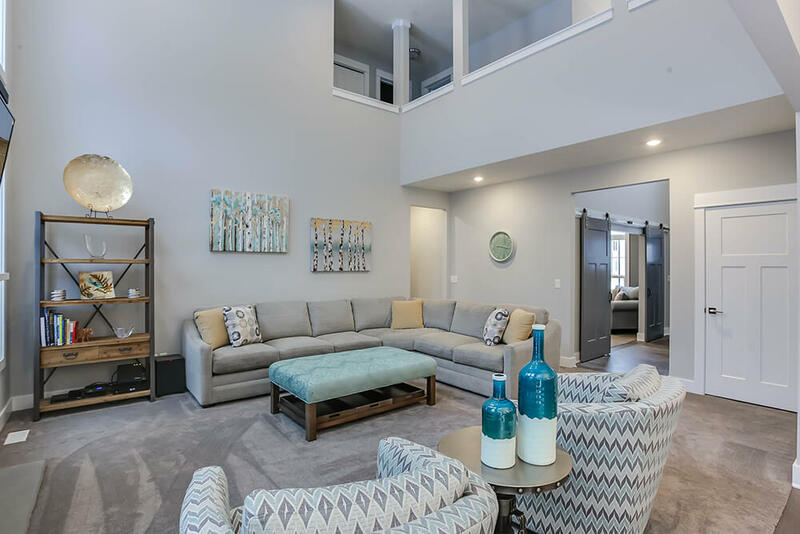 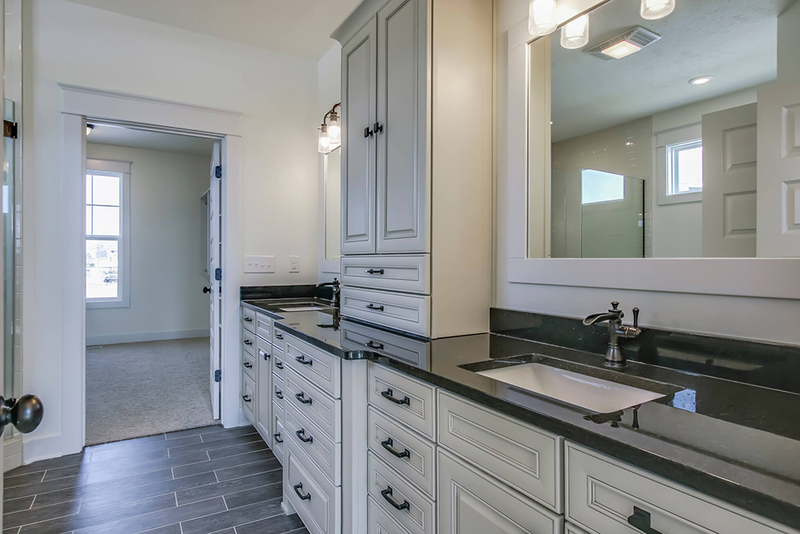 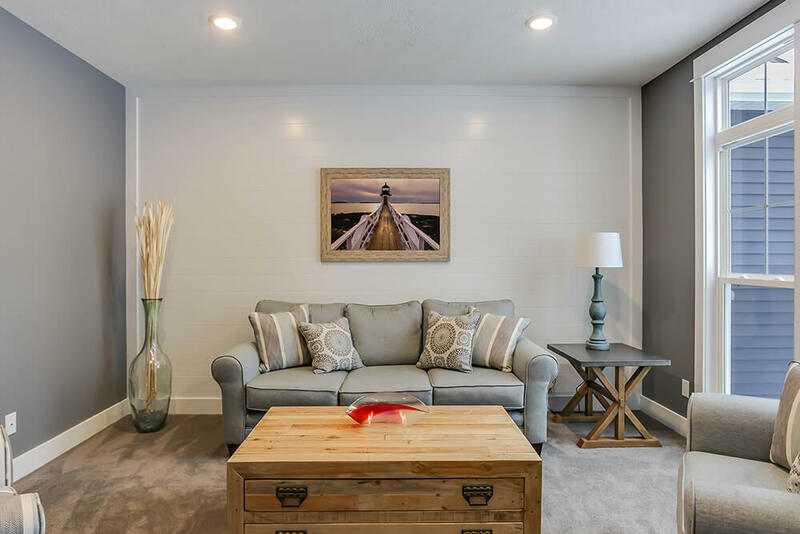 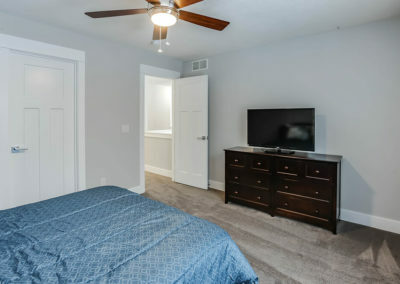 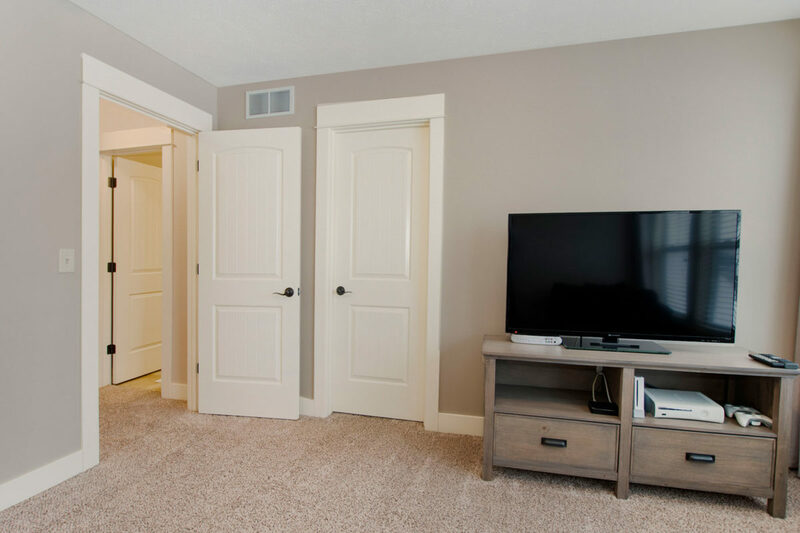 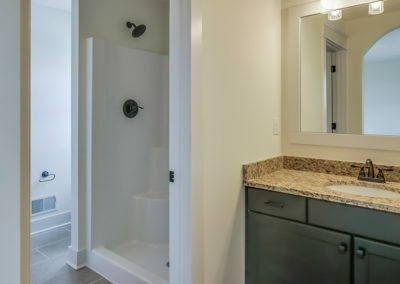 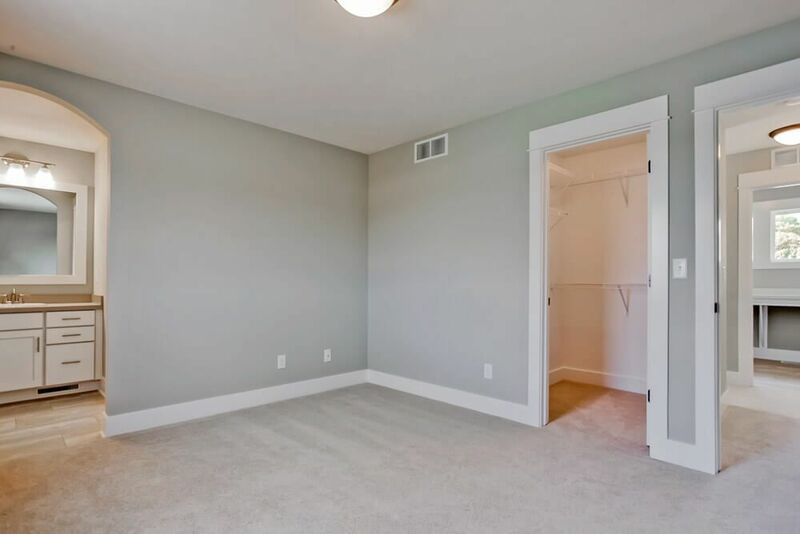 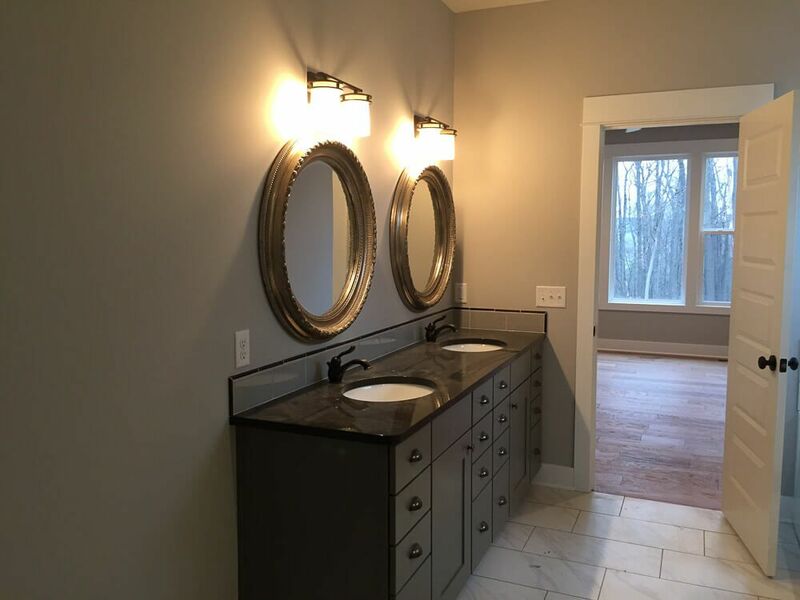 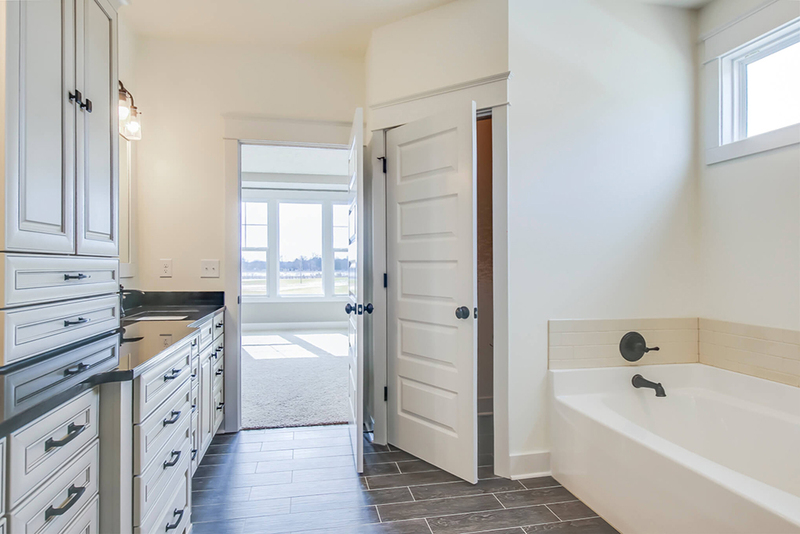 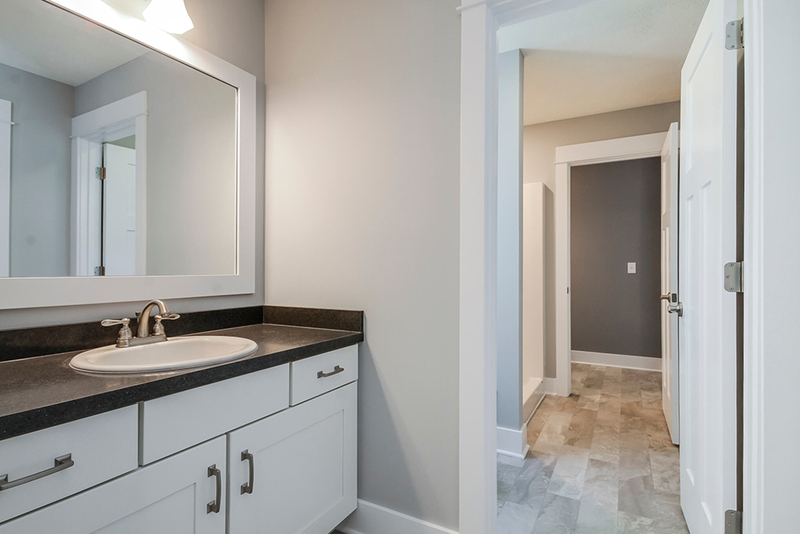 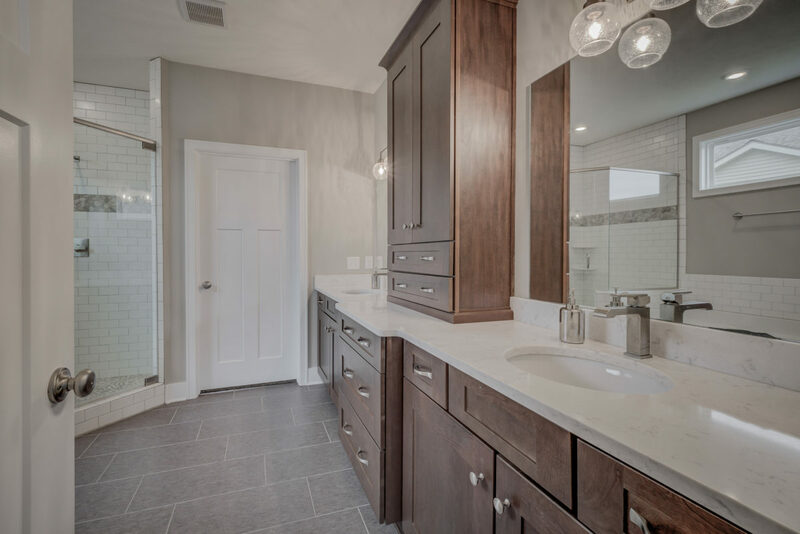 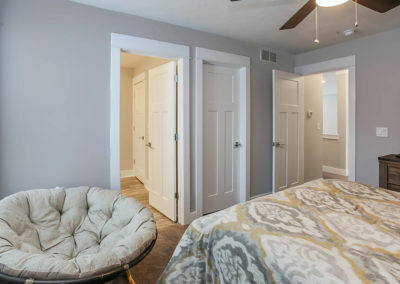 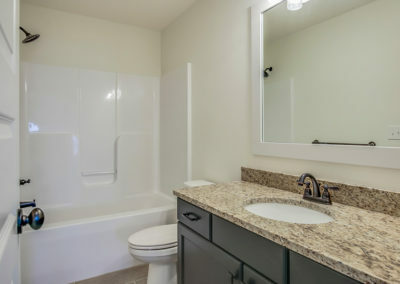 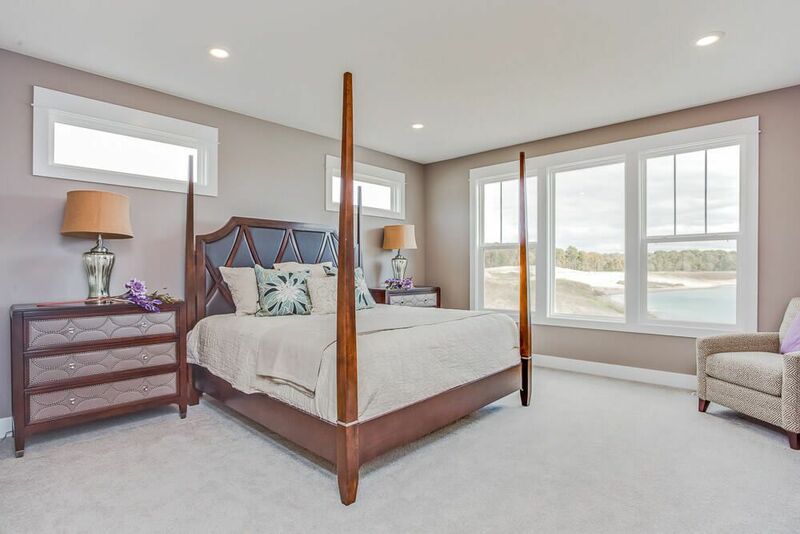 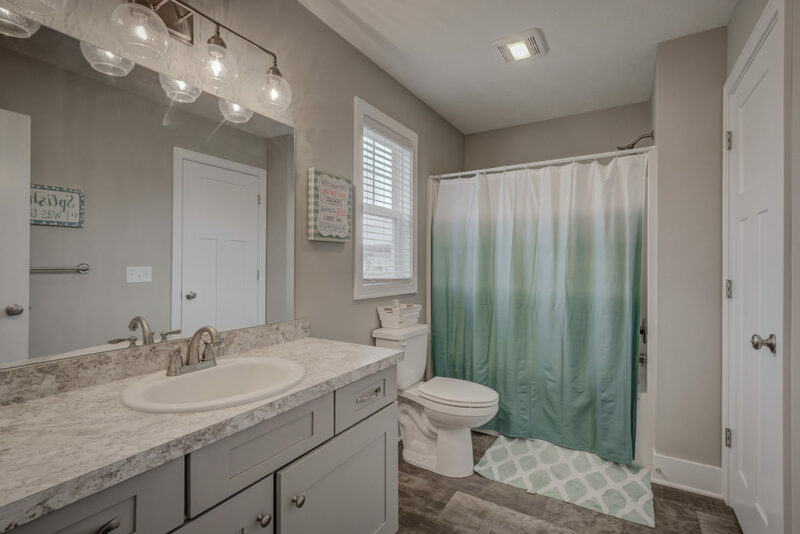 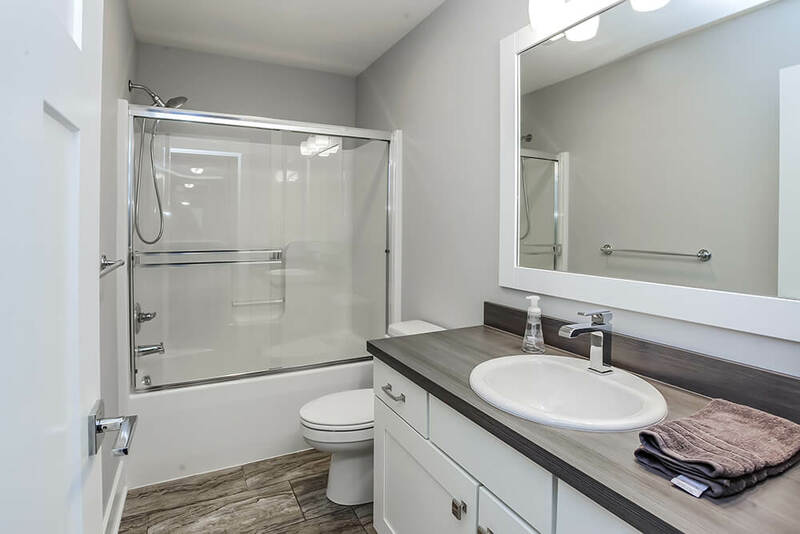 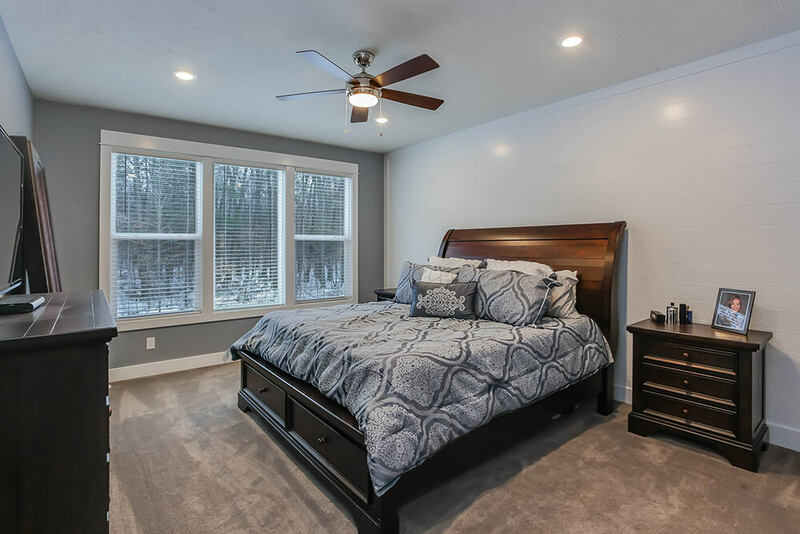 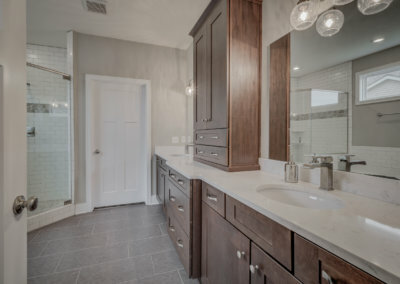 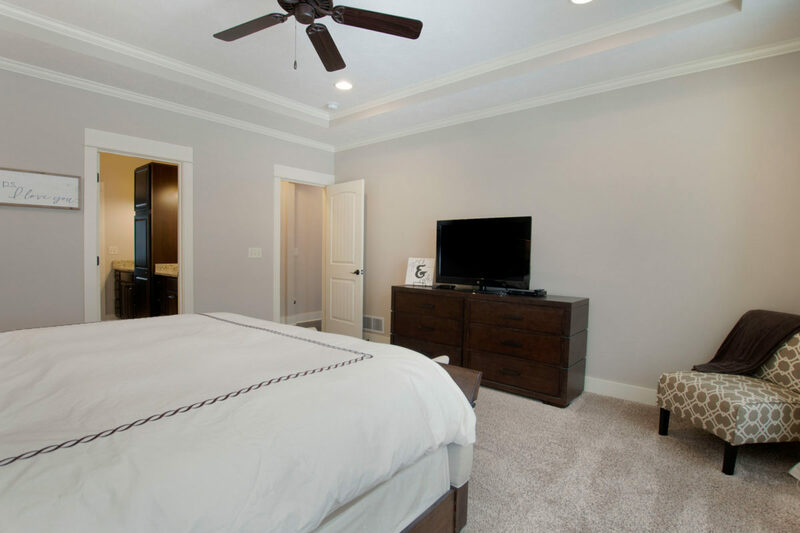 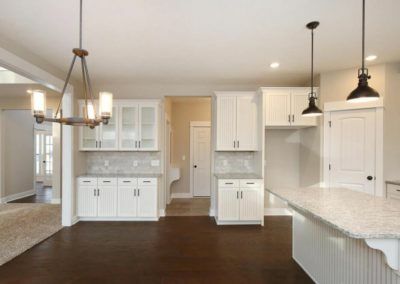 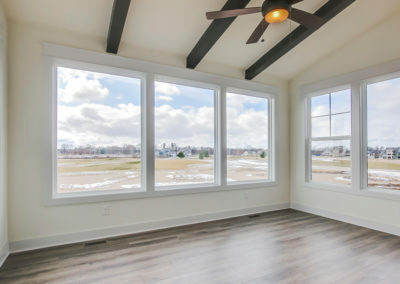 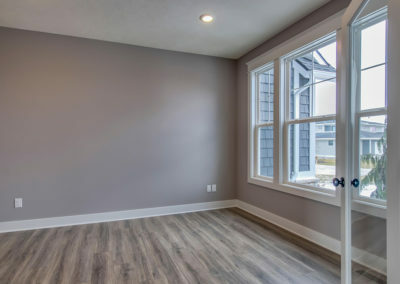 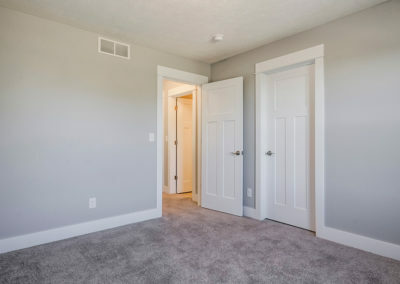 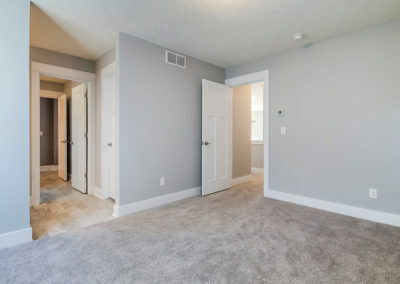 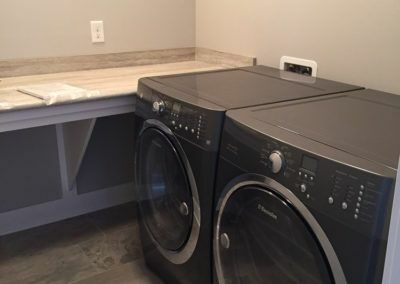 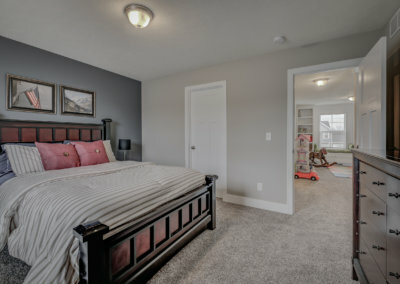 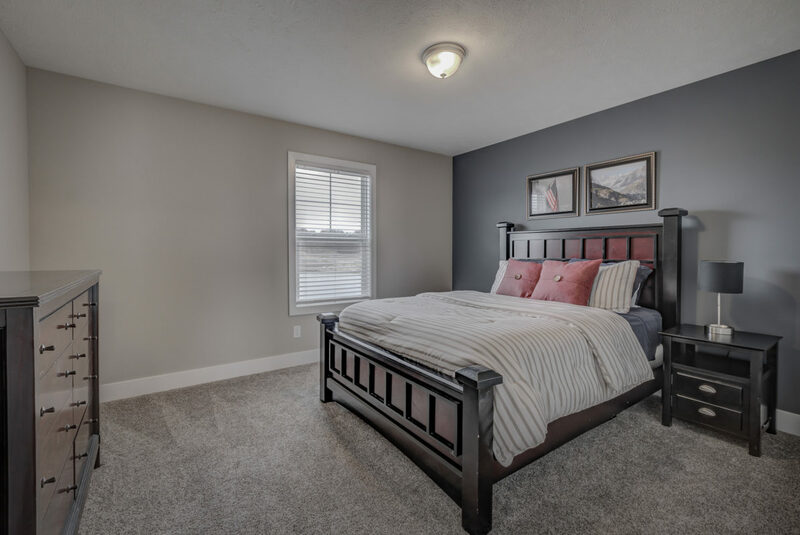 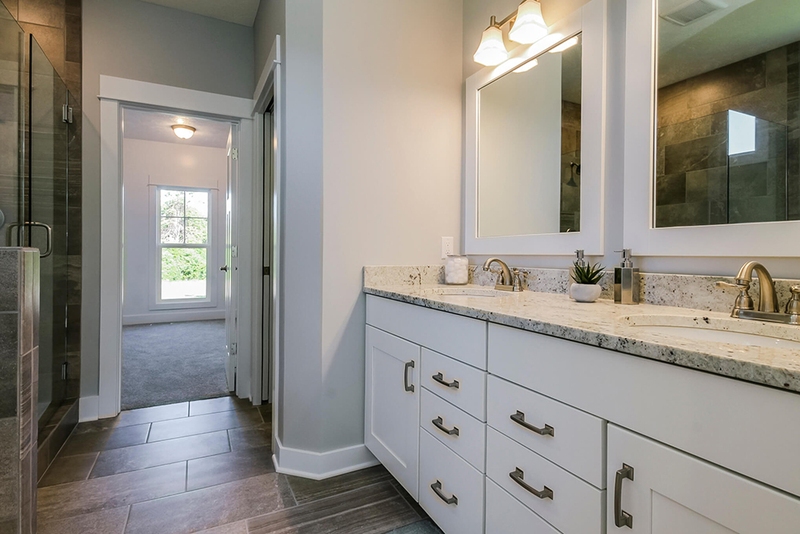 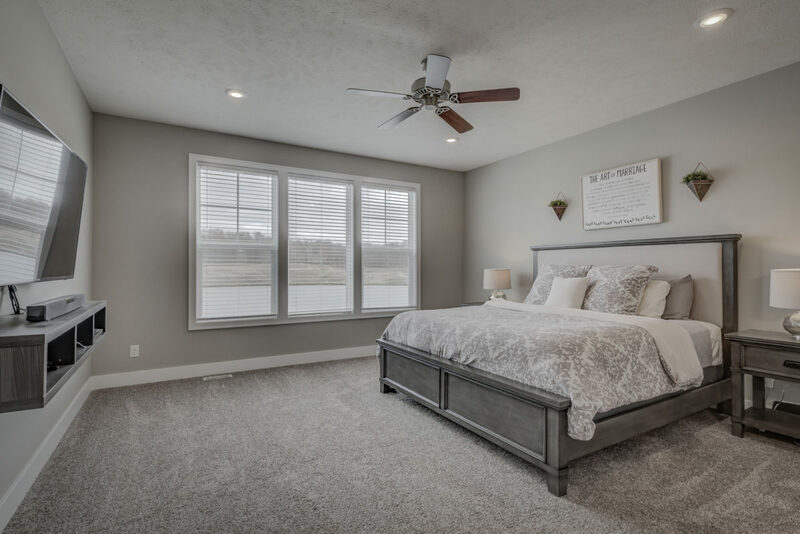 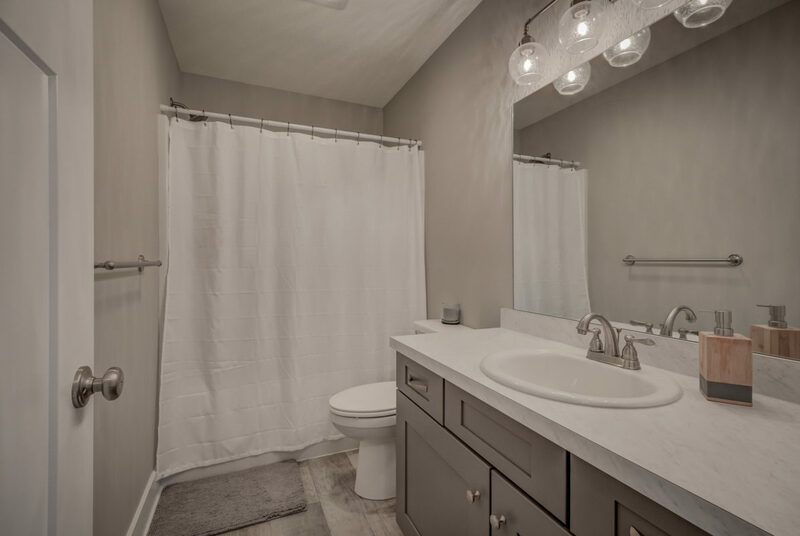 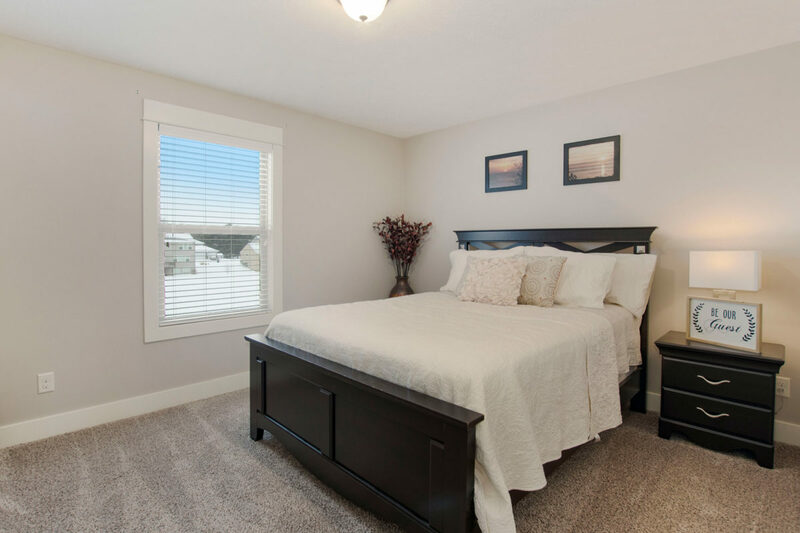 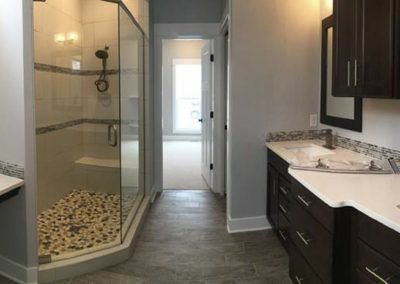 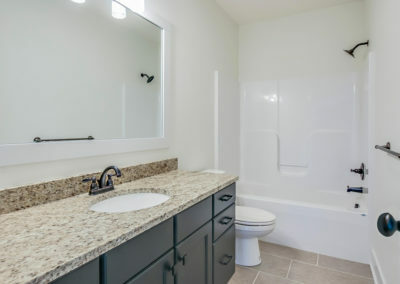 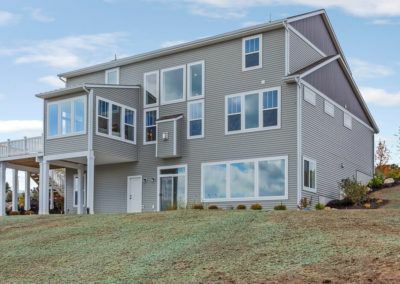 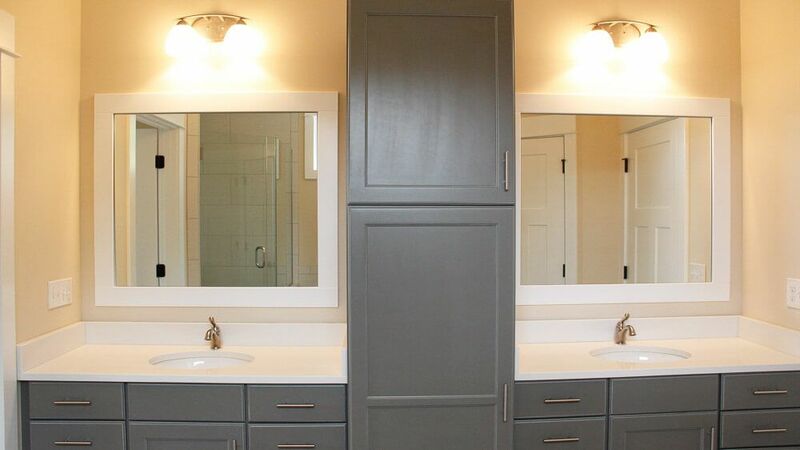 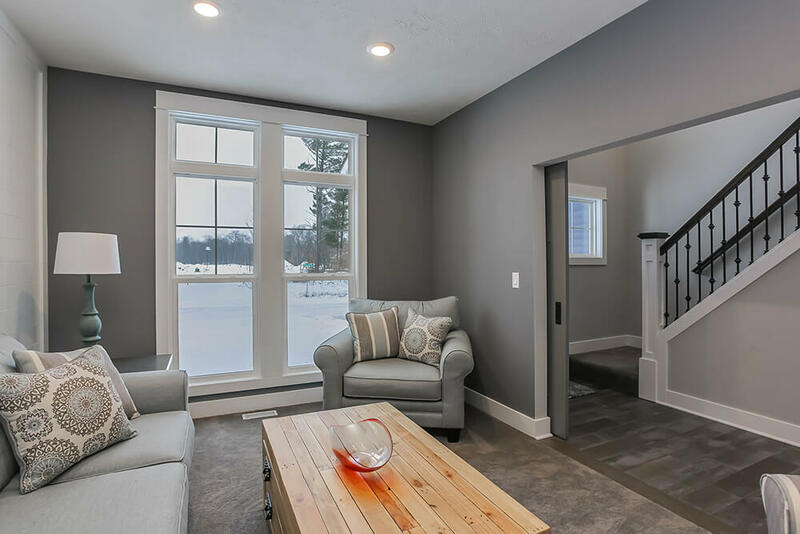 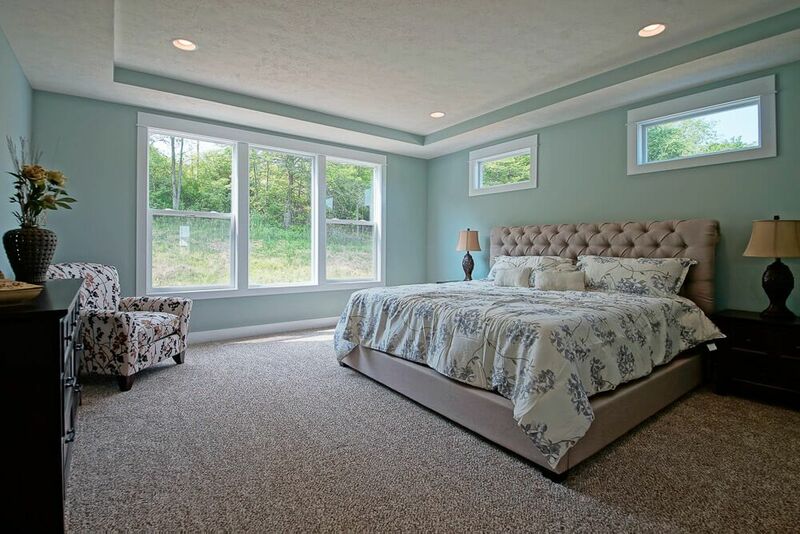 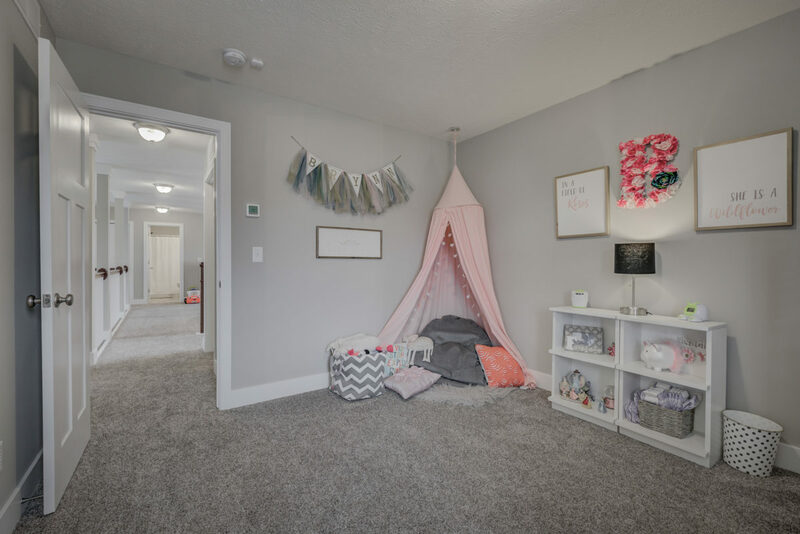 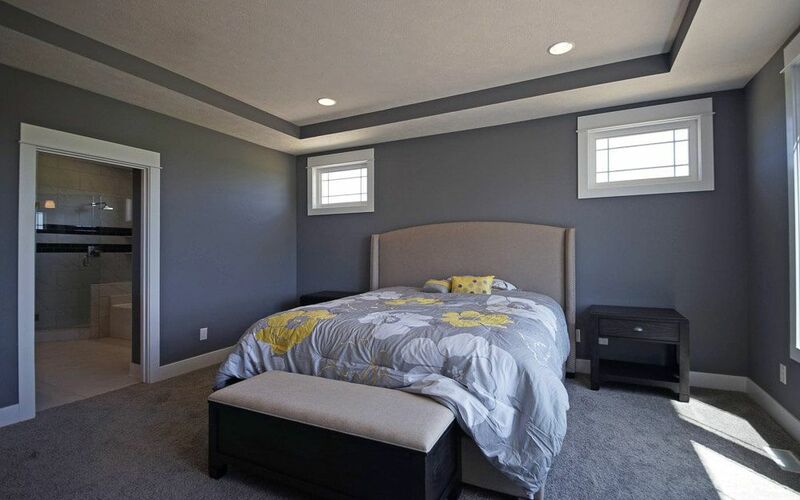 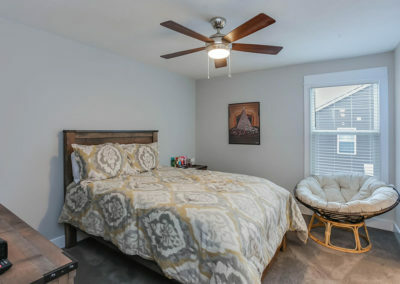 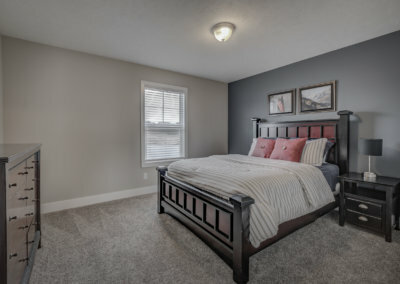 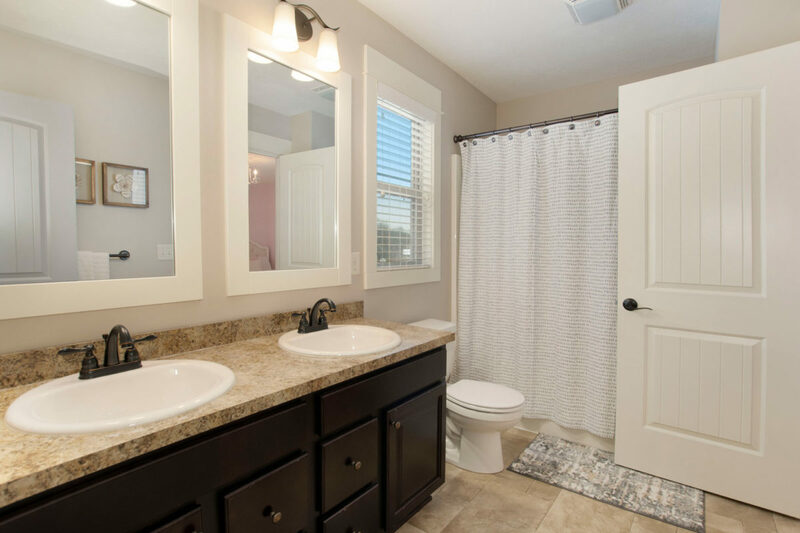 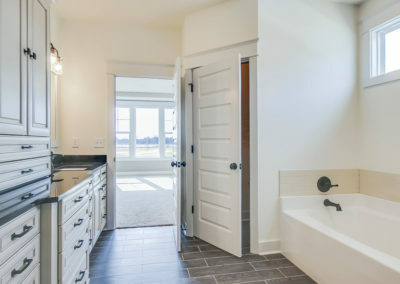 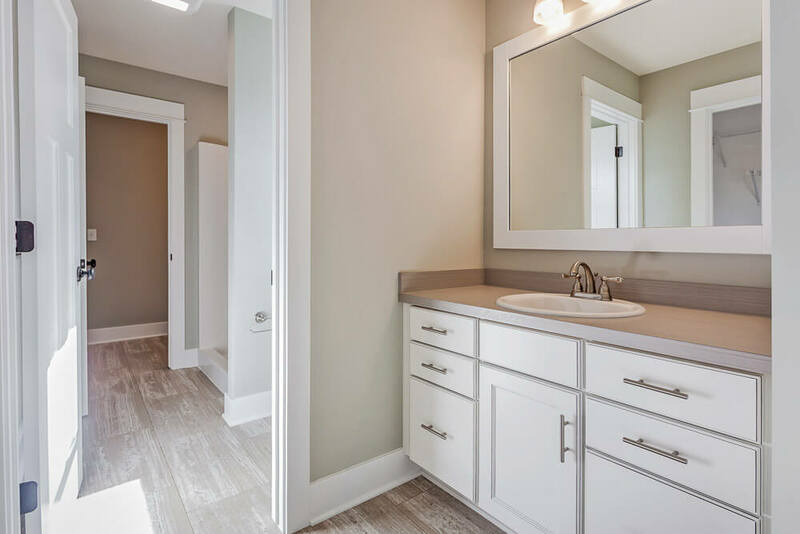 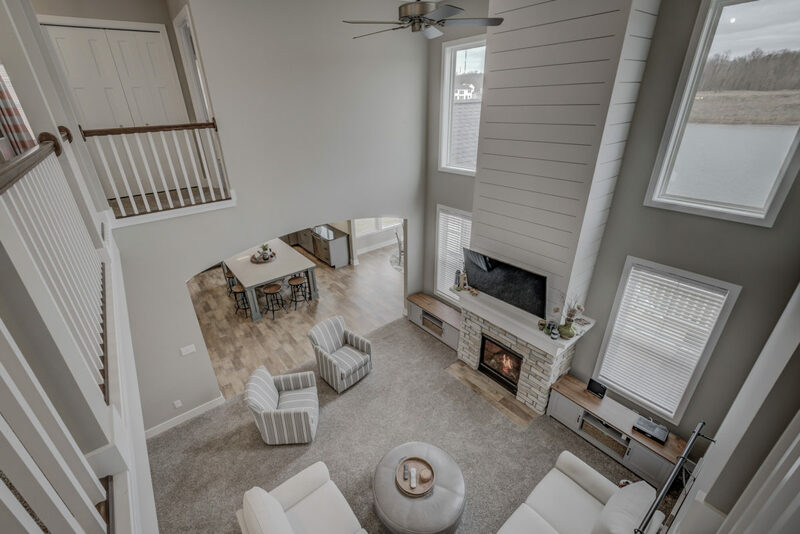 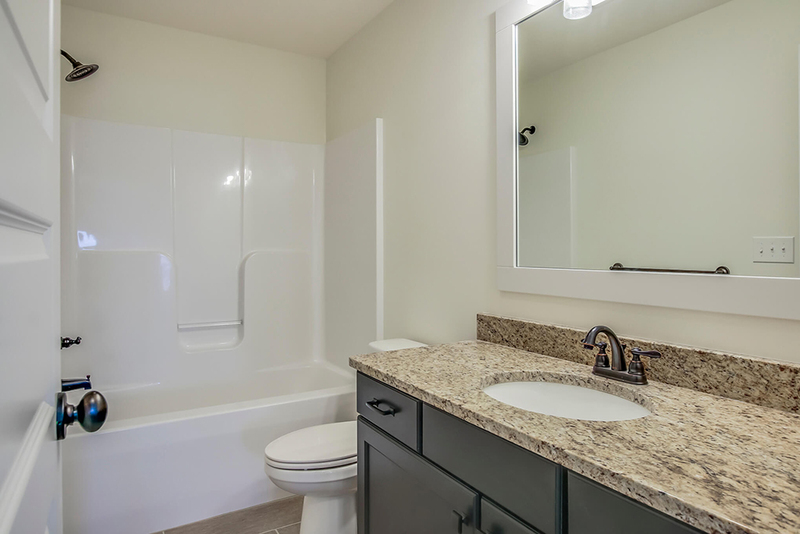 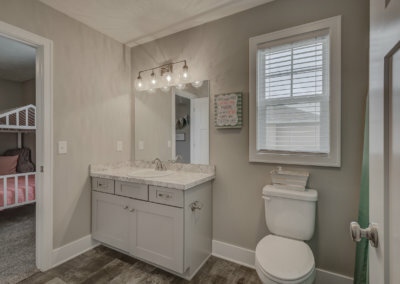 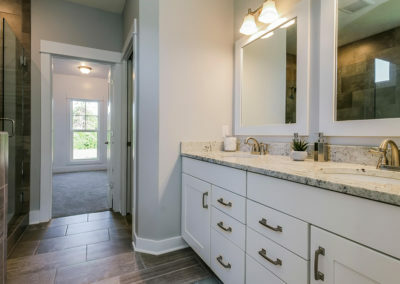 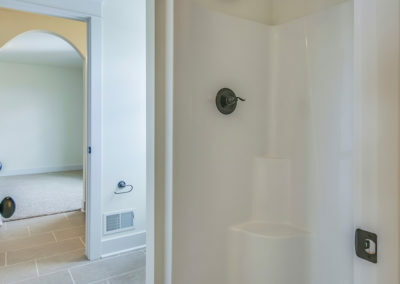 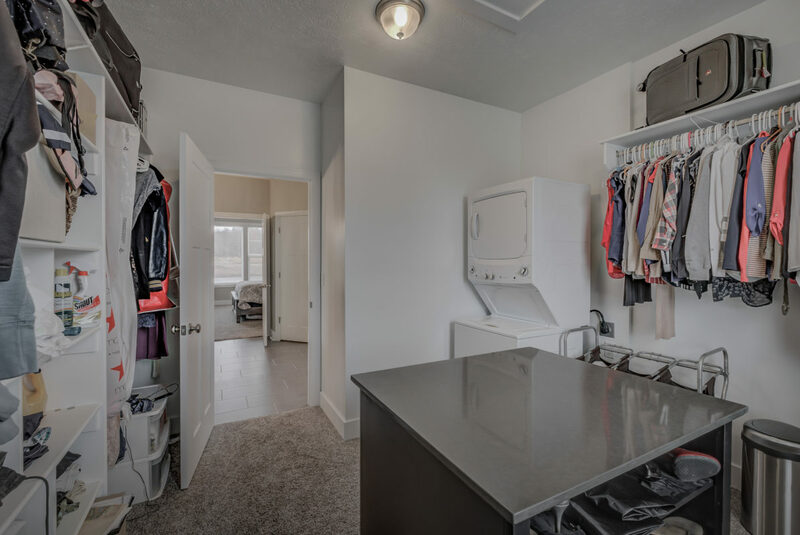 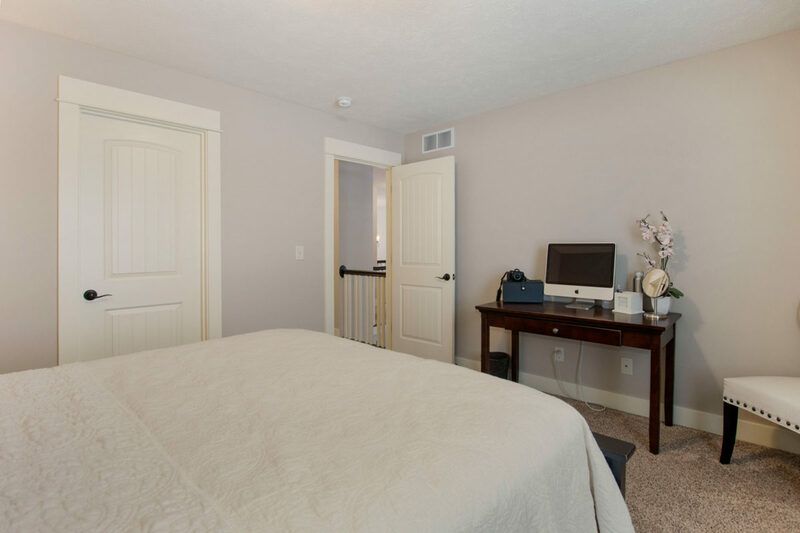 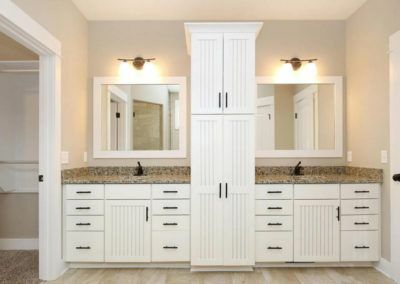 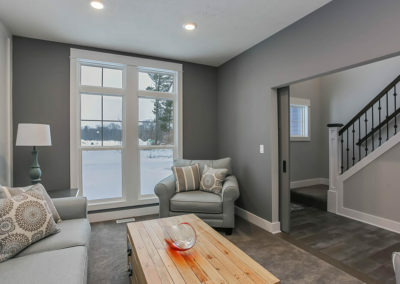 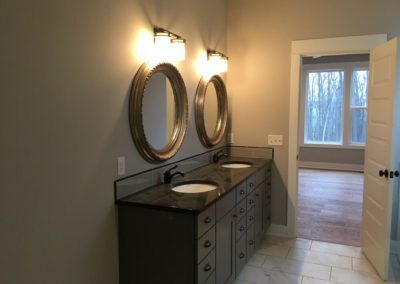 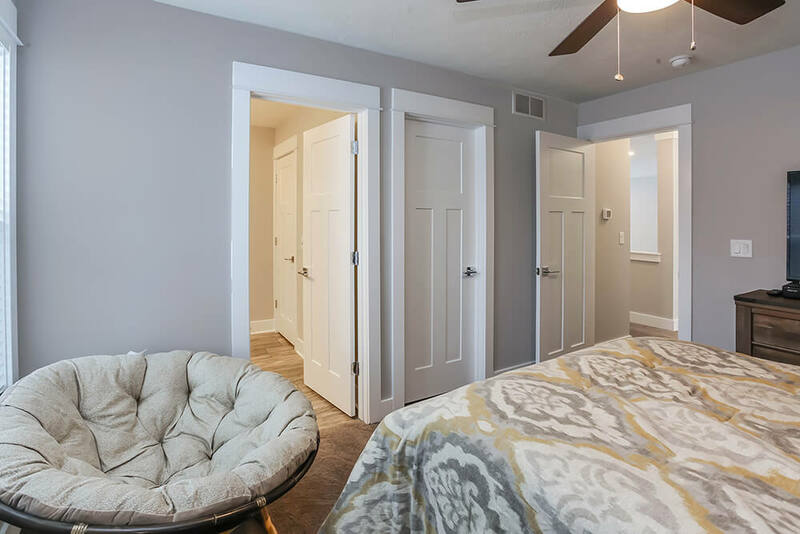 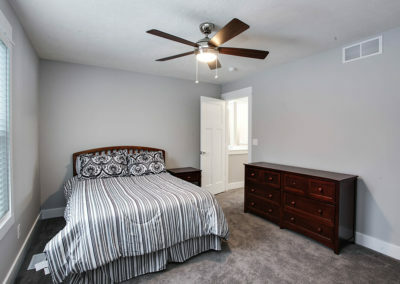 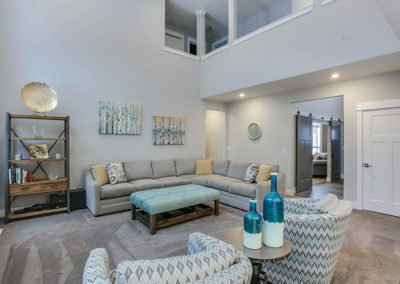 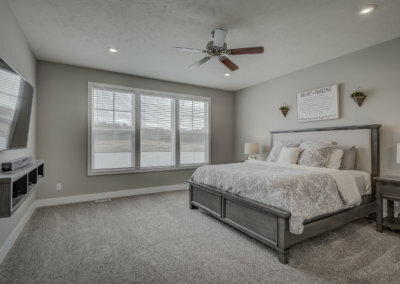 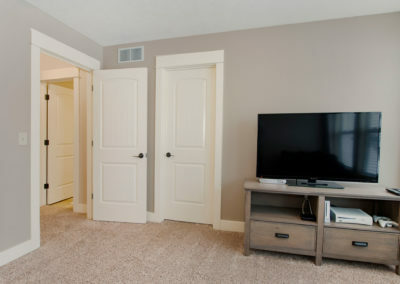 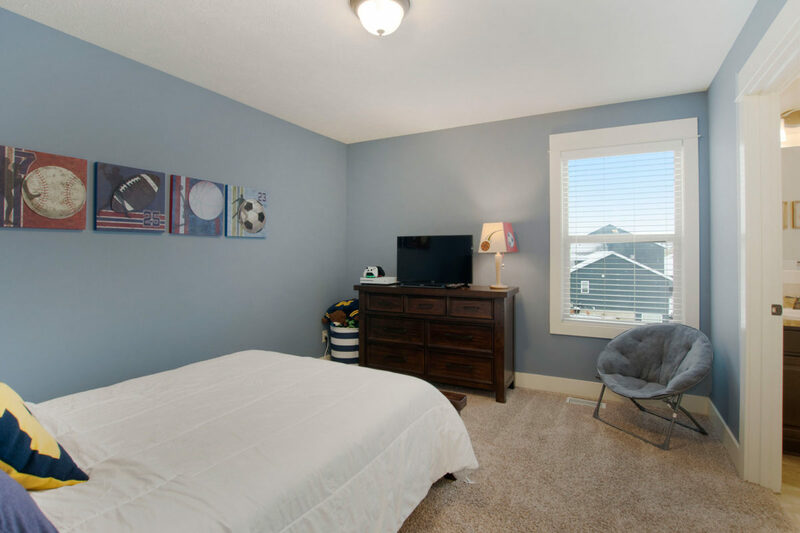 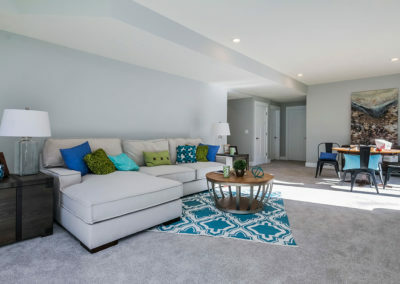 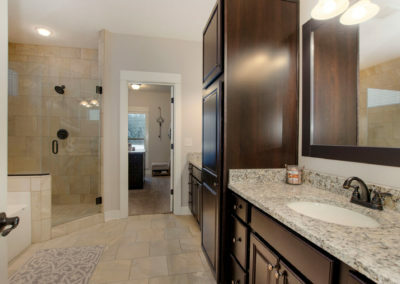 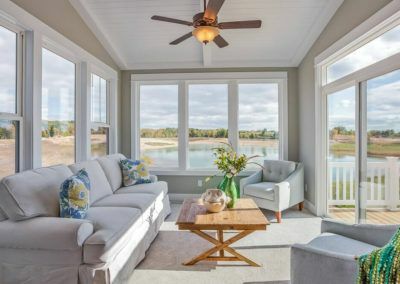 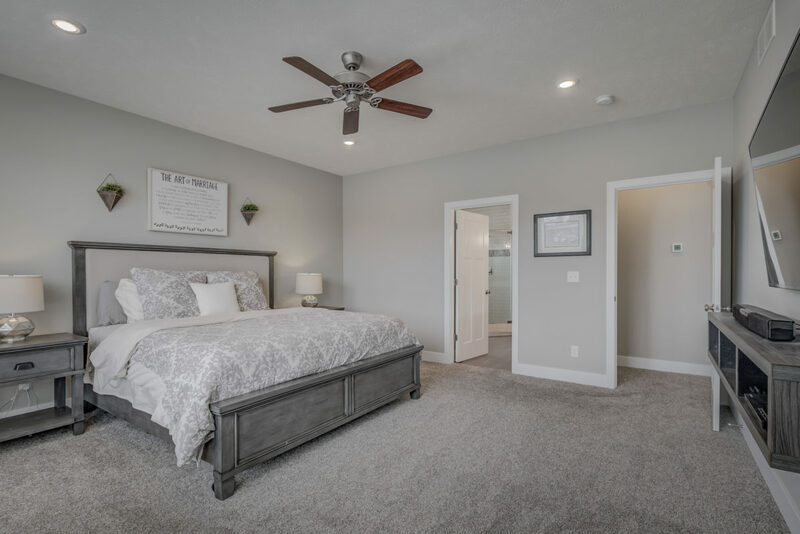 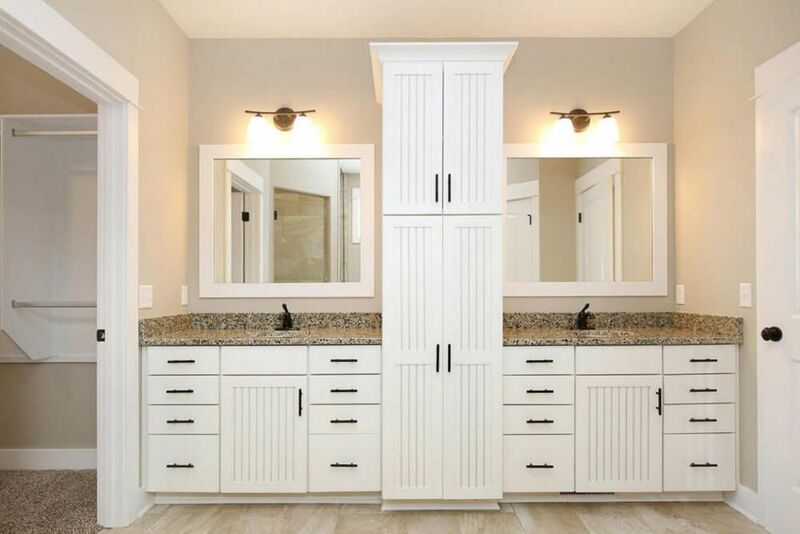 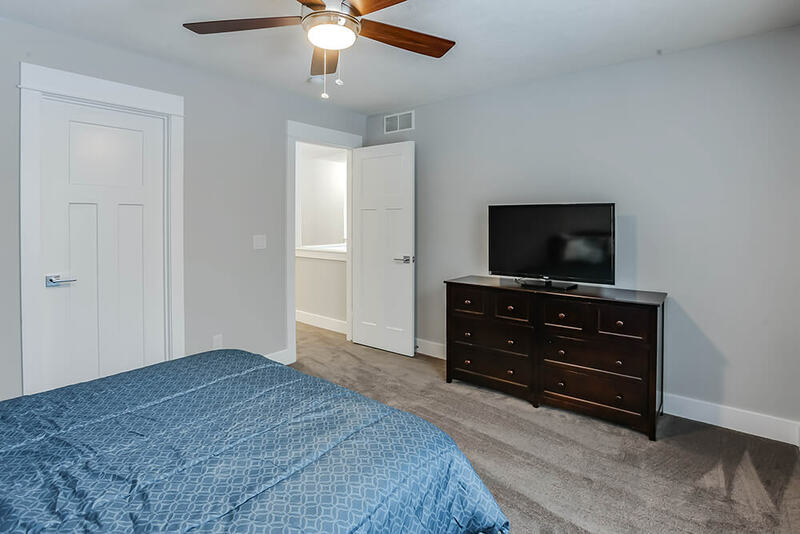 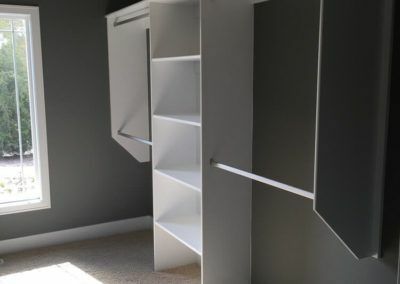 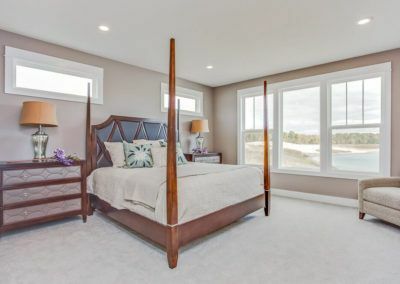 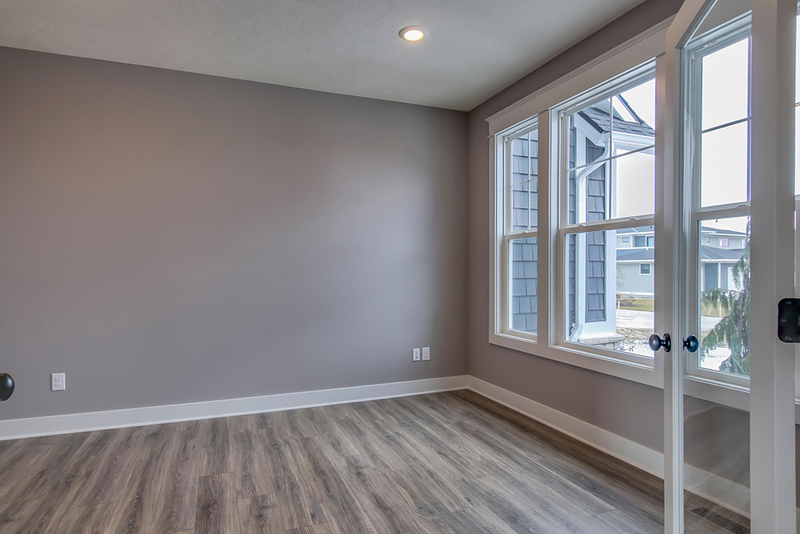 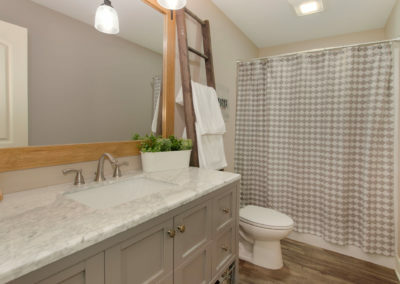 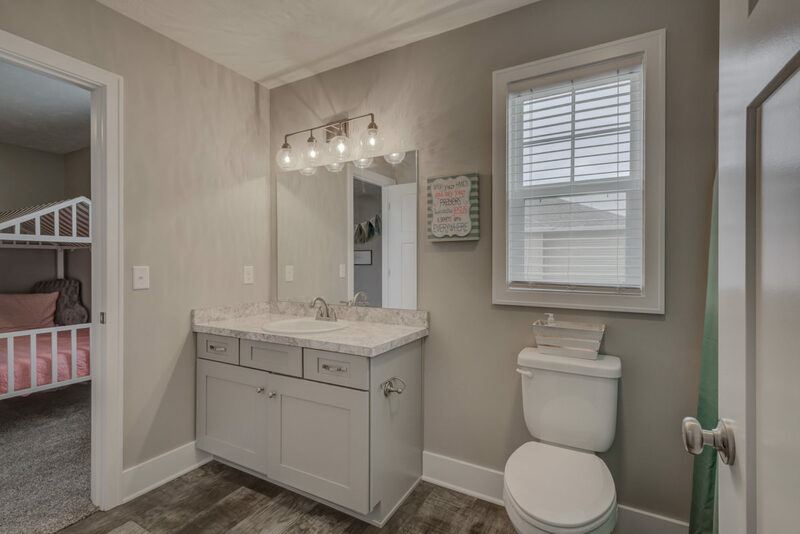 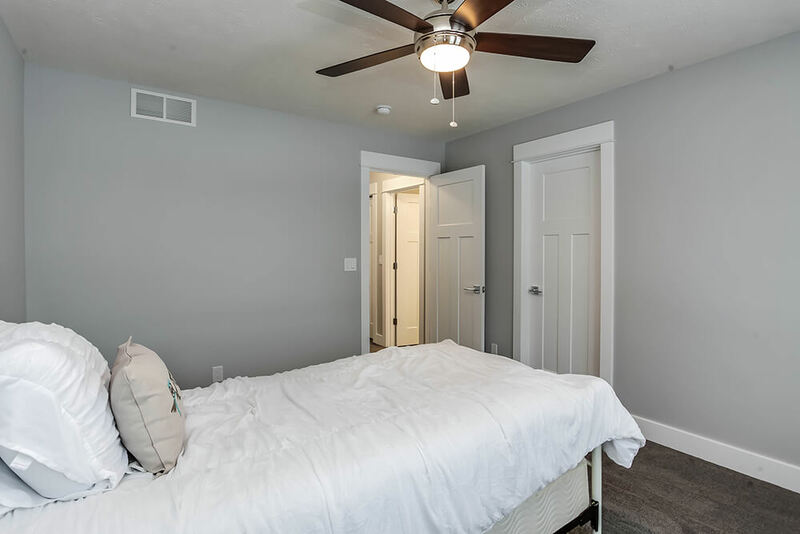 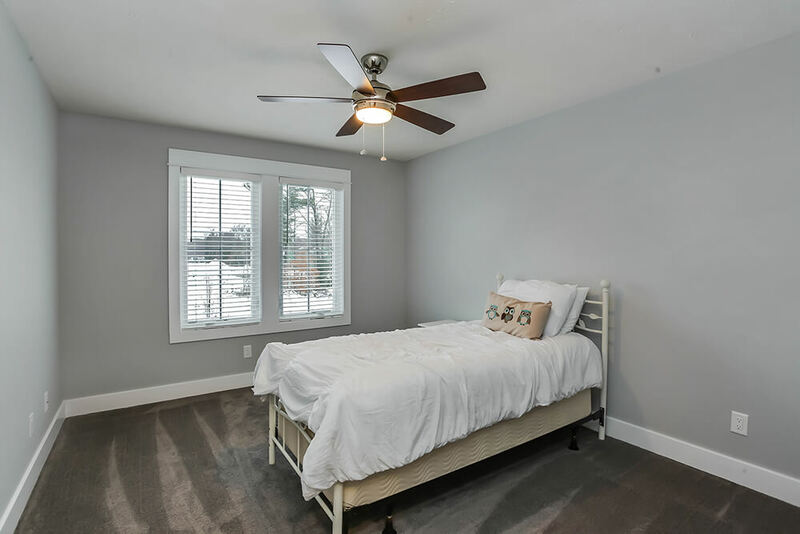 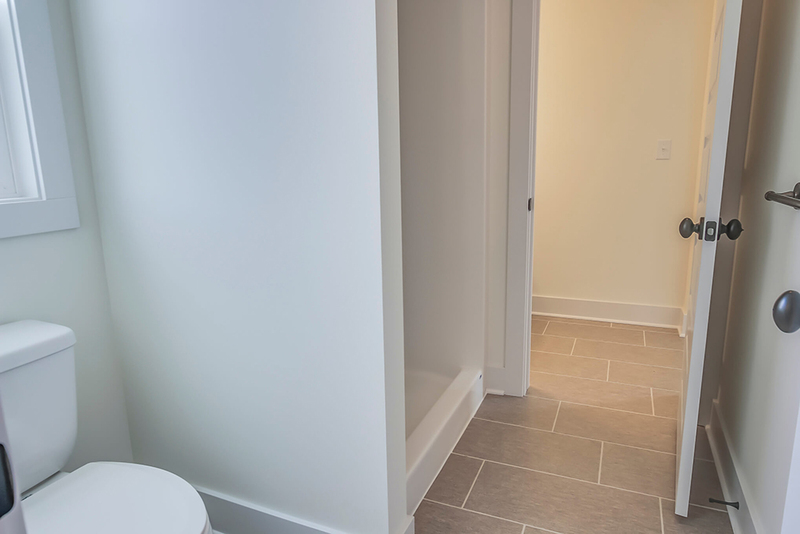 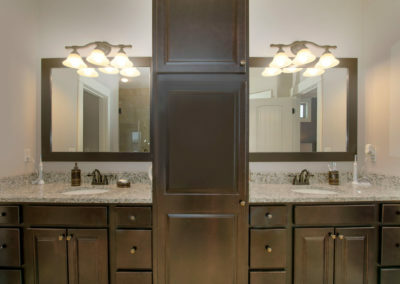 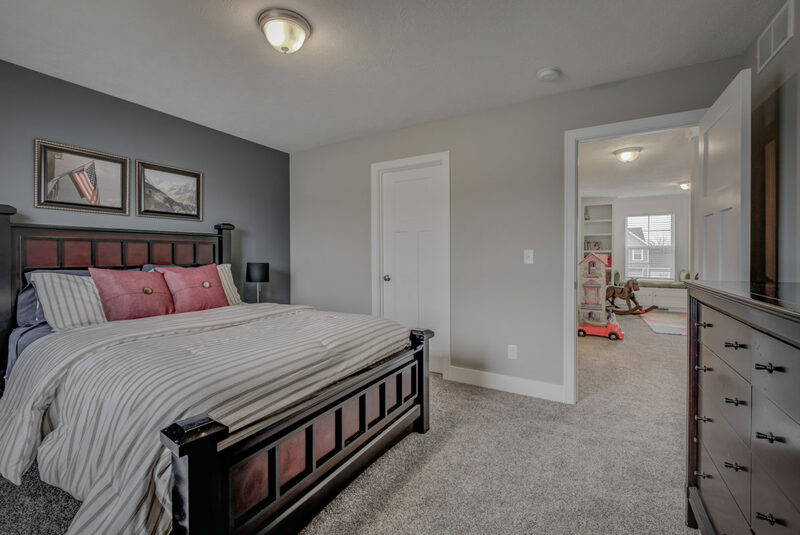 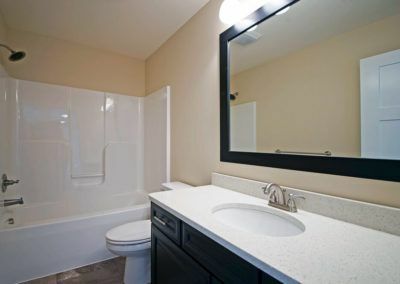 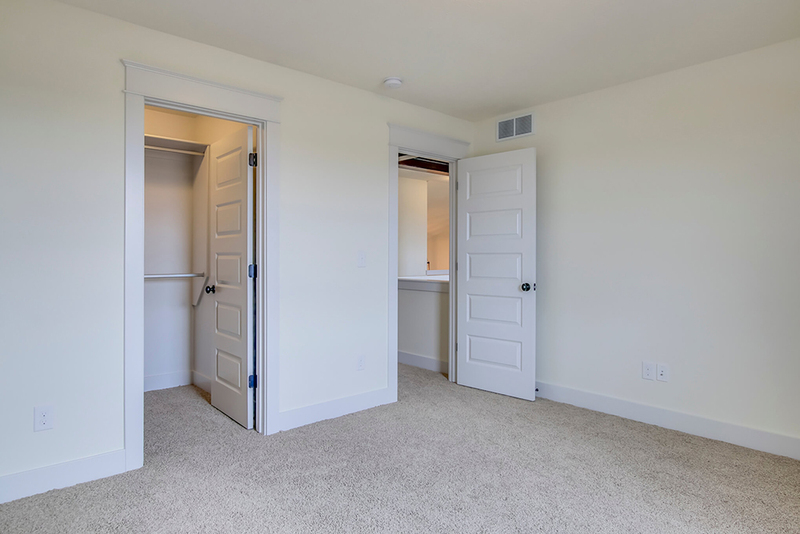 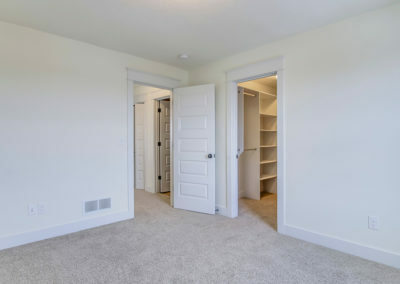 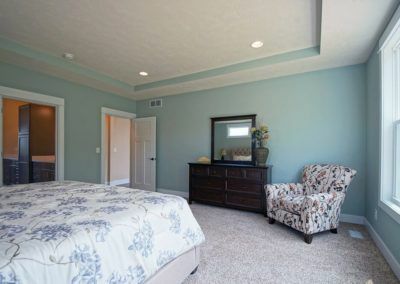 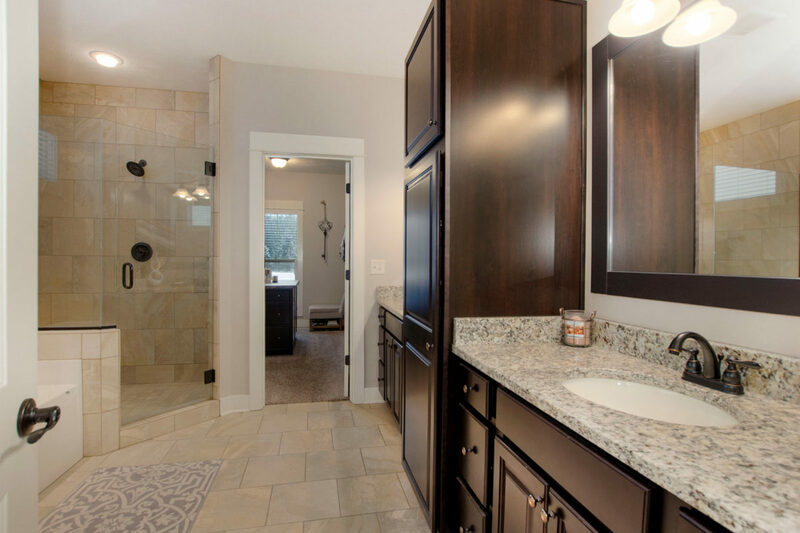 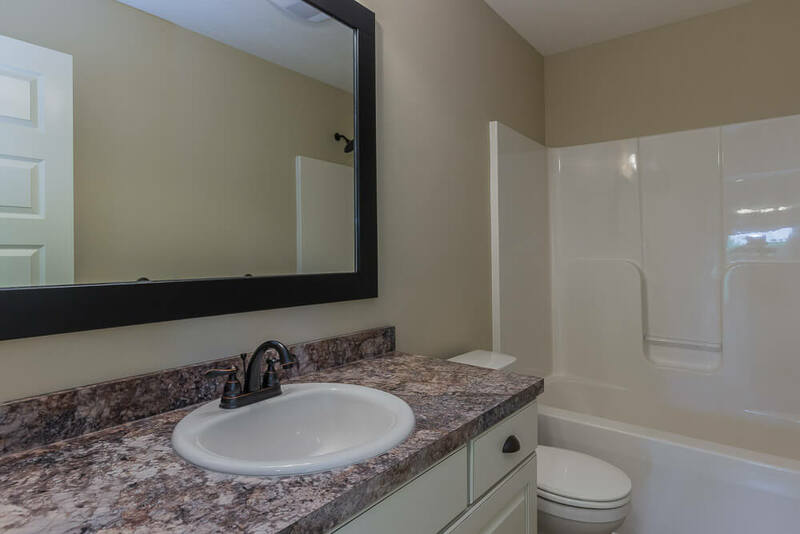 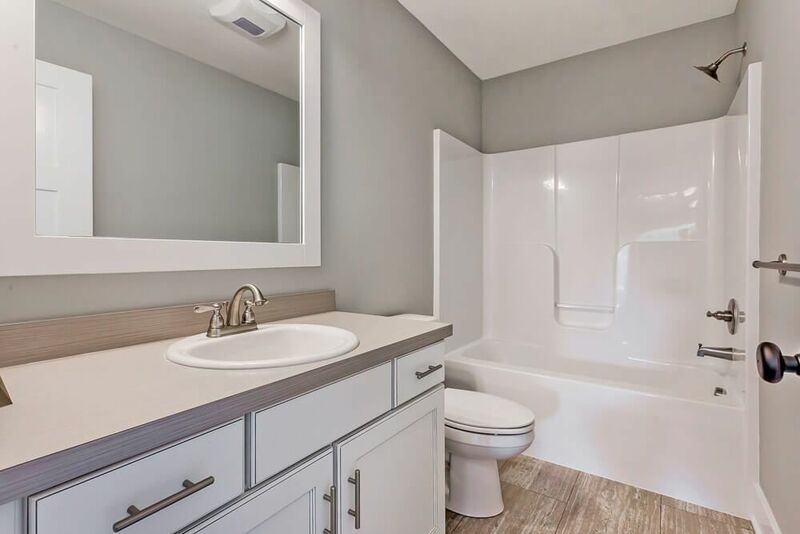 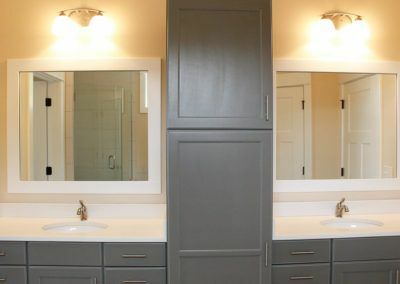 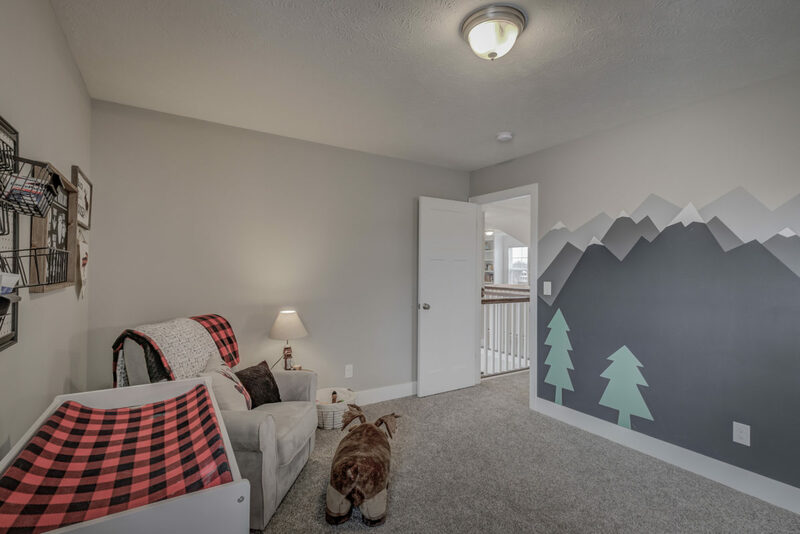 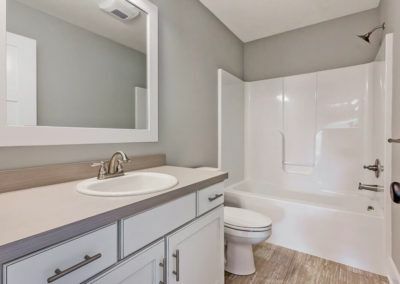 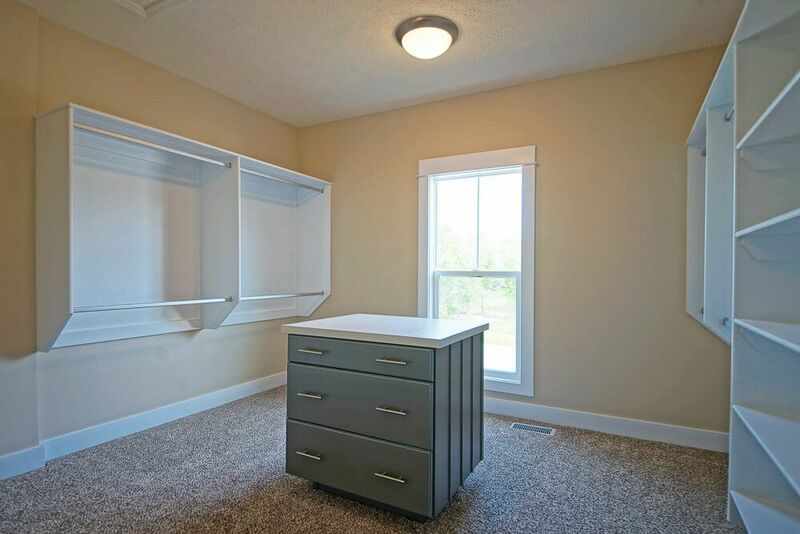 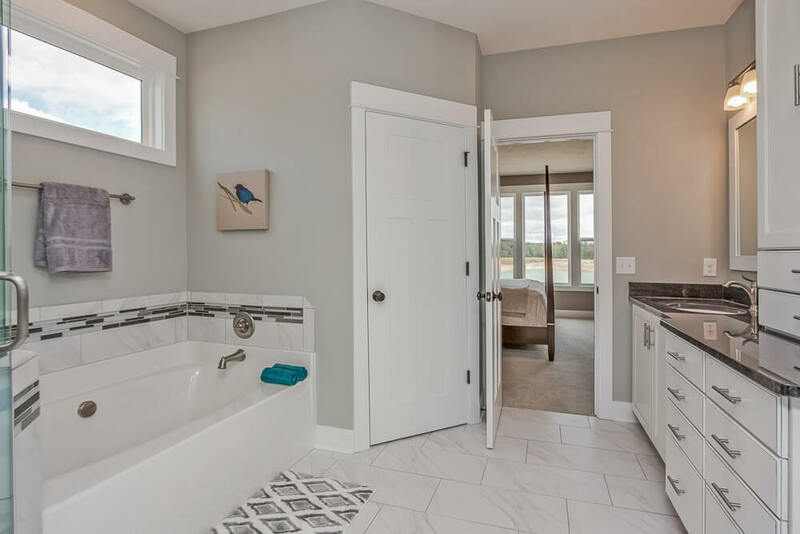 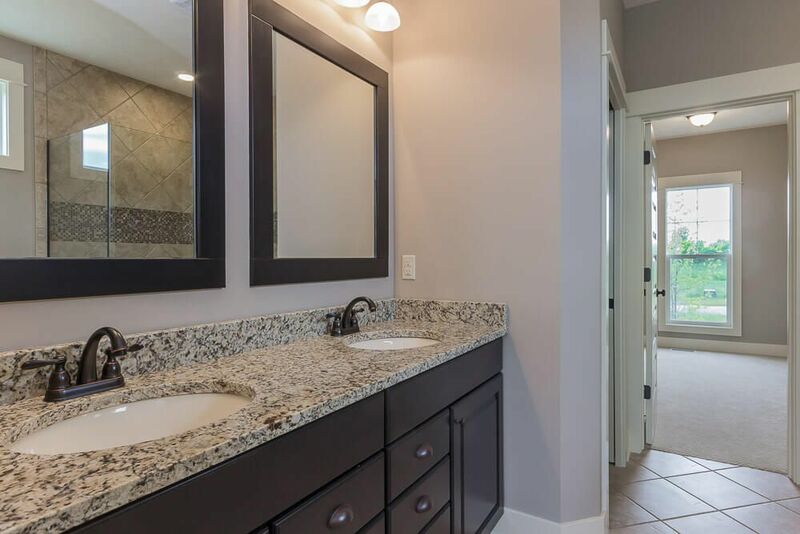 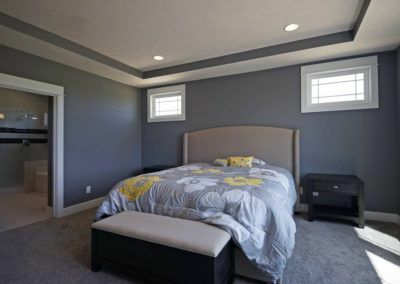 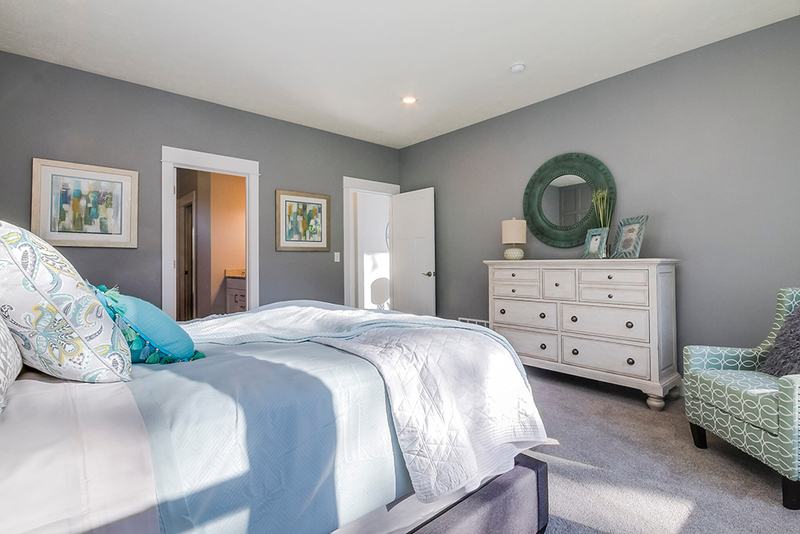 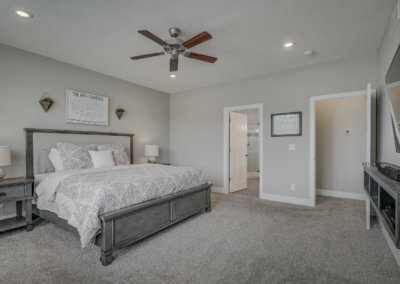 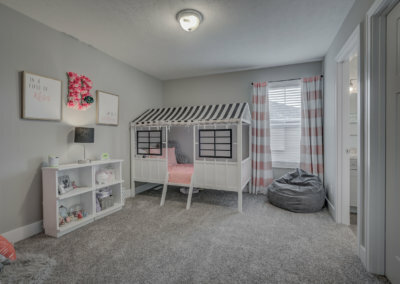 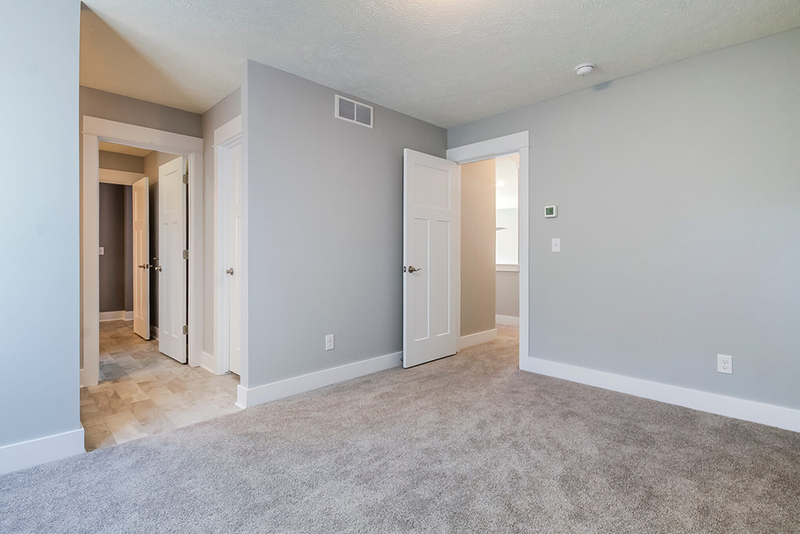 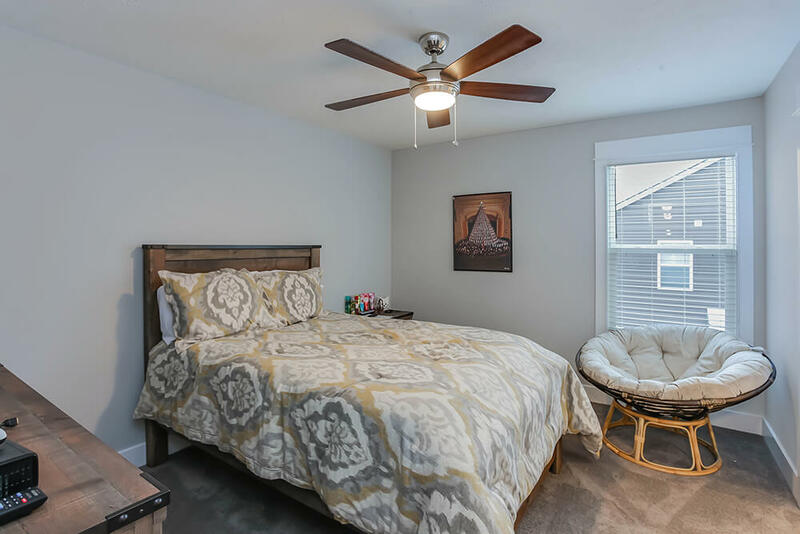 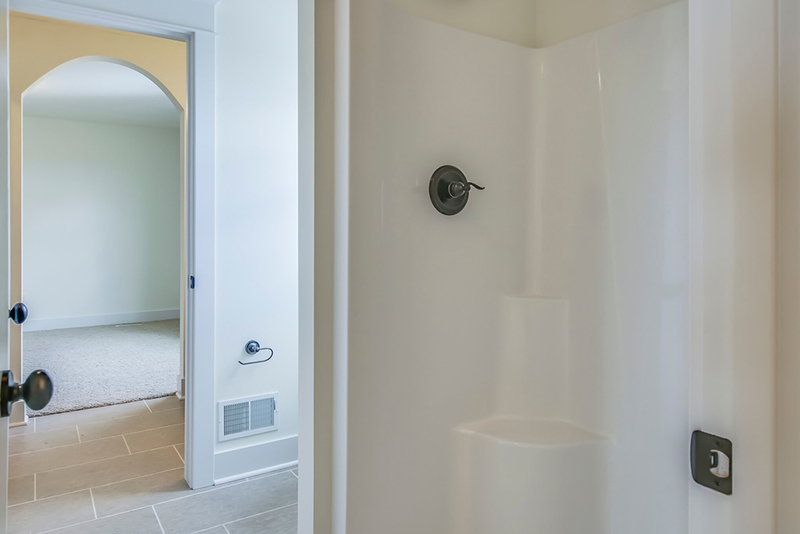 The master suite incorporates a generous master bedroom, a four-piece master bath with soaking tub, step-in shower, and double sink, and a spacious walk-in closet with the option to add washer and dryer hook-ups. 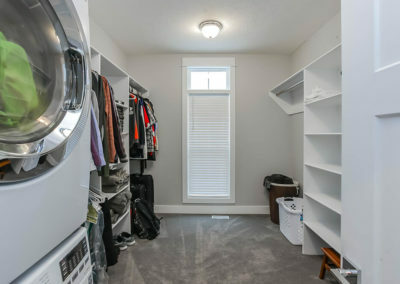 And if you want even more space in the master suit, it can be expanded to offer an additional seventy-eight square feet. 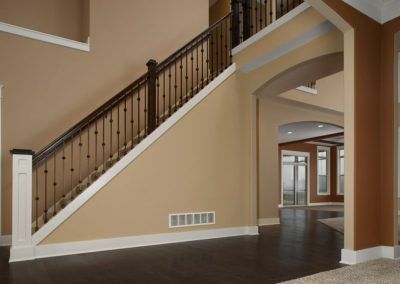 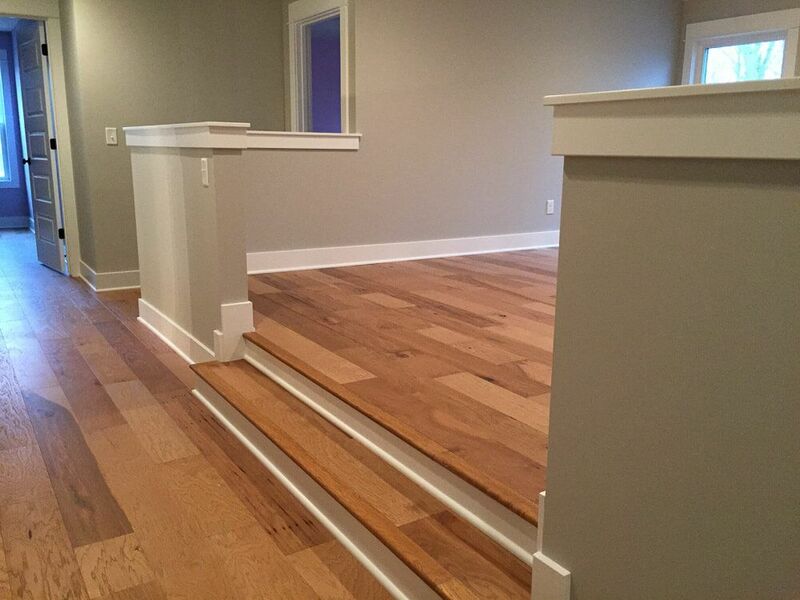 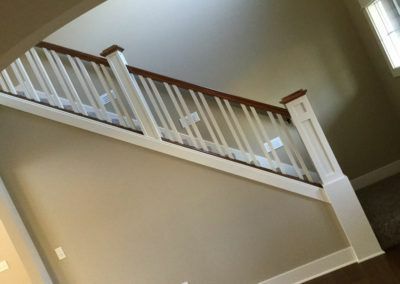 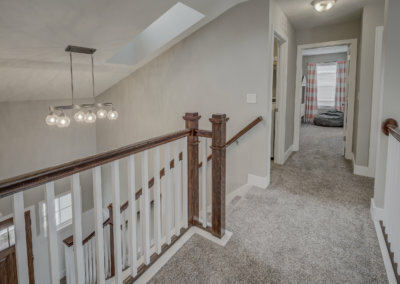 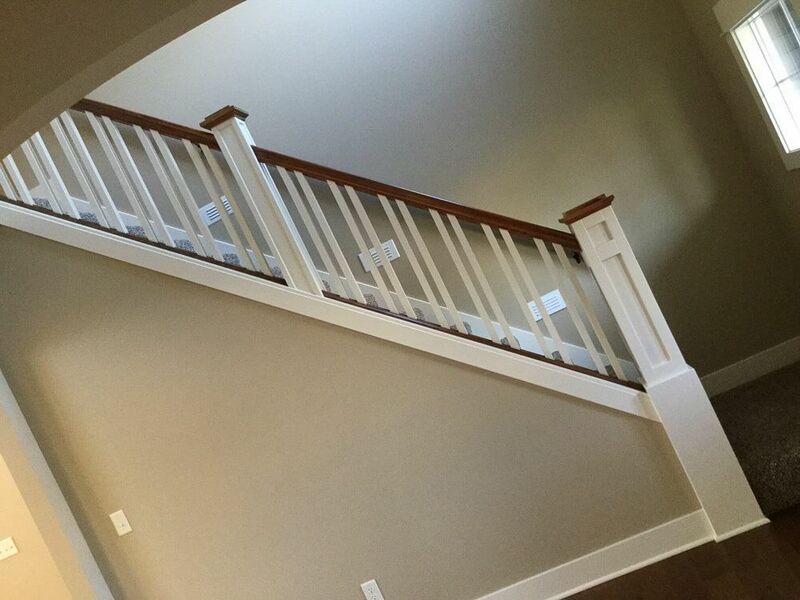 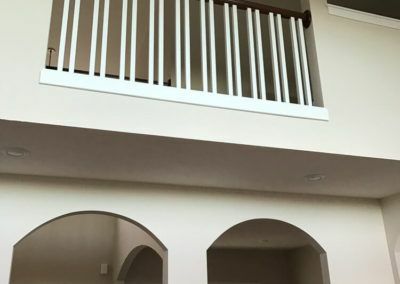 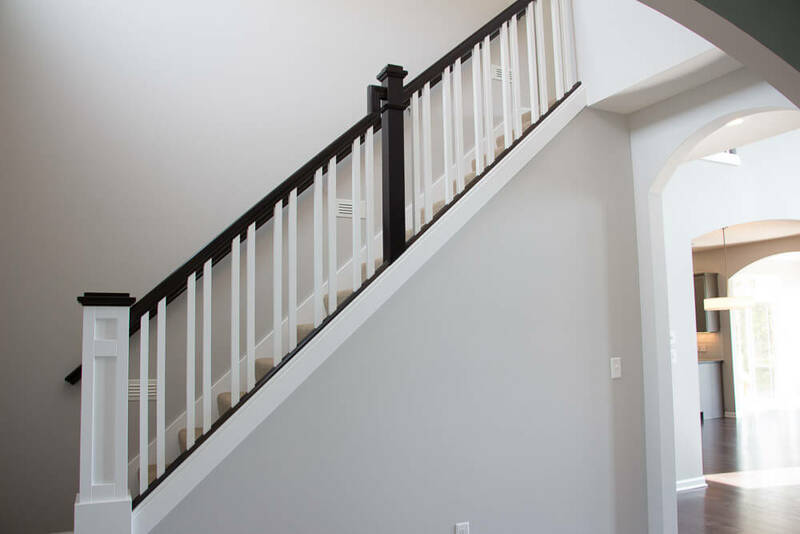 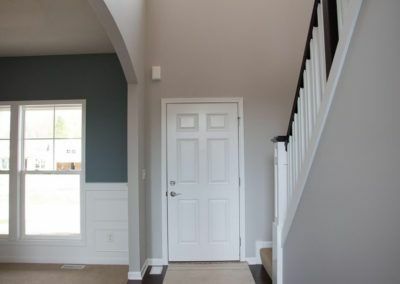 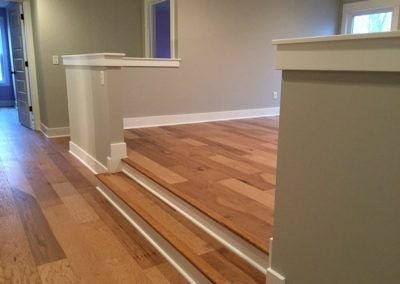 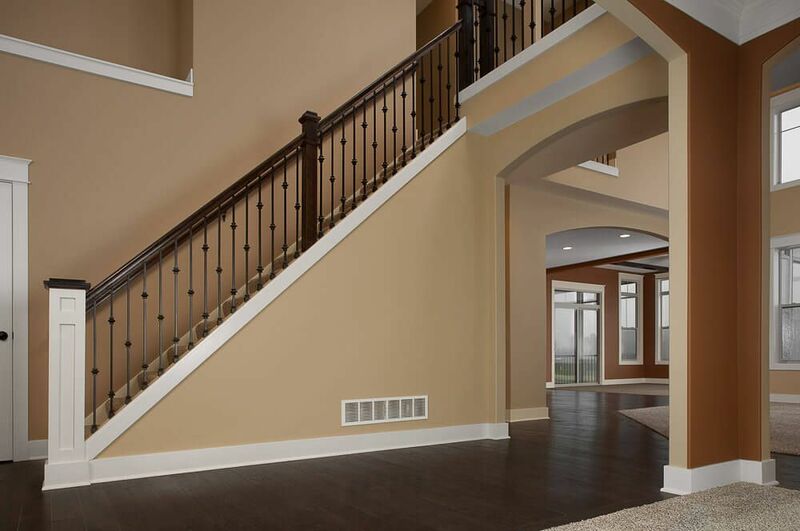 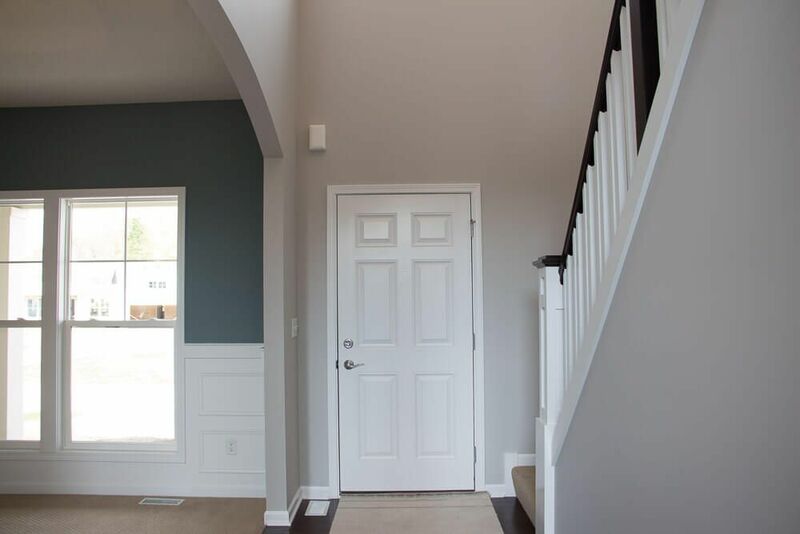 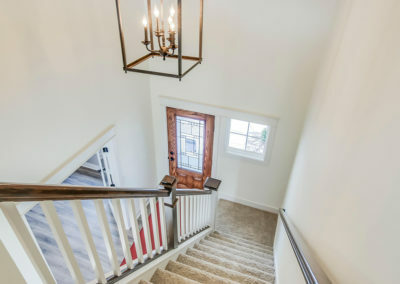 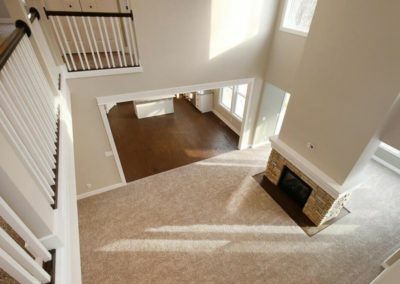 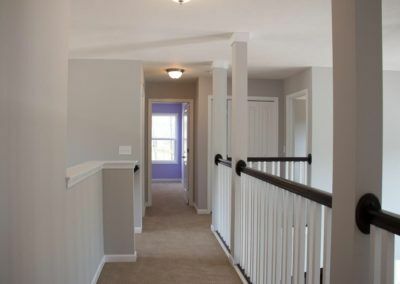 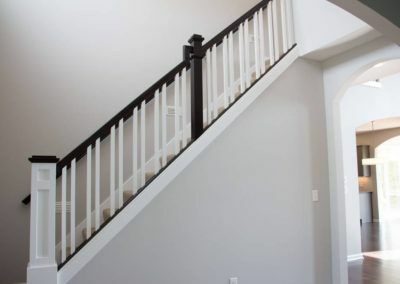 Stairs from the front foyer leads to the upper level of the Sebastian plan. 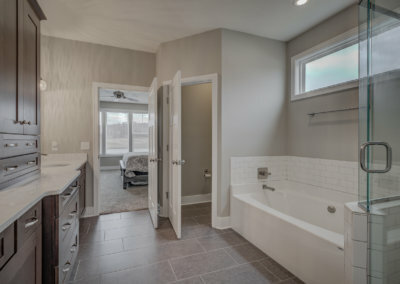 Two of the upper level bedrooms are connected into a suite via a full bath. 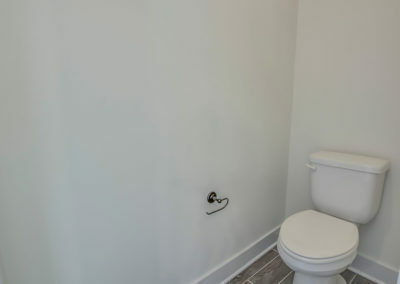 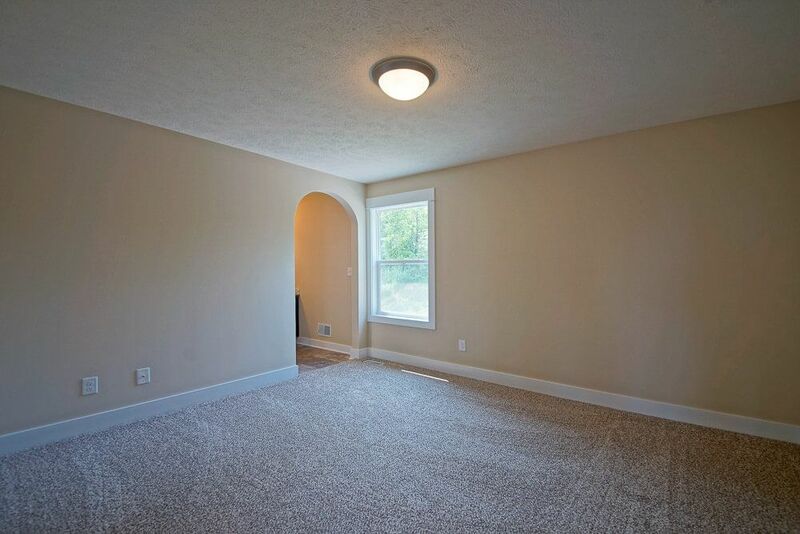 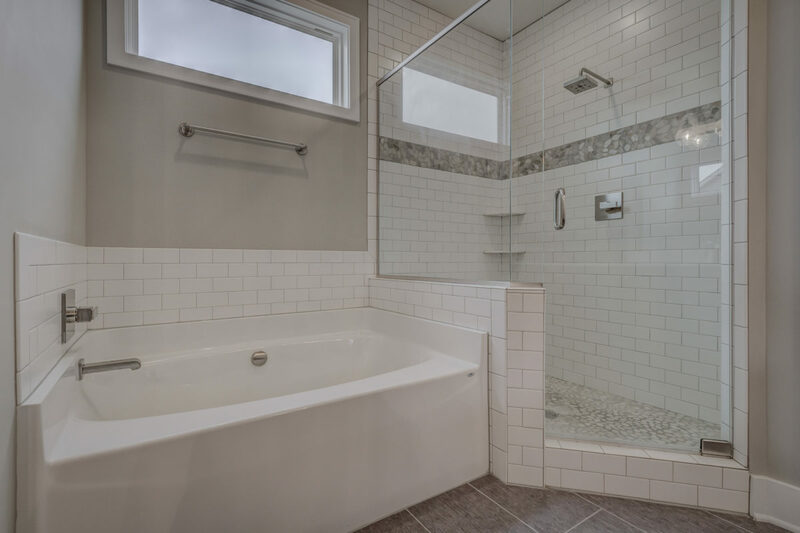 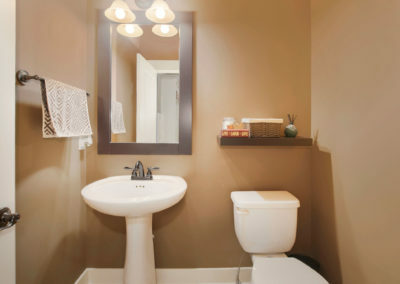 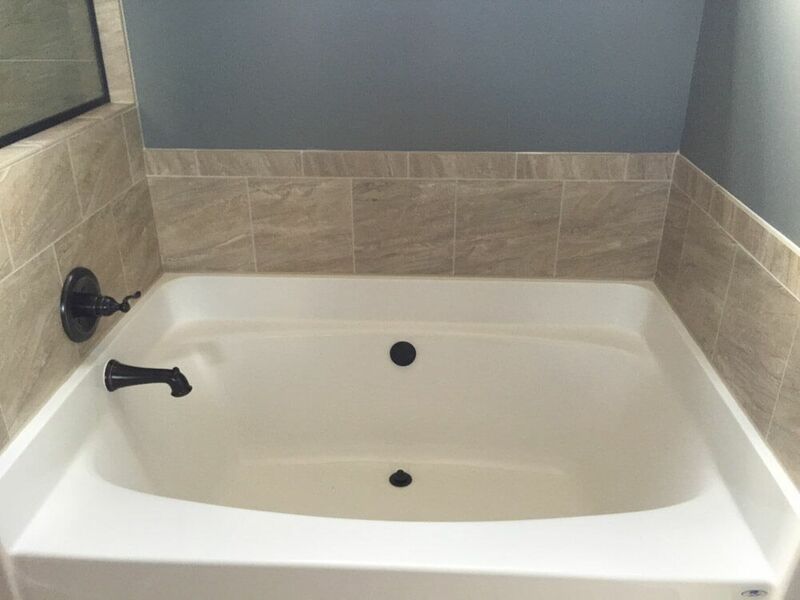 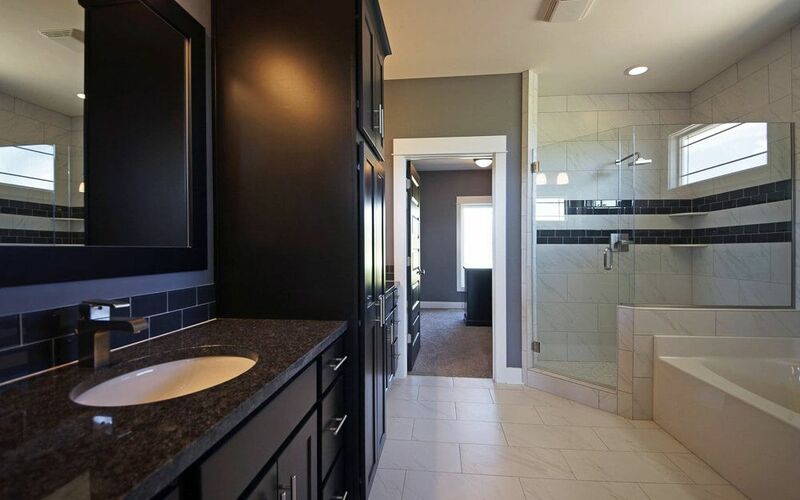 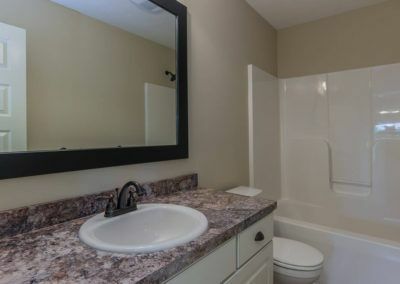 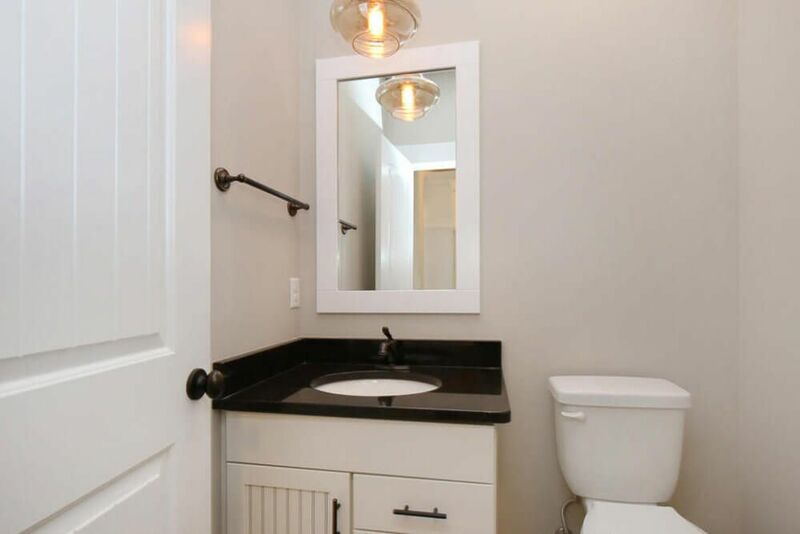 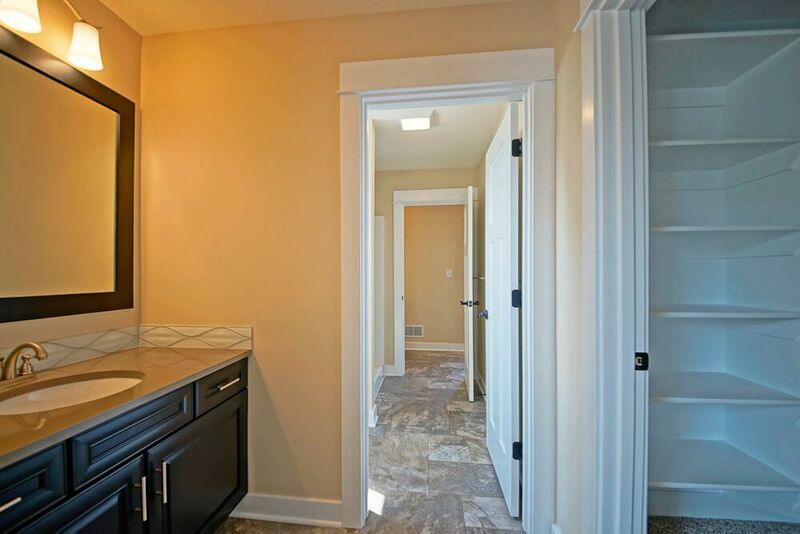 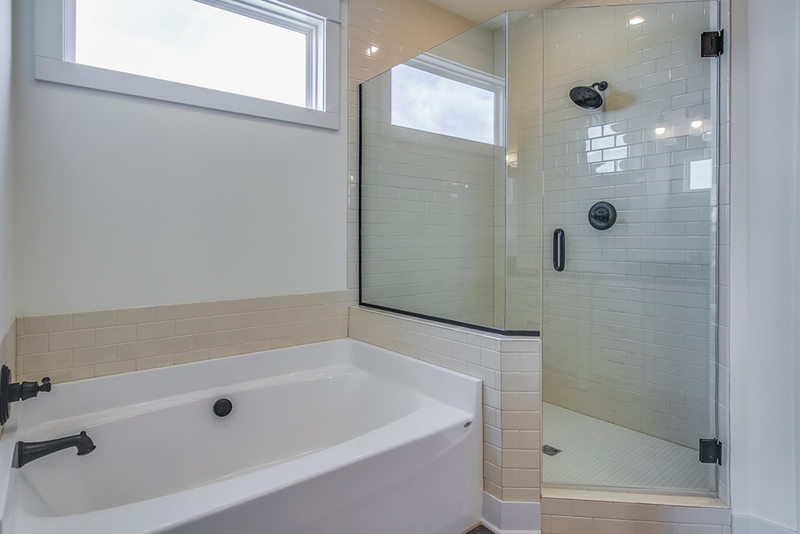 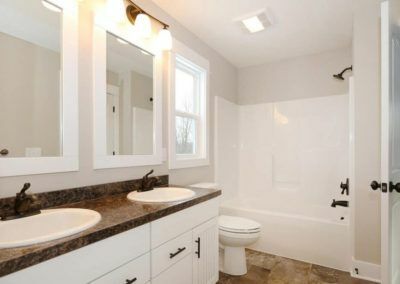 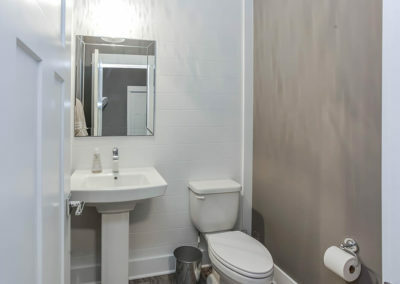 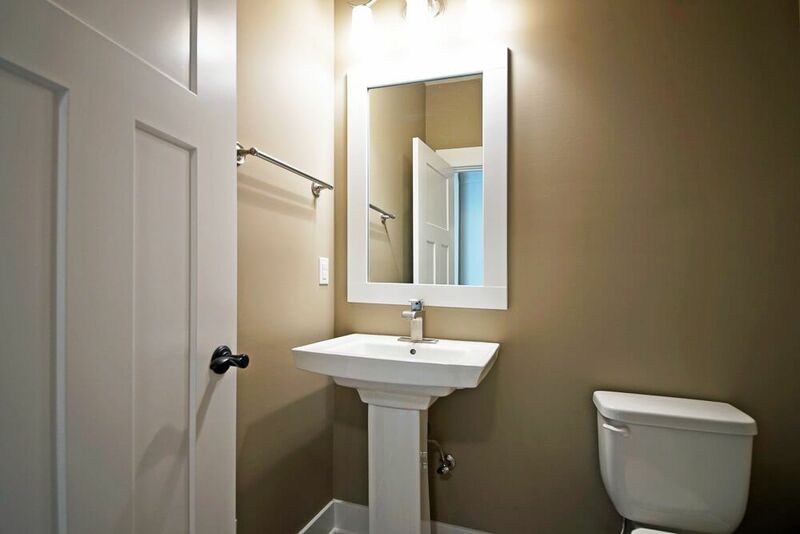 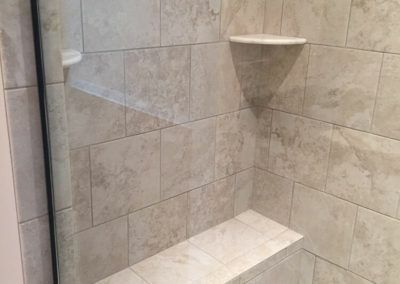 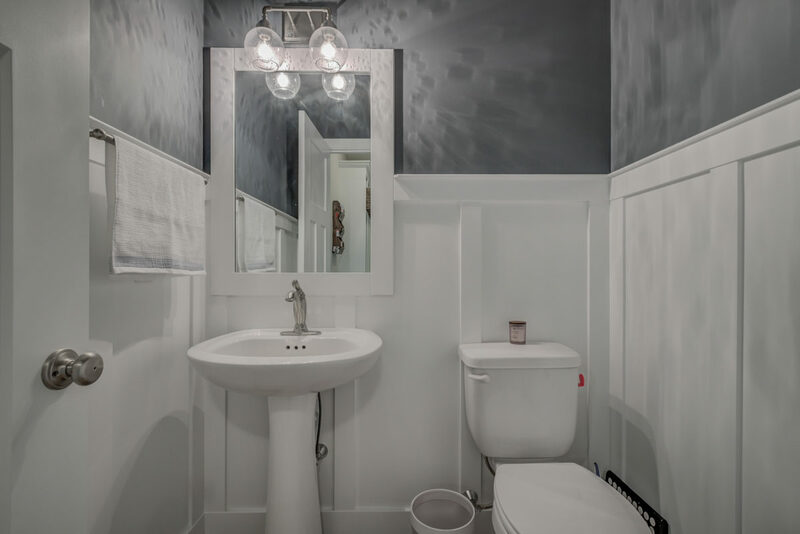 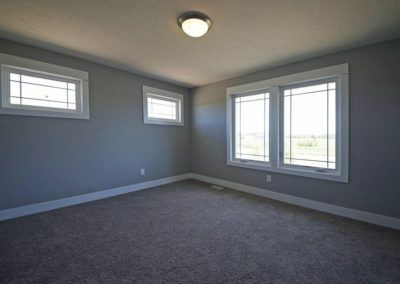 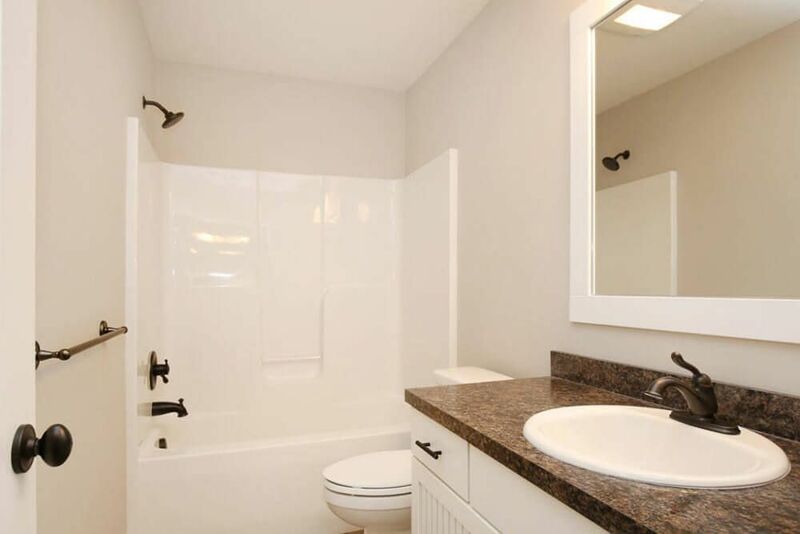 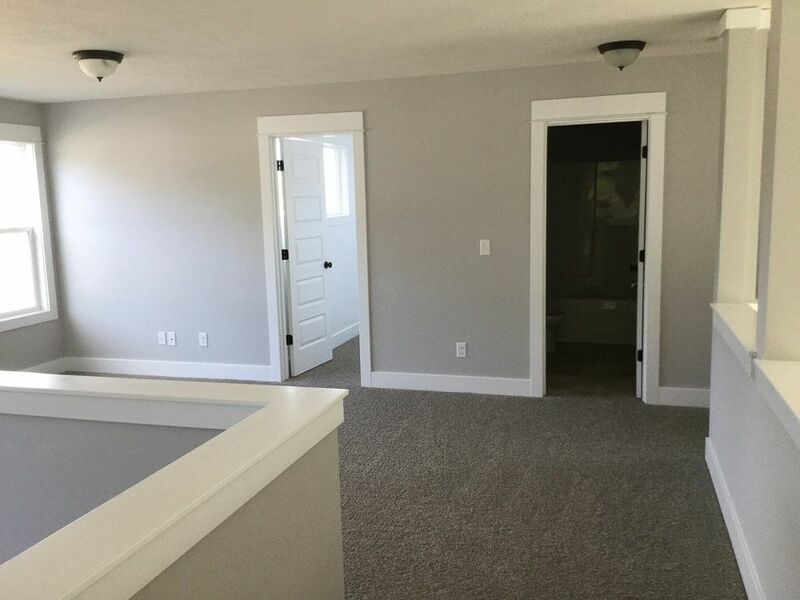 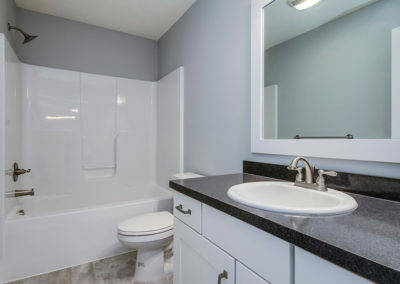 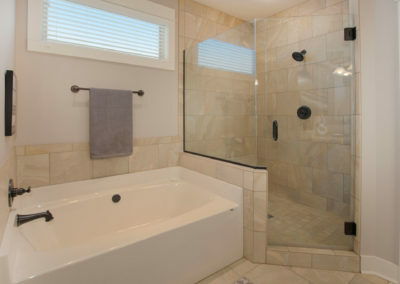 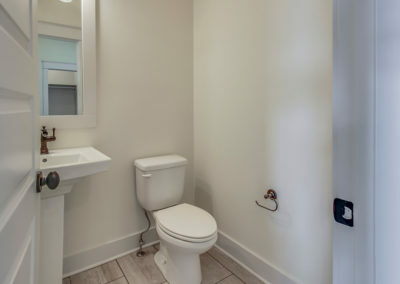 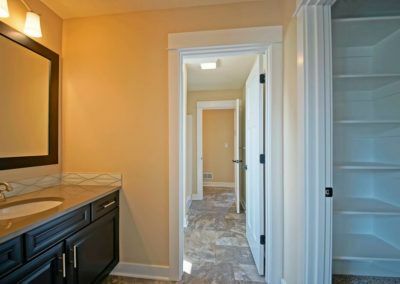 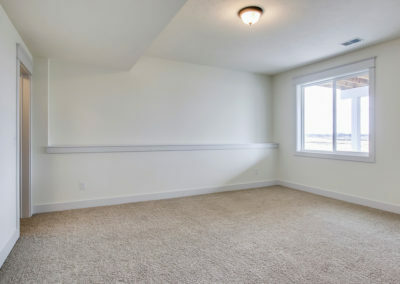 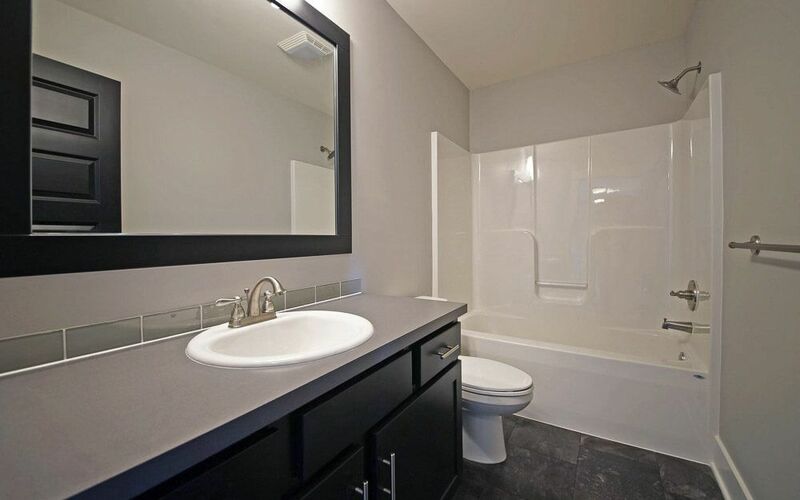 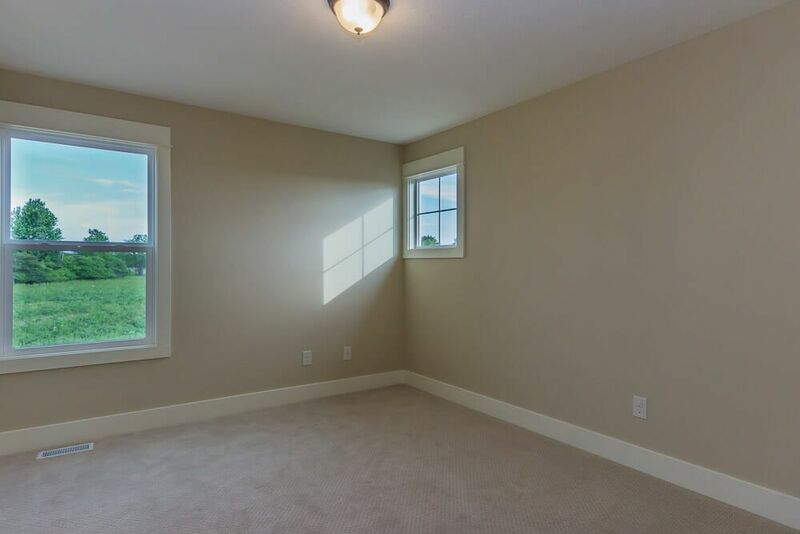 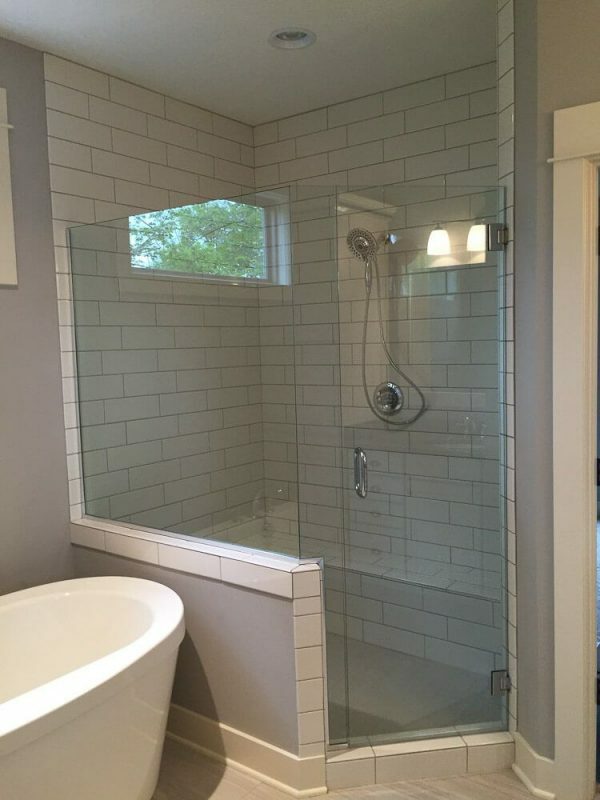 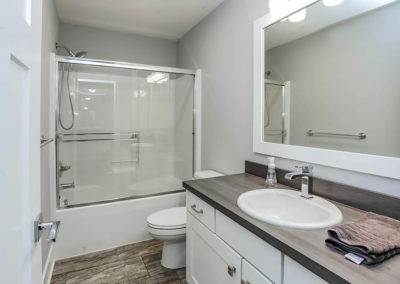 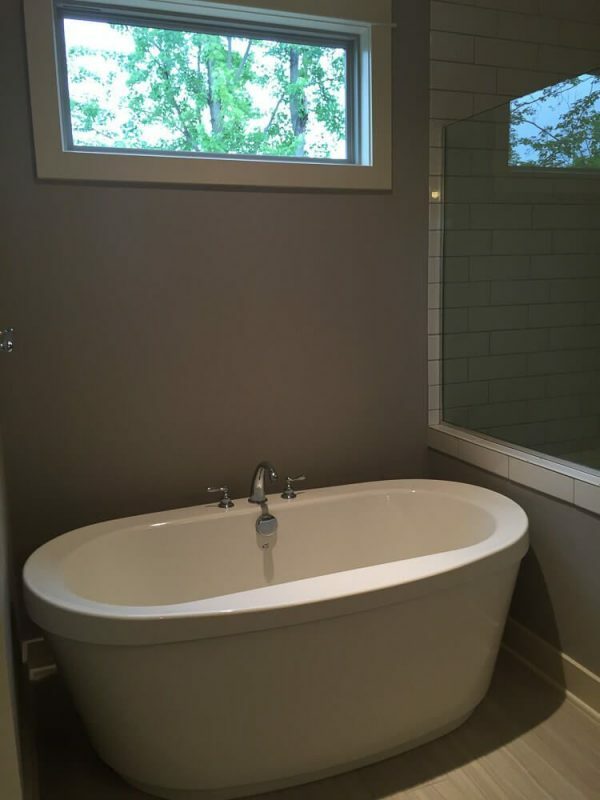 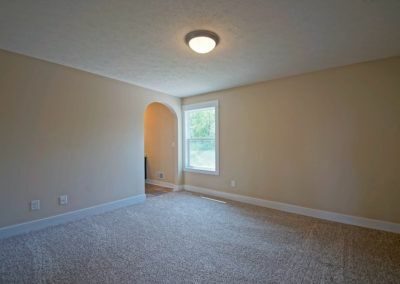 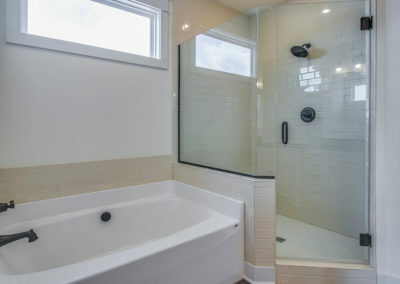 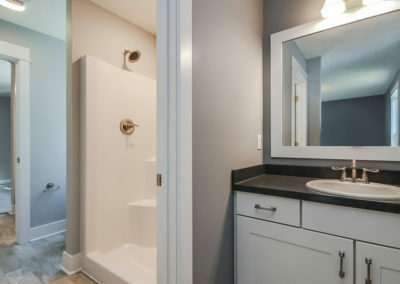 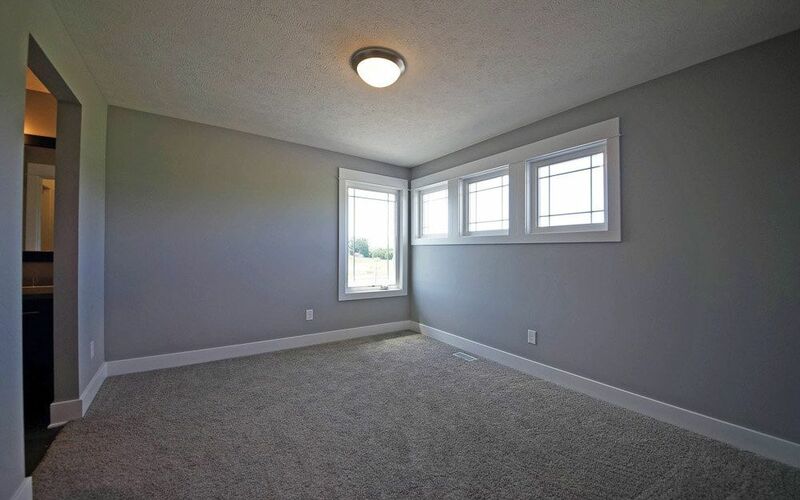 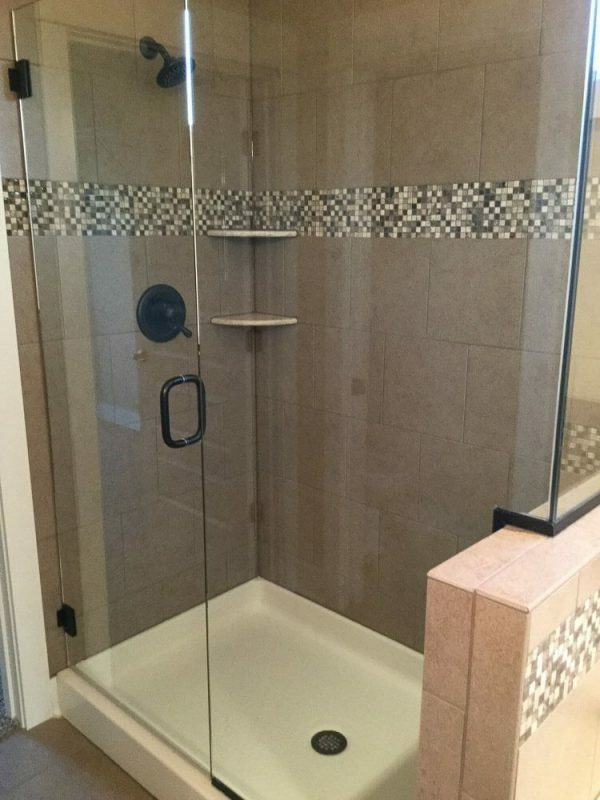 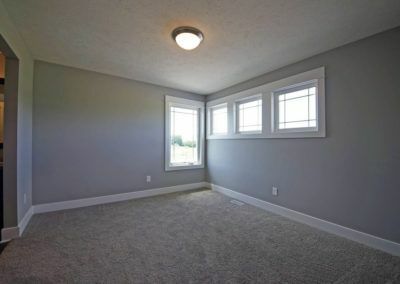 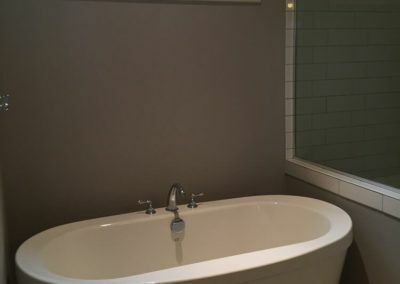 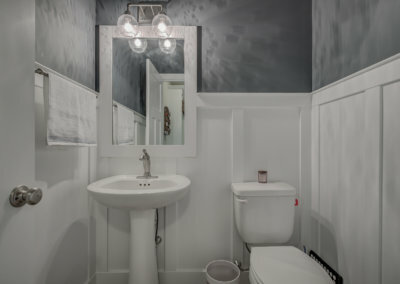 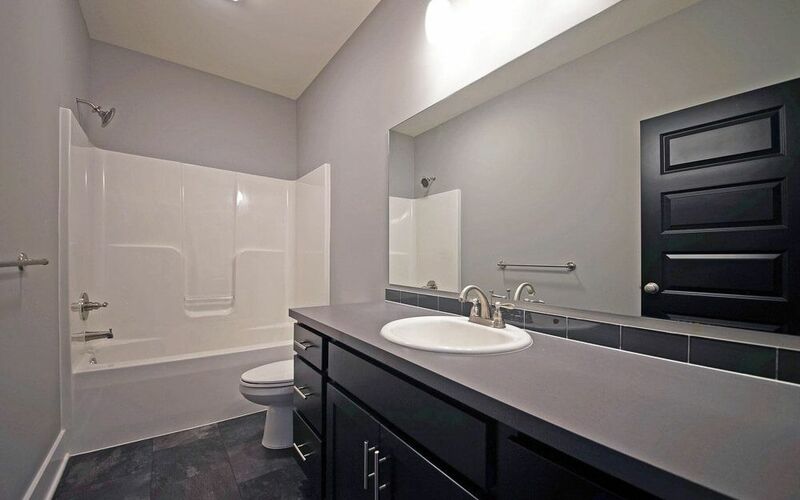 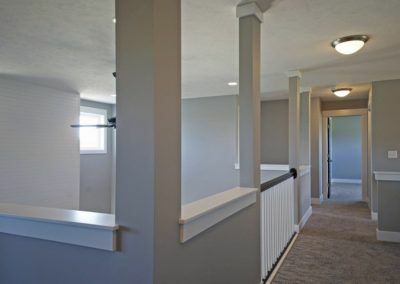 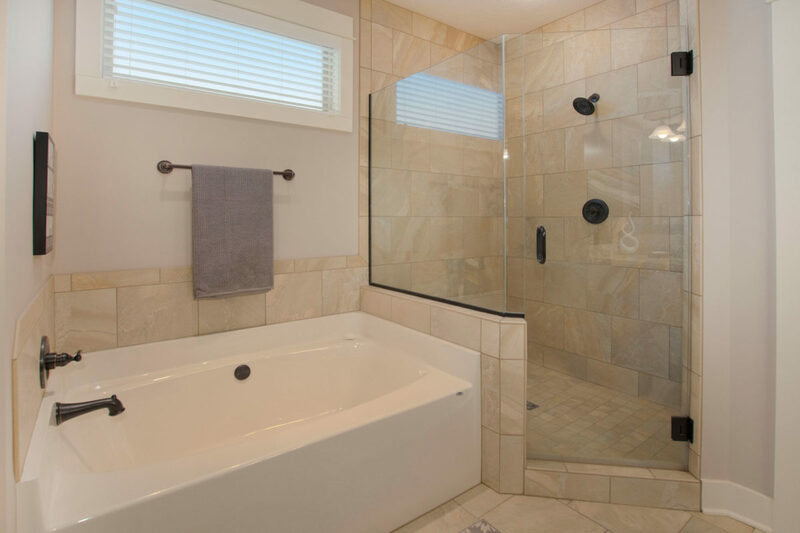 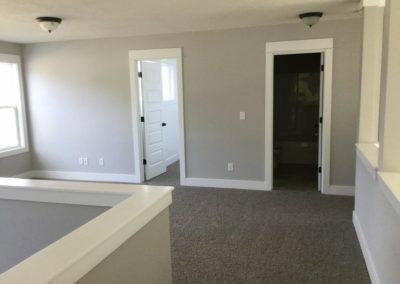 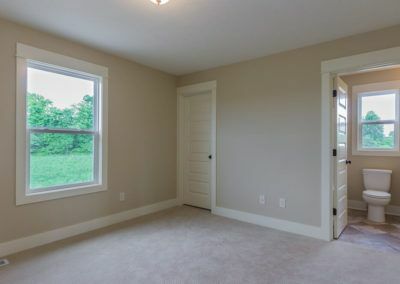 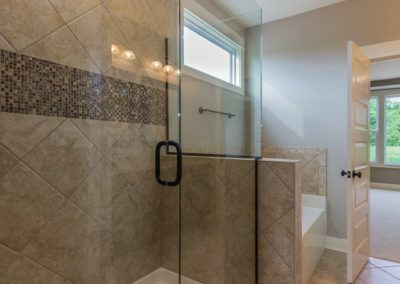 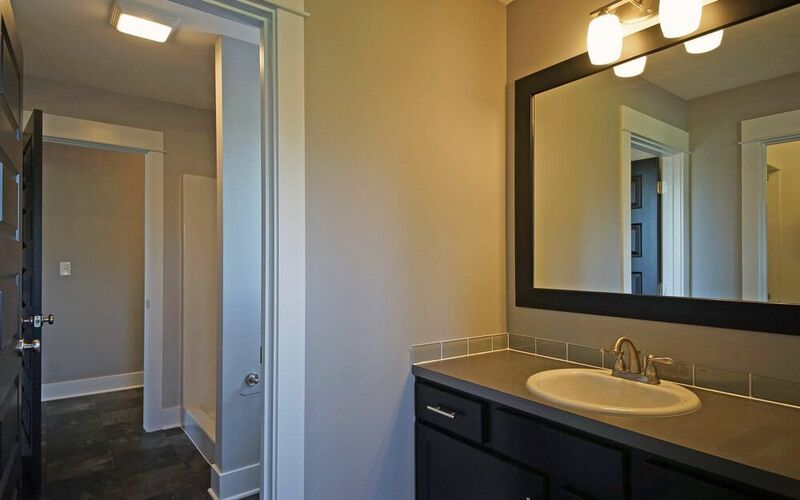 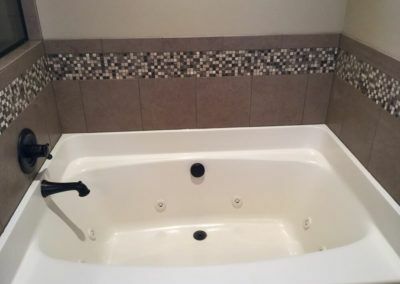 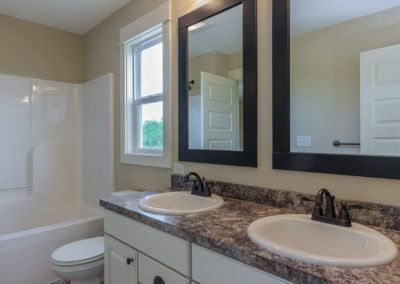 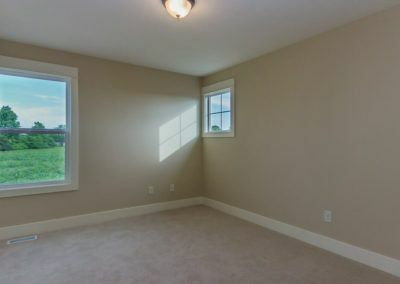 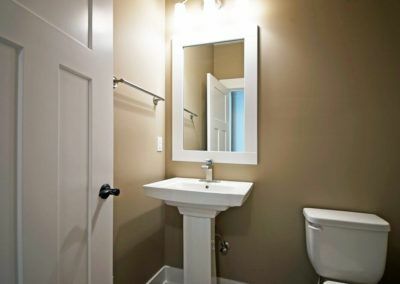 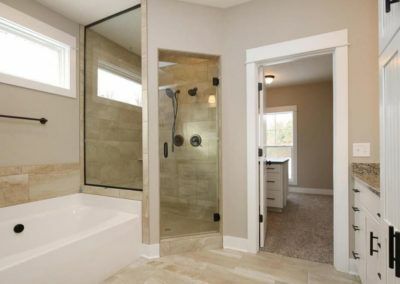 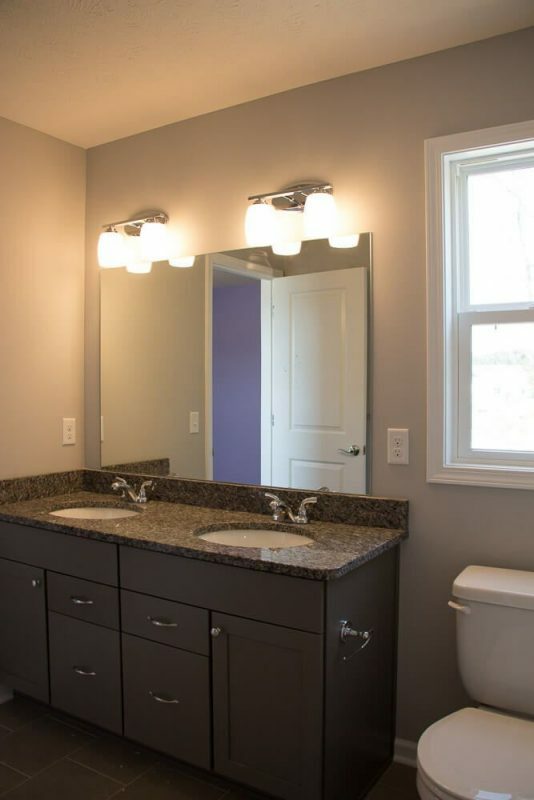 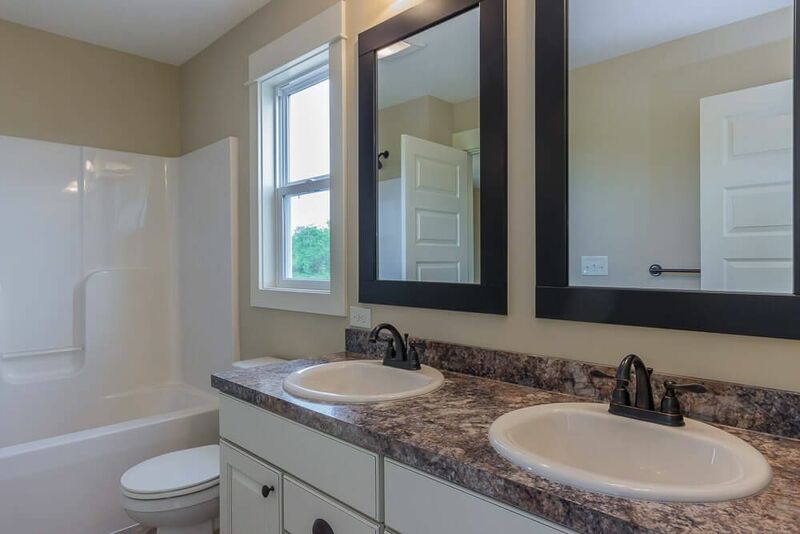 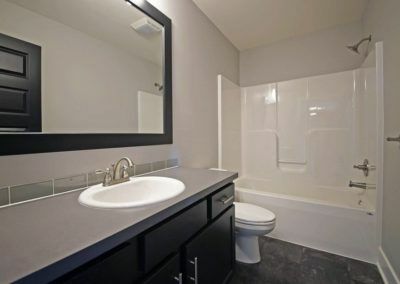 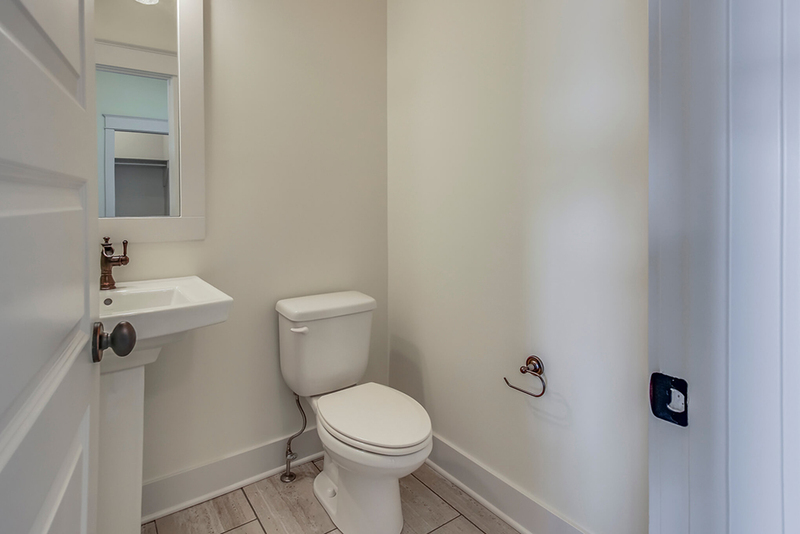 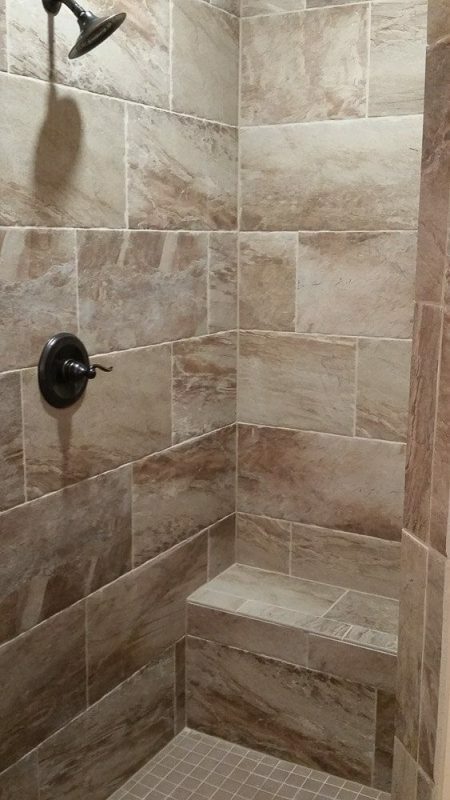 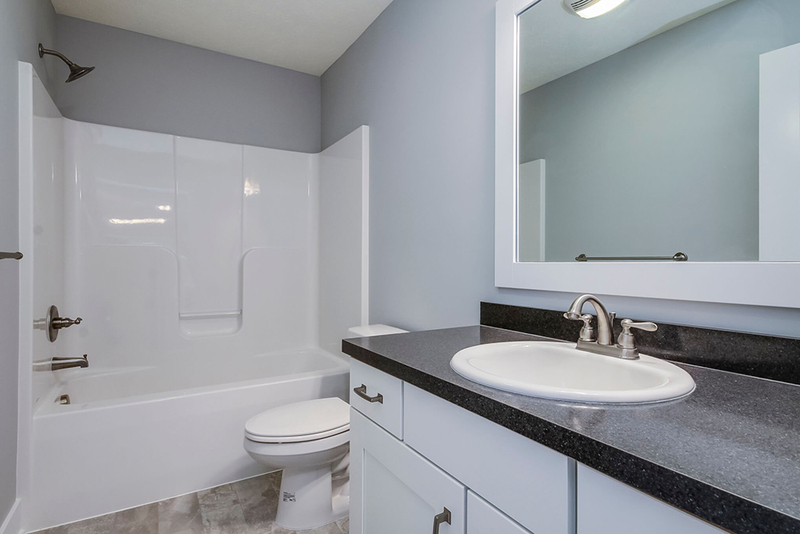 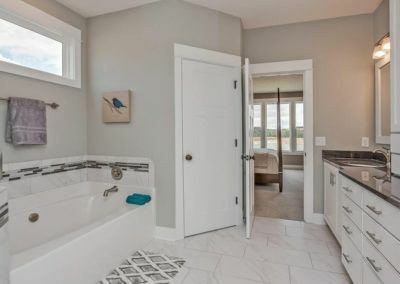 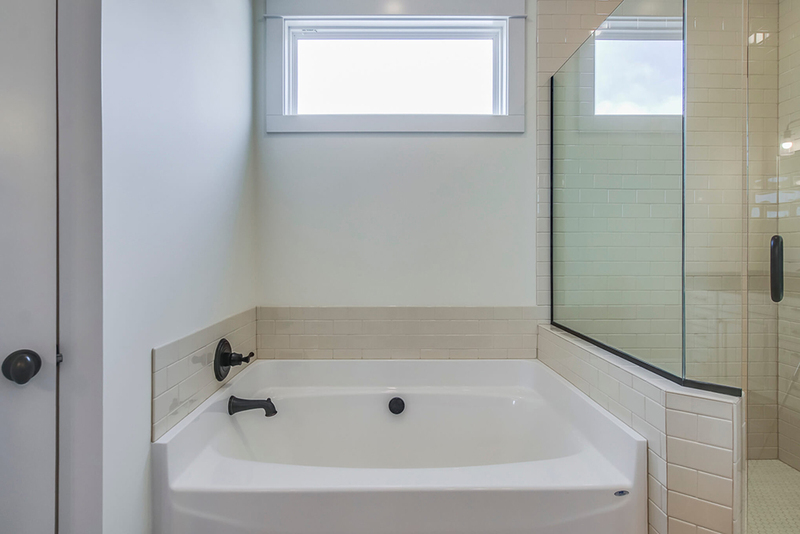 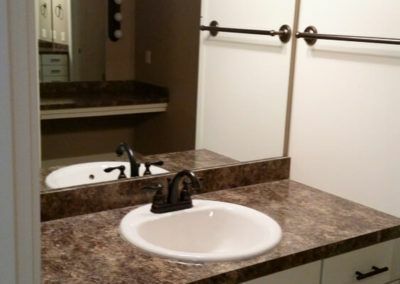 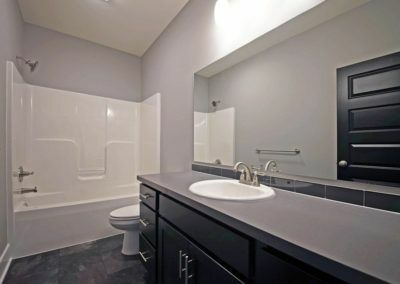 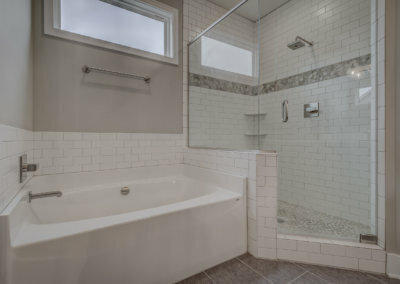 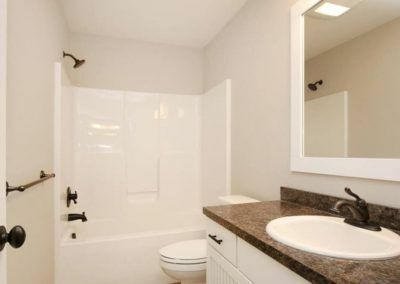 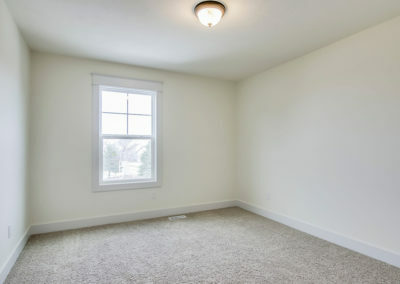 The third upstairs bedroom is directly adjacent to the second full bath. 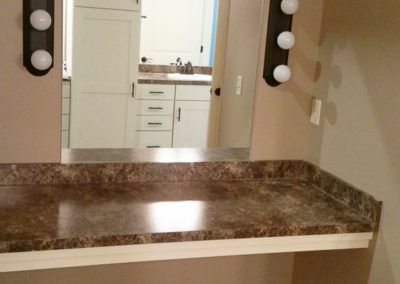 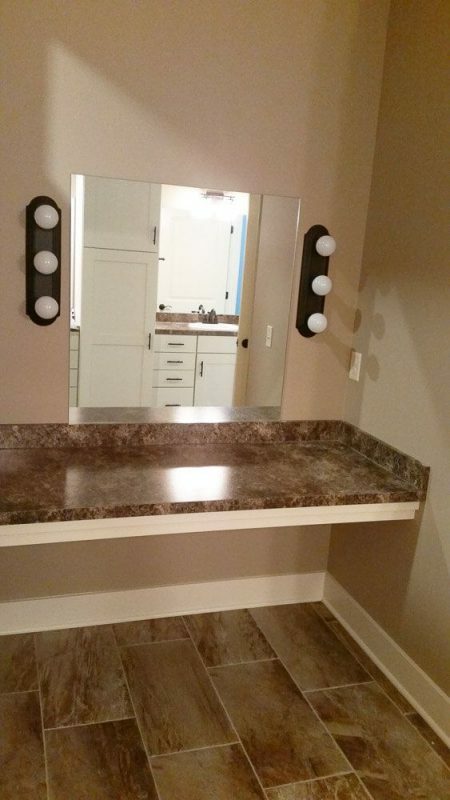 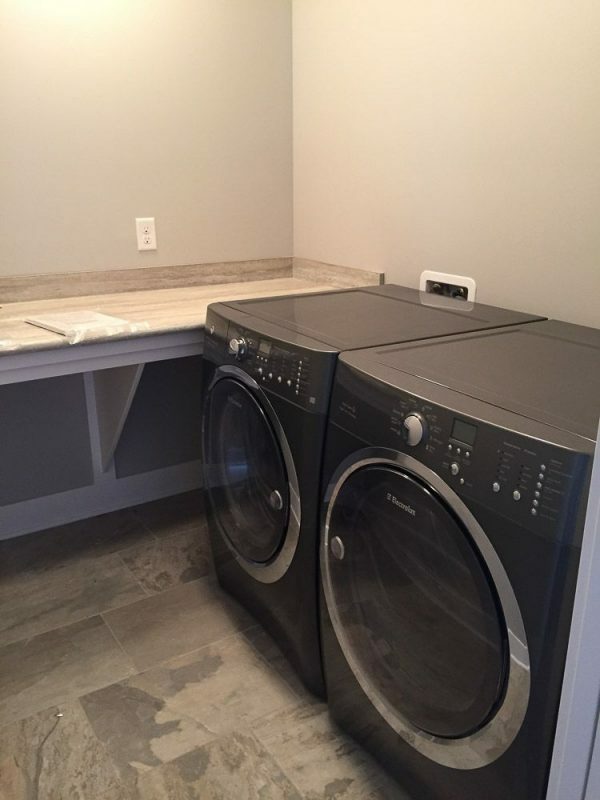 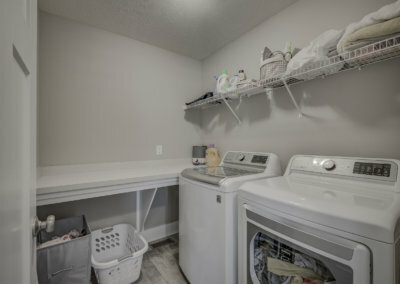 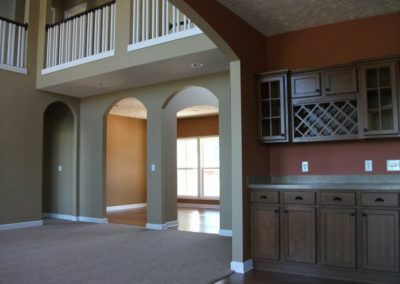 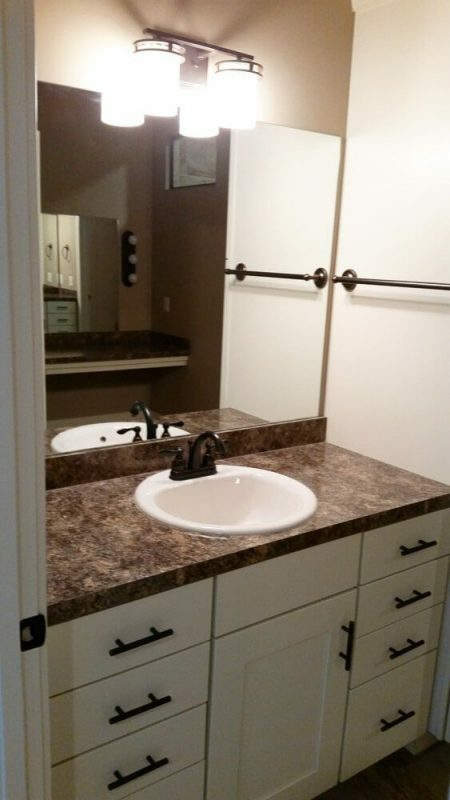 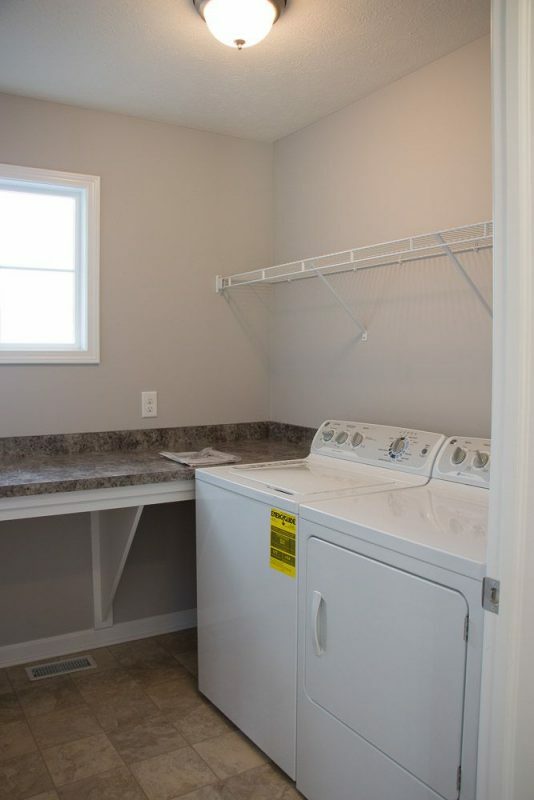 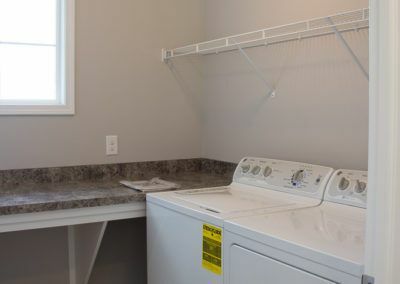 The upper level also has an open loft space and the laundry room with optional folding counter and sink. 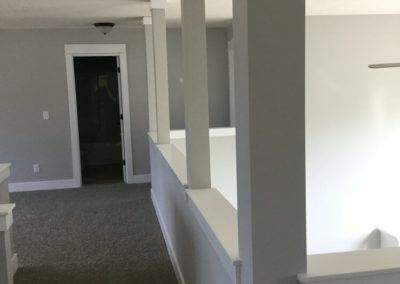 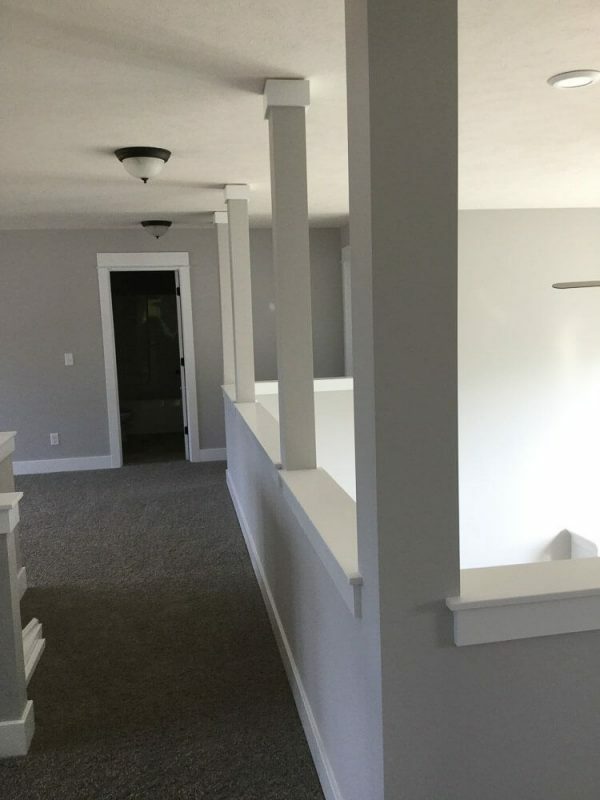 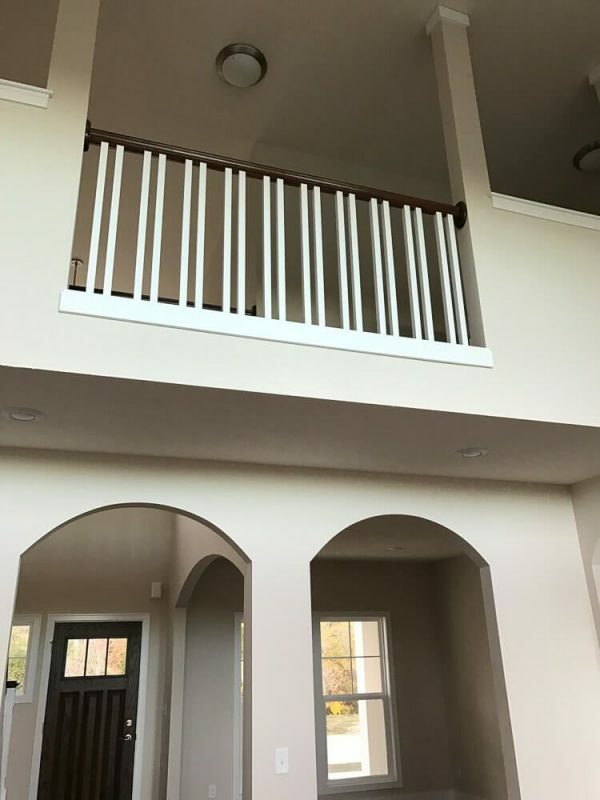 The upstairs hall is open to the living room area below, but if you prefer, this space can be converted into another large upstairs loft. 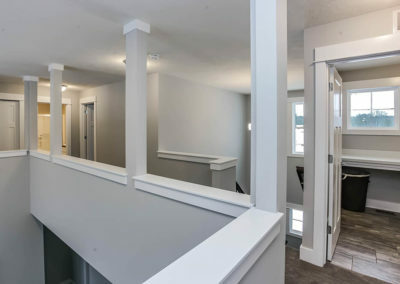 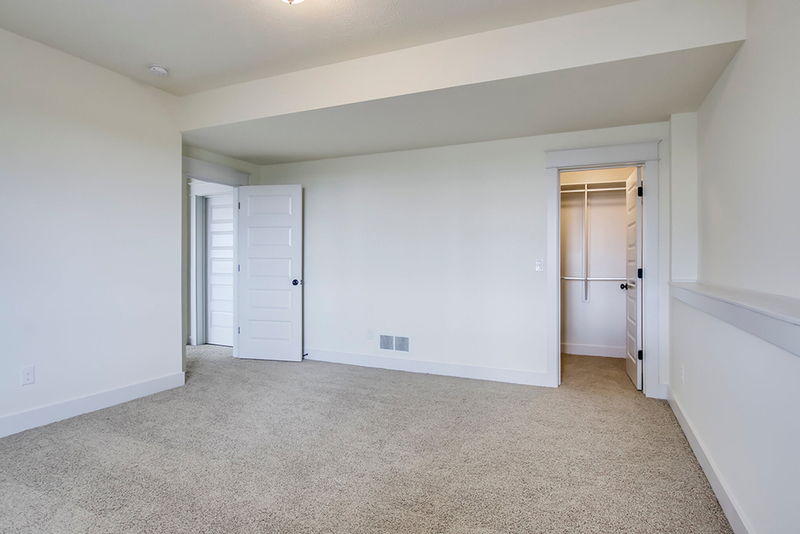 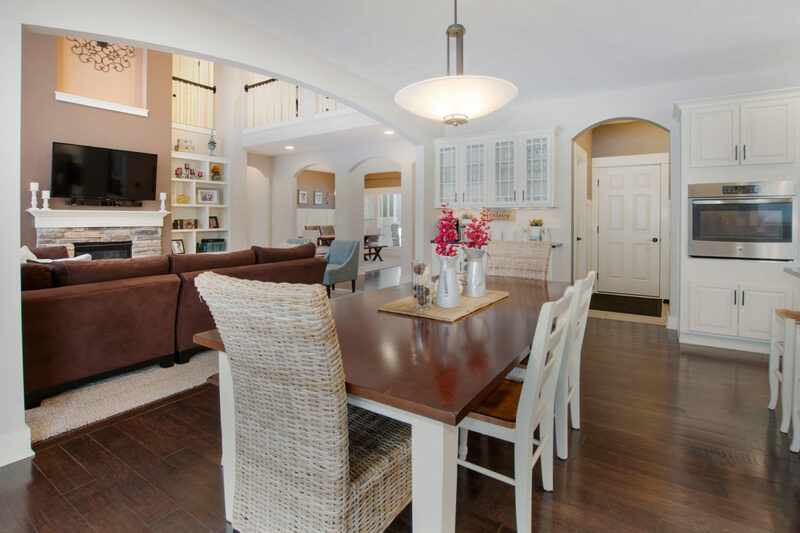 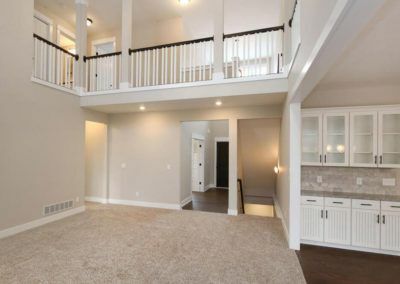 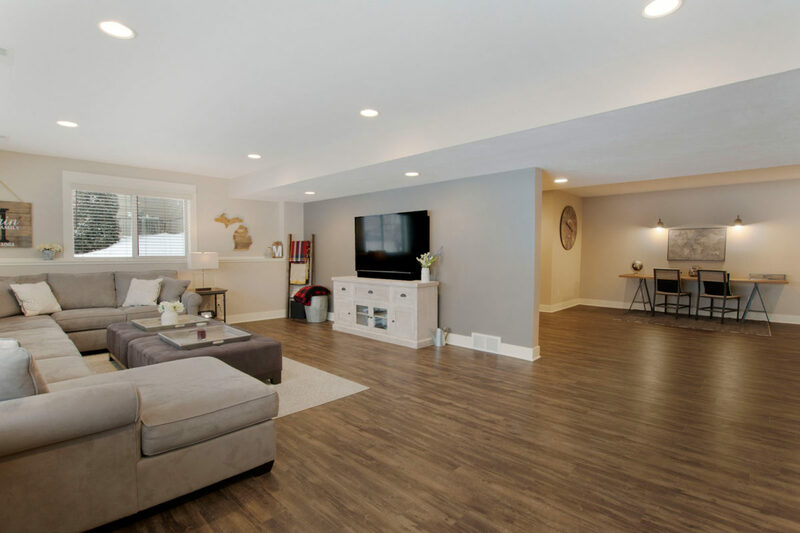 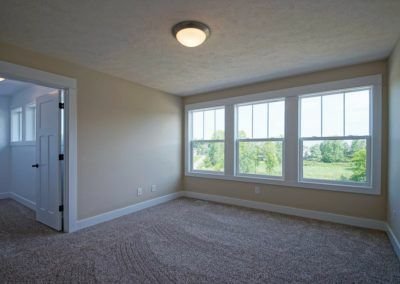 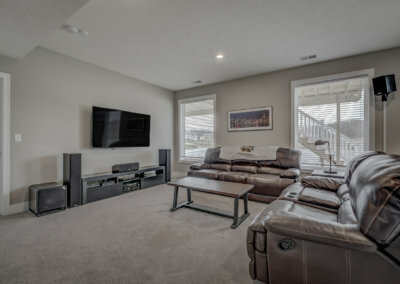 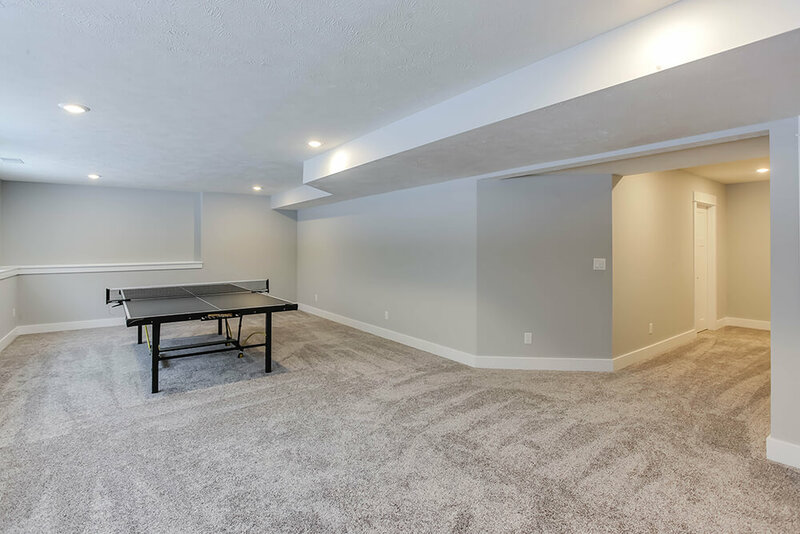 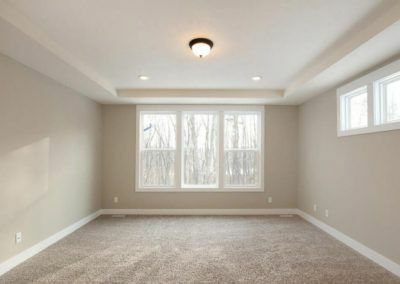 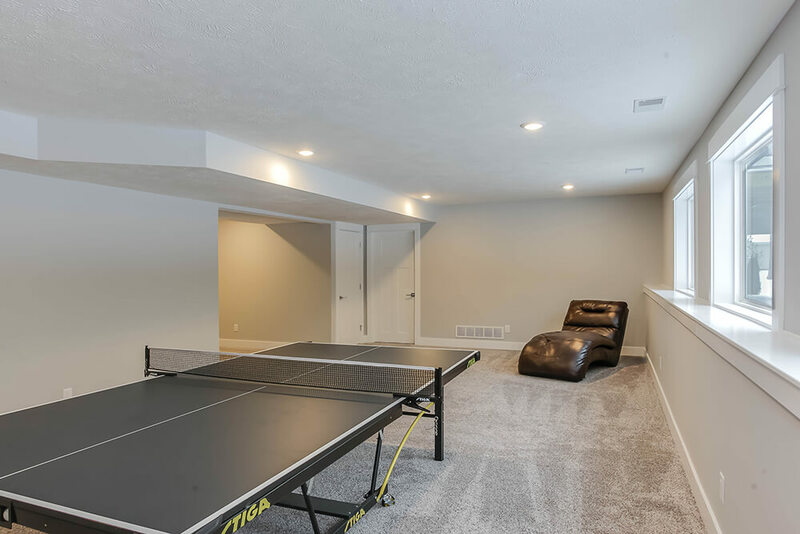 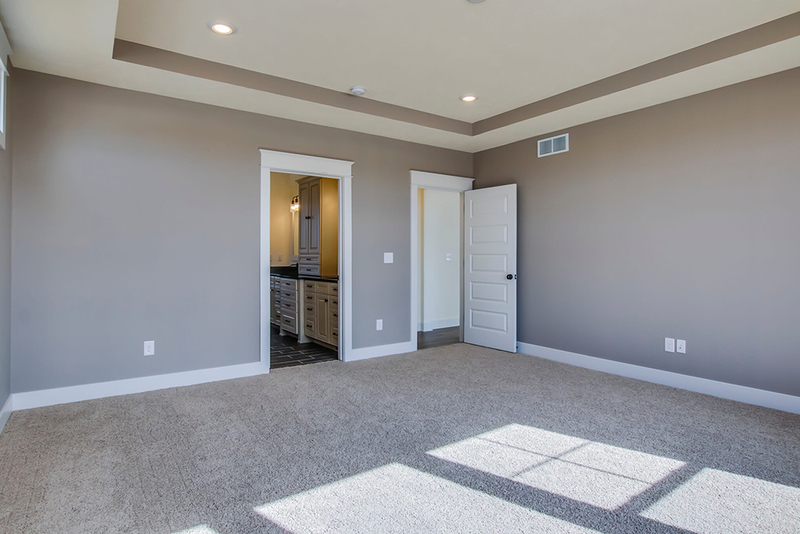 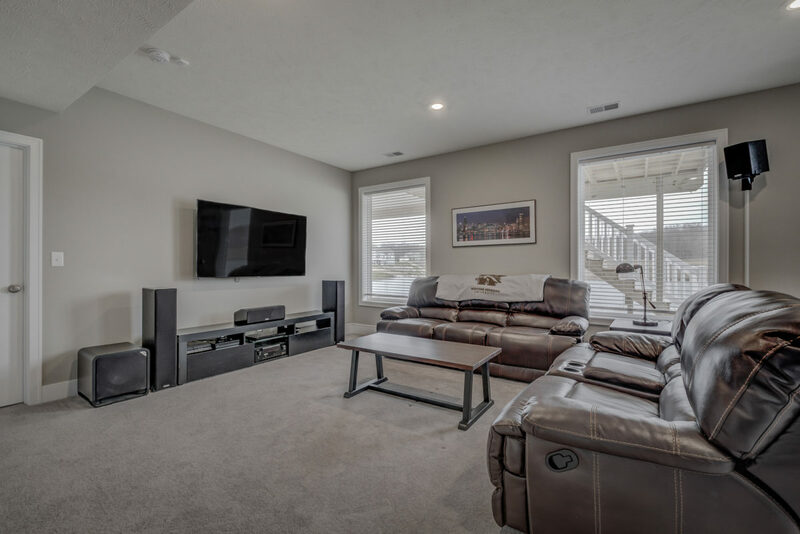 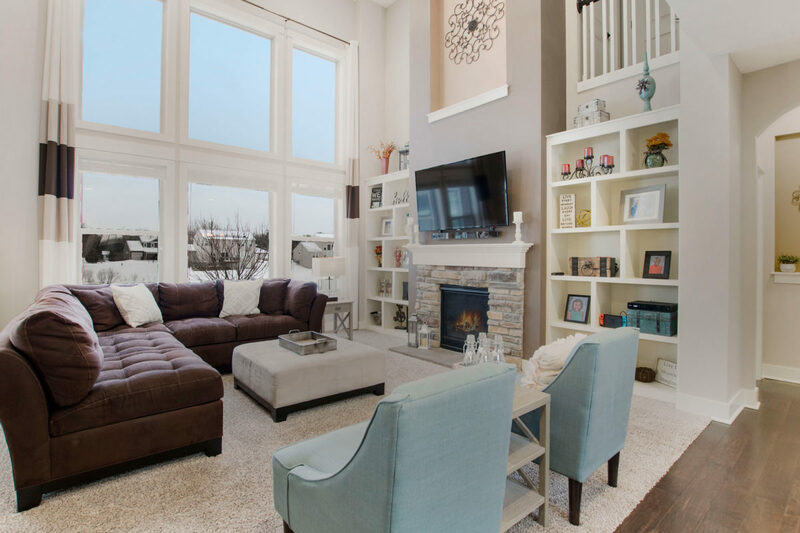 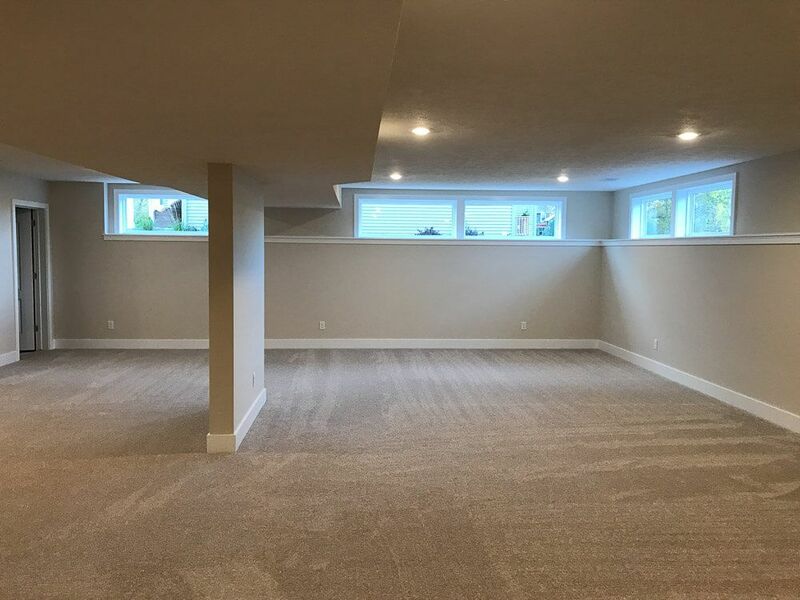 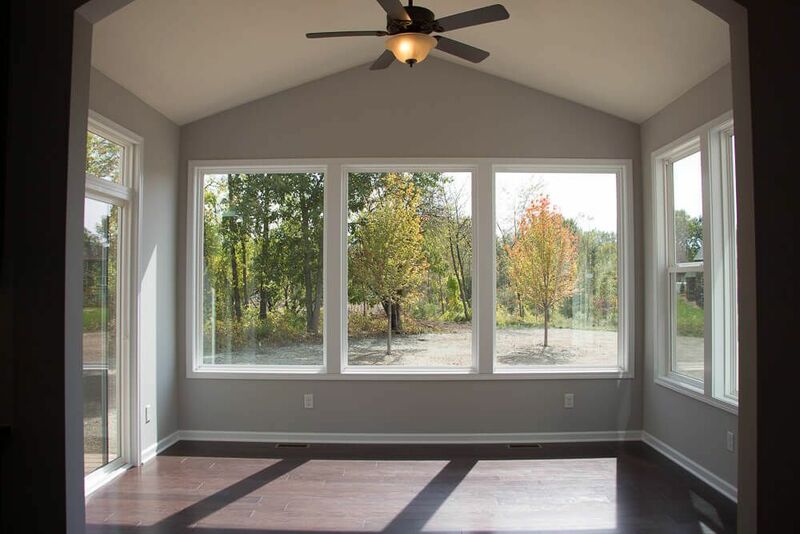 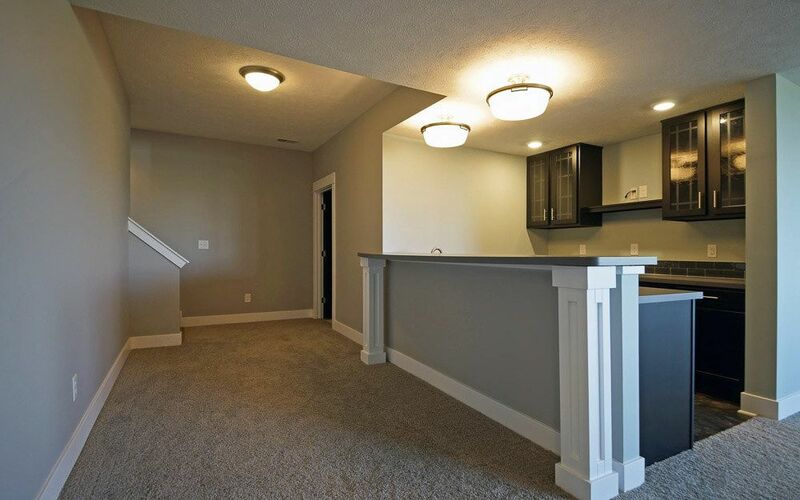 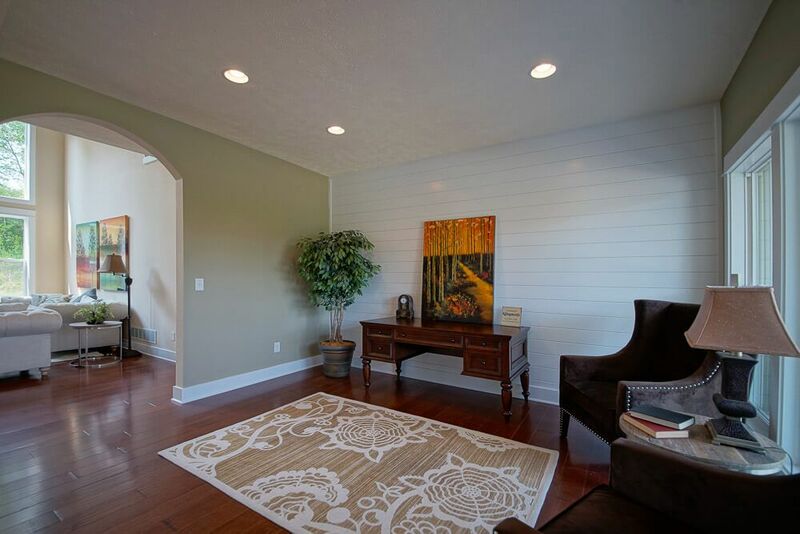 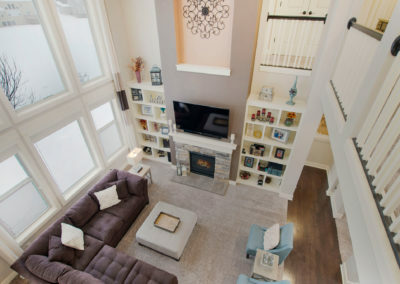 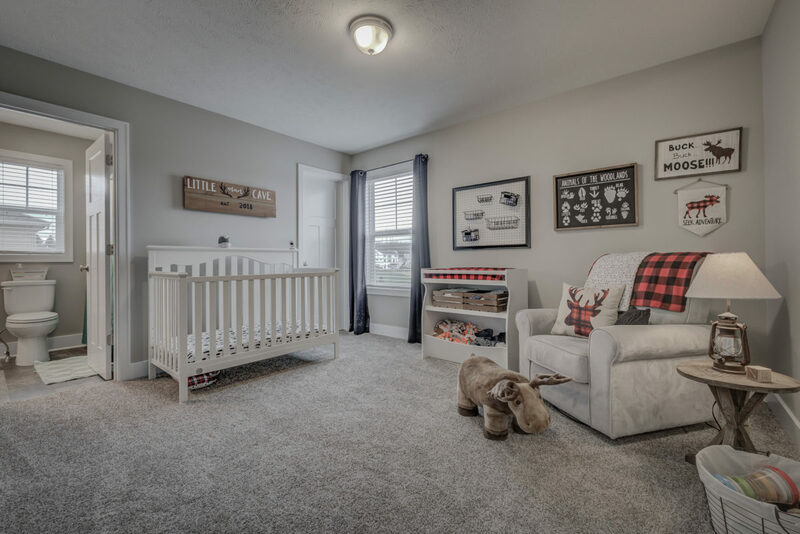 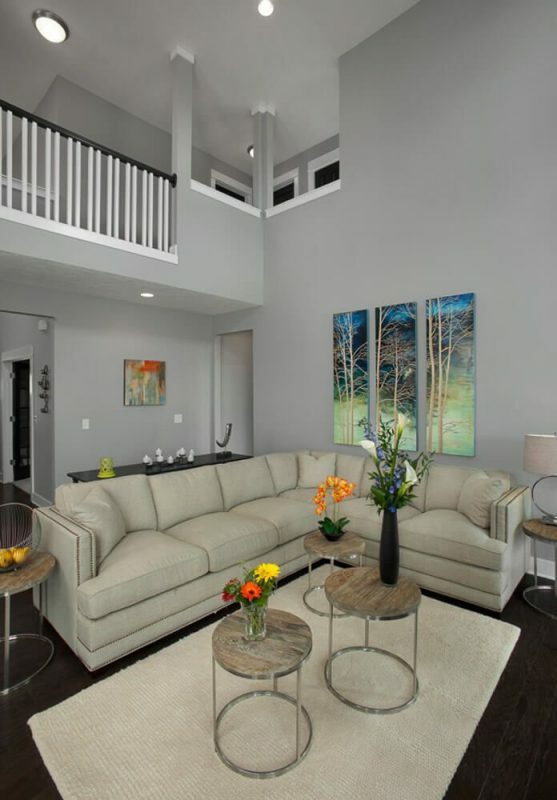 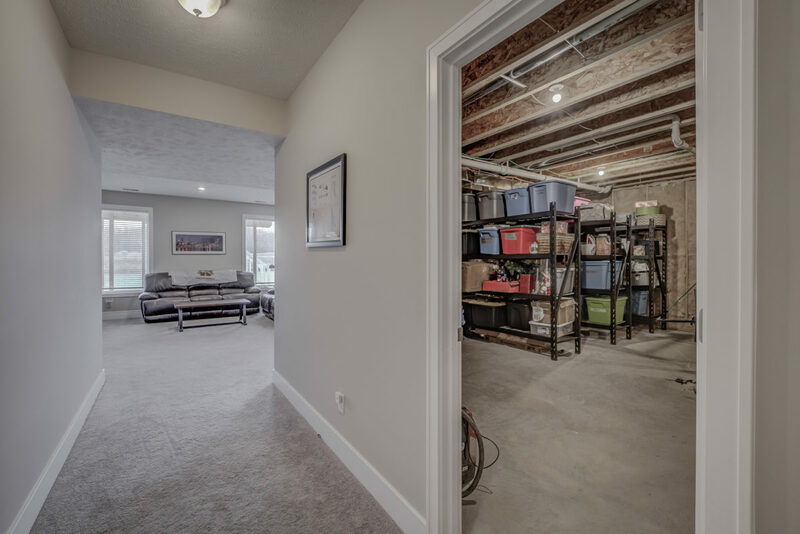 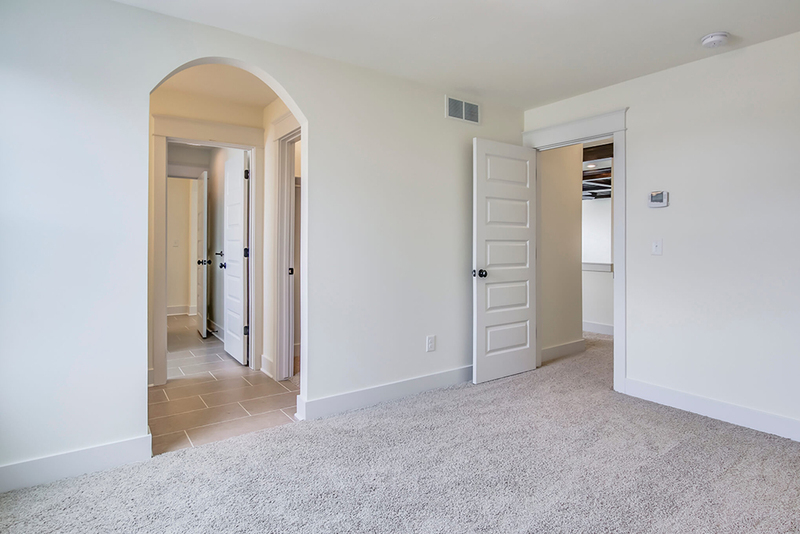 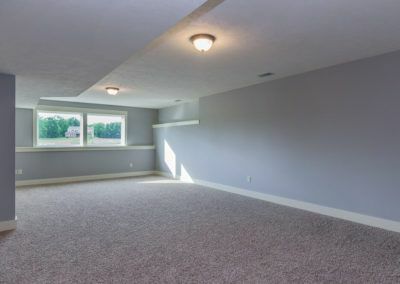 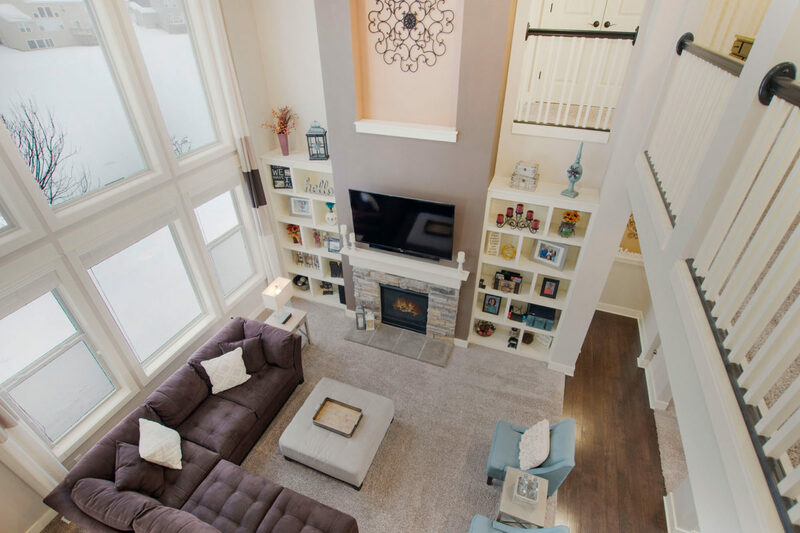 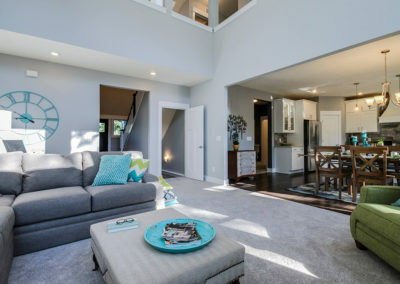 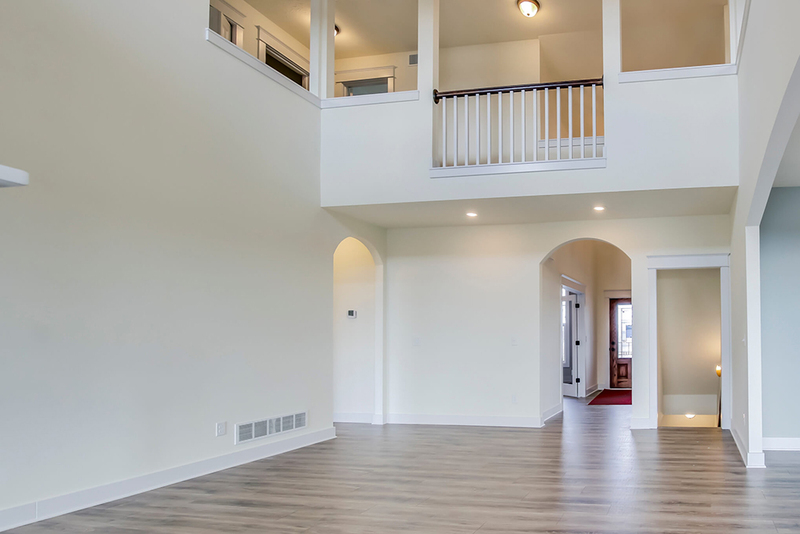 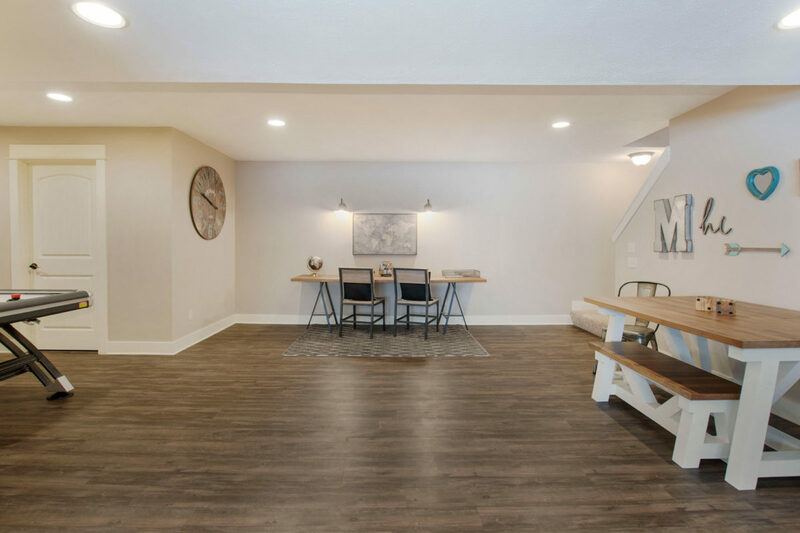 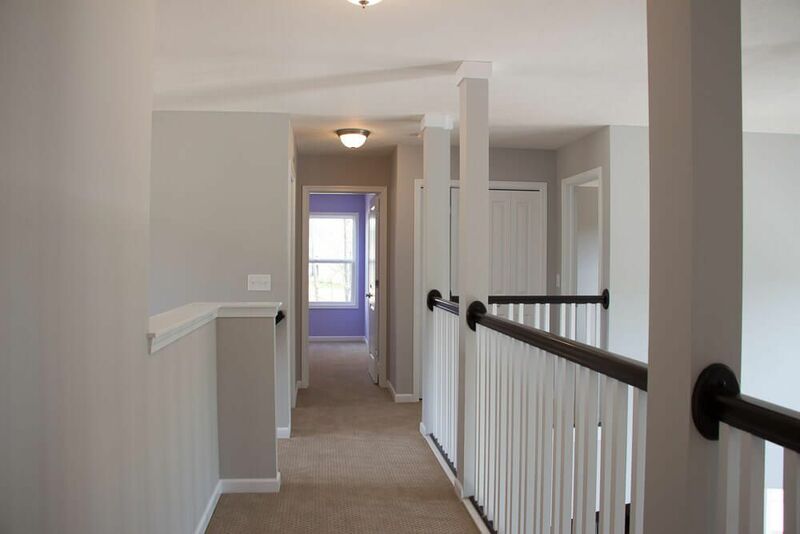 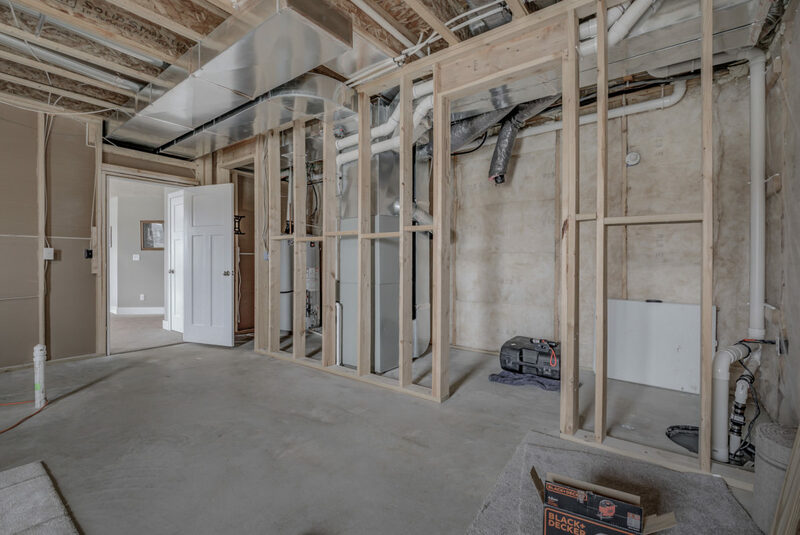 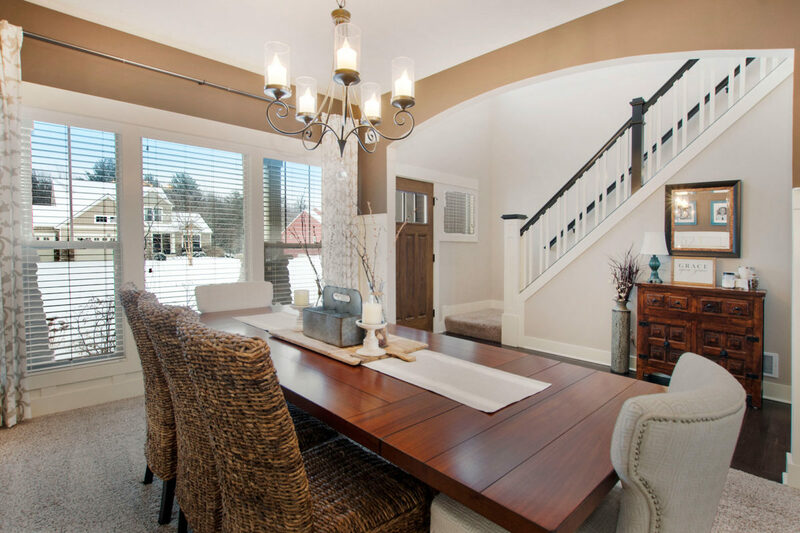 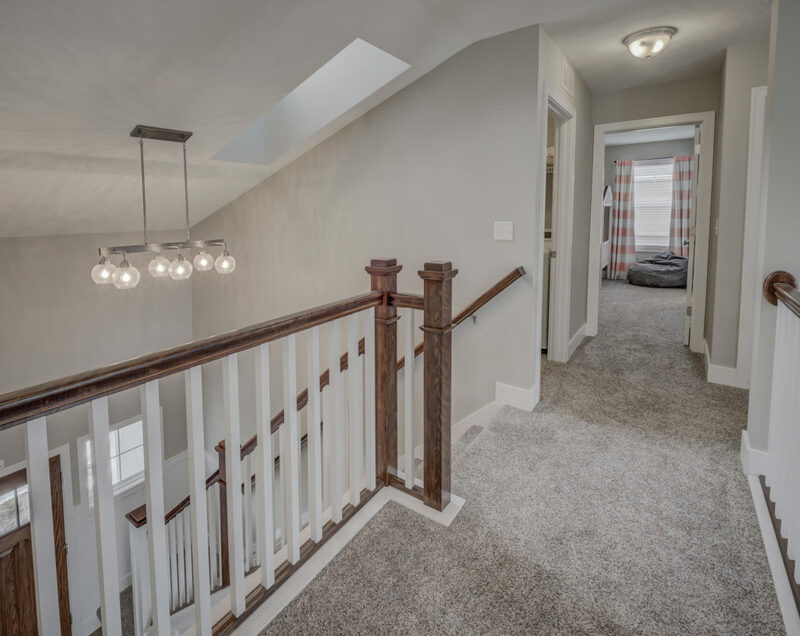 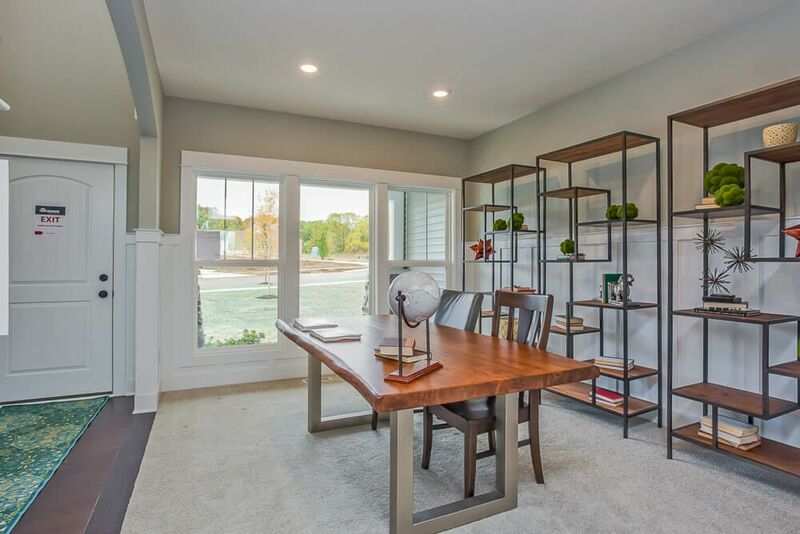 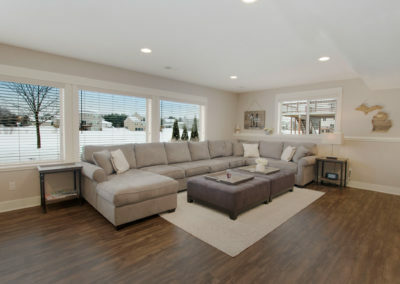 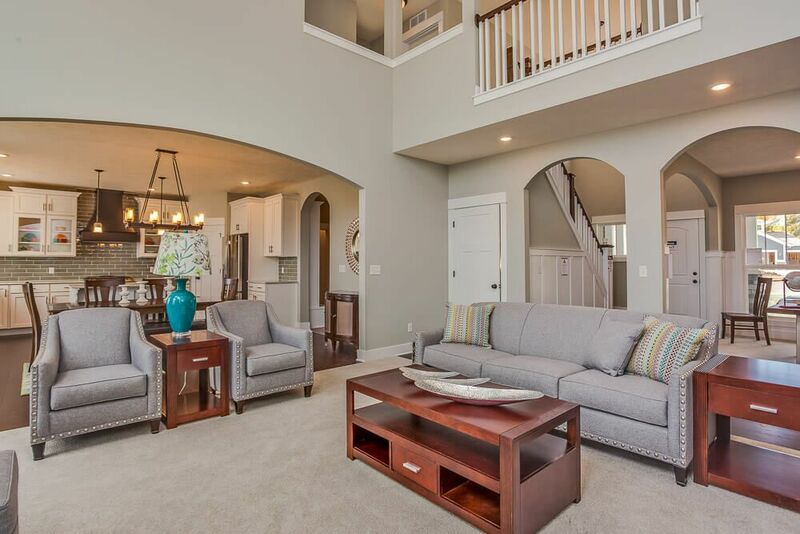 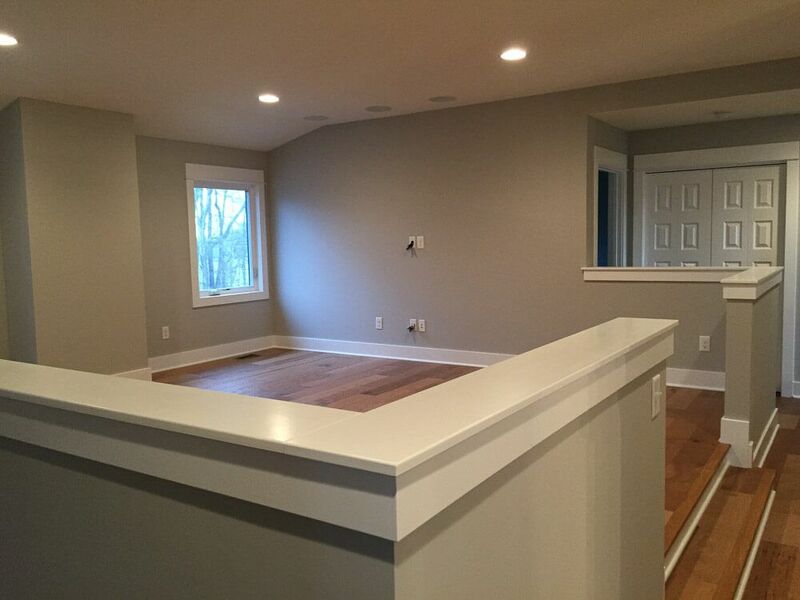 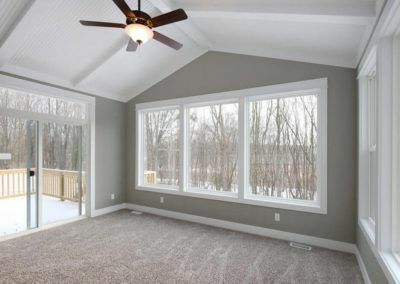 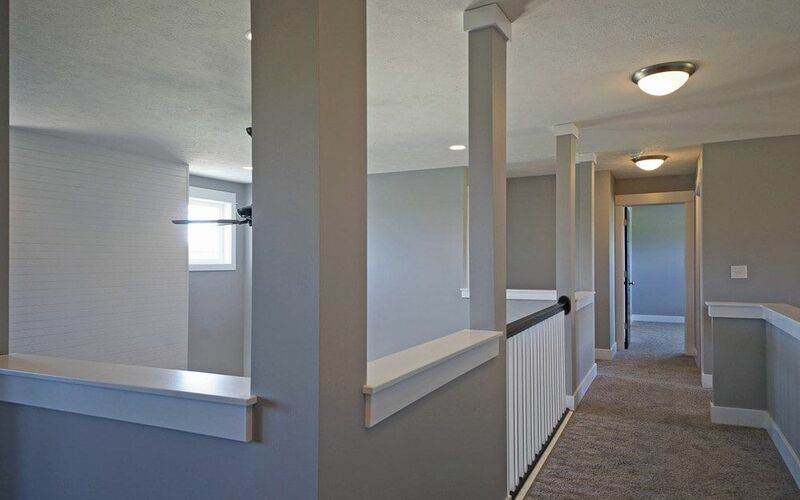 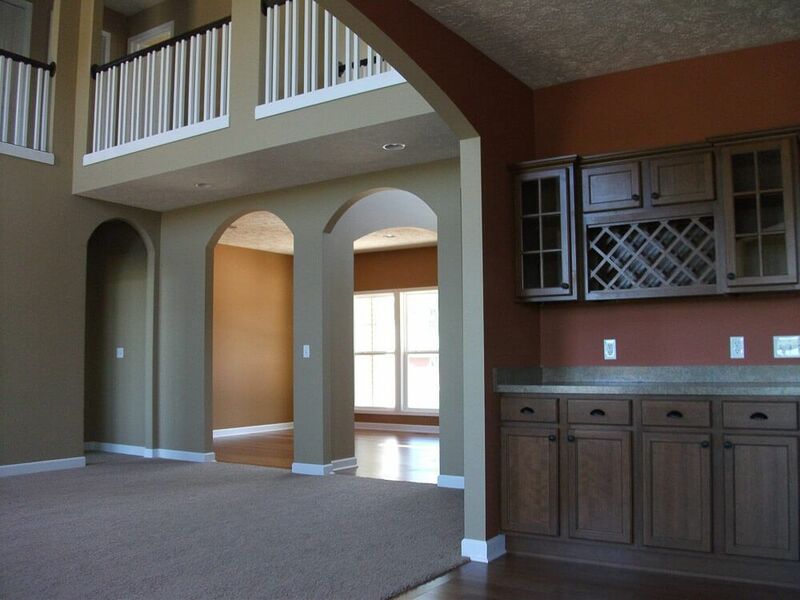 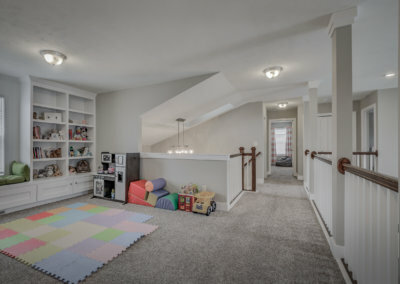 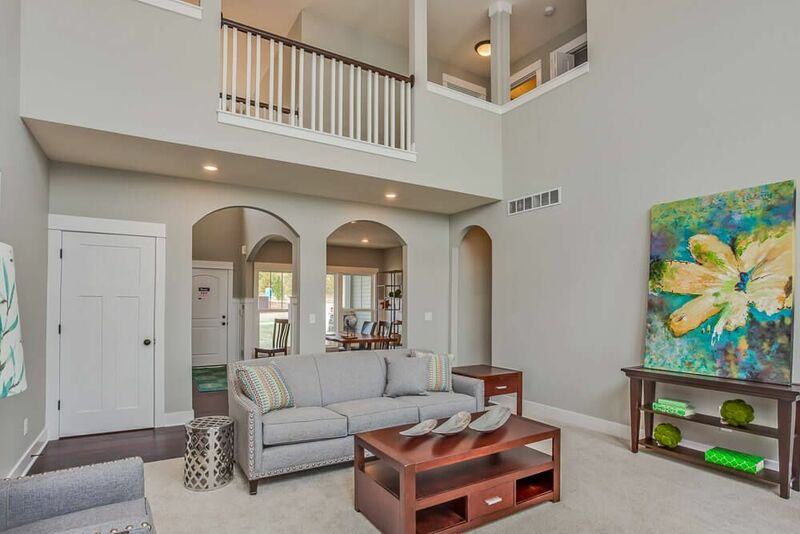 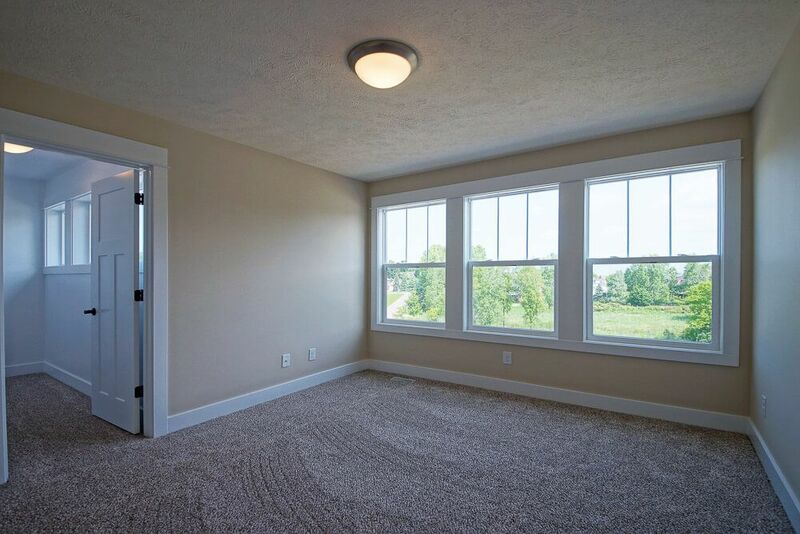 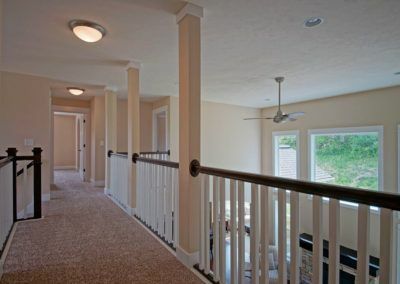 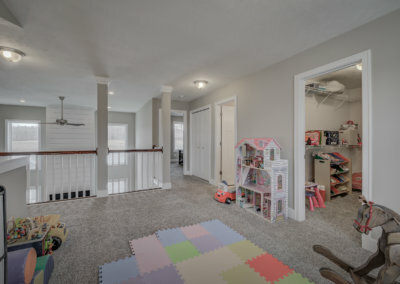 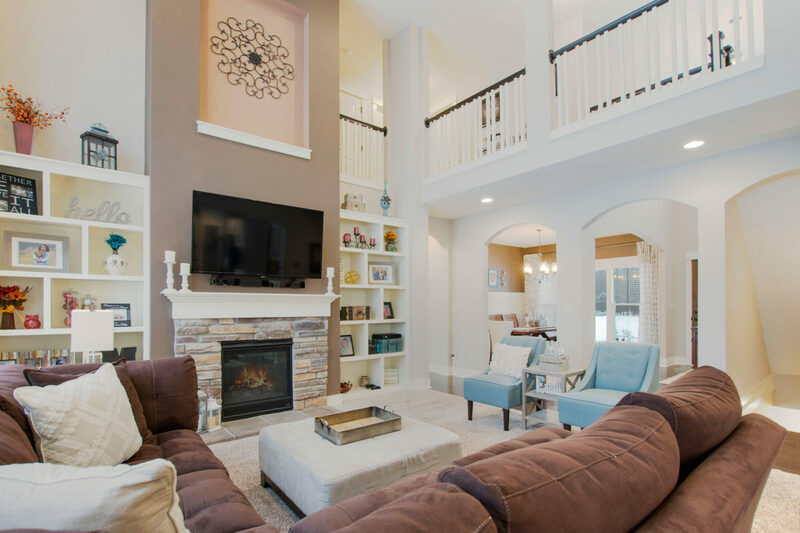 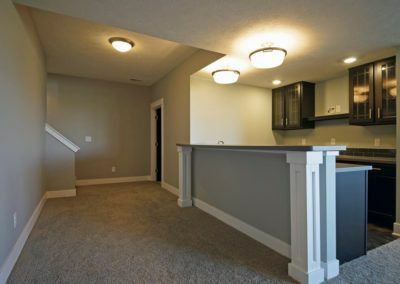 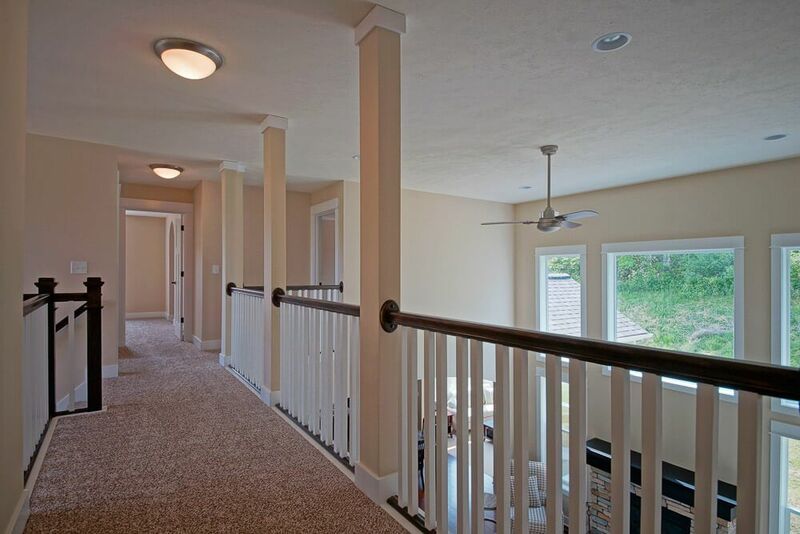 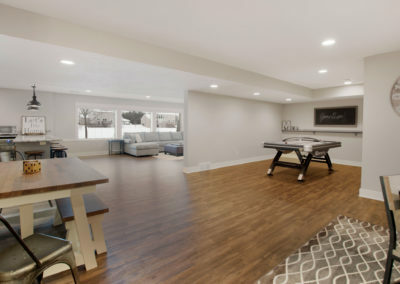 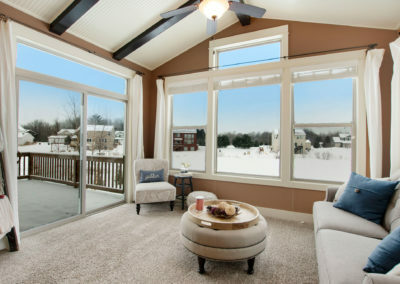 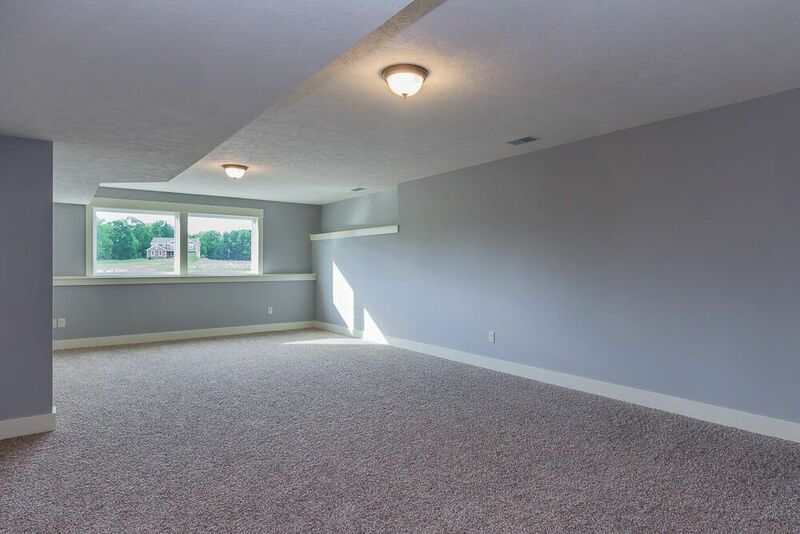 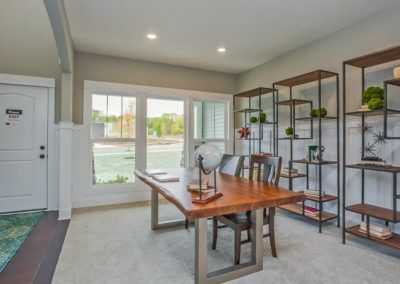 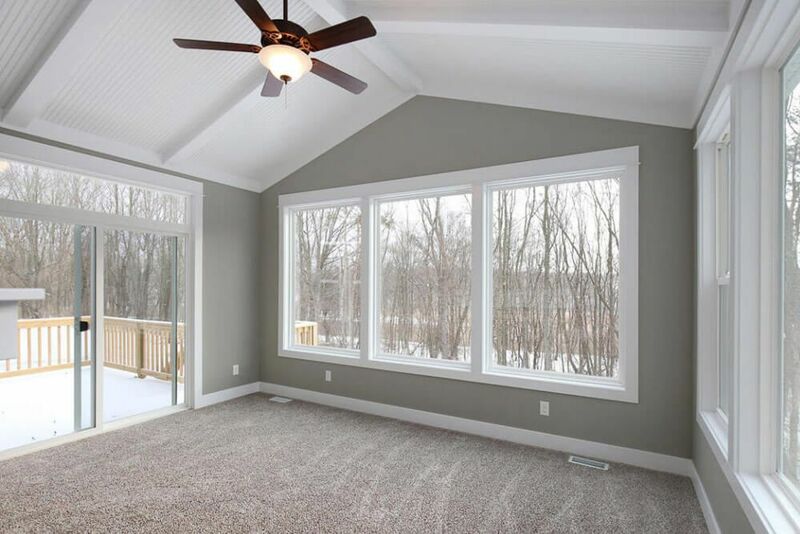 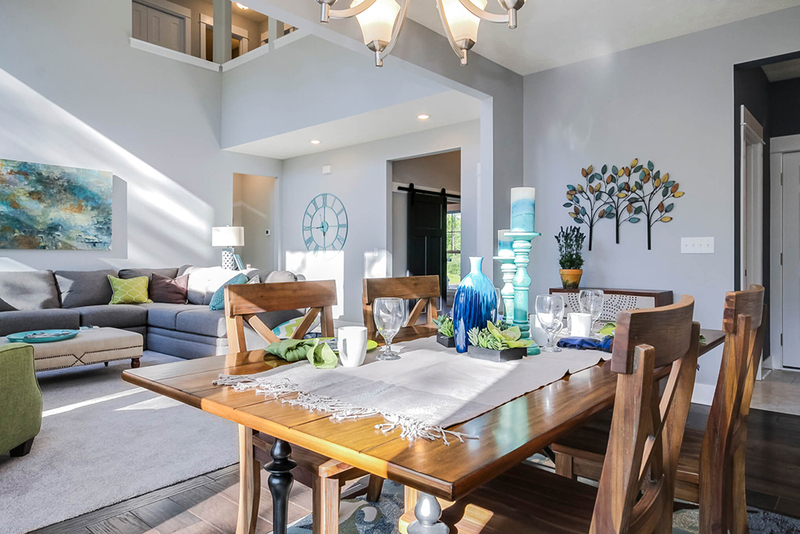 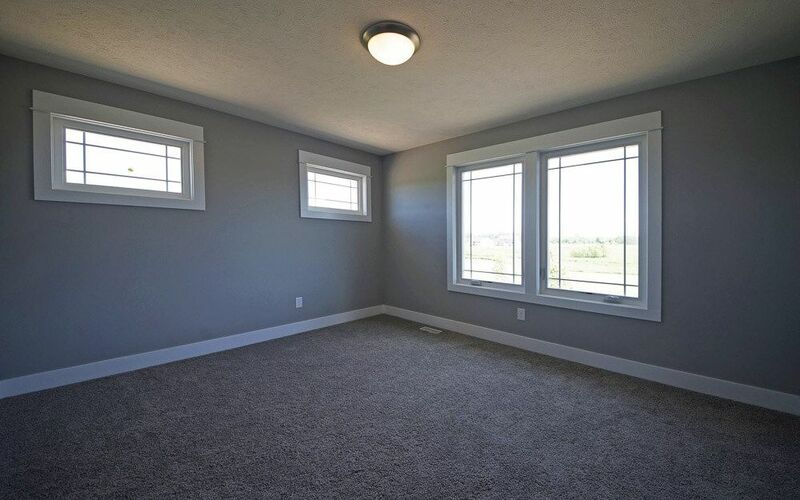 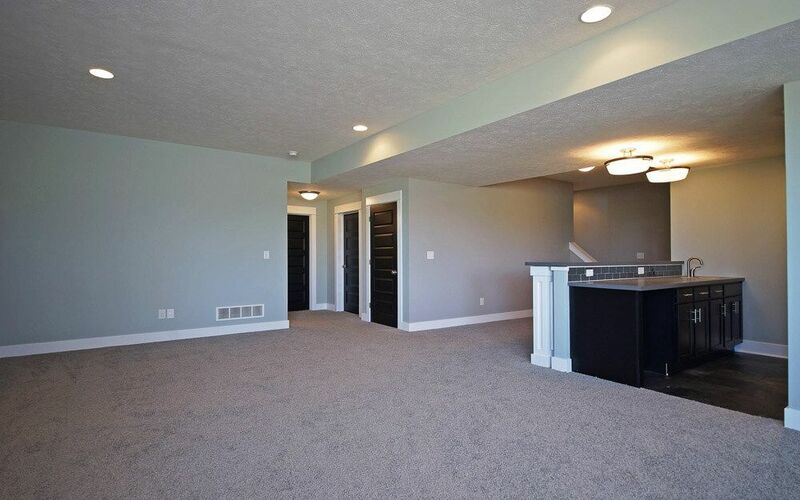 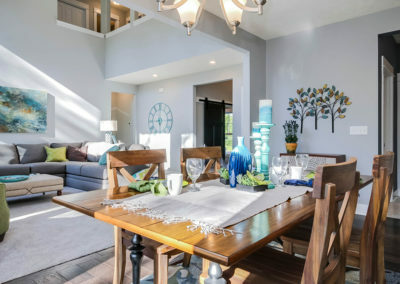 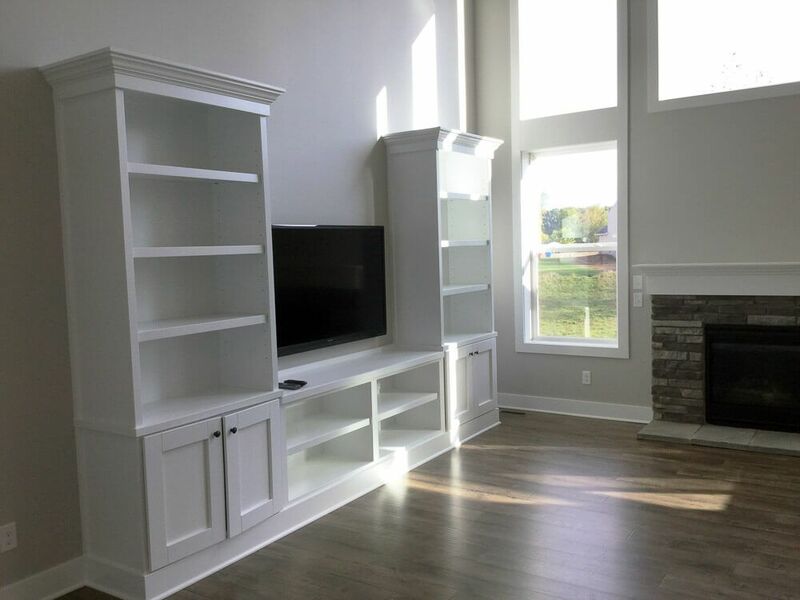 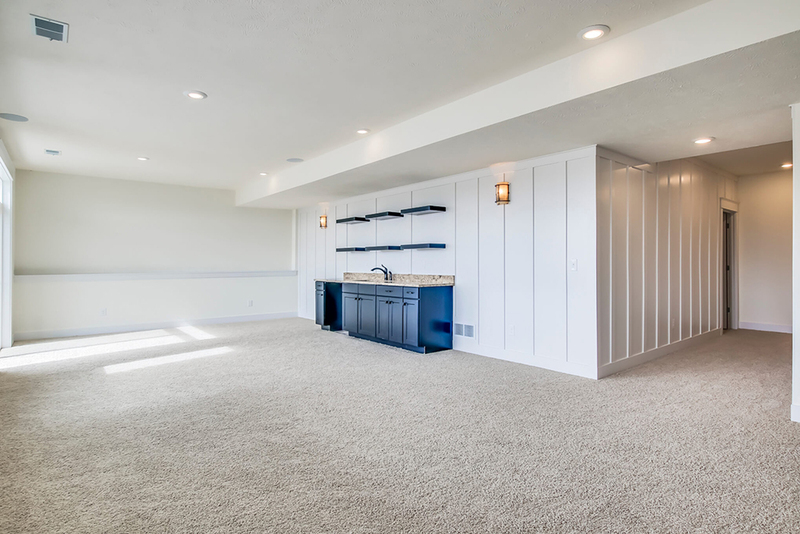 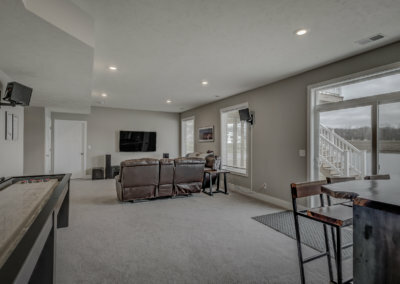 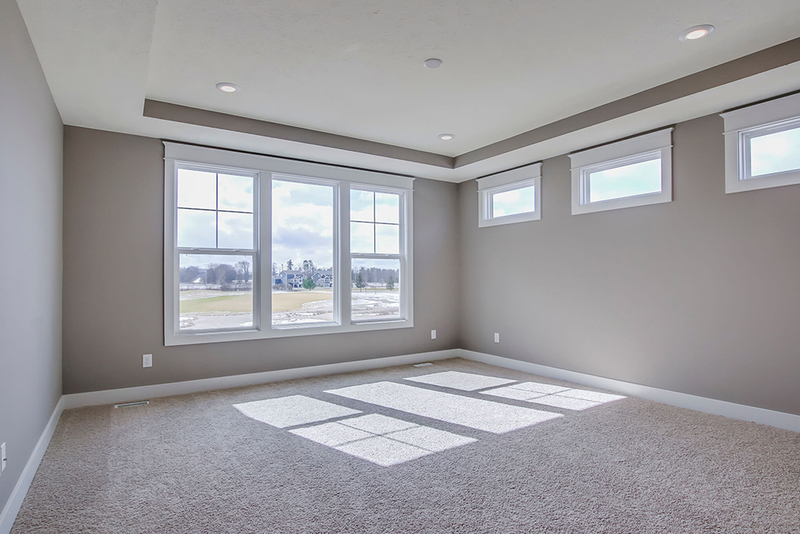 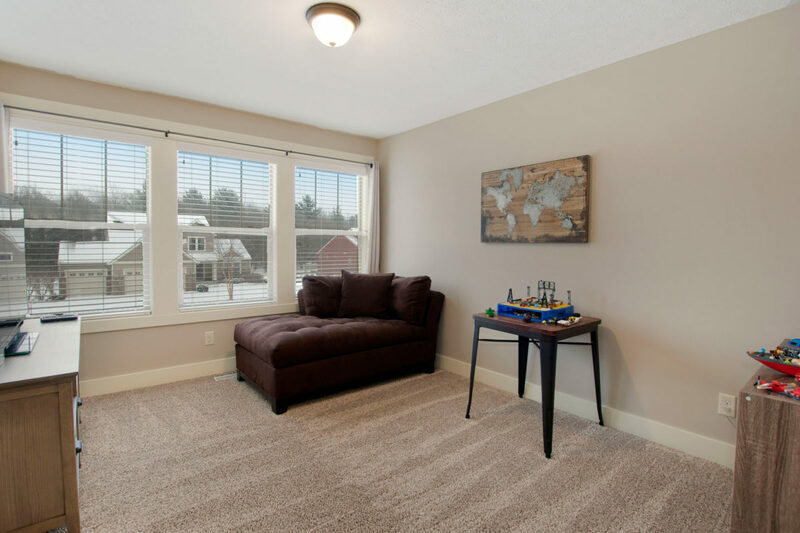 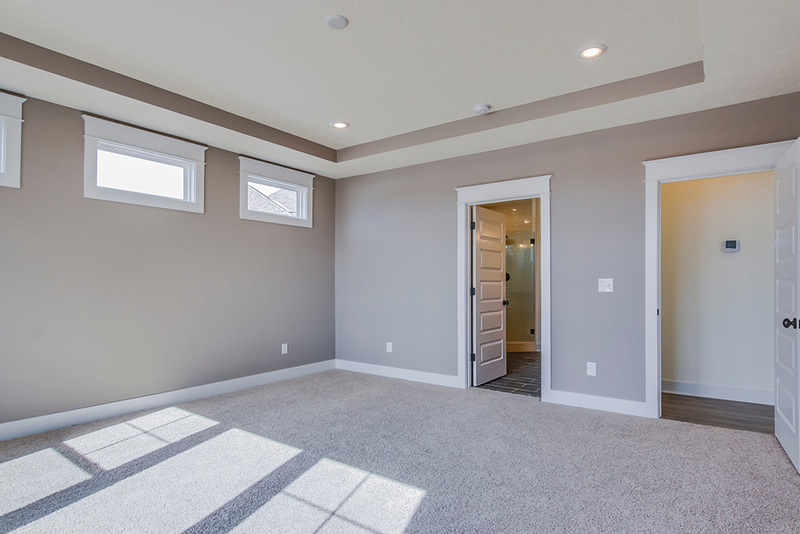 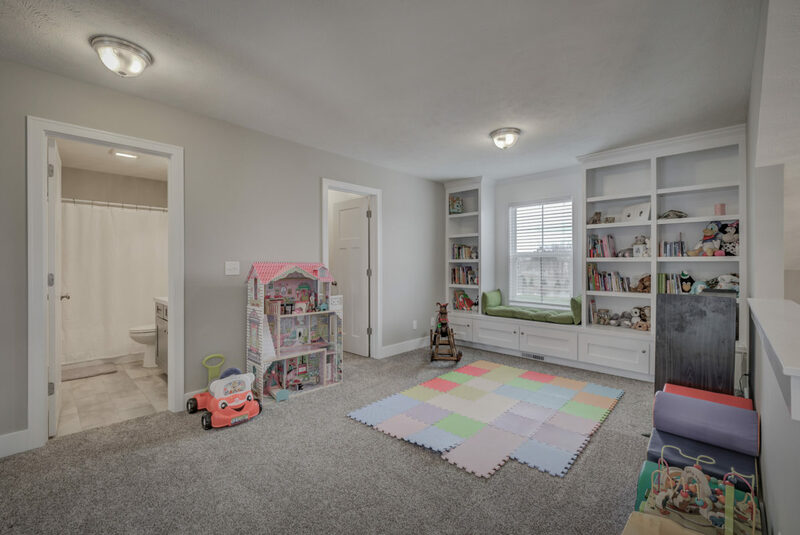 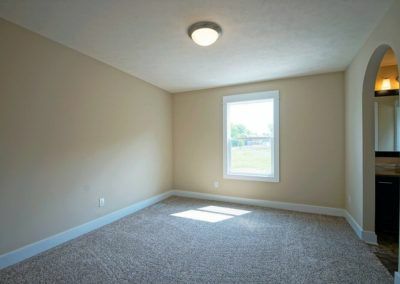 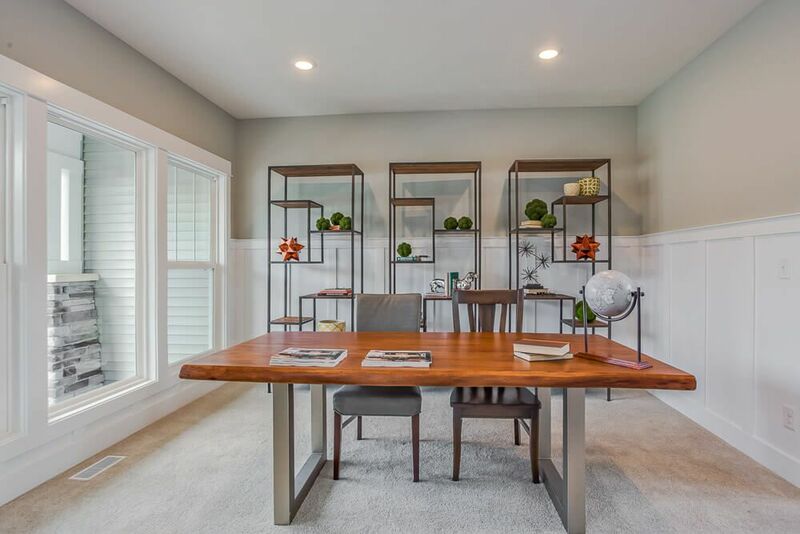 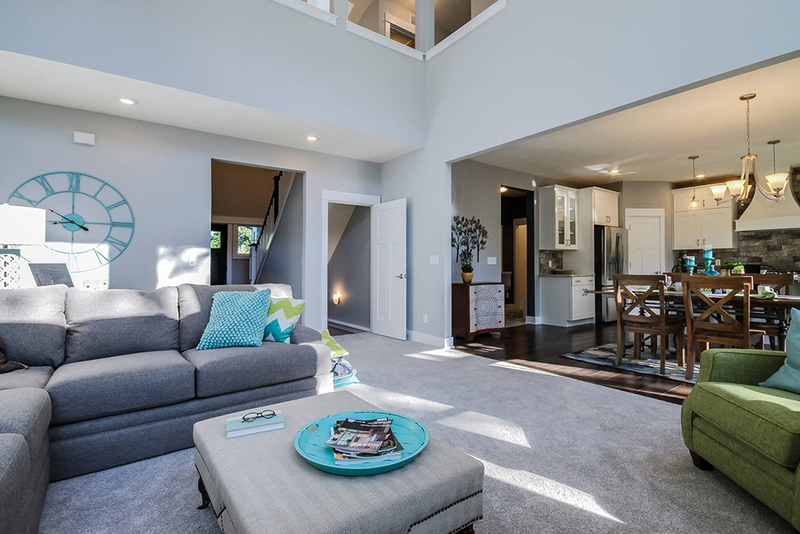 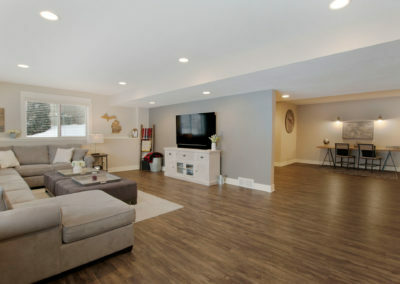 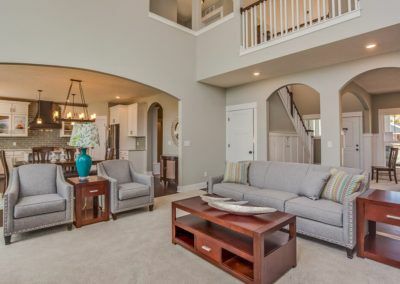 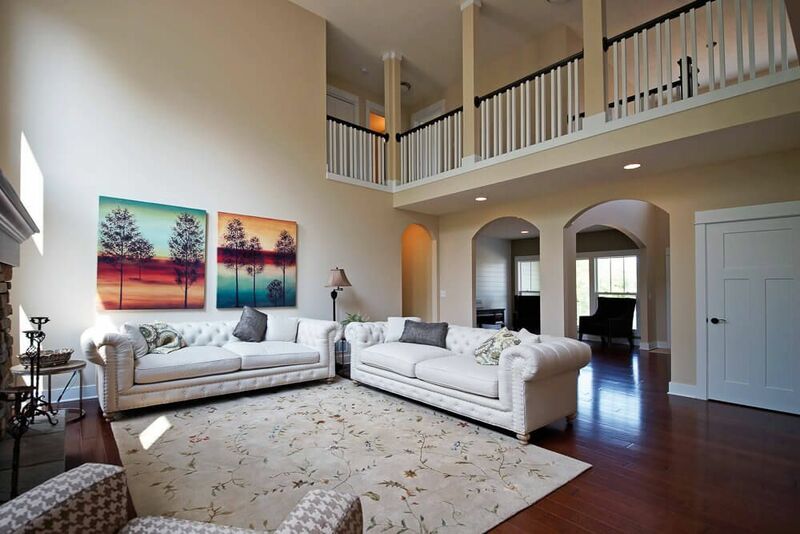 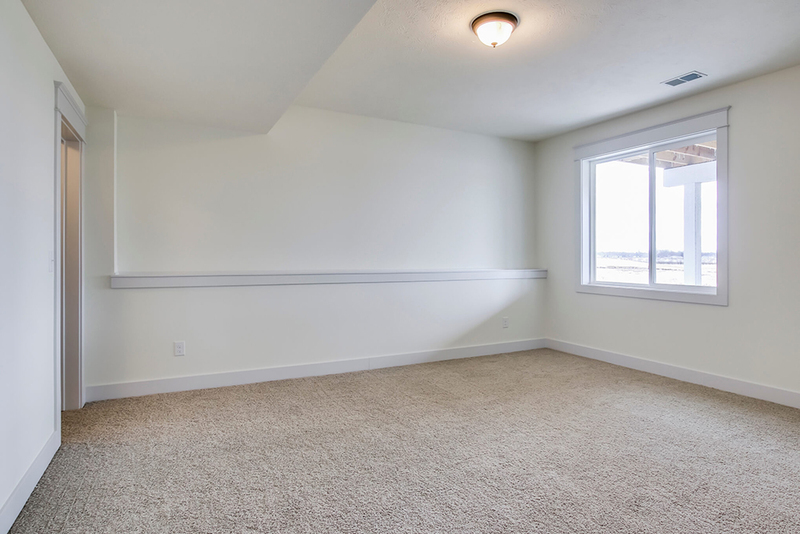 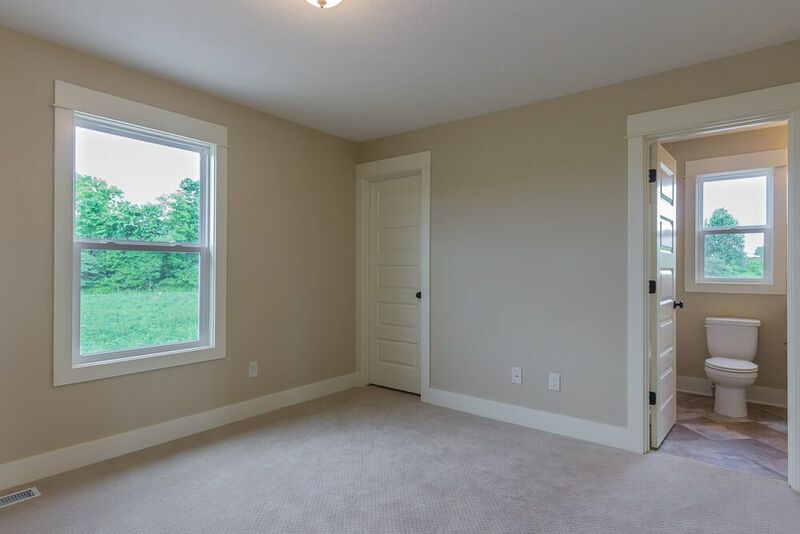 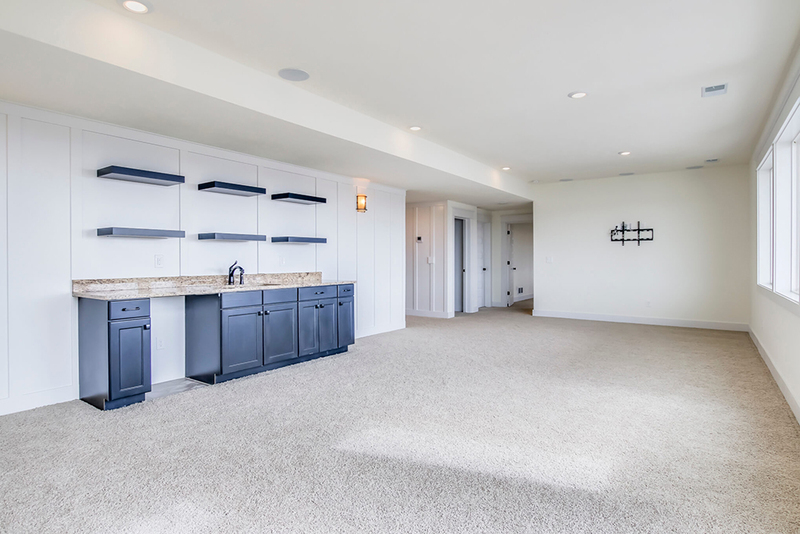 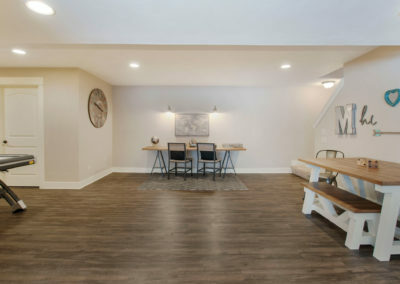 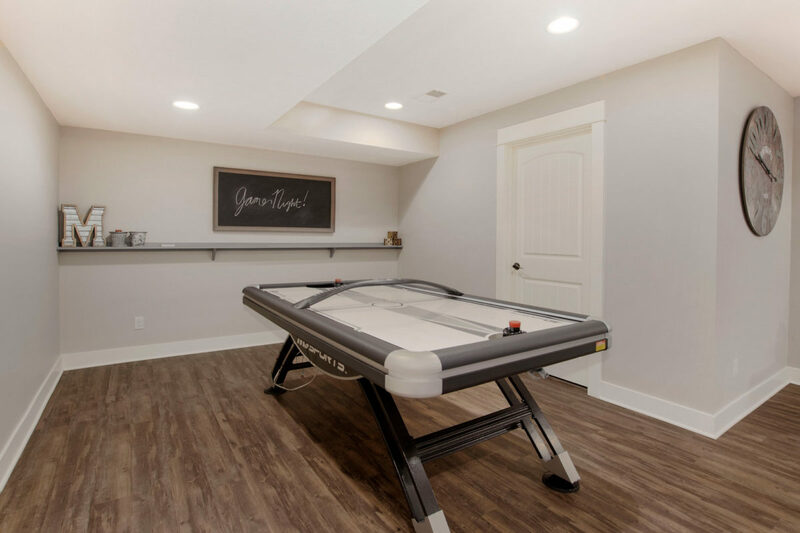 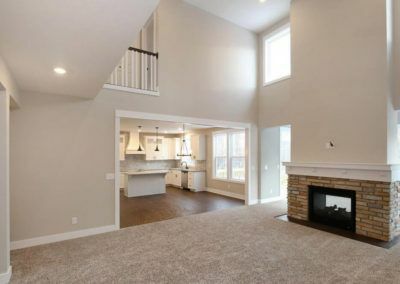 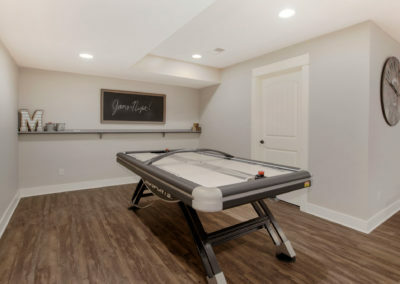 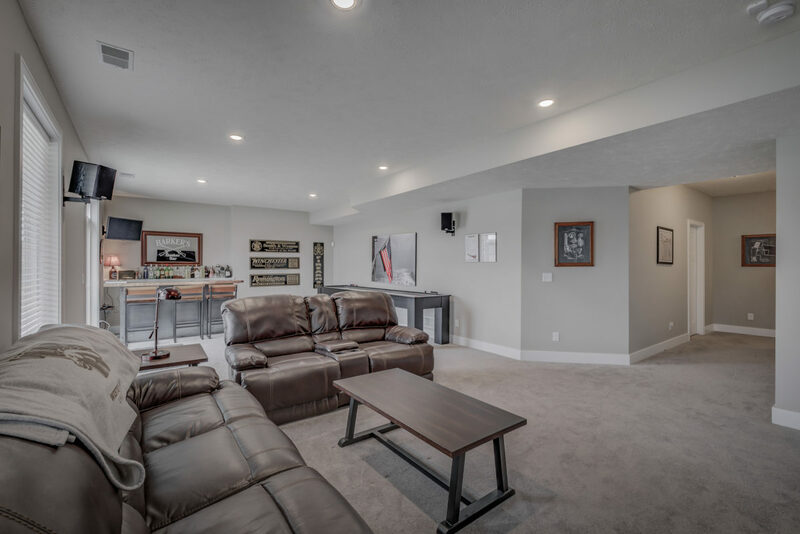 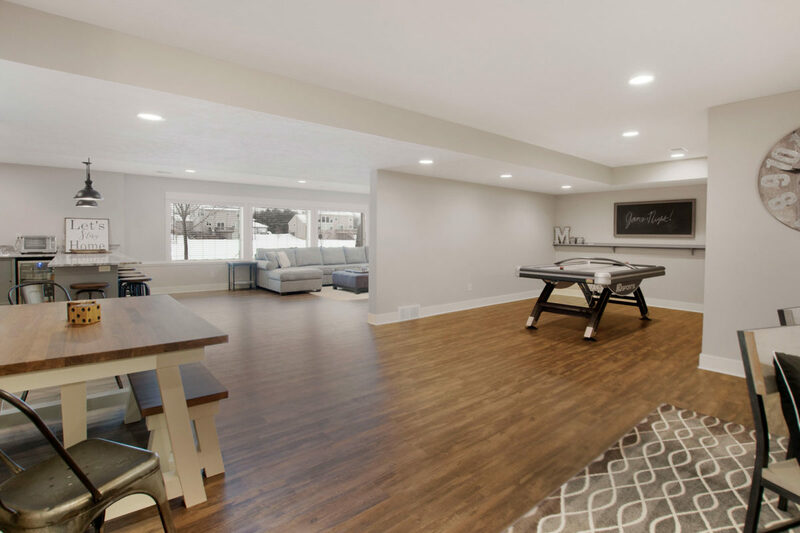 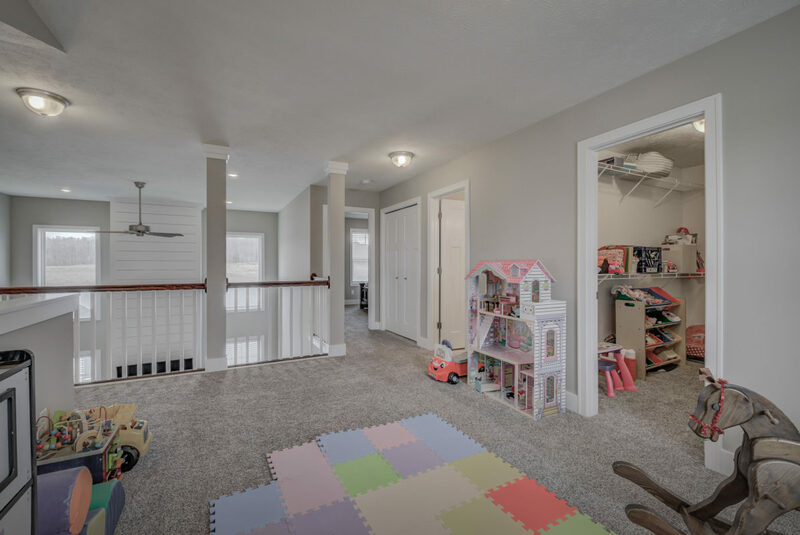 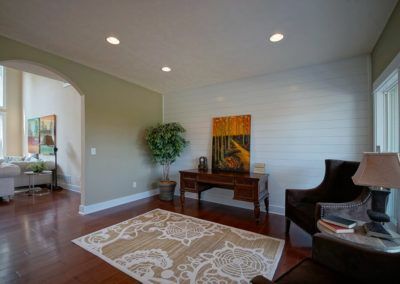 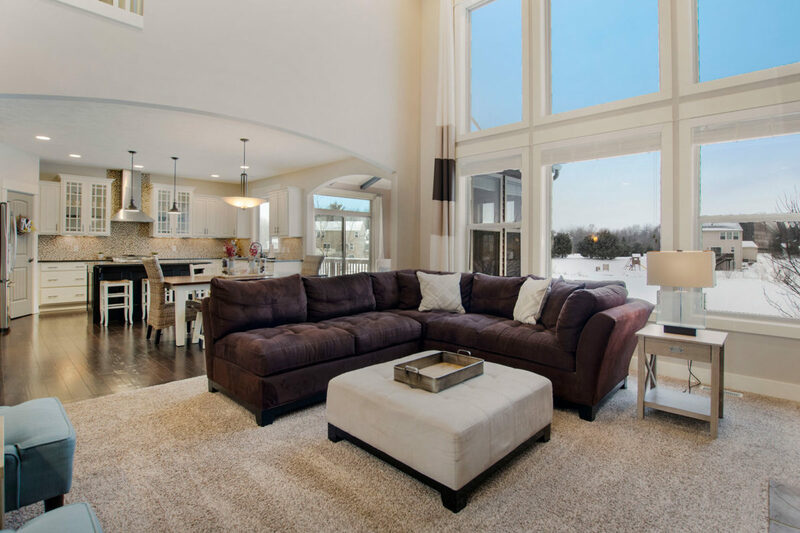 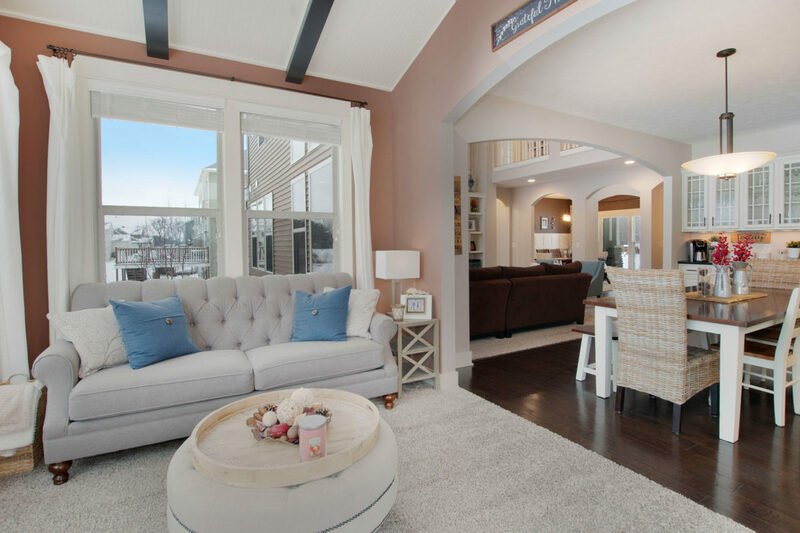 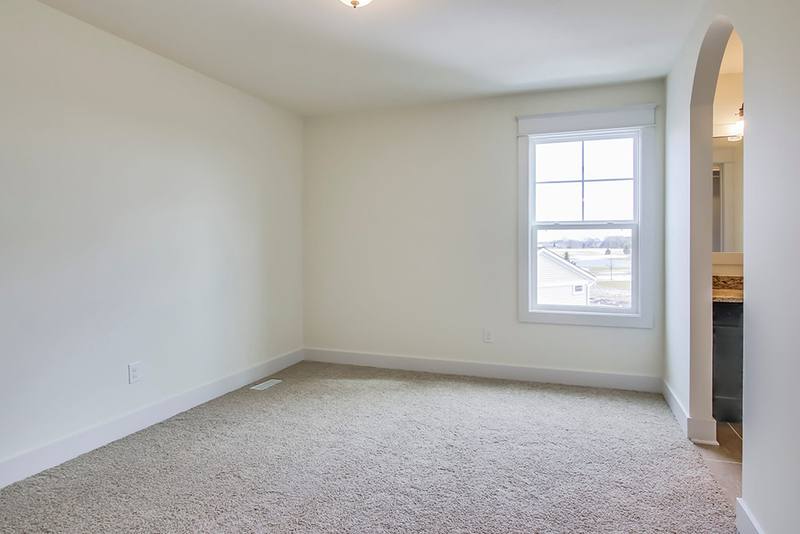 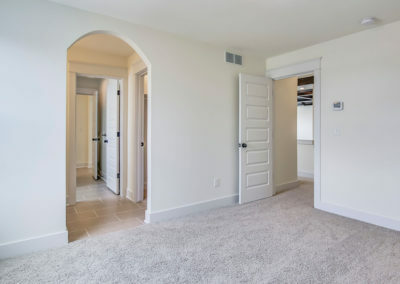 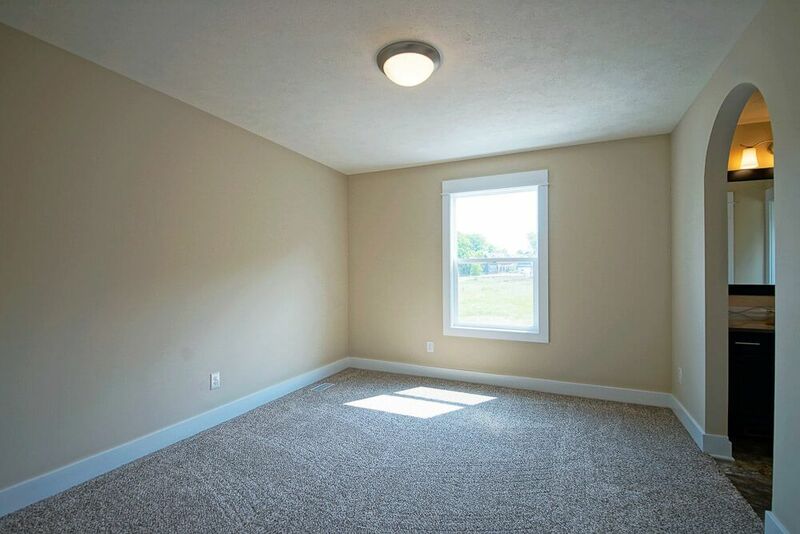 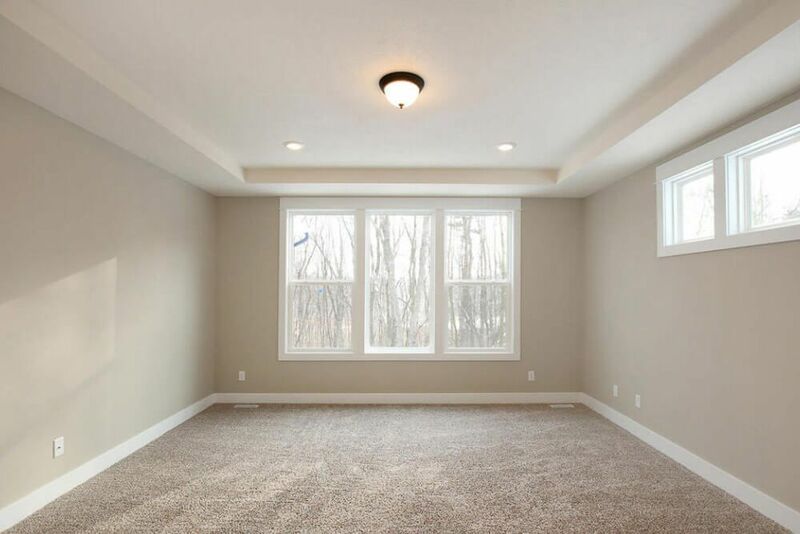 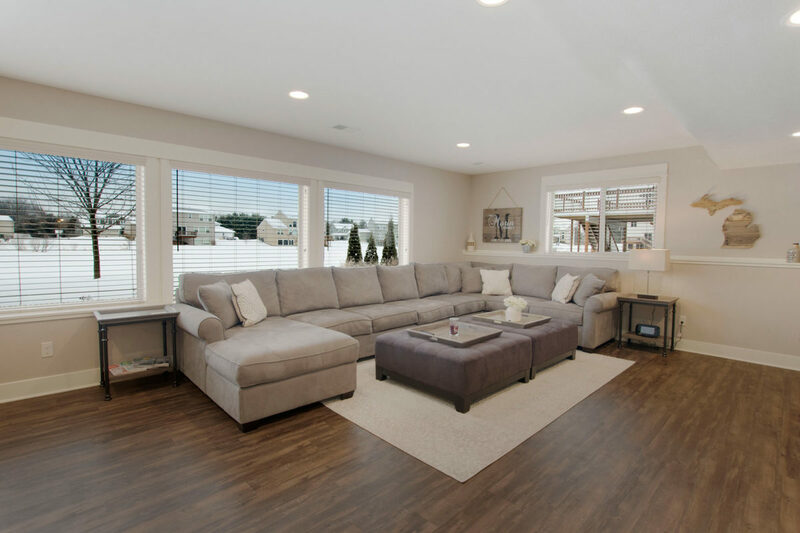 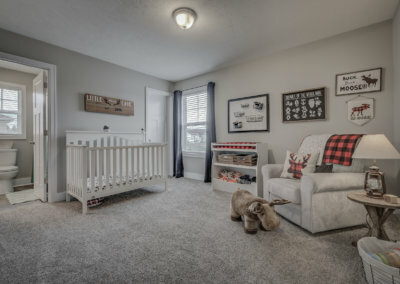 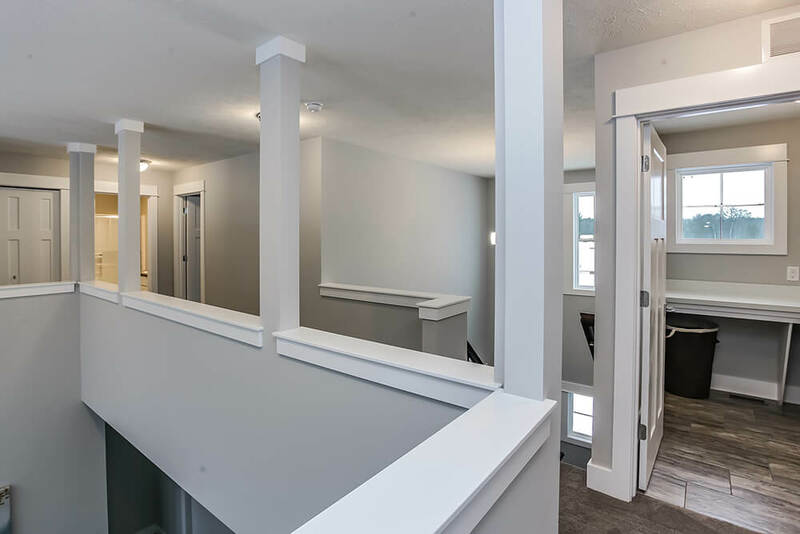 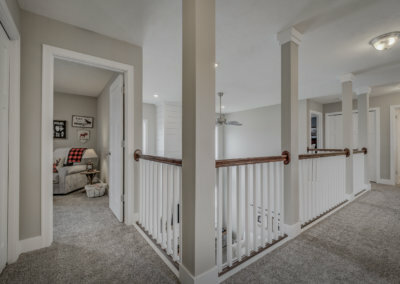 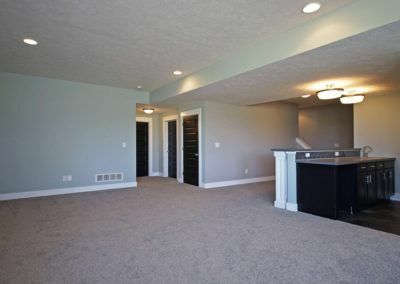 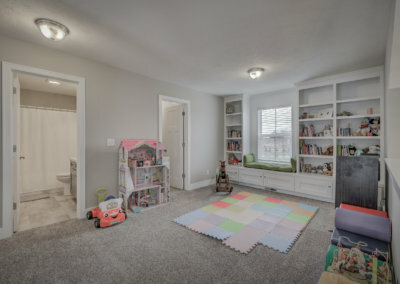 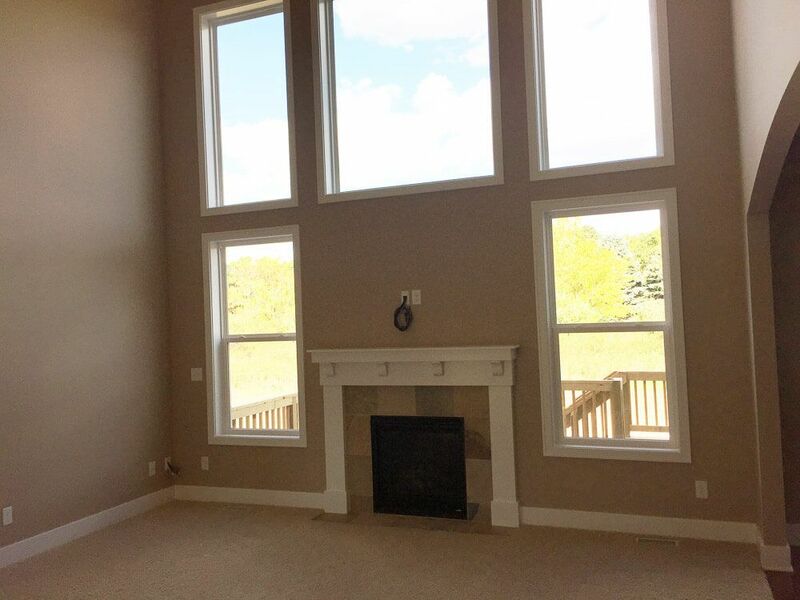 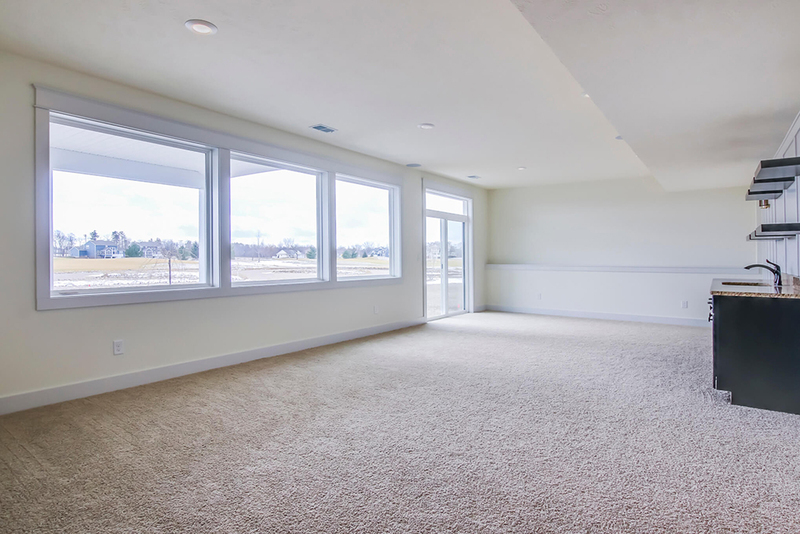 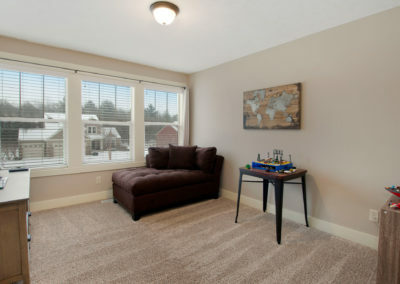 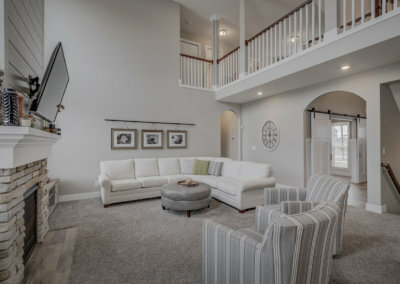 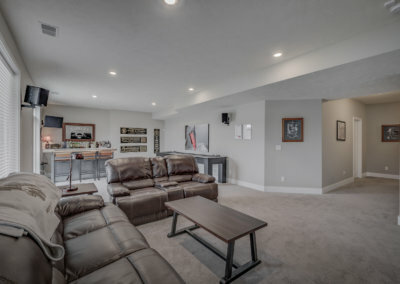 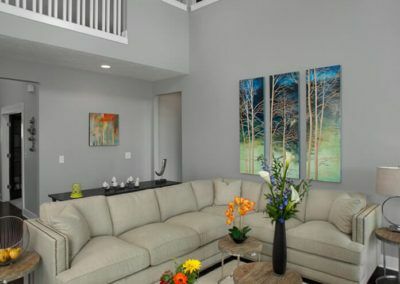 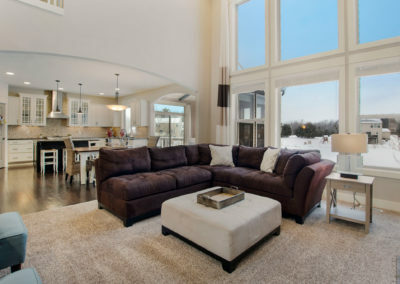 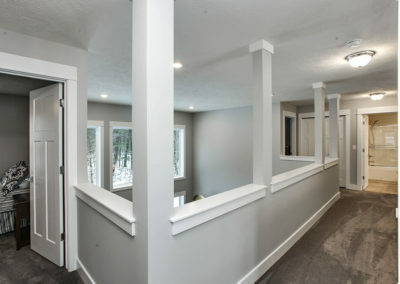 The Sebastian lower level leads off of the main level family room, and can be built to suite your needs. 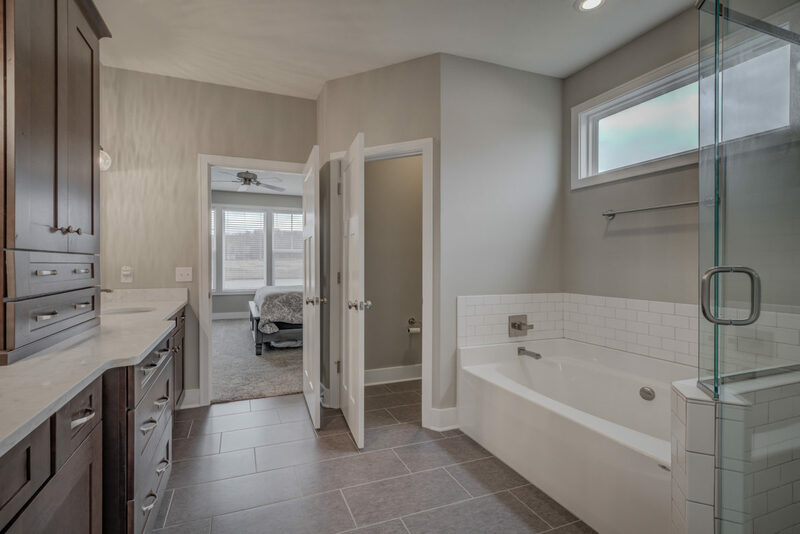 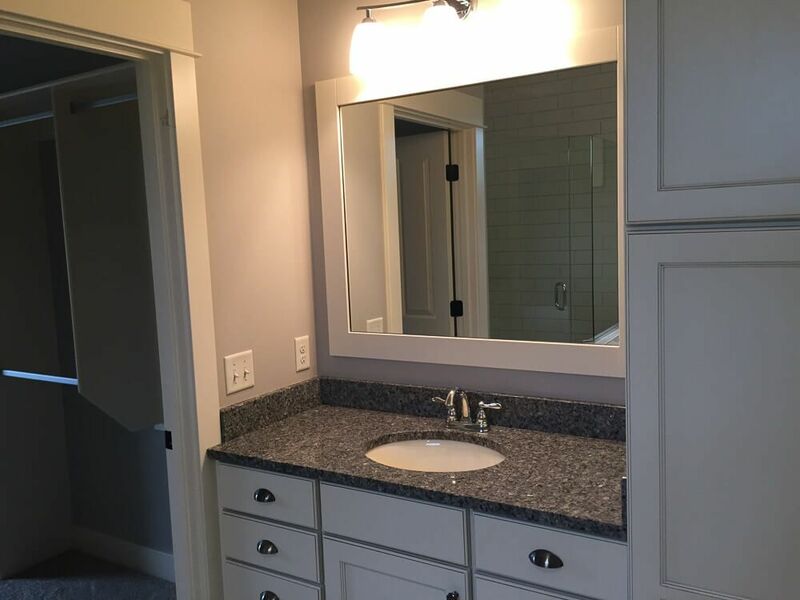 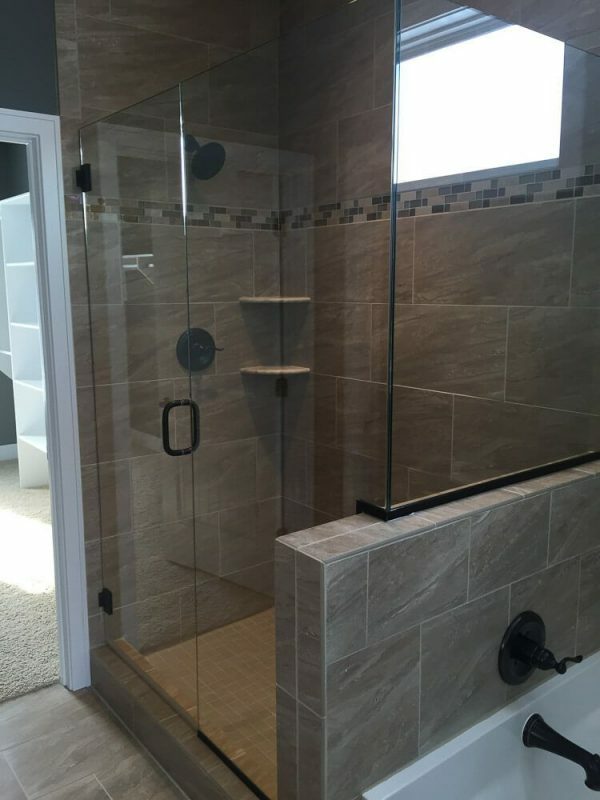 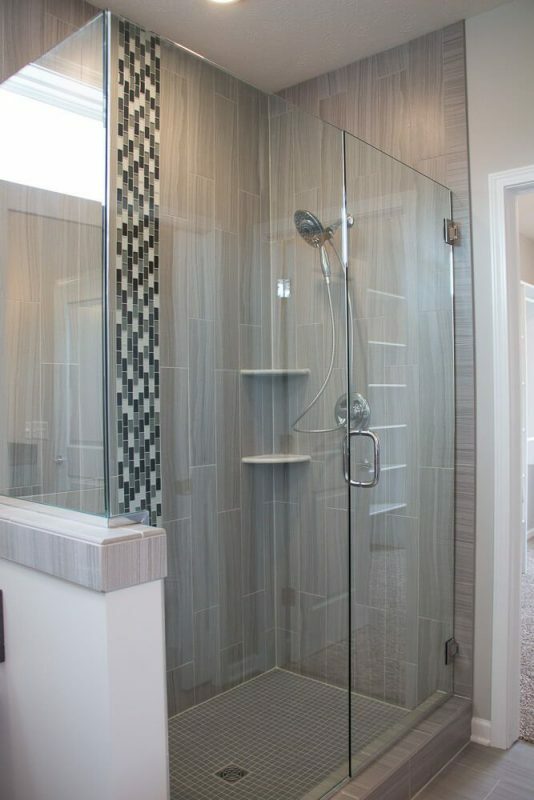 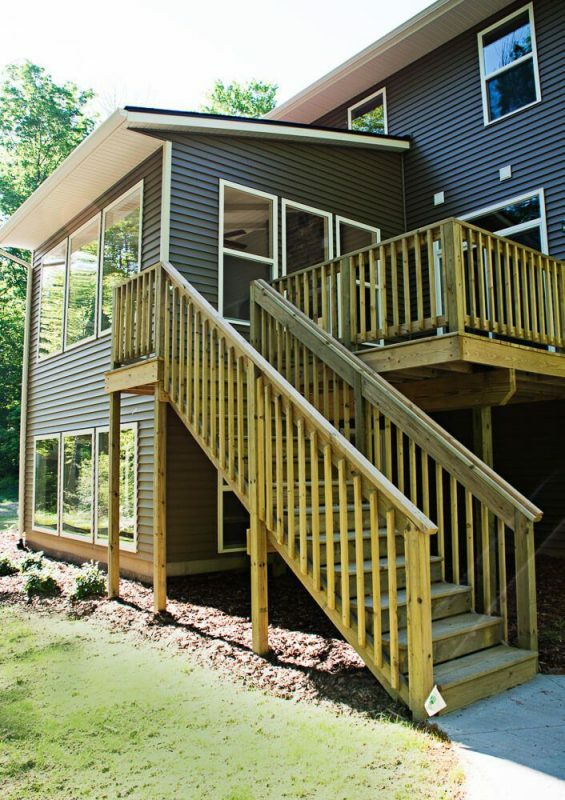 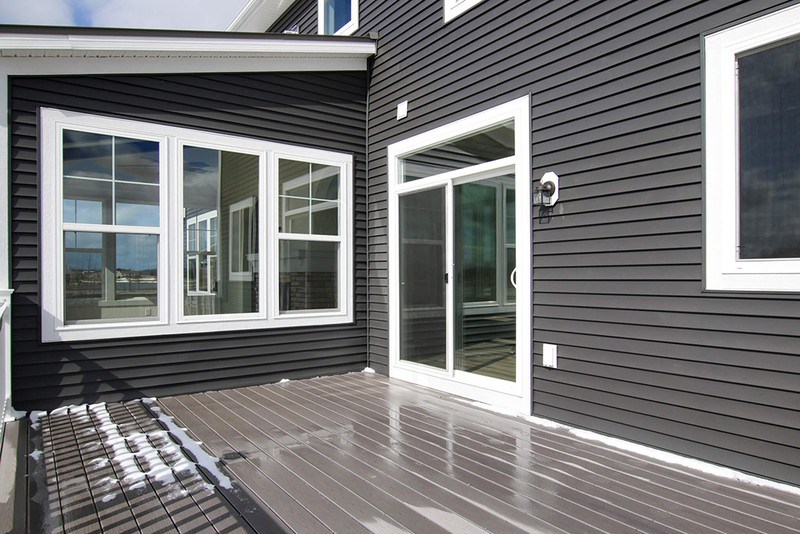 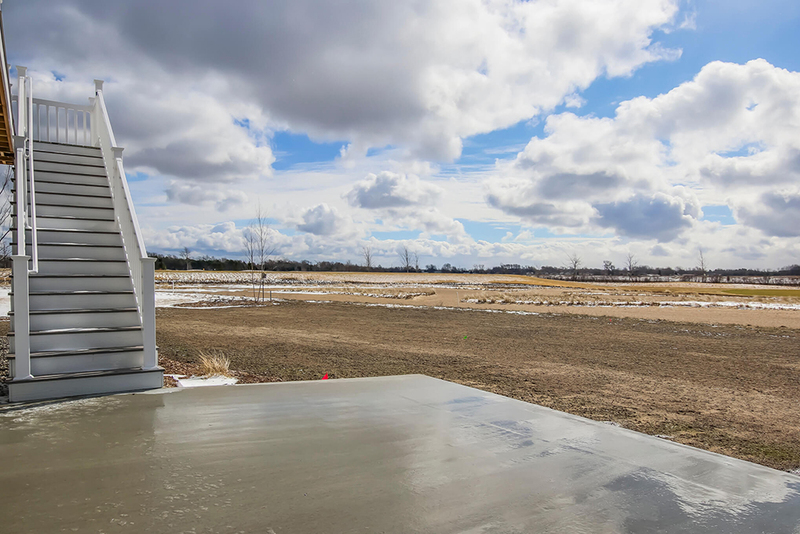 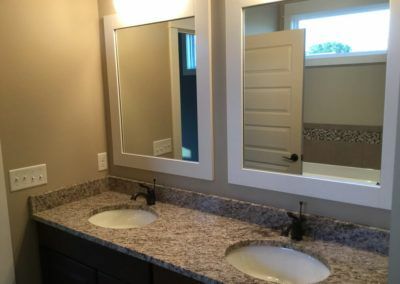 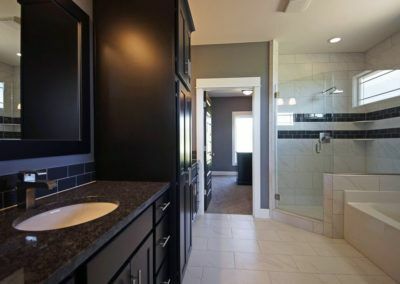 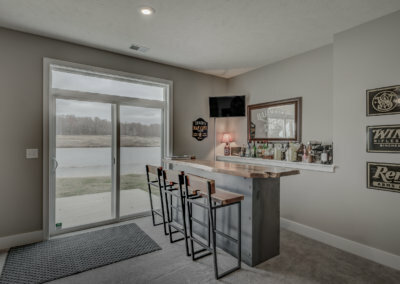 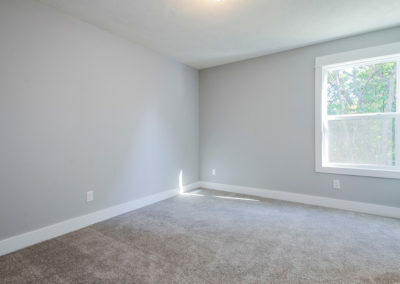 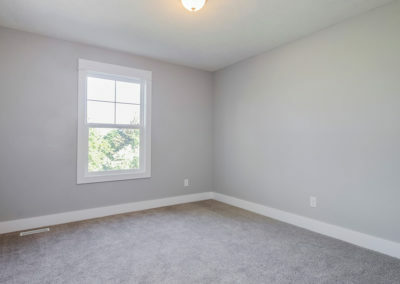 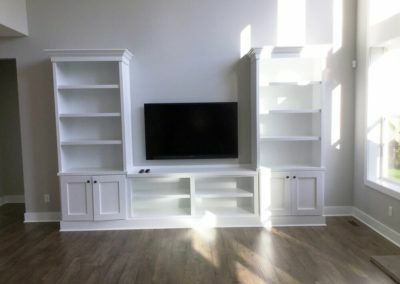 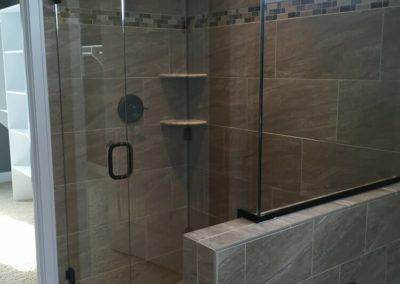 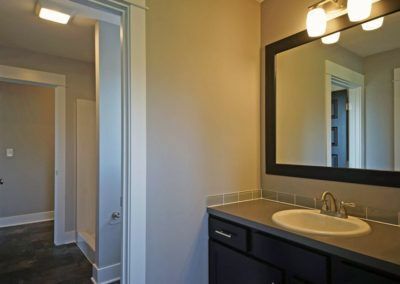 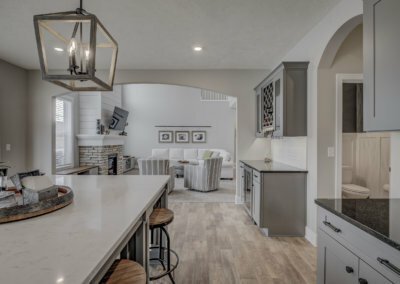 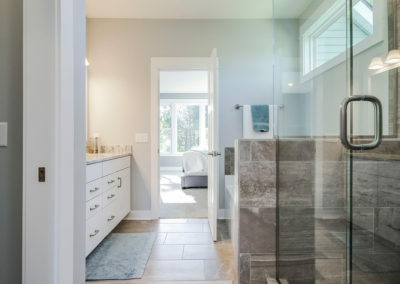 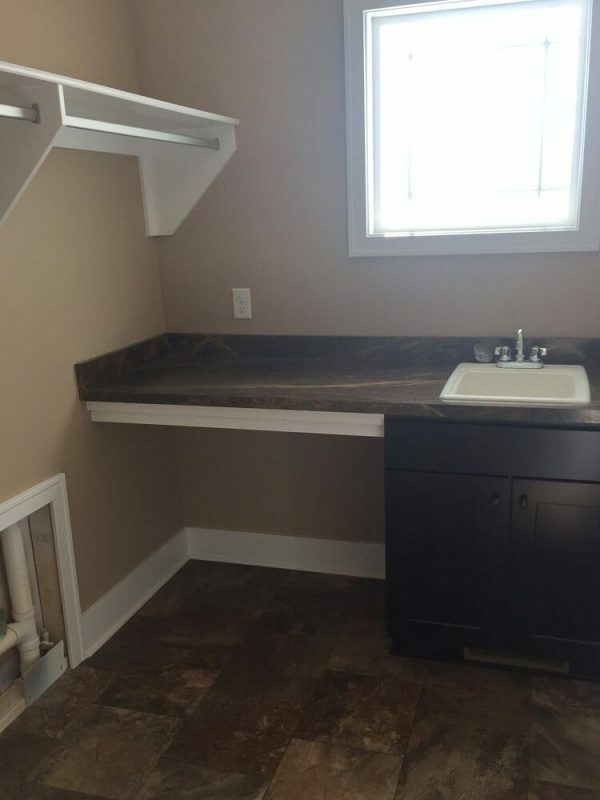 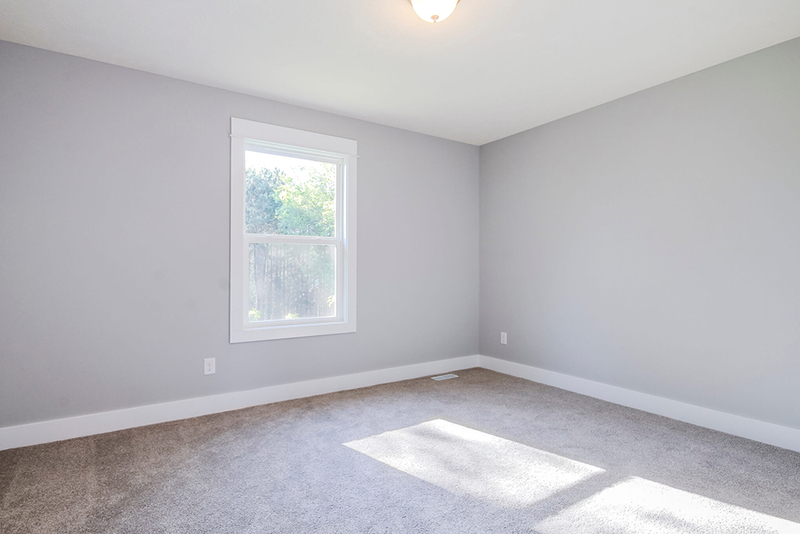 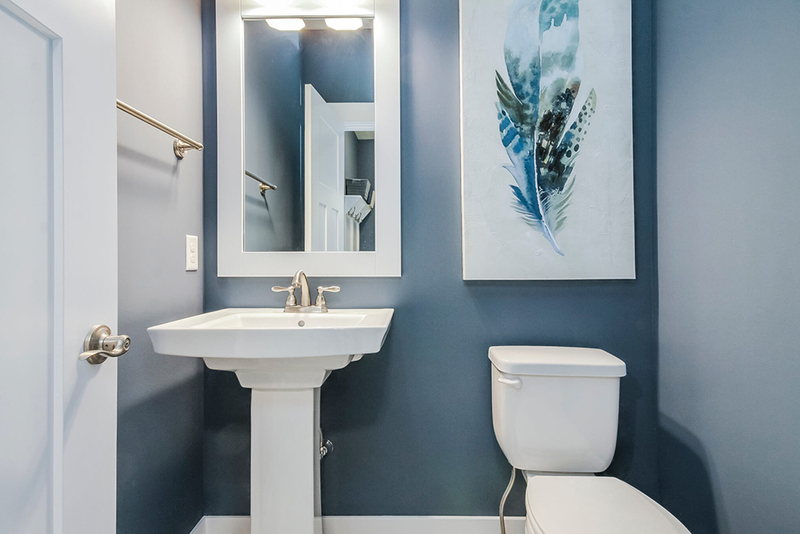 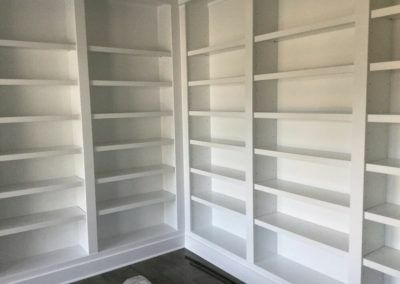 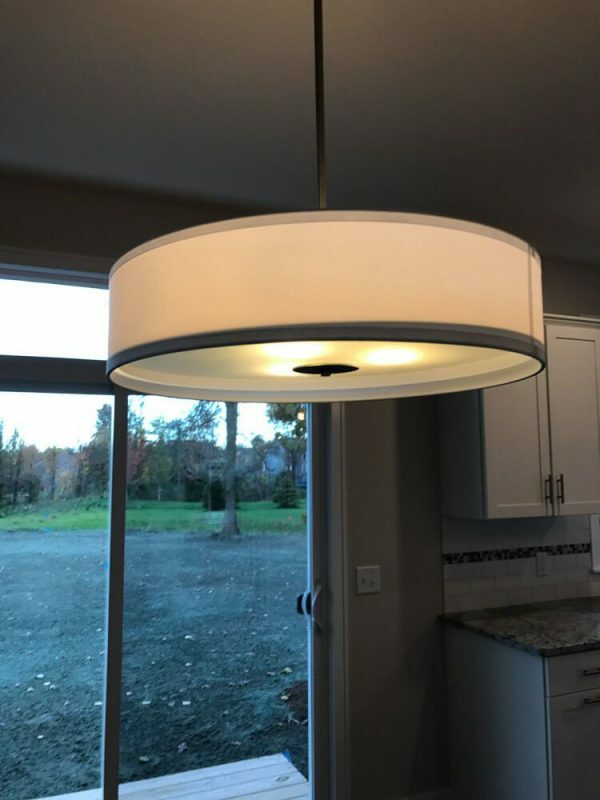 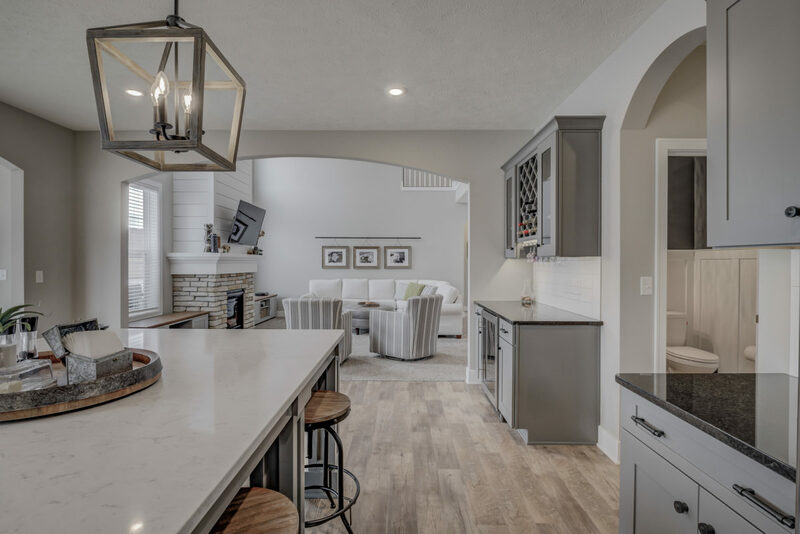 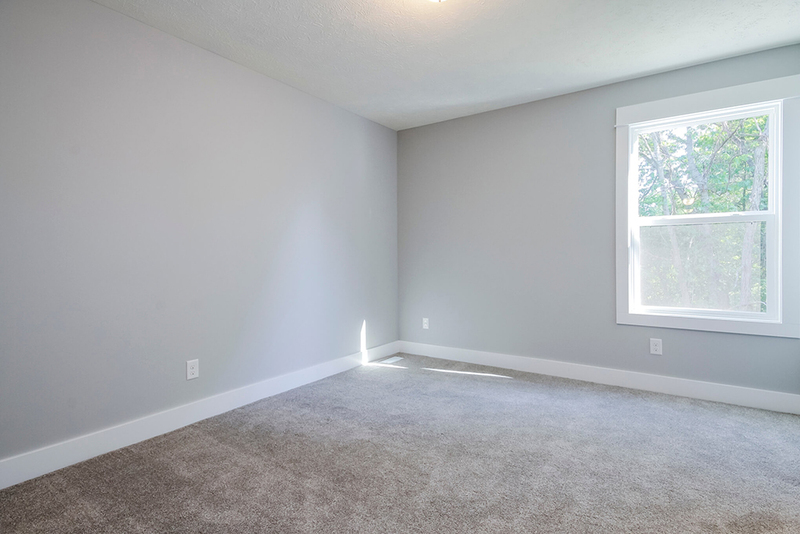 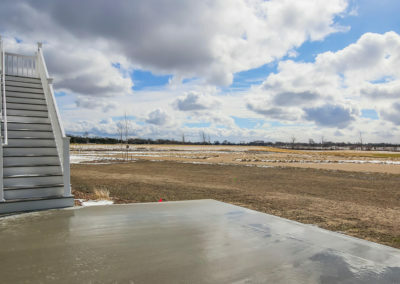 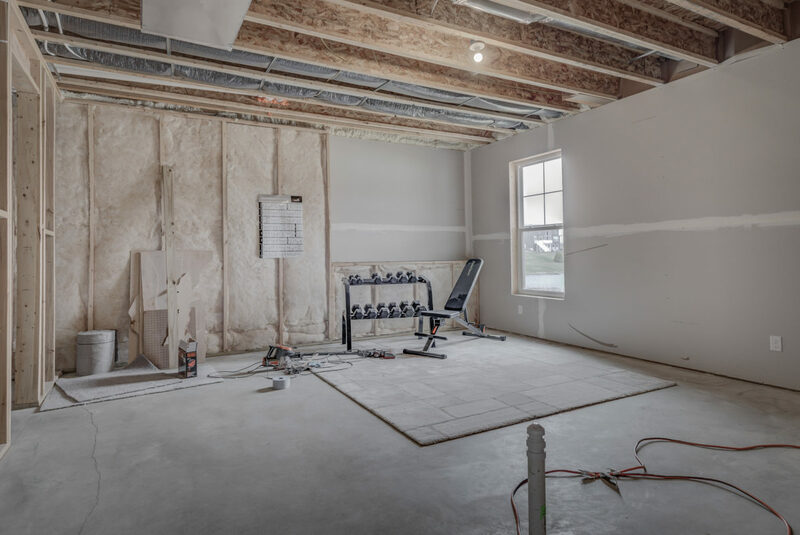 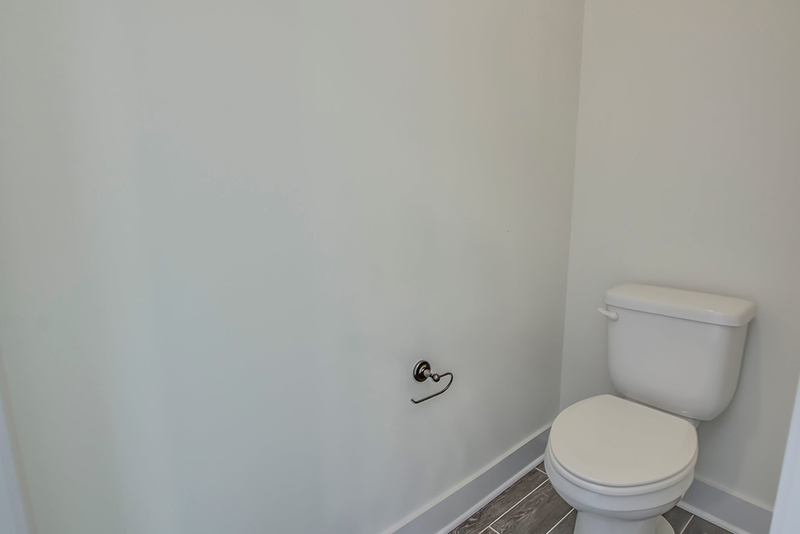 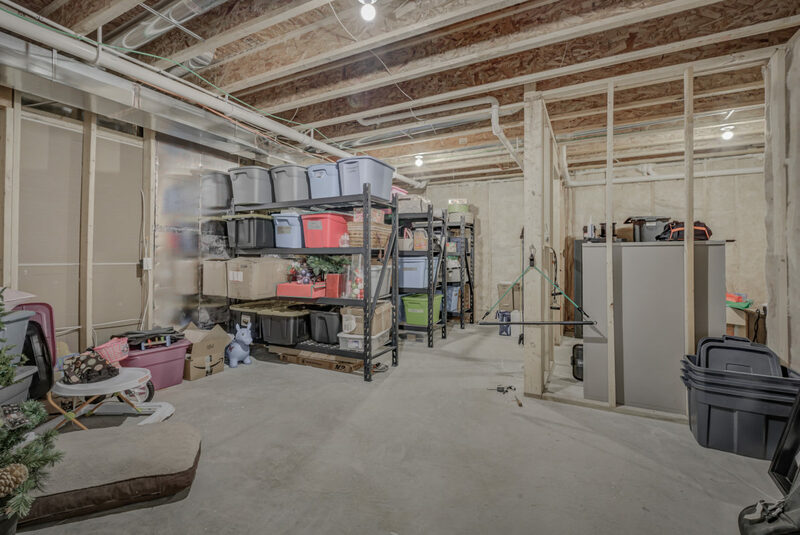 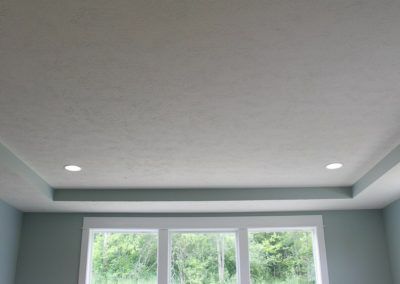 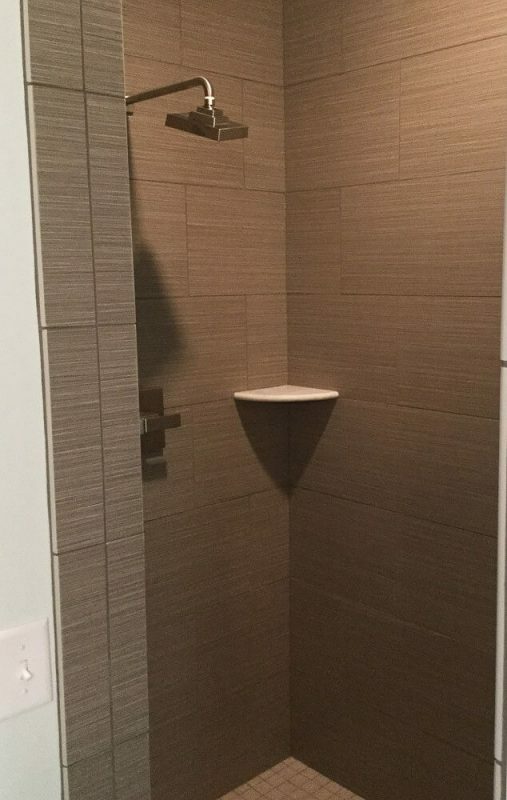 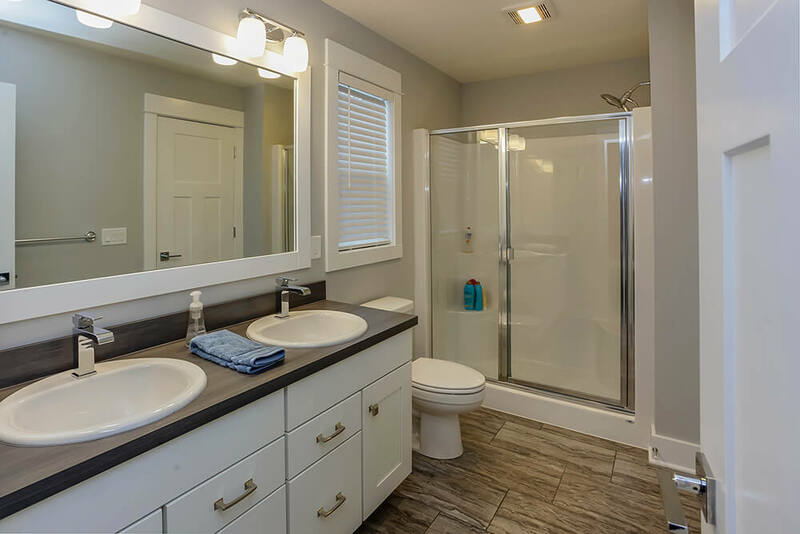 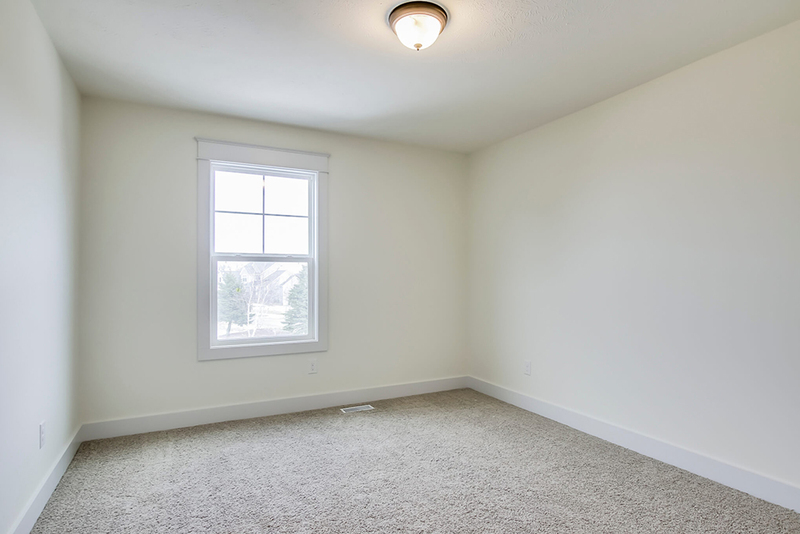 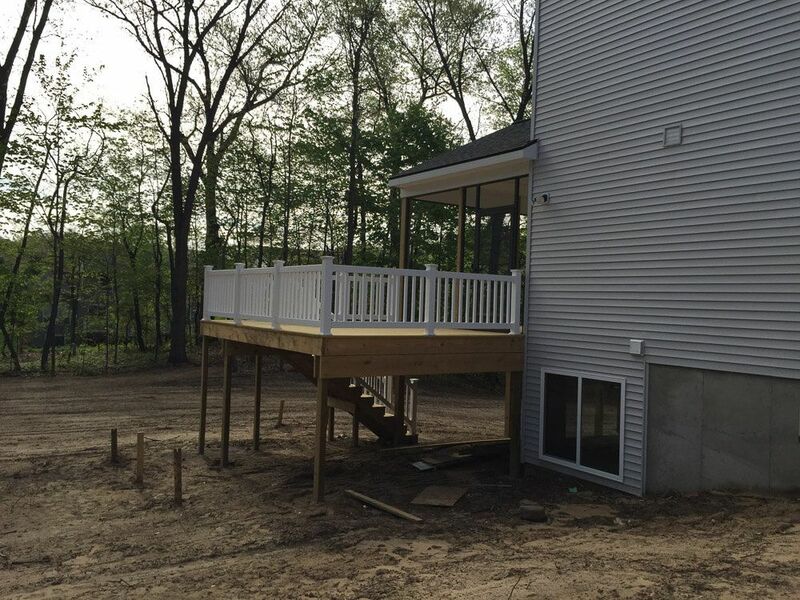 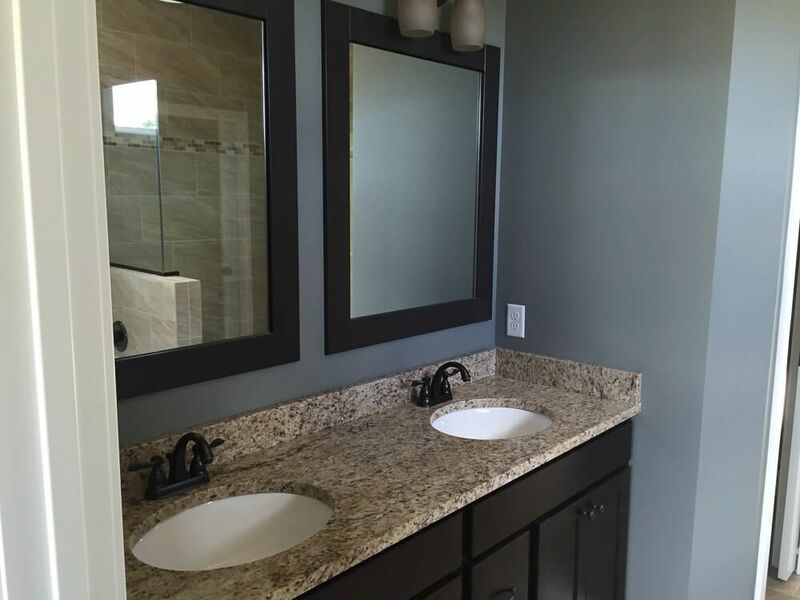 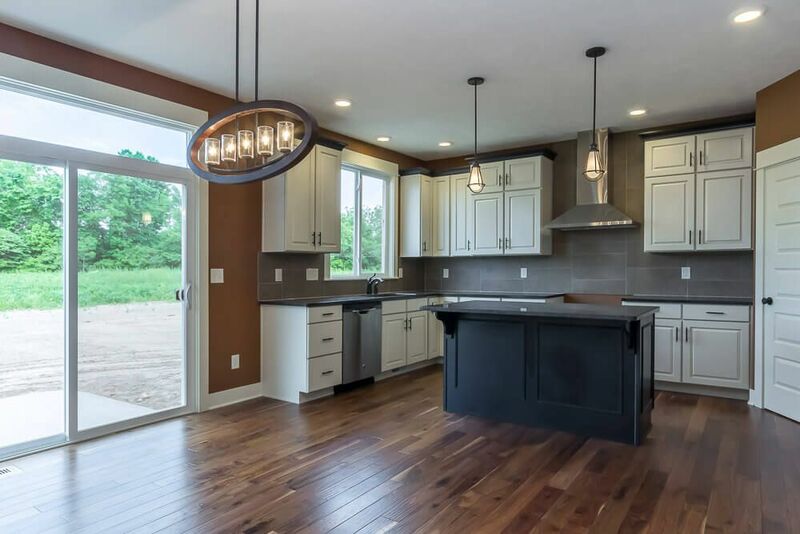 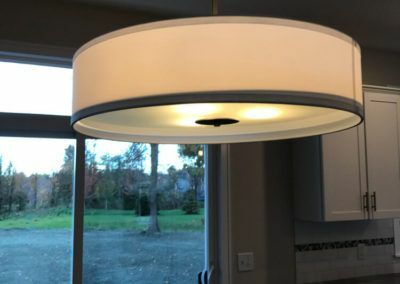 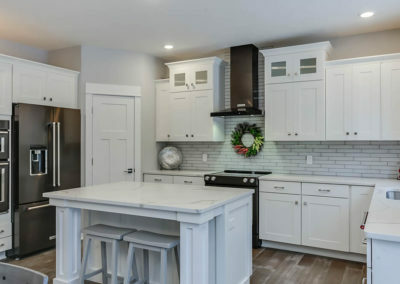 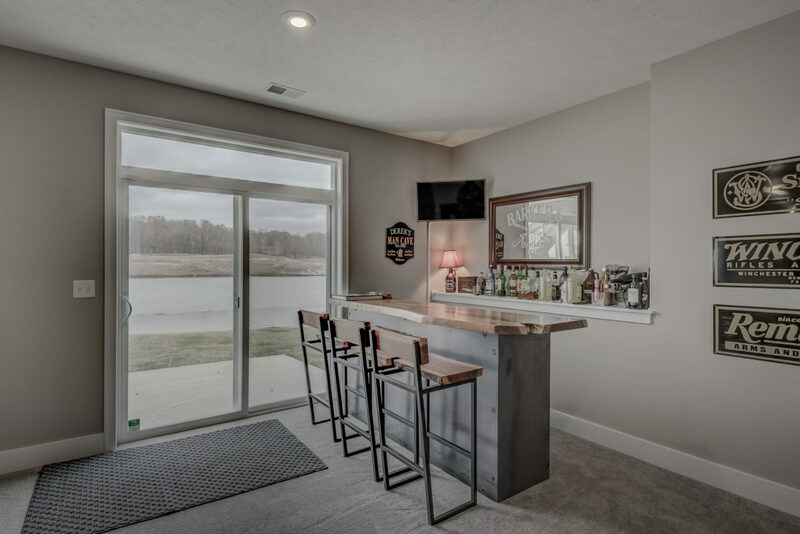 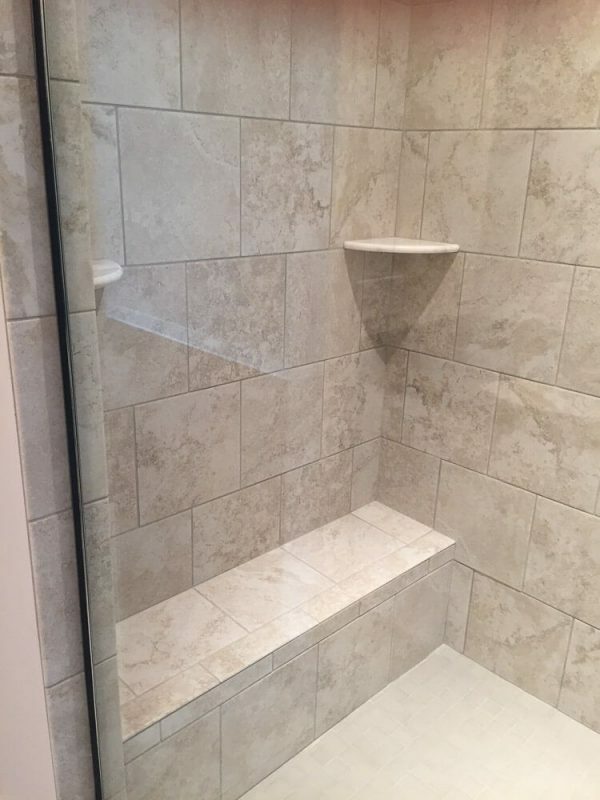 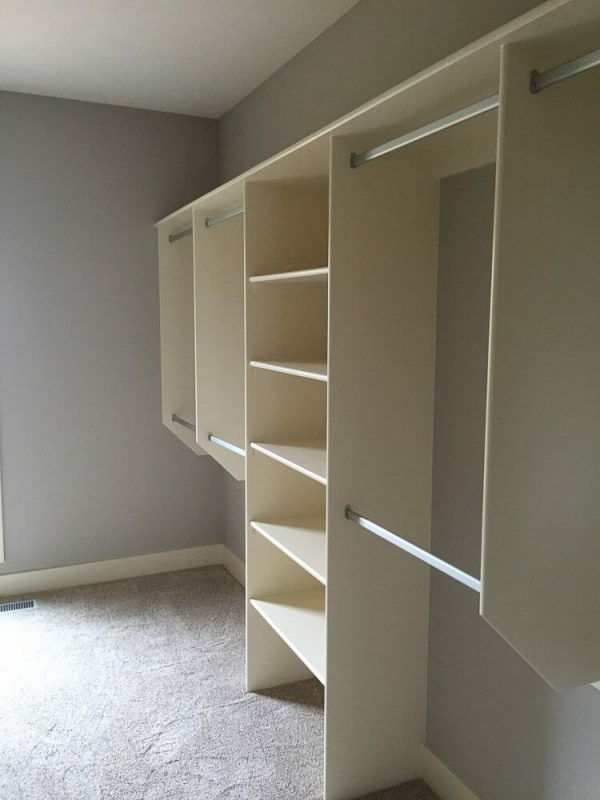 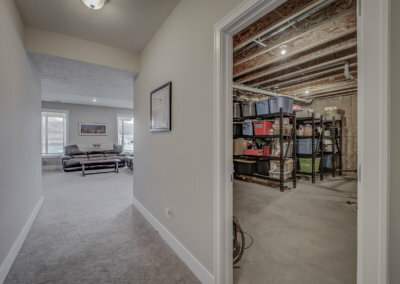 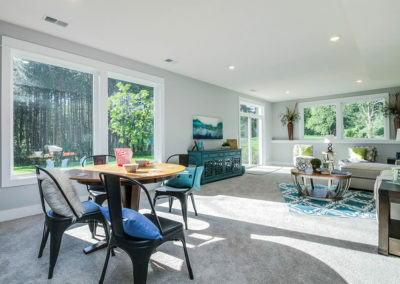 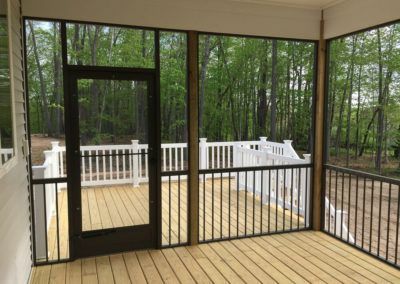 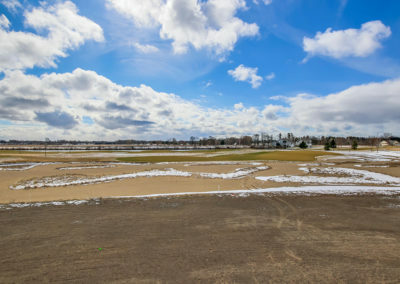 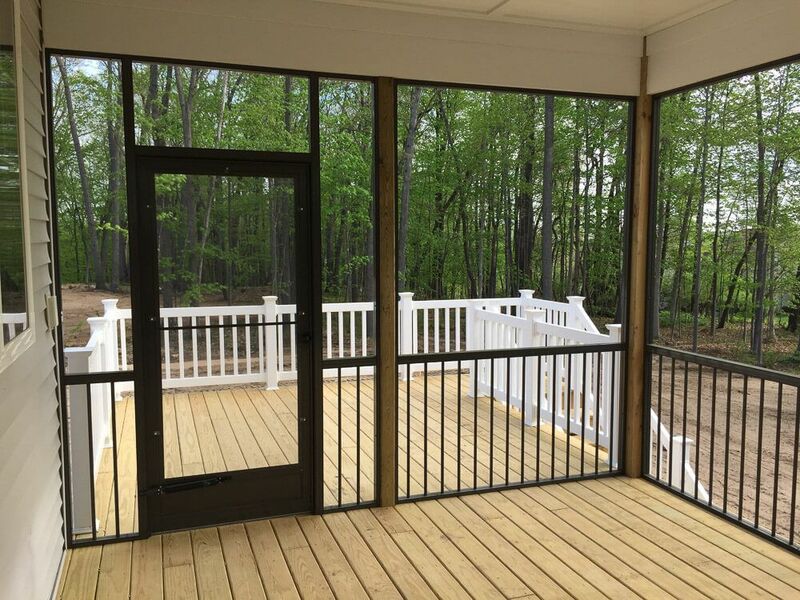 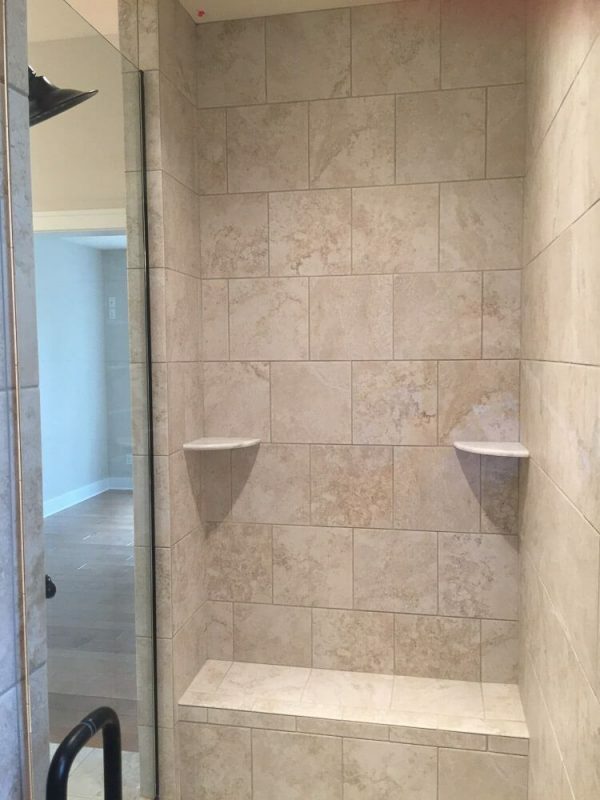 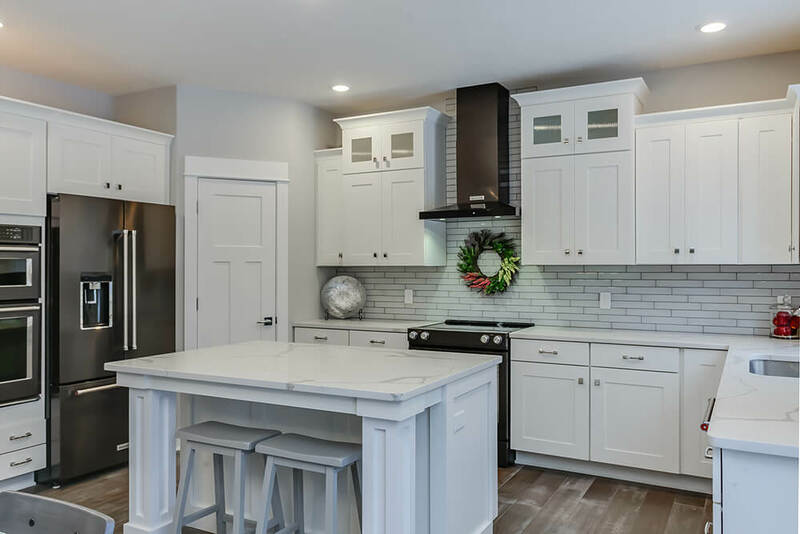 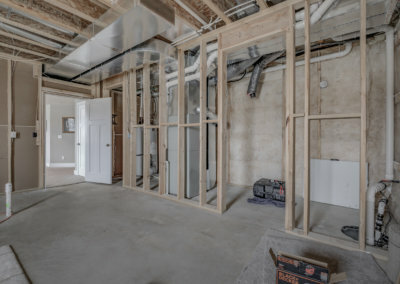 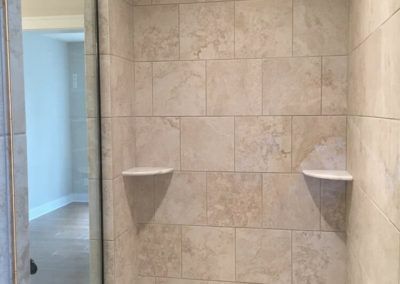 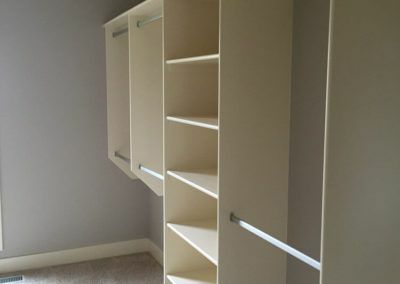 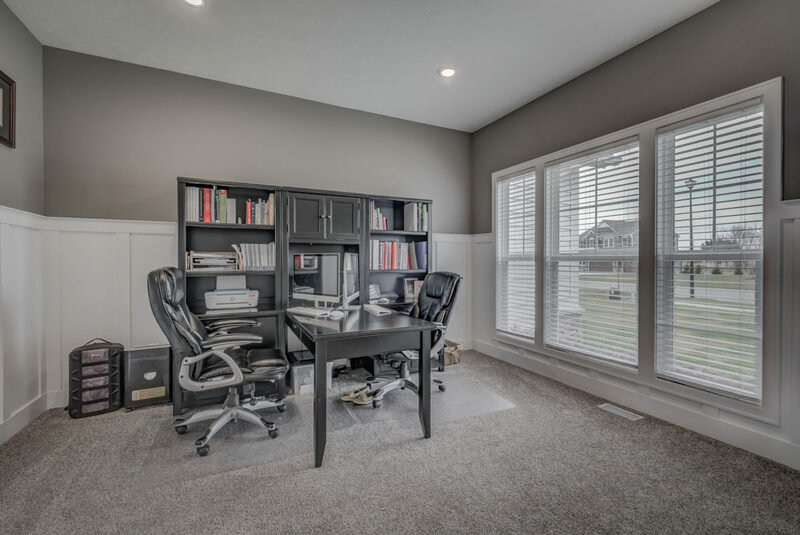 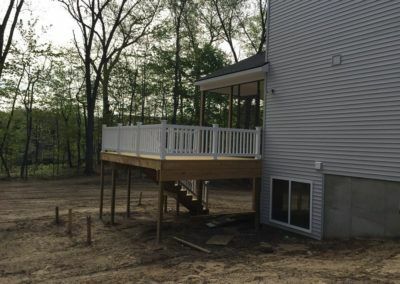 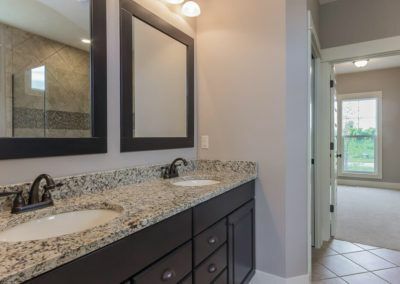 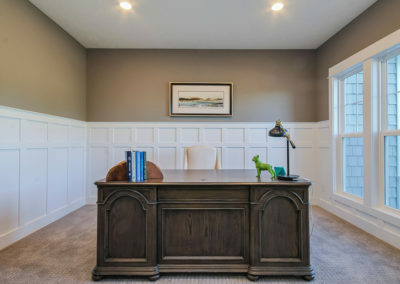 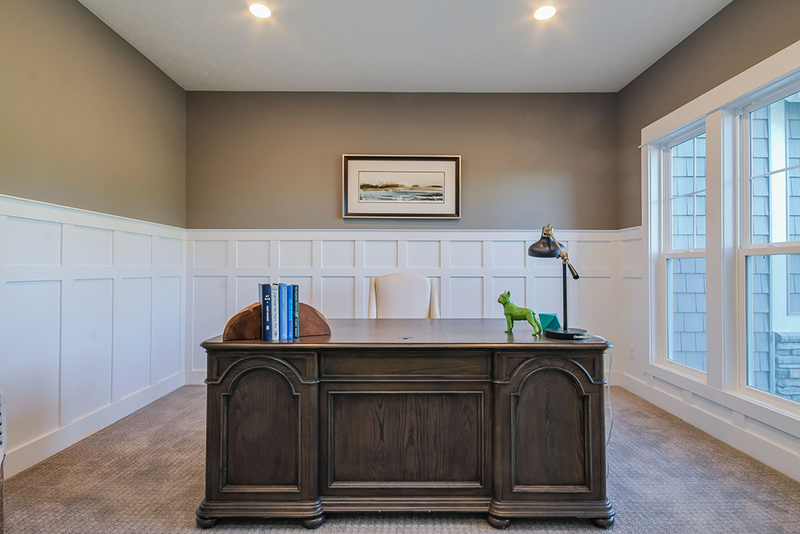 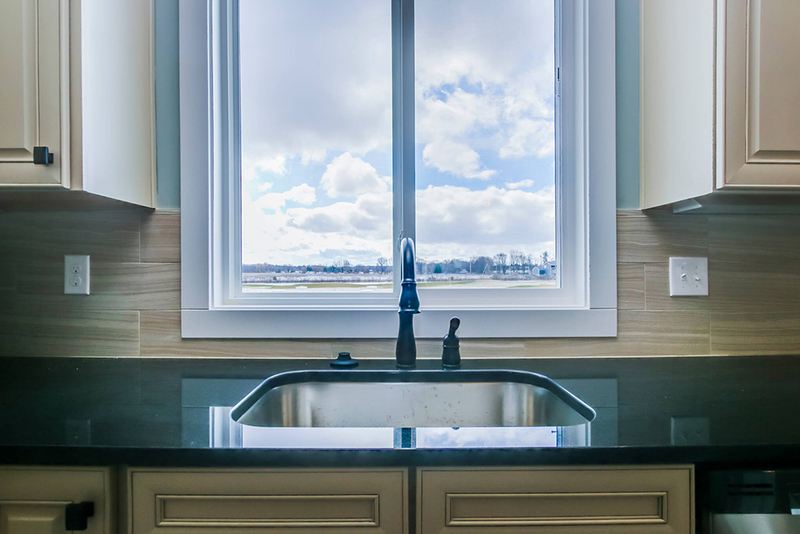 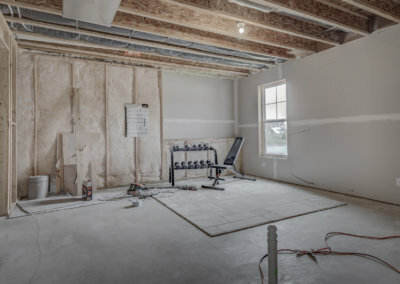 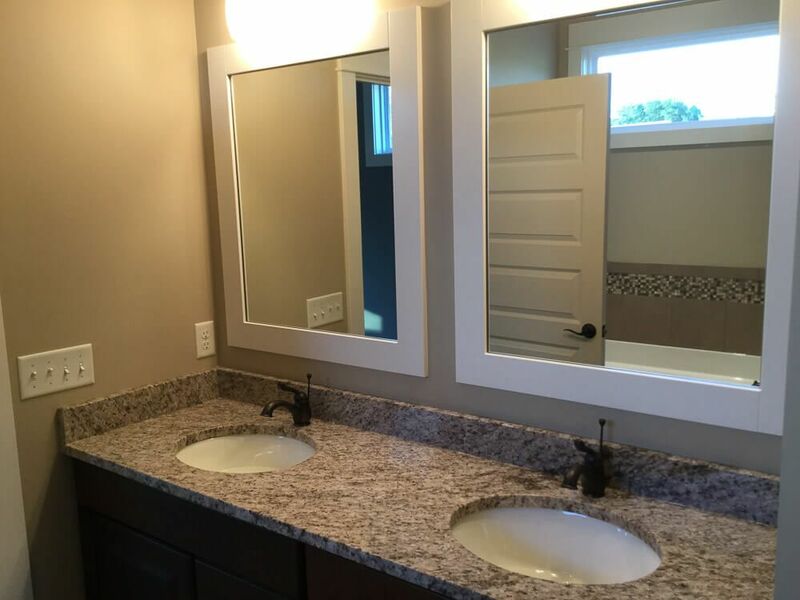 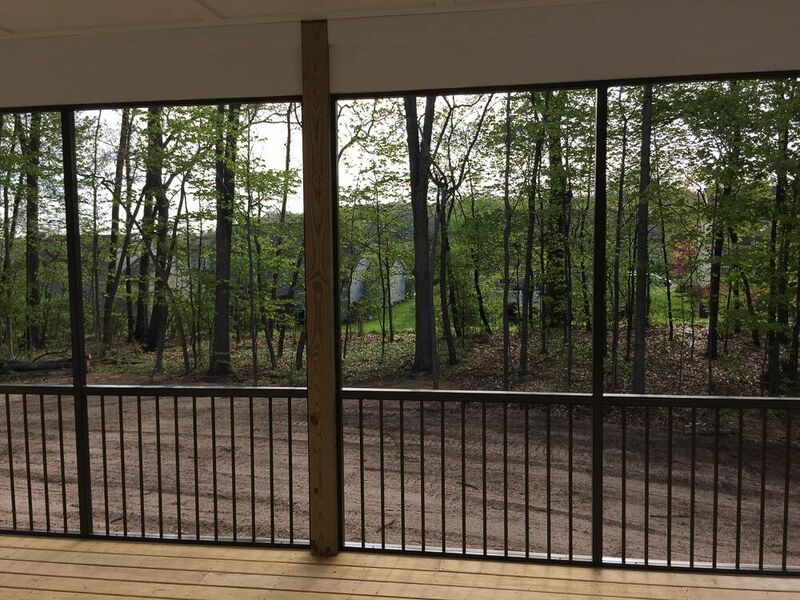 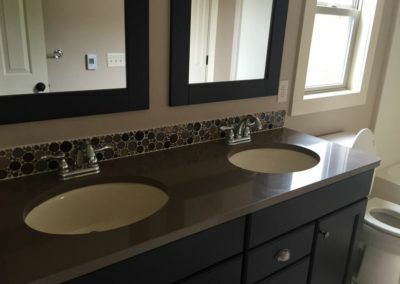 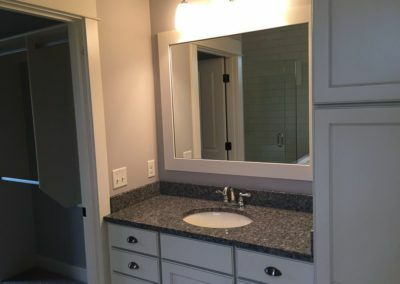 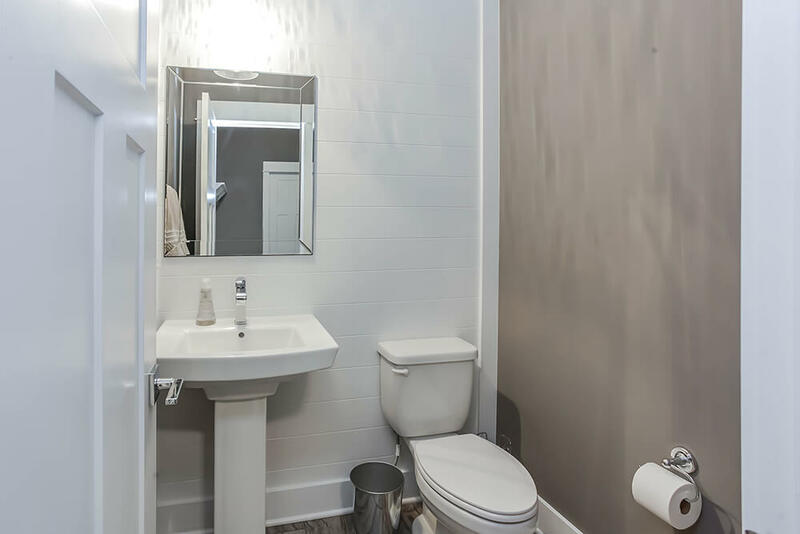 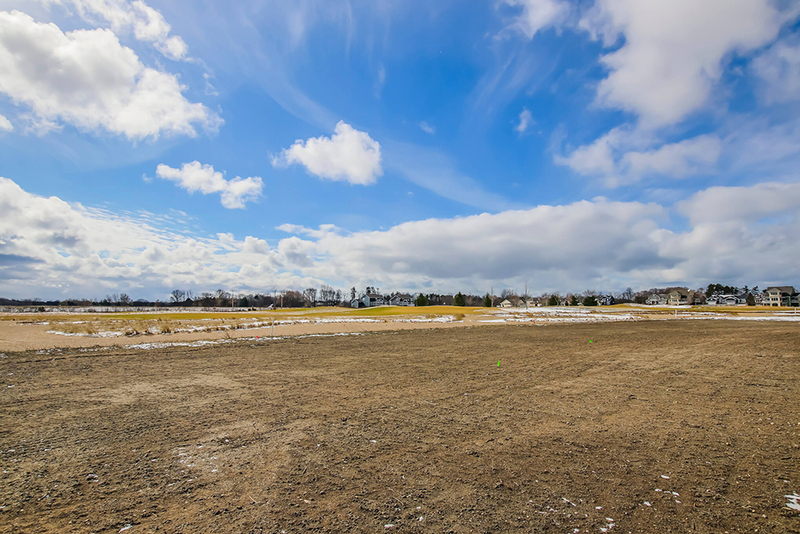 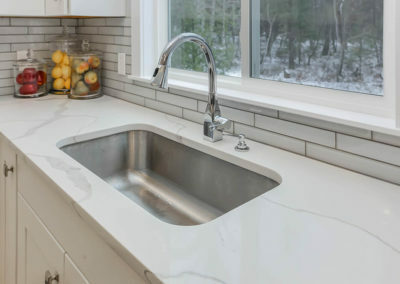 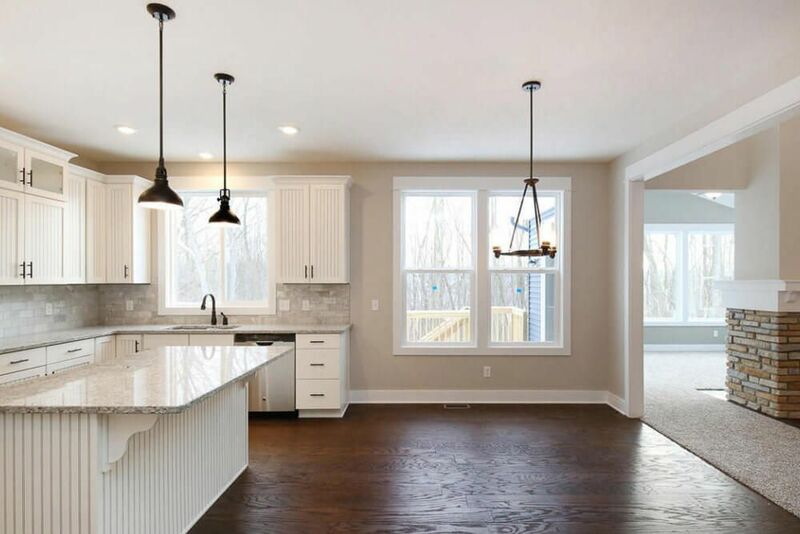 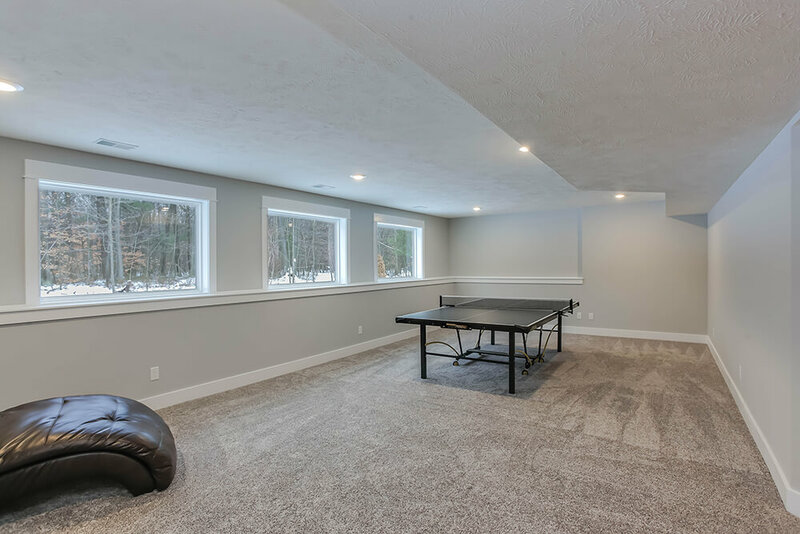 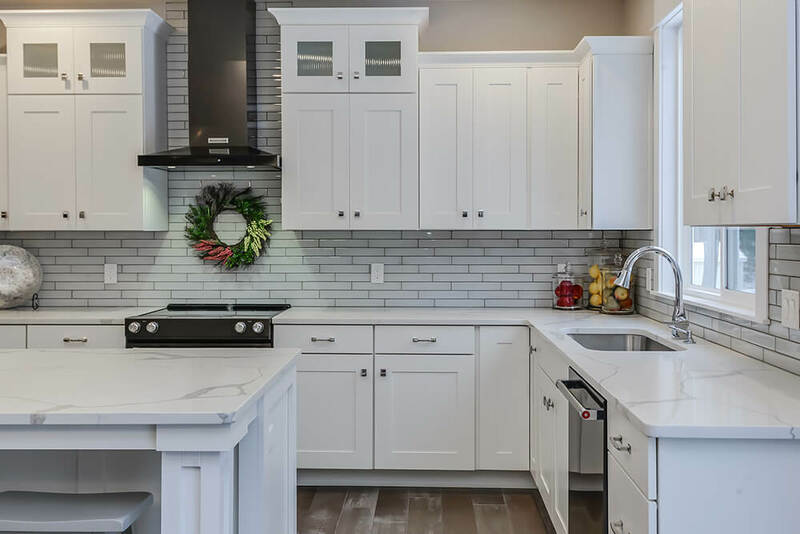 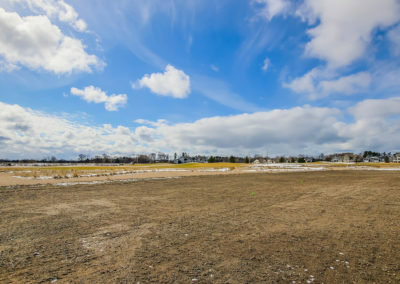 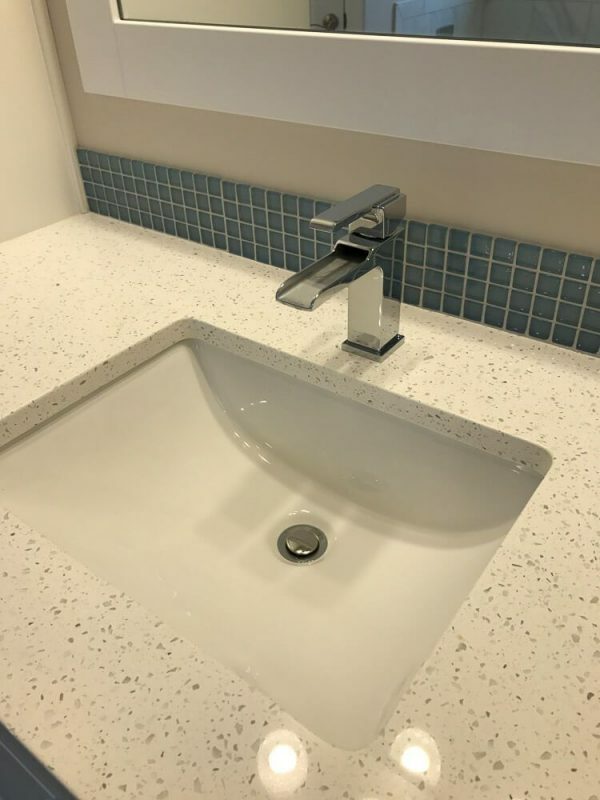 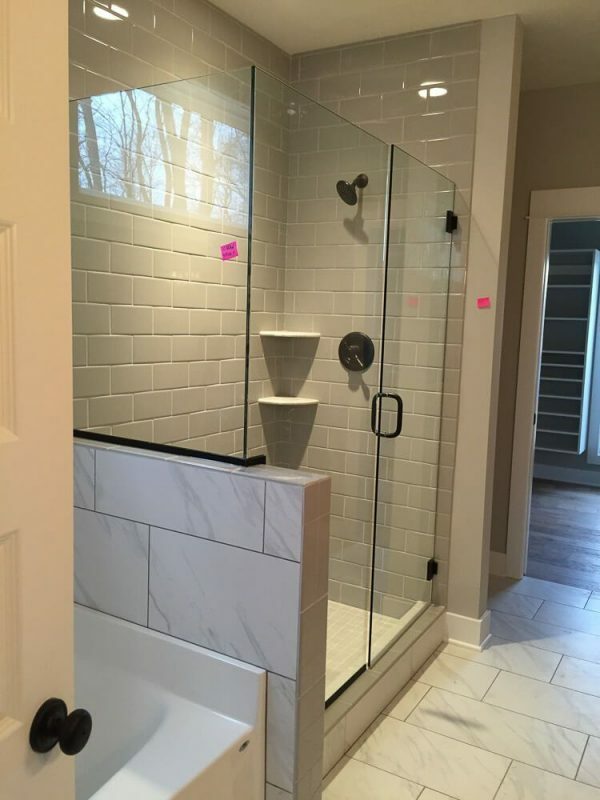 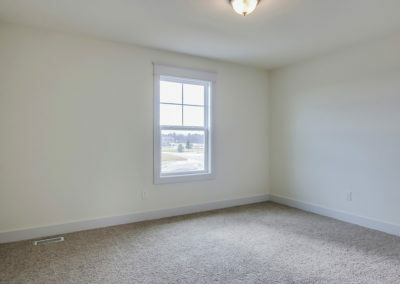 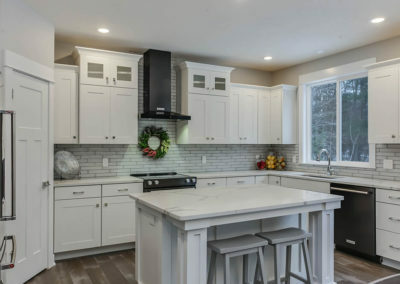 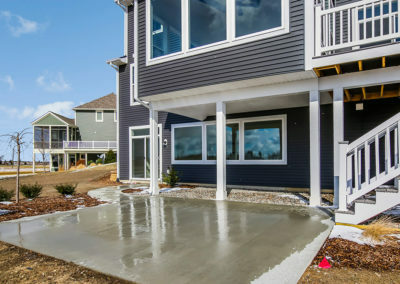 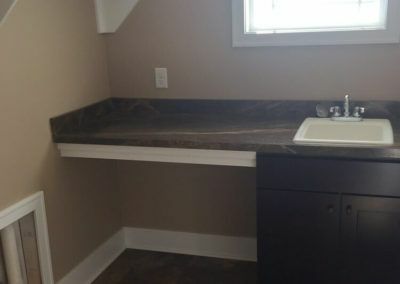 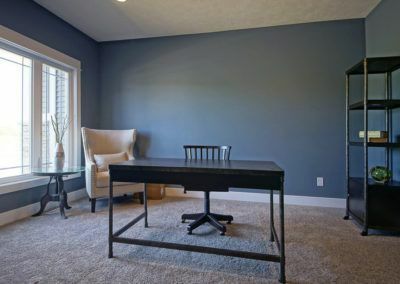 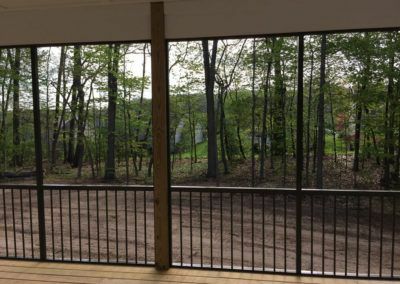 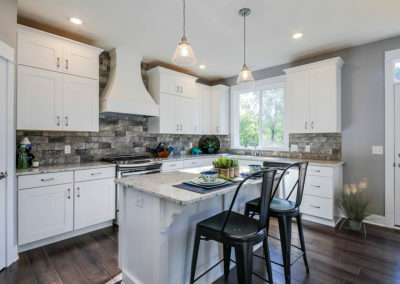 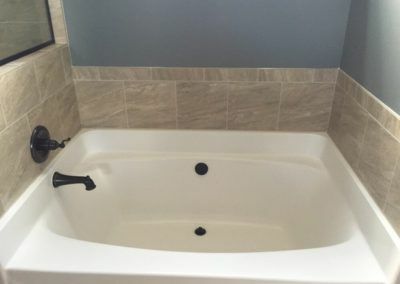 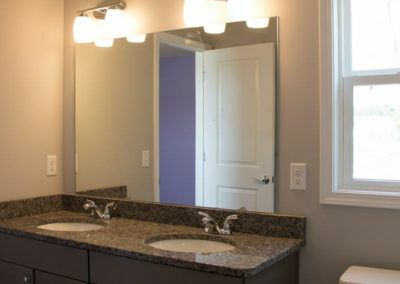 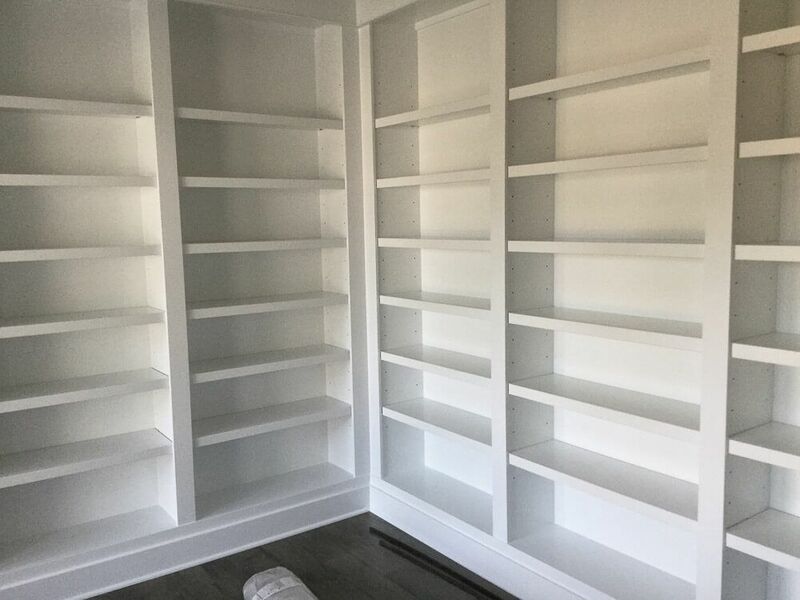 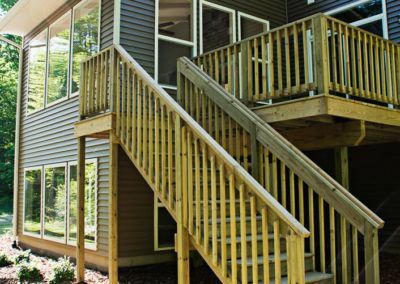 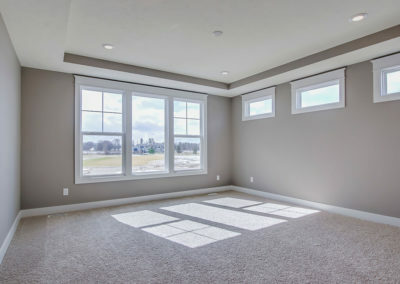 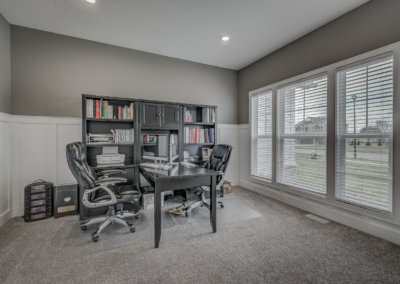 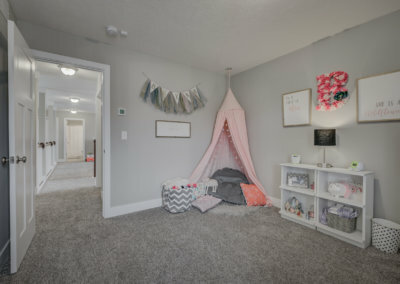 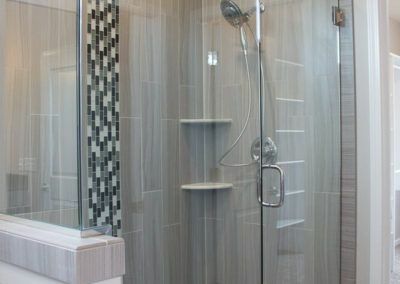 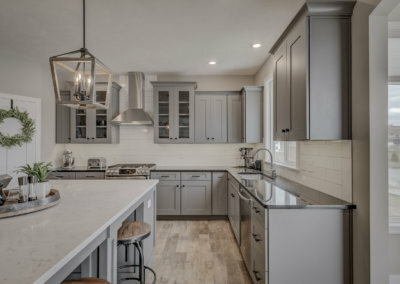 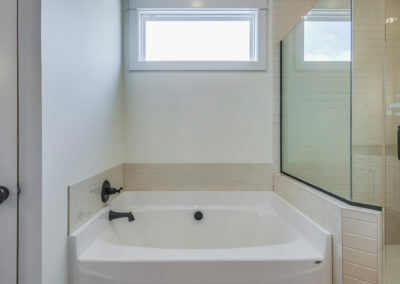 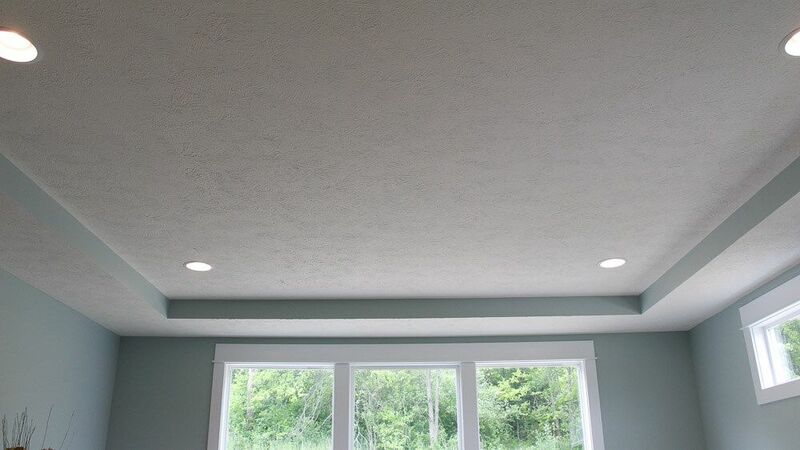 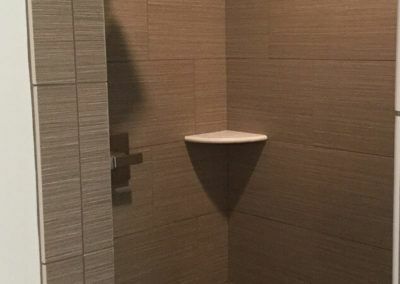 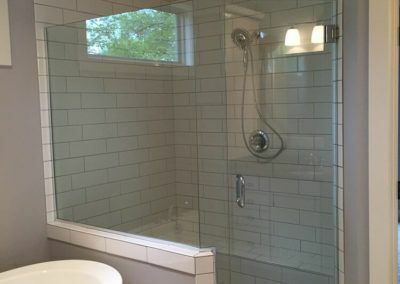 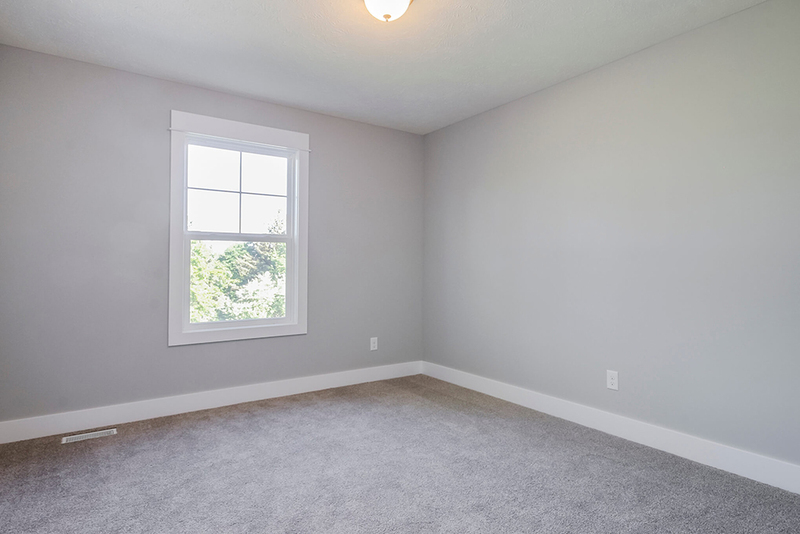 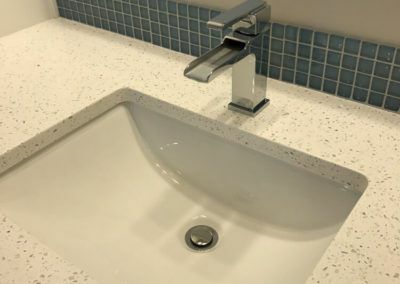 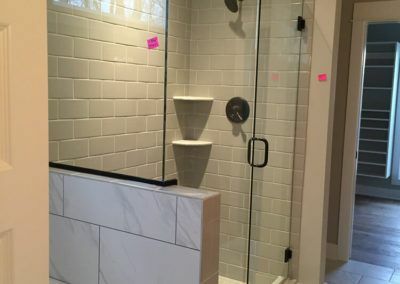 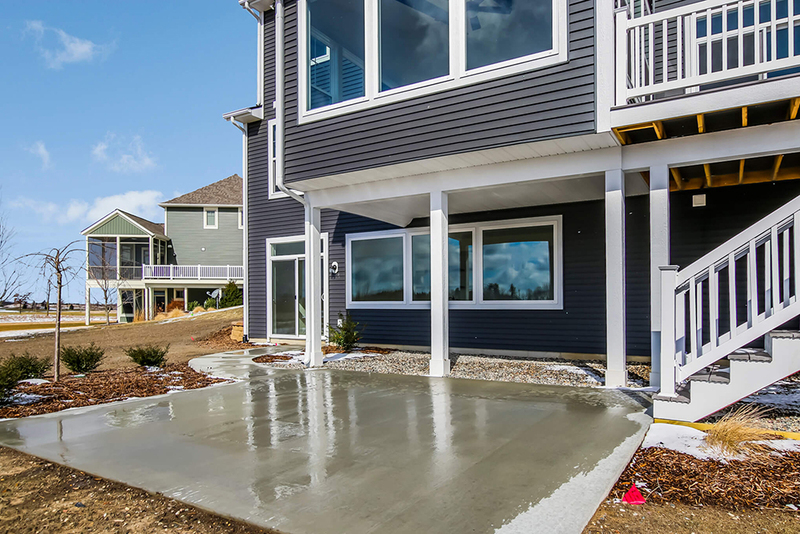 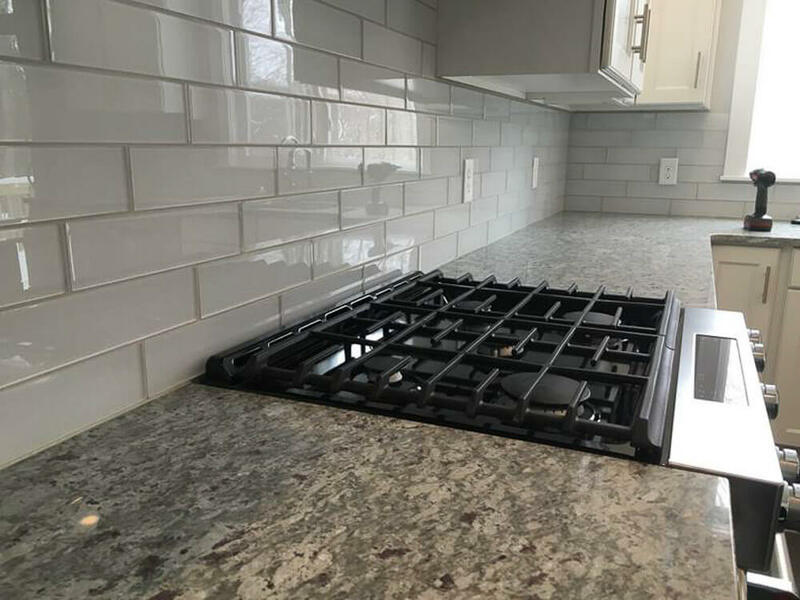 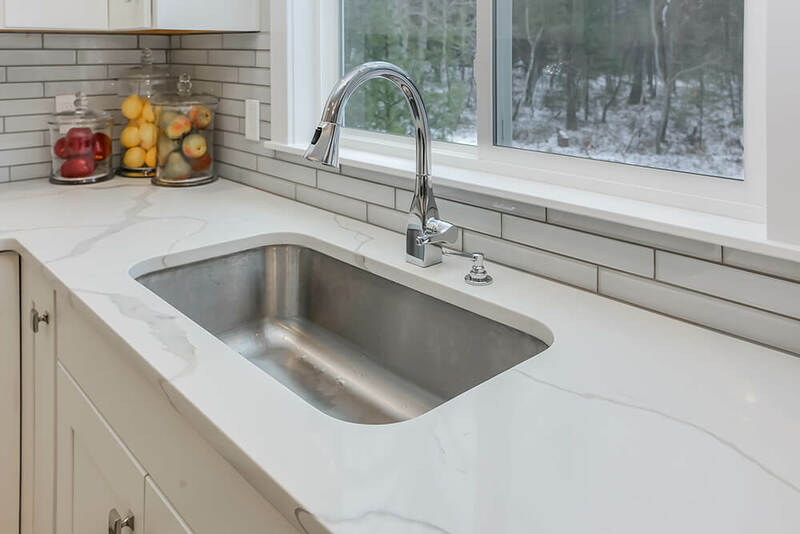 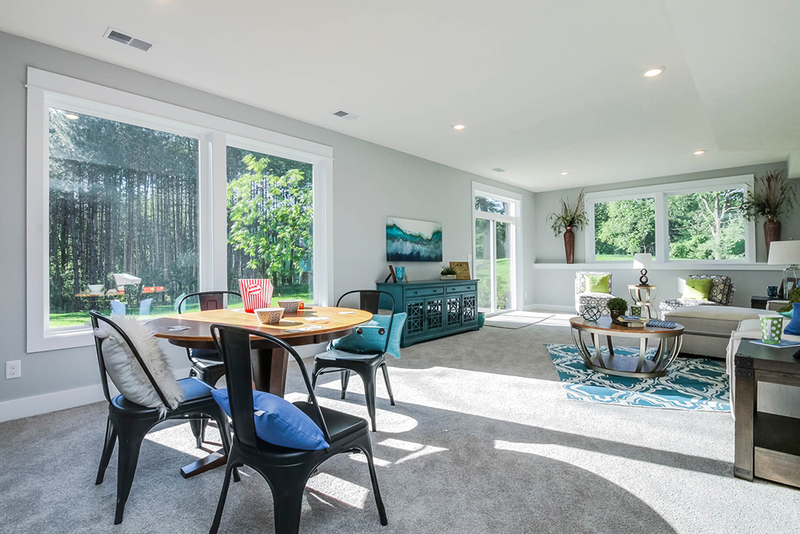 The space can be left for later finishing, or completely built out with living space, a bathroom, and bedrooms if your home site is conducive. 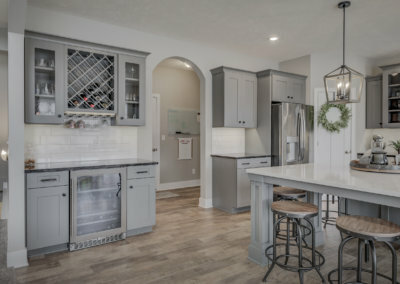 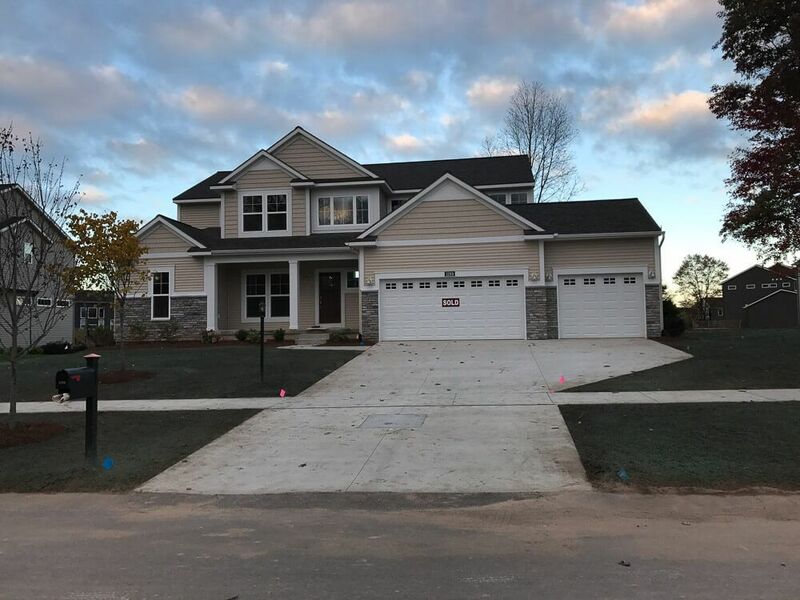 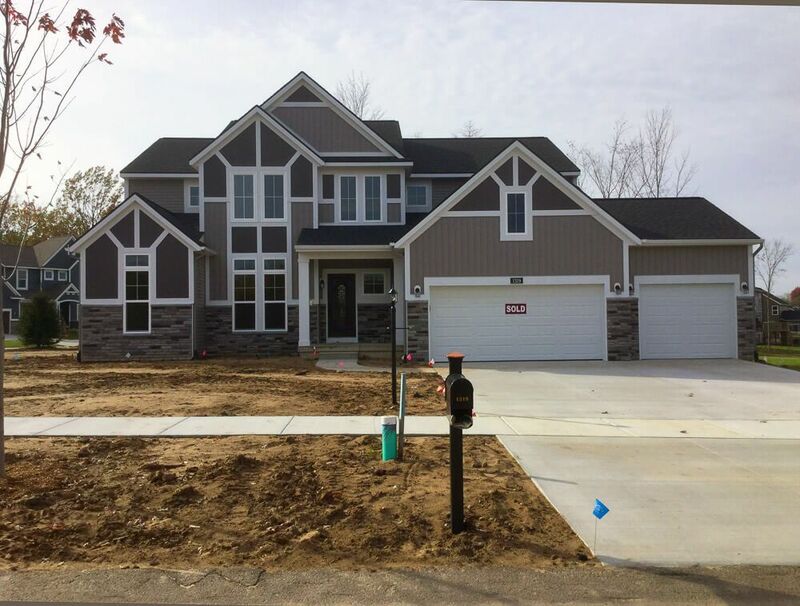 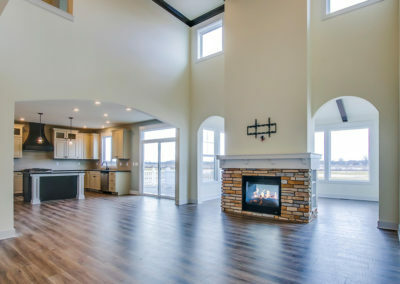 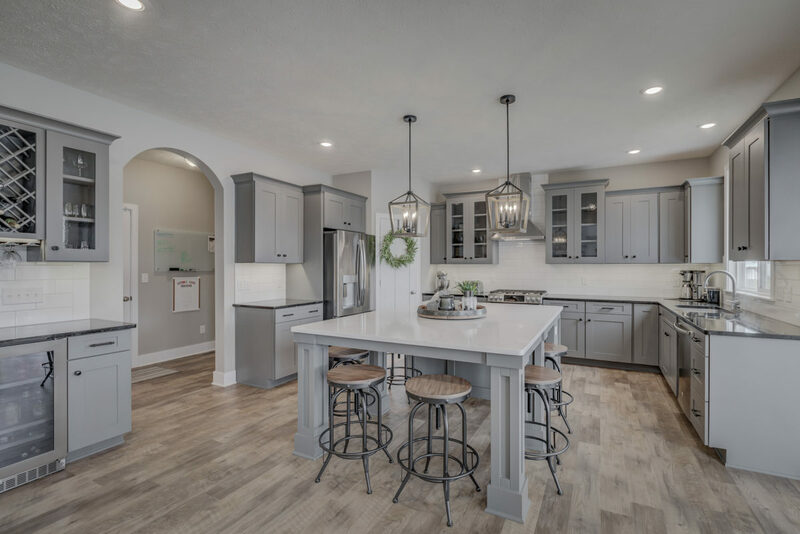 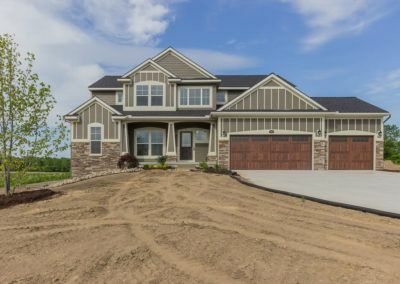 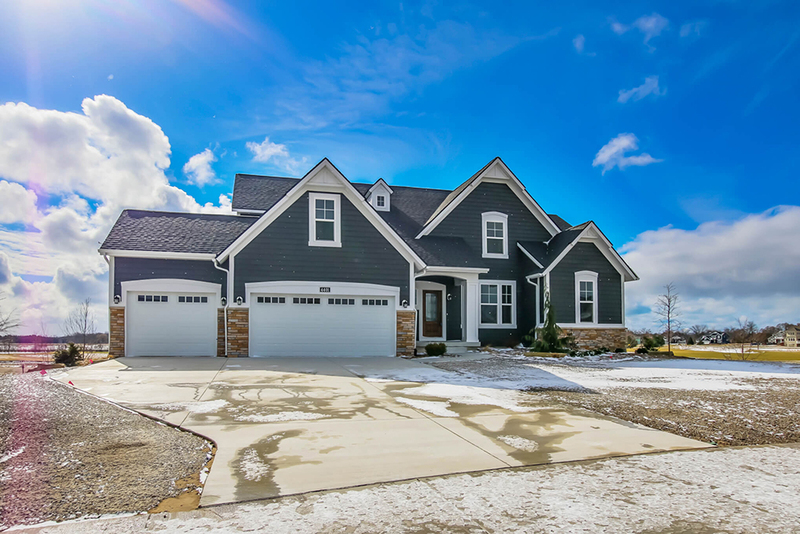 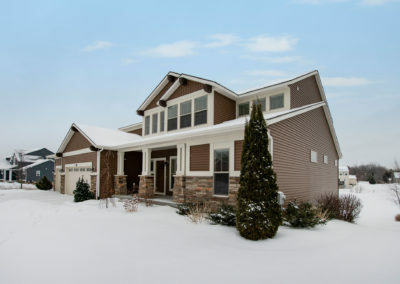 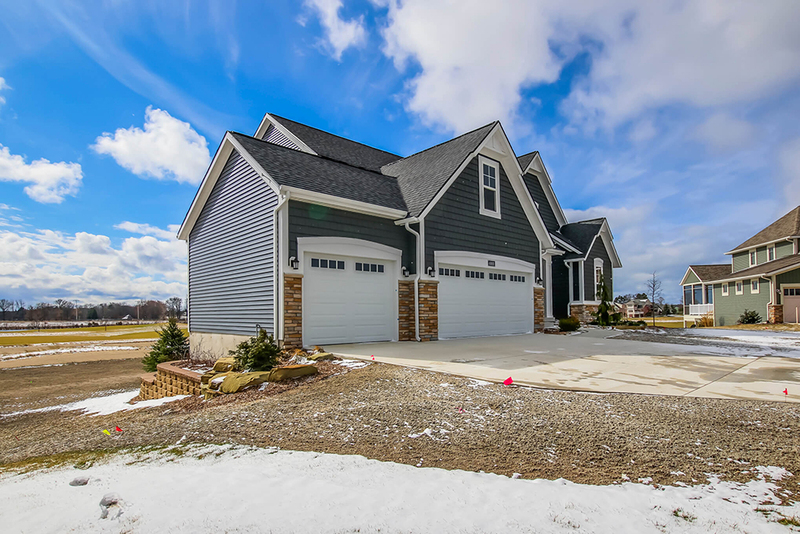 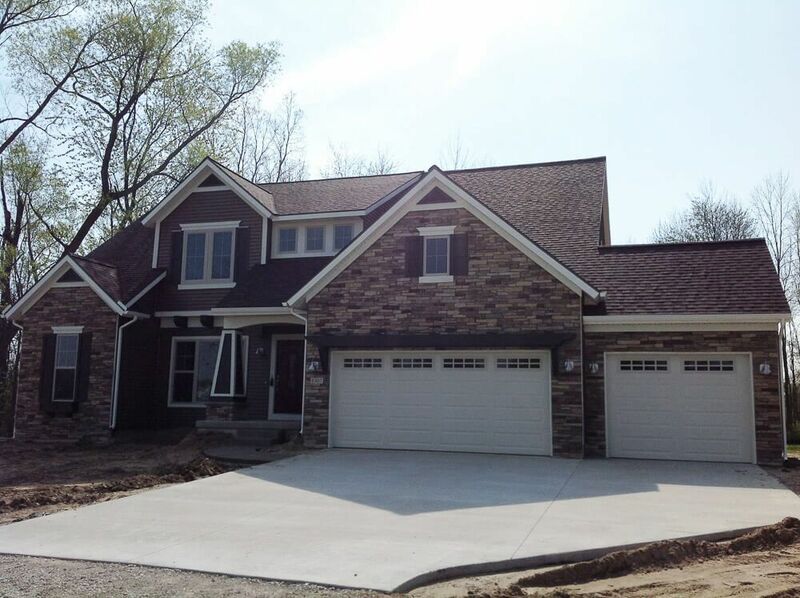 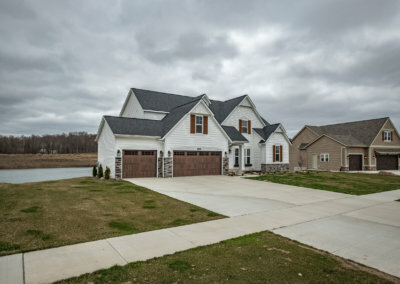 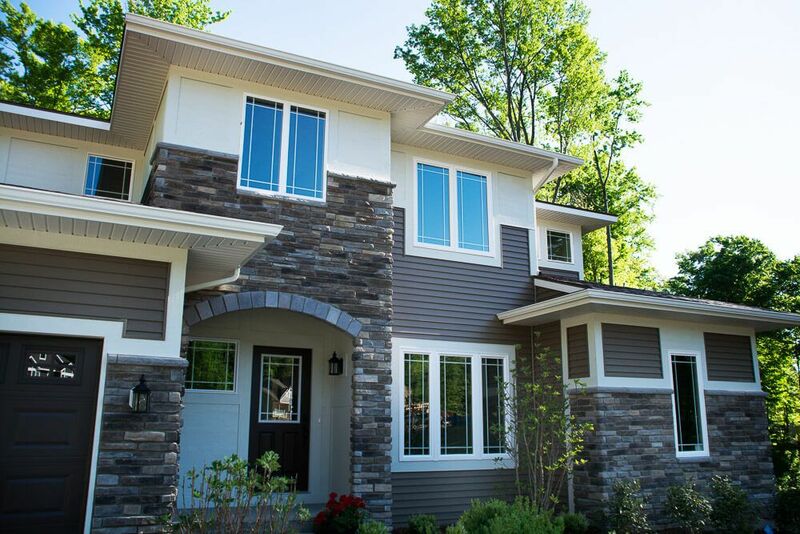 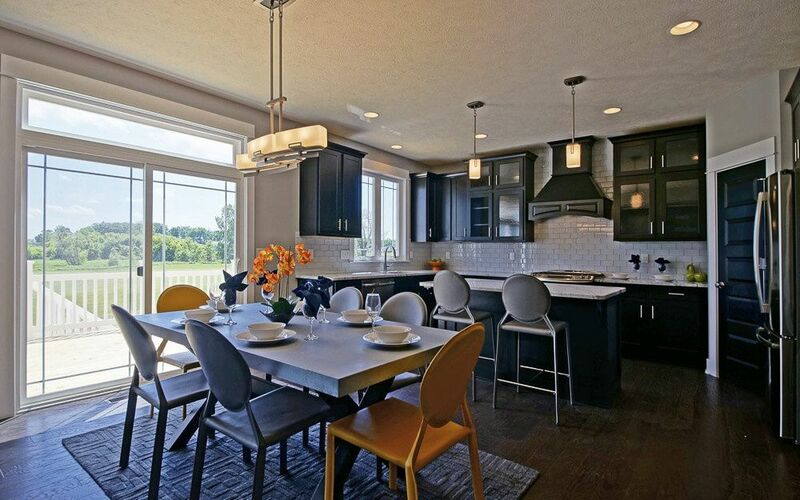 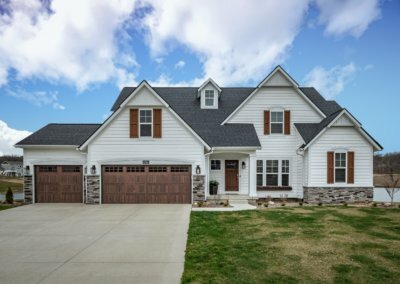 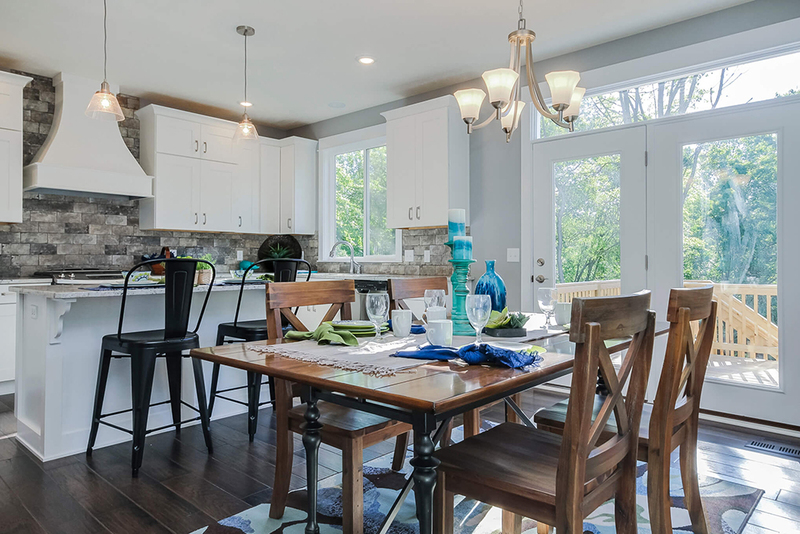 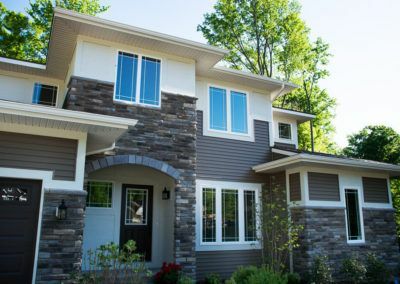 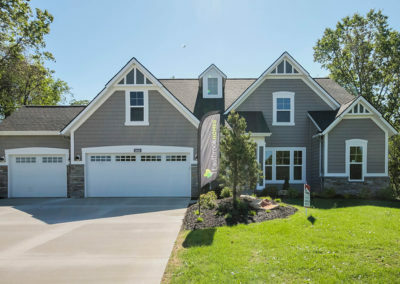 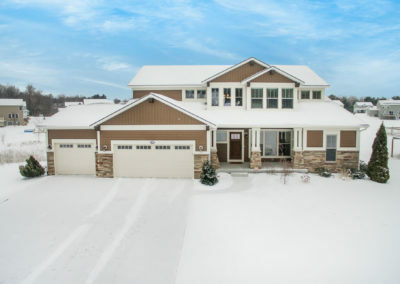 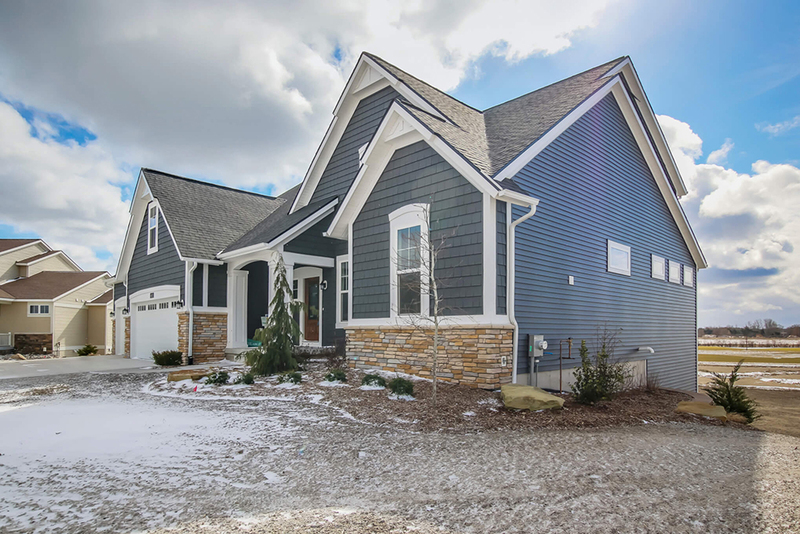 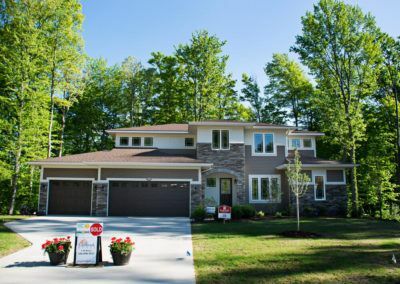 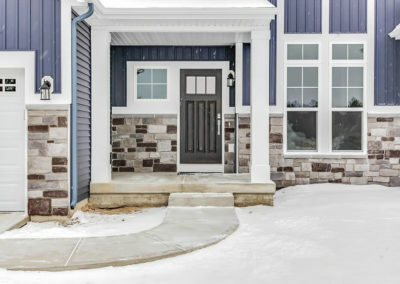 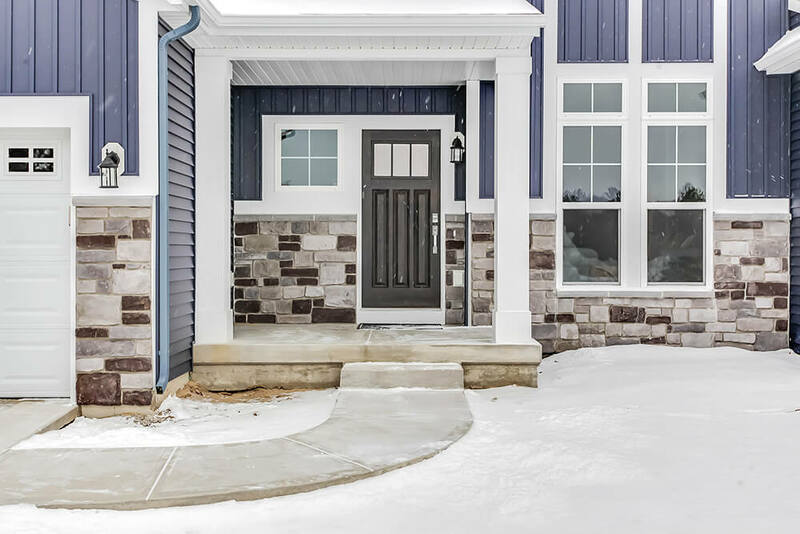 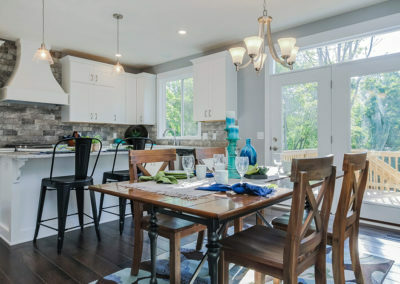 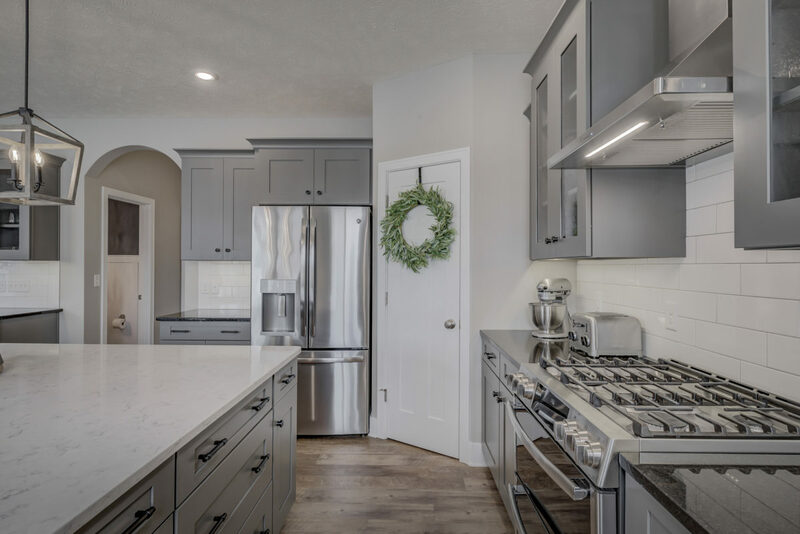 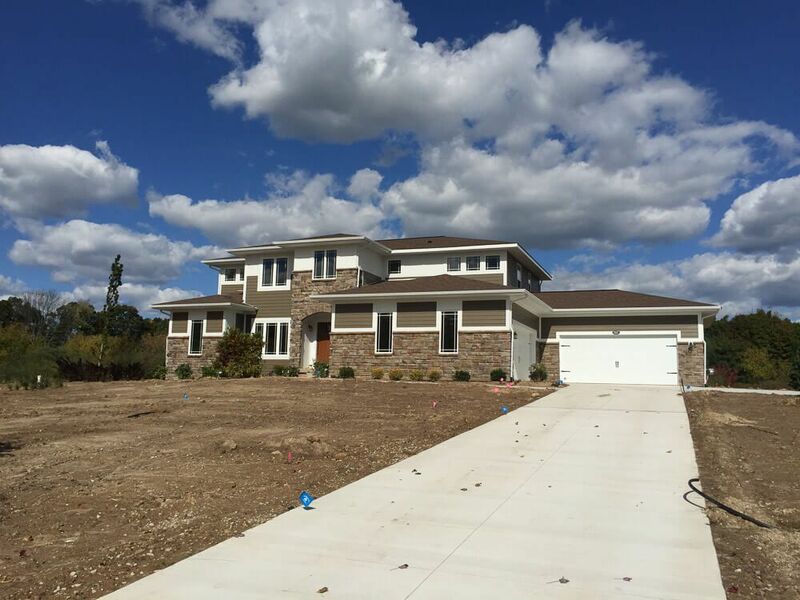 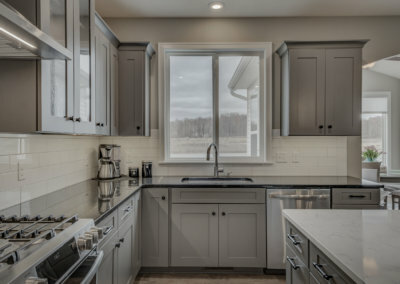 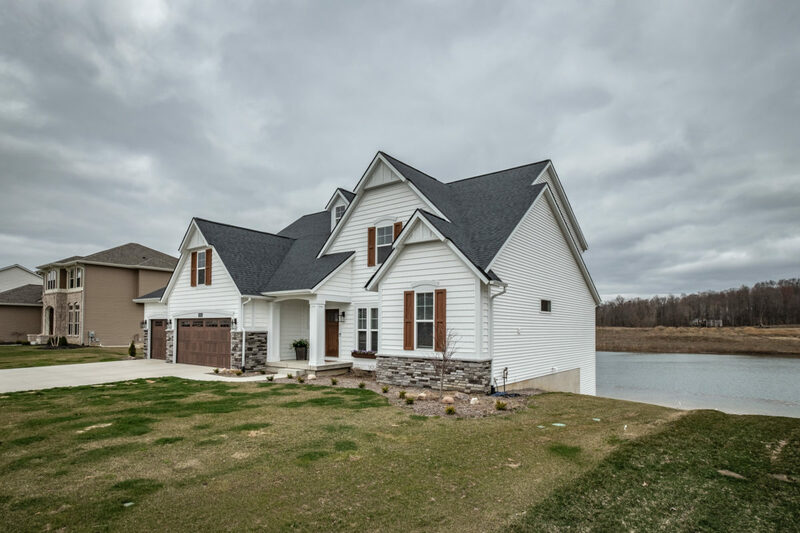 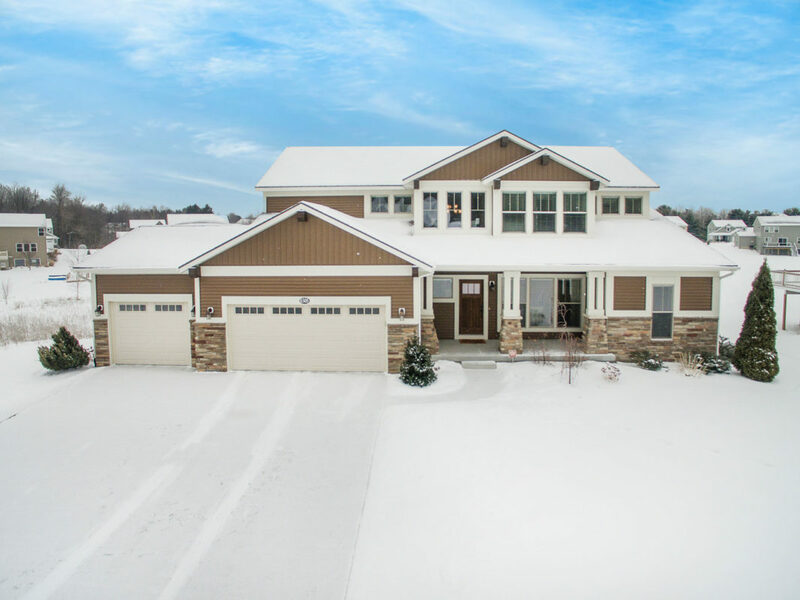 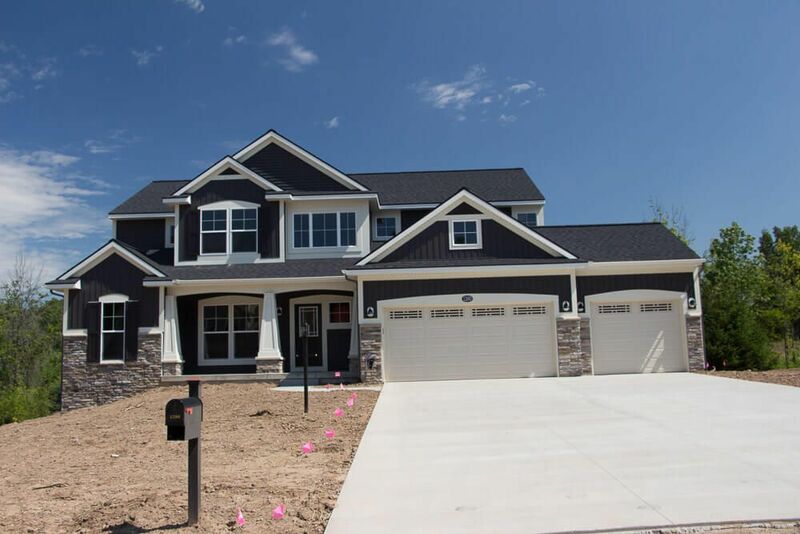 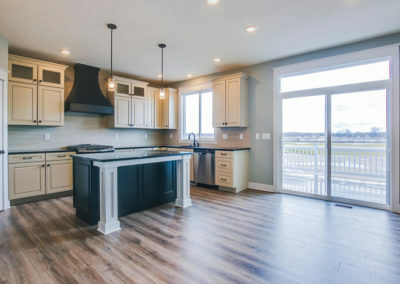 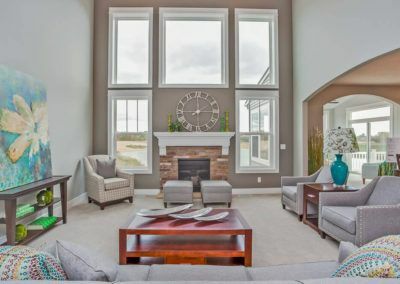 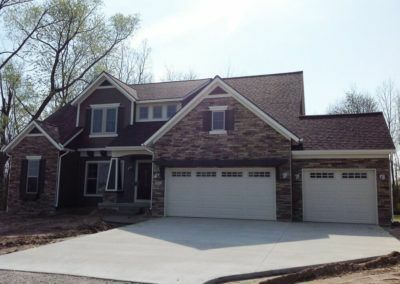 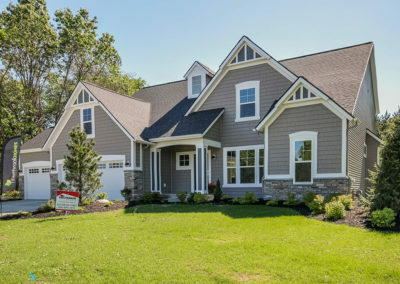 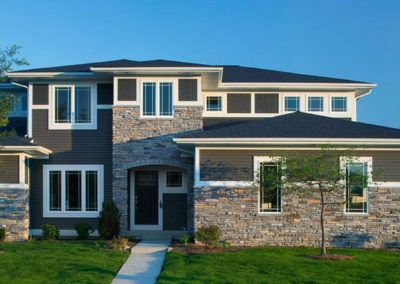 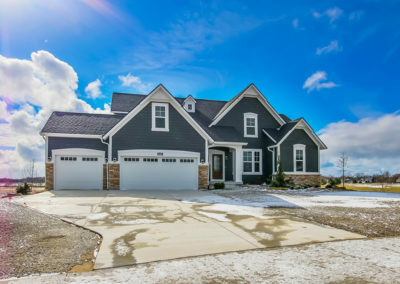 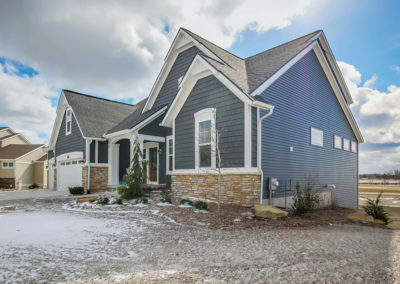 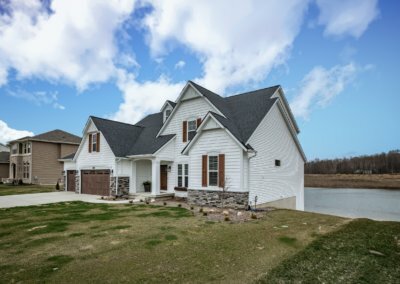 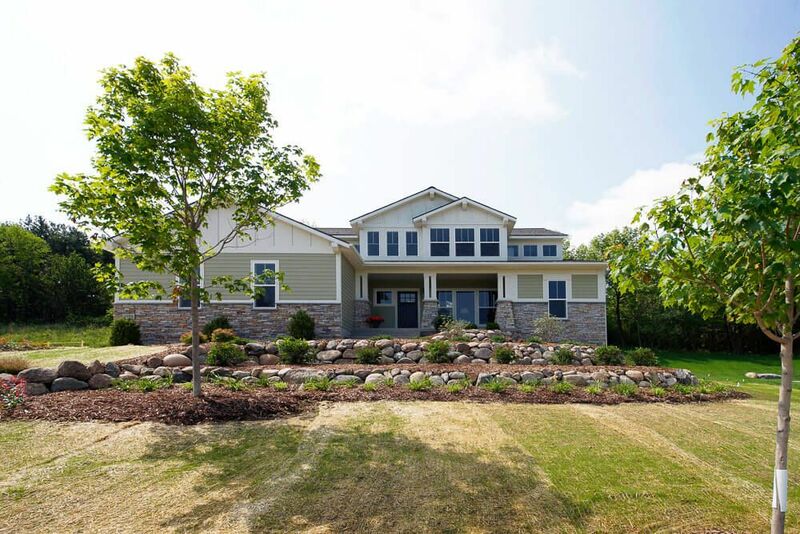 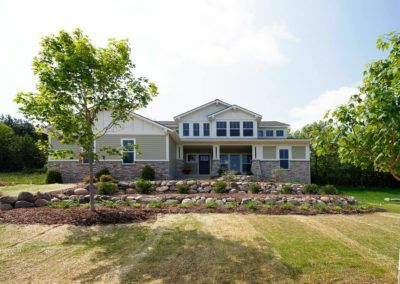 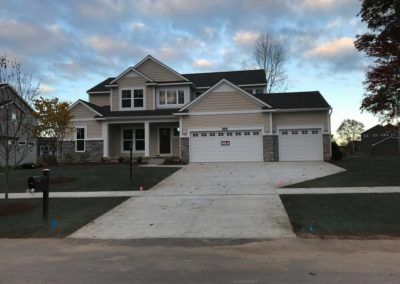 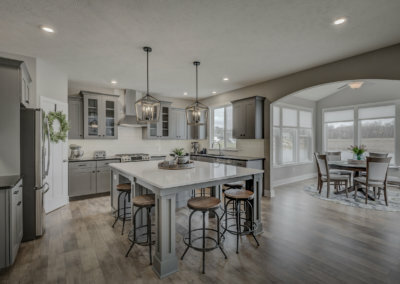 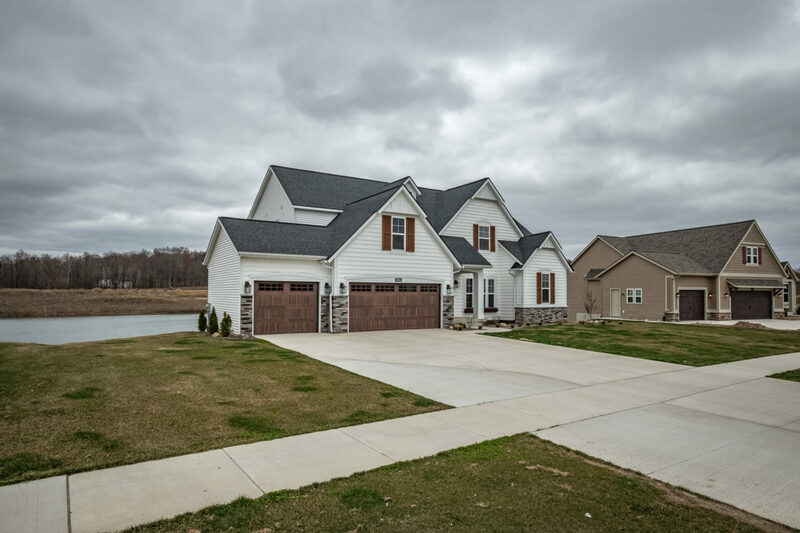 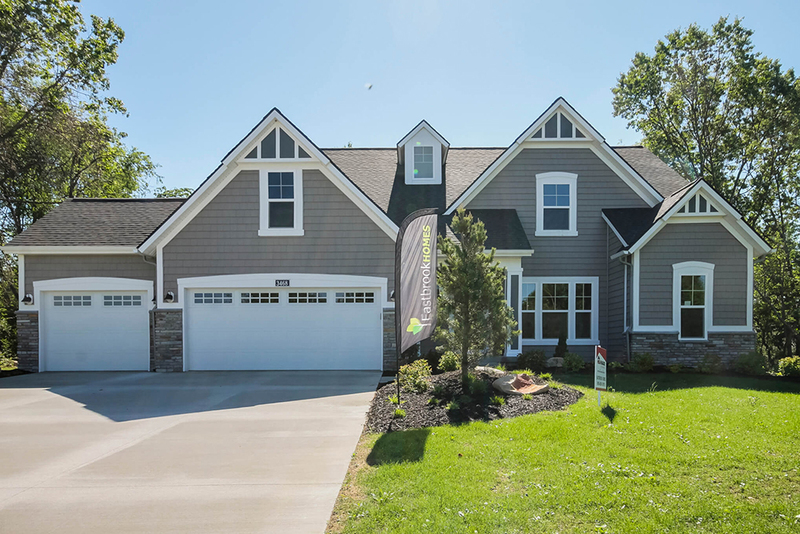 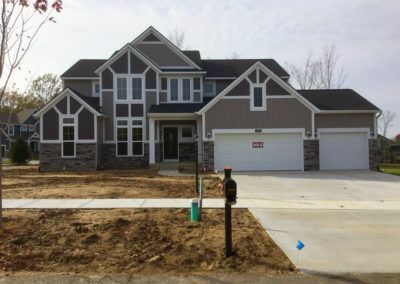 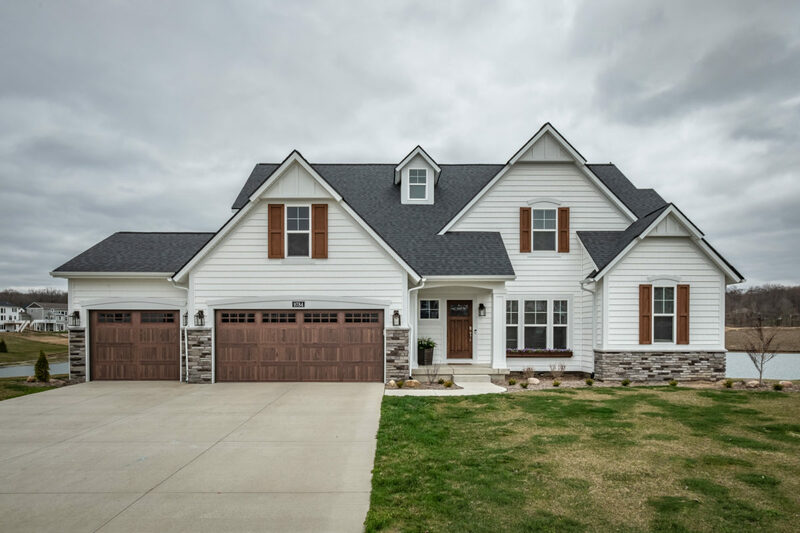 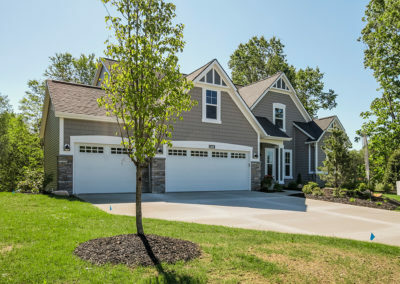 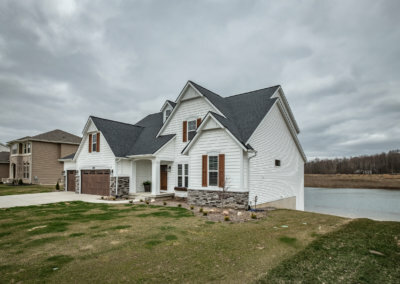 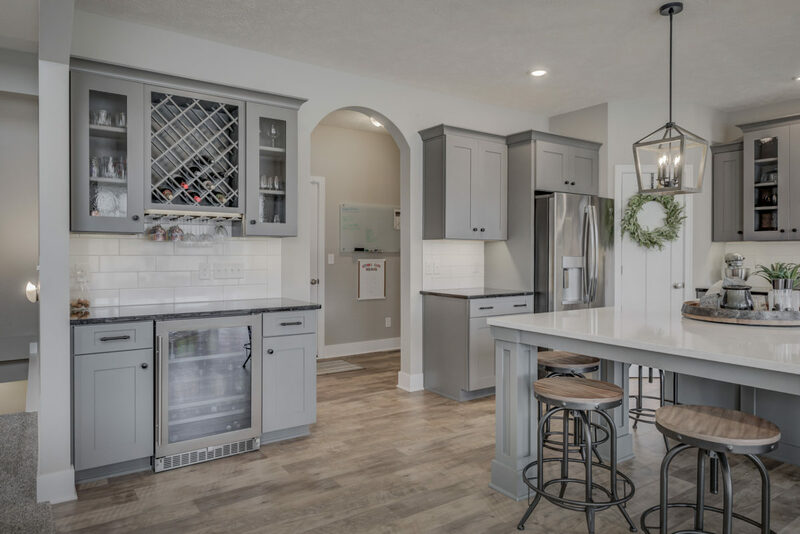 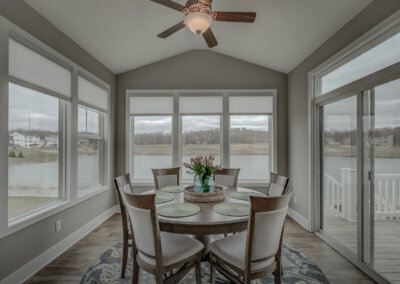 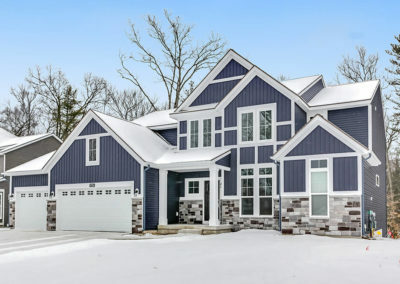 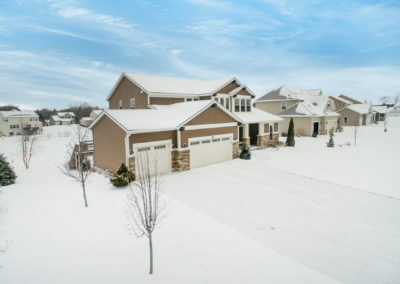 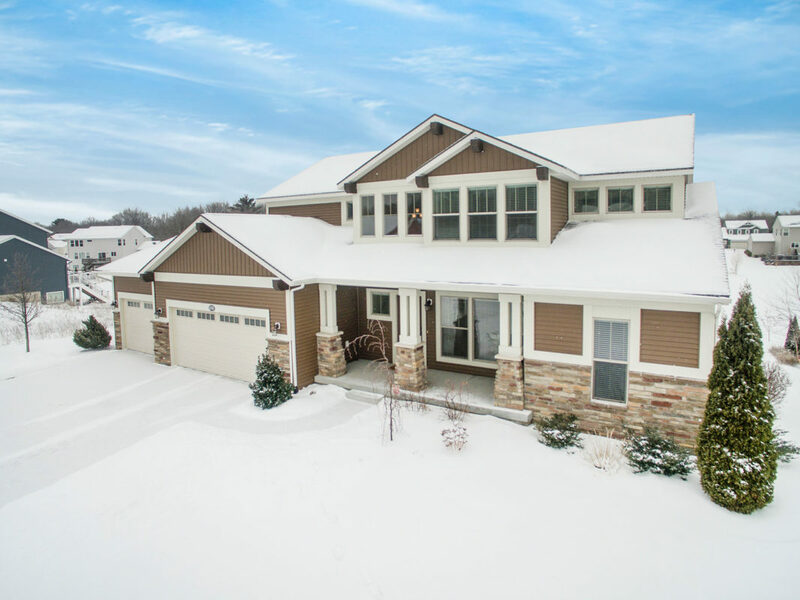 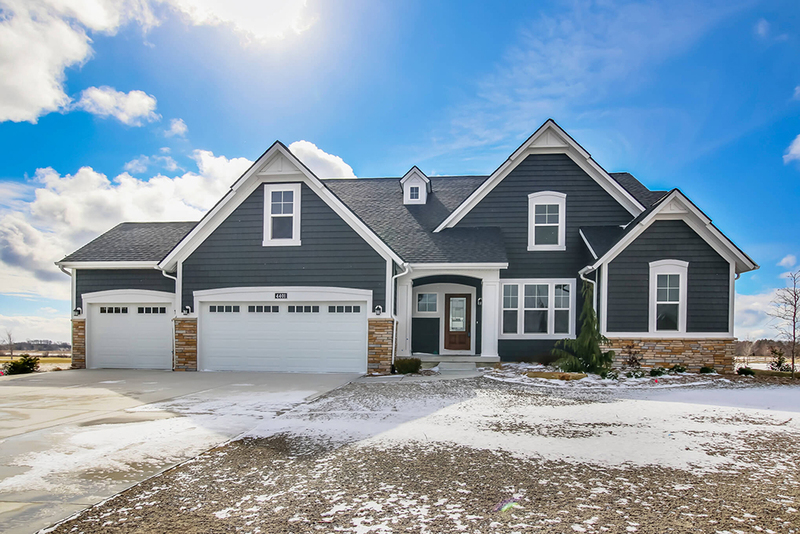 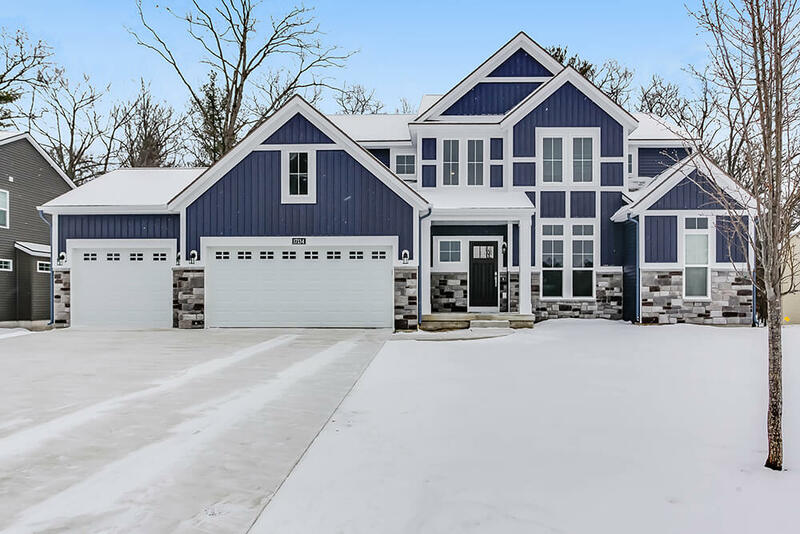 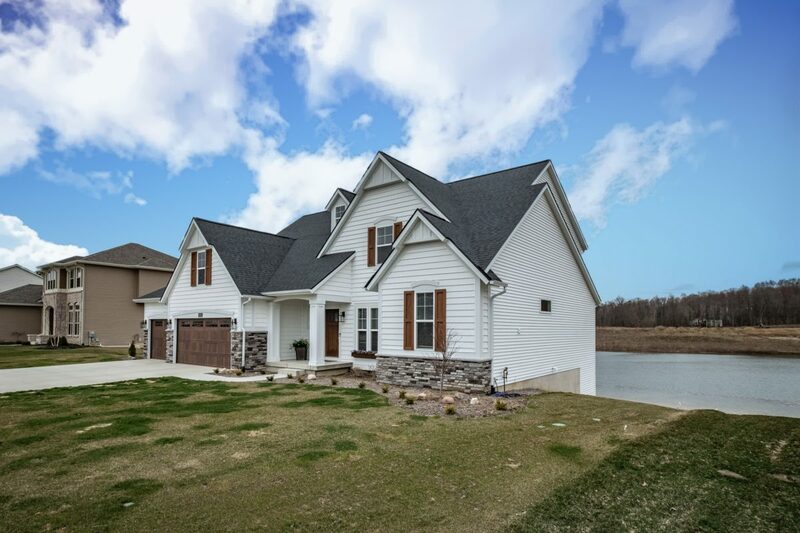 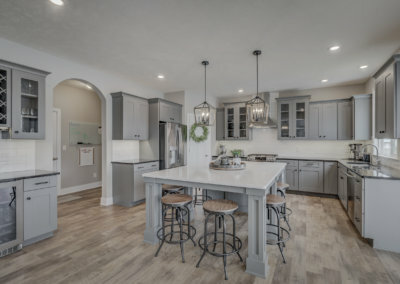 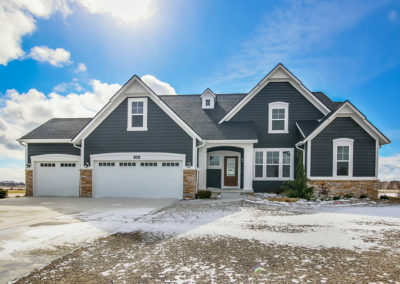 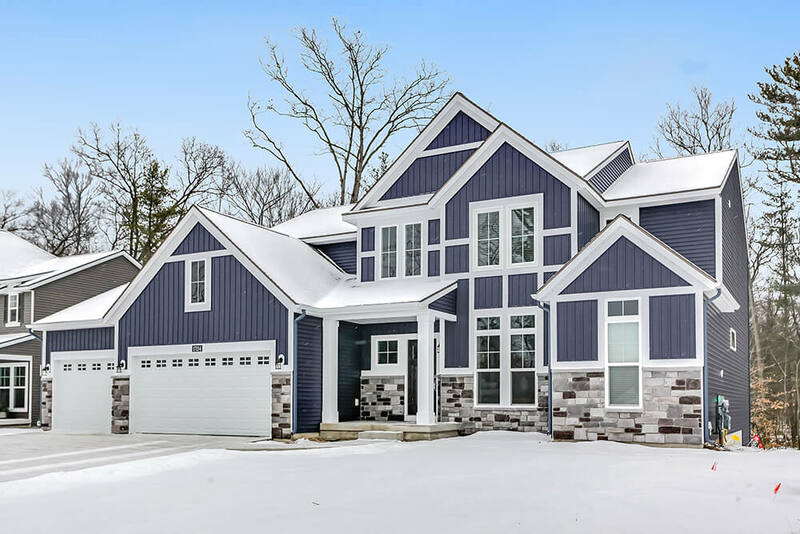 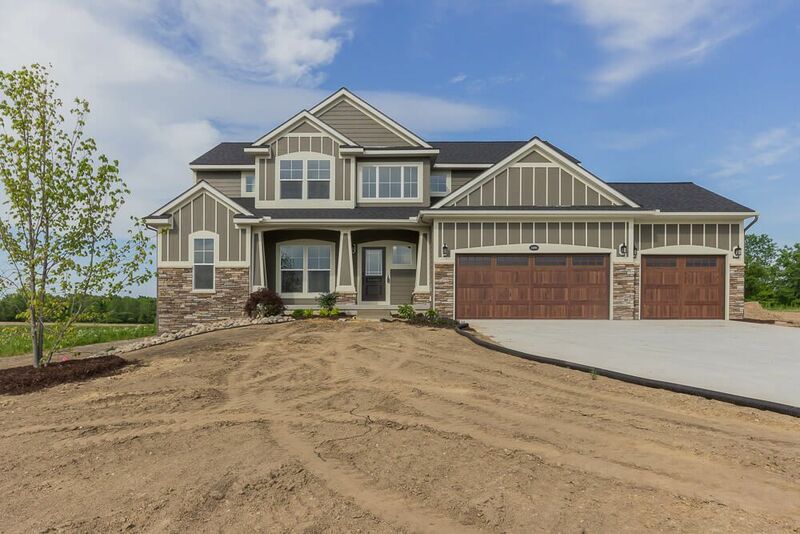 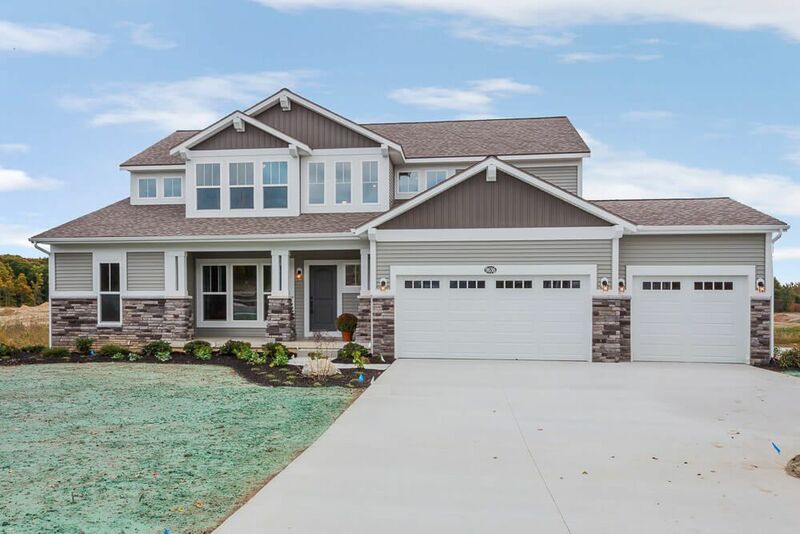 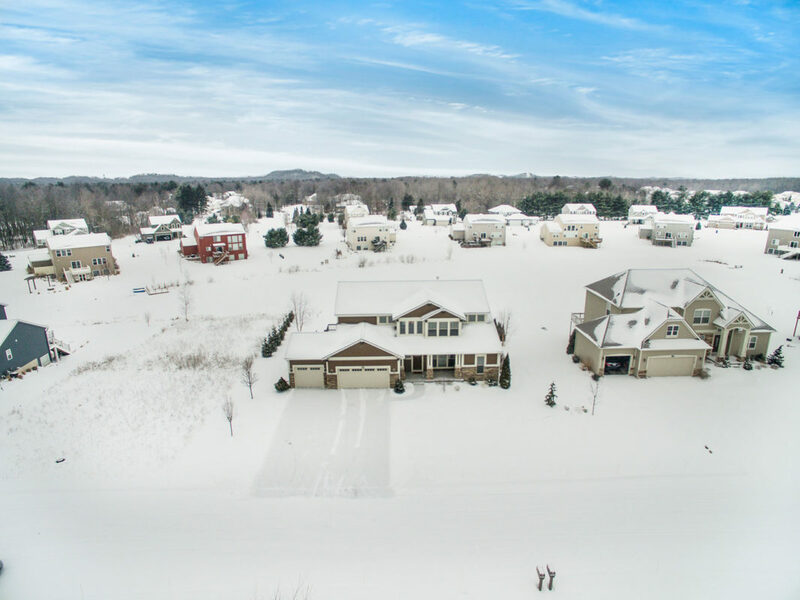 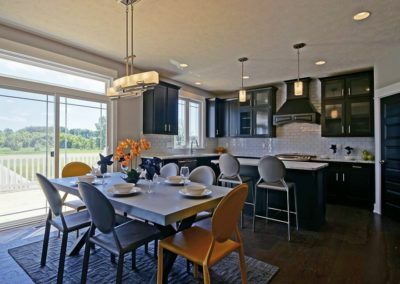 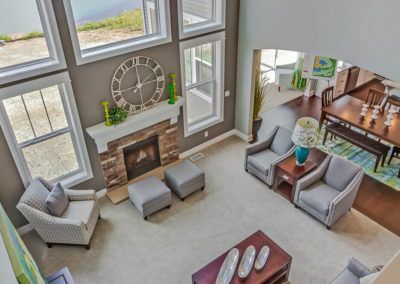 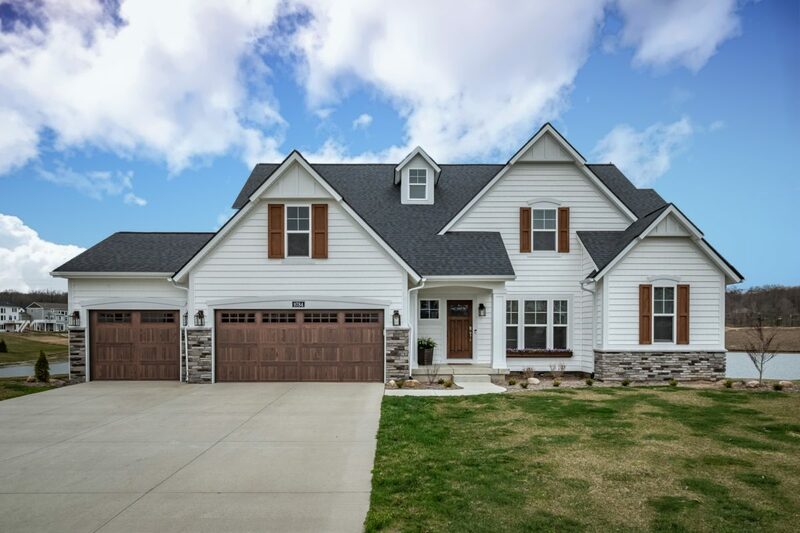 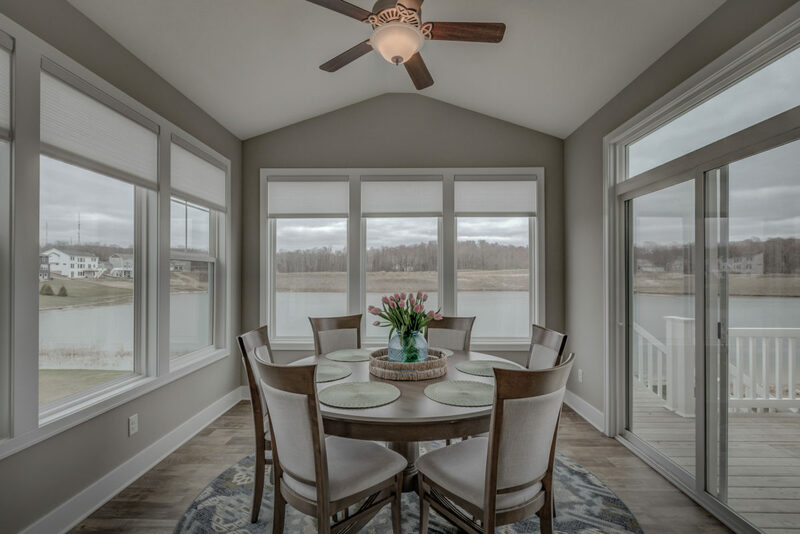 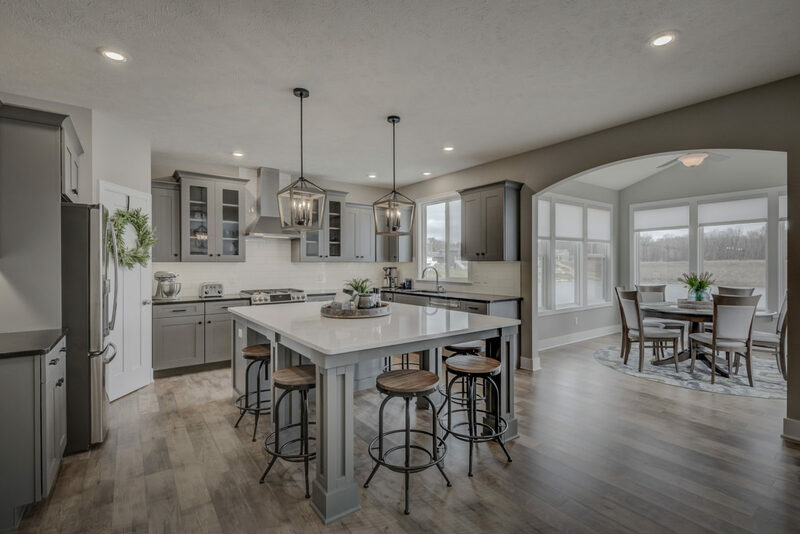 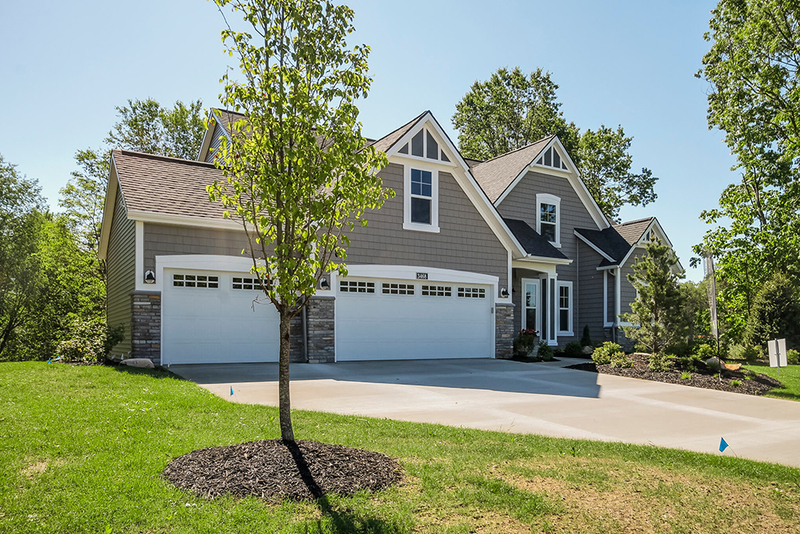 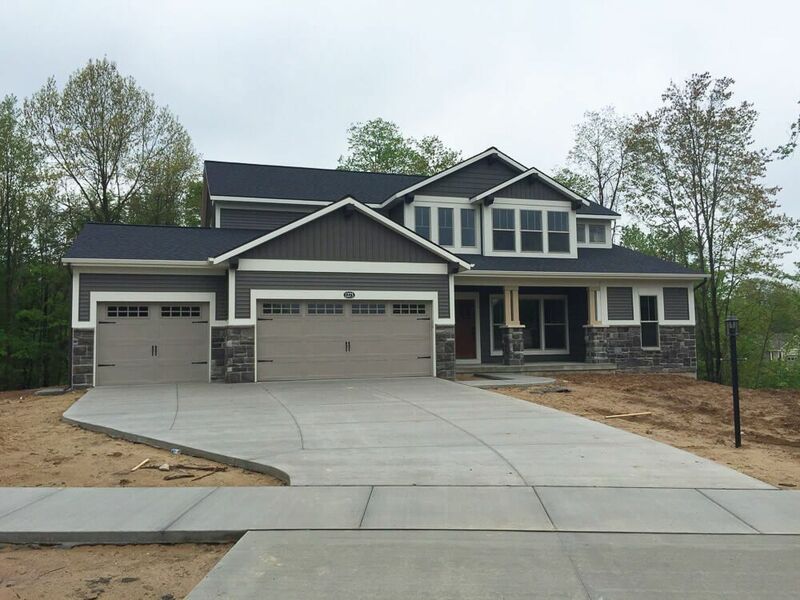 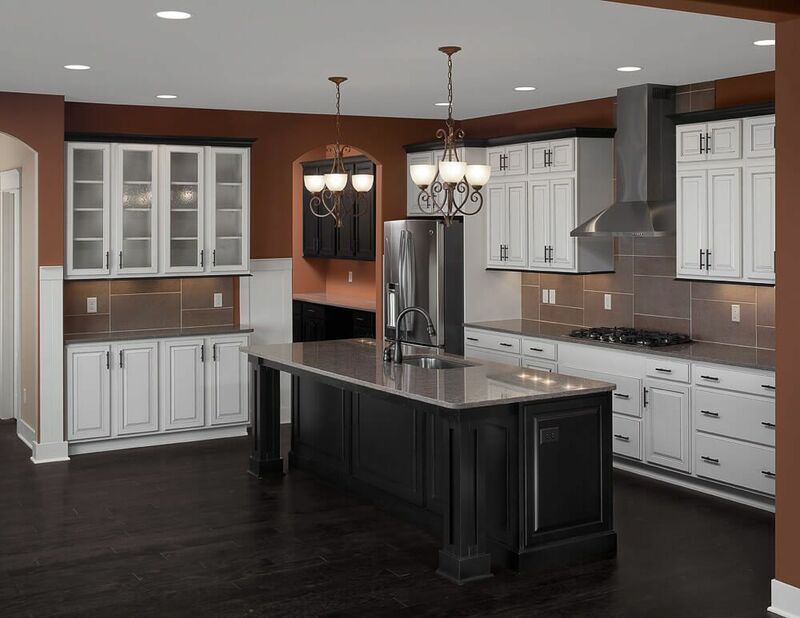 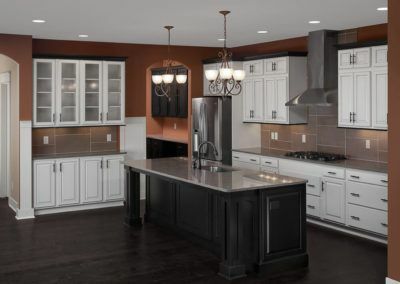 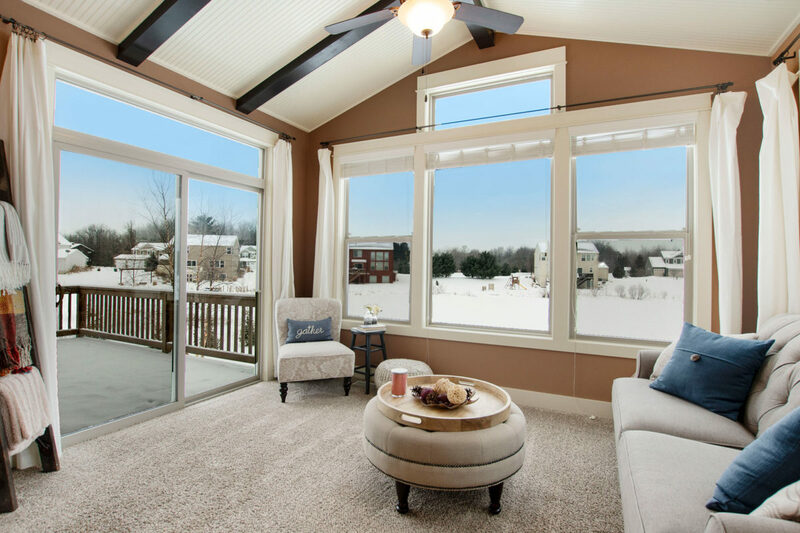 Warm and stately, the Sebastian home plan gives you the freedom to personalize your own unique home with Eastbrook’s guarantee of the highest quality, efficiency, and value available.